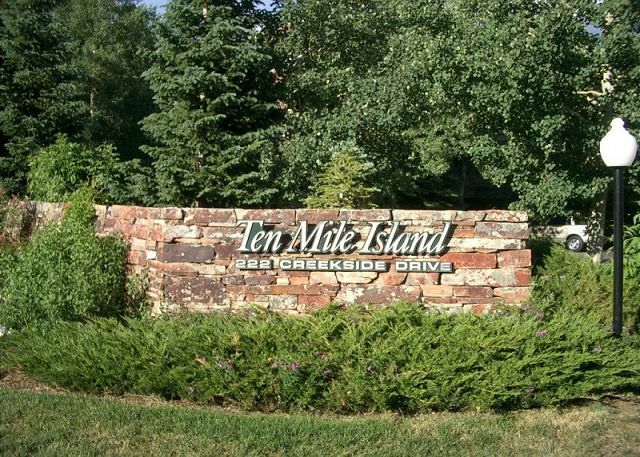 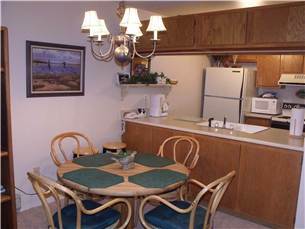 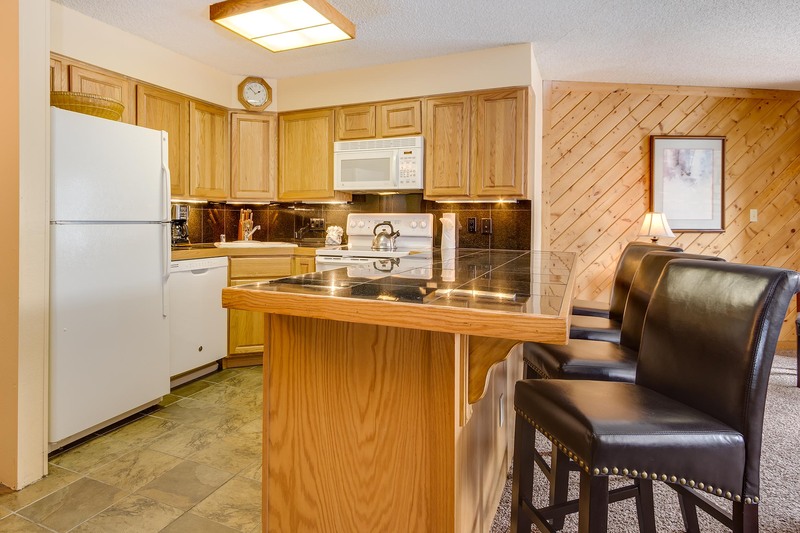 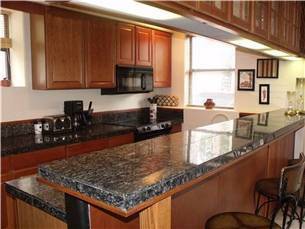 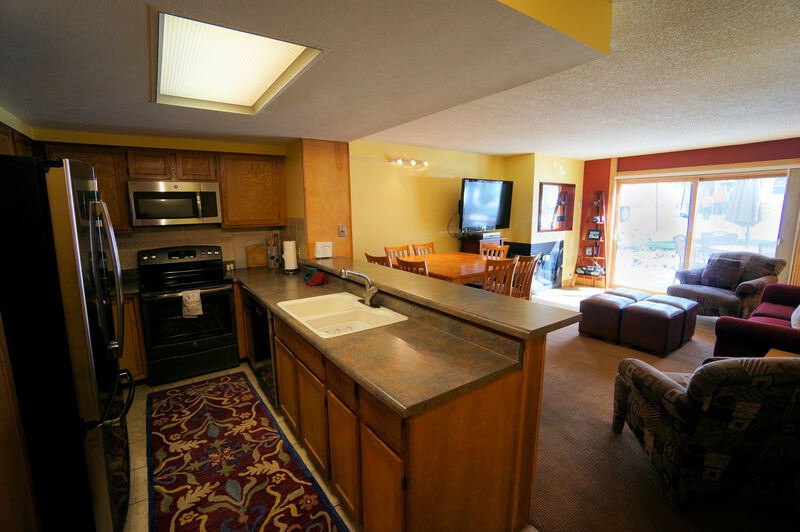 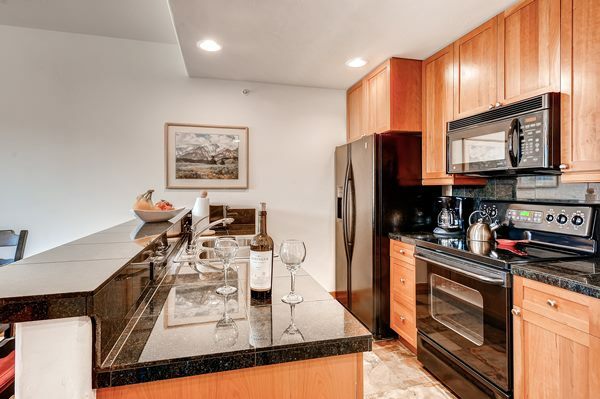 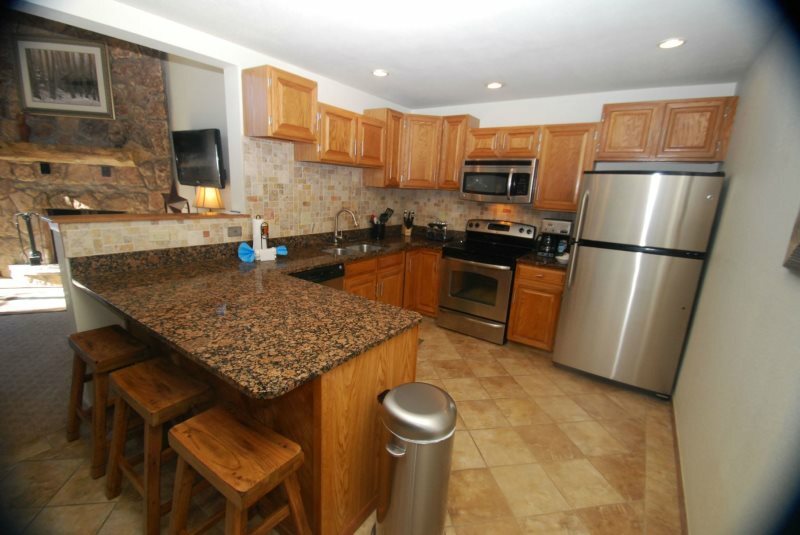 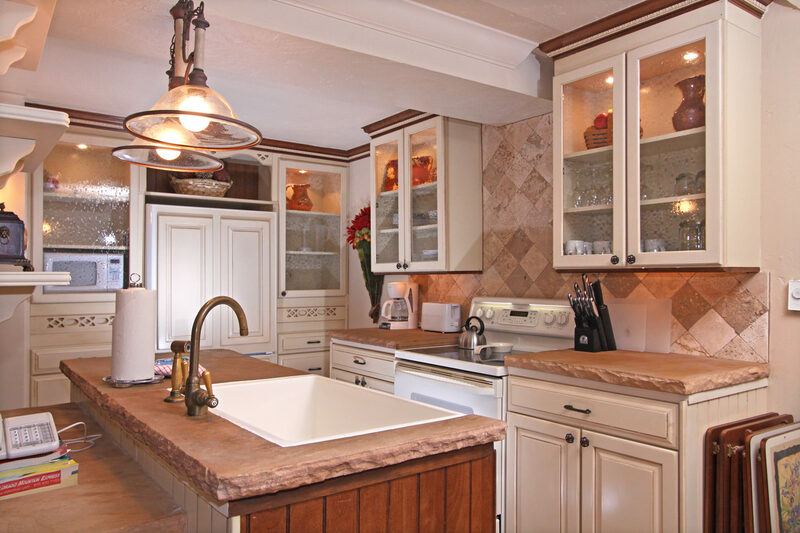 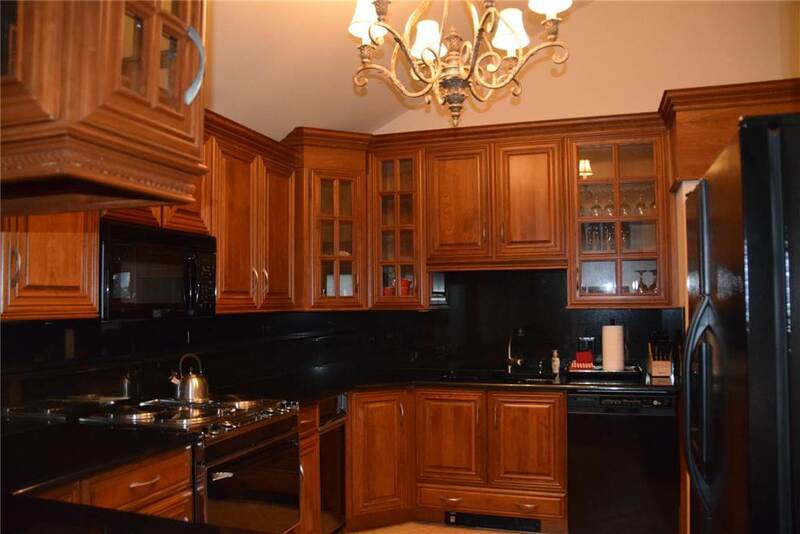 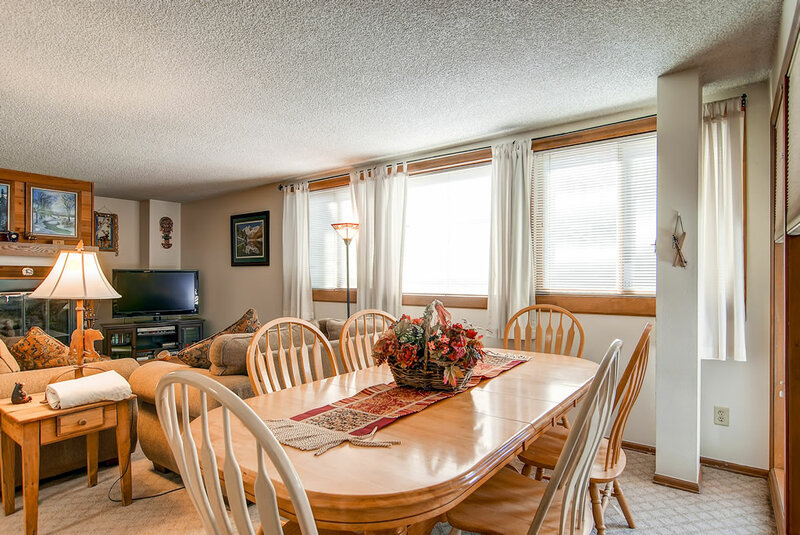 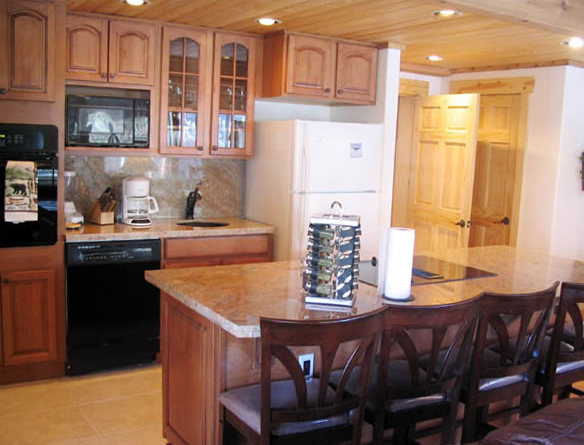 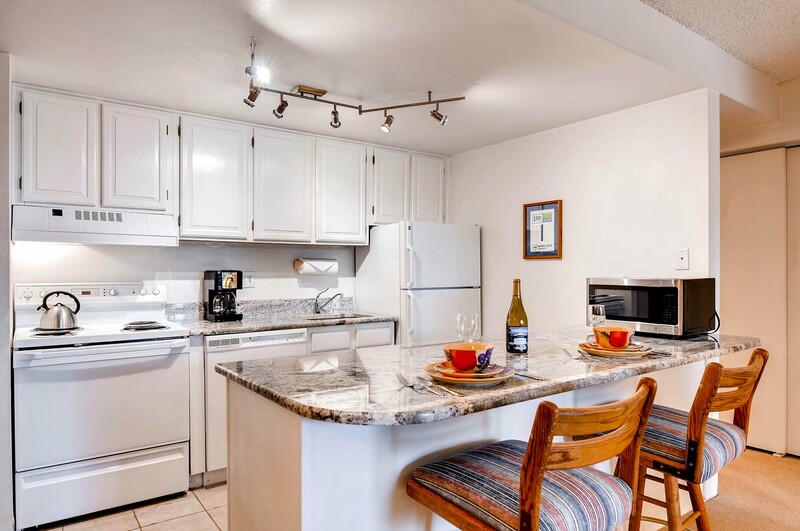 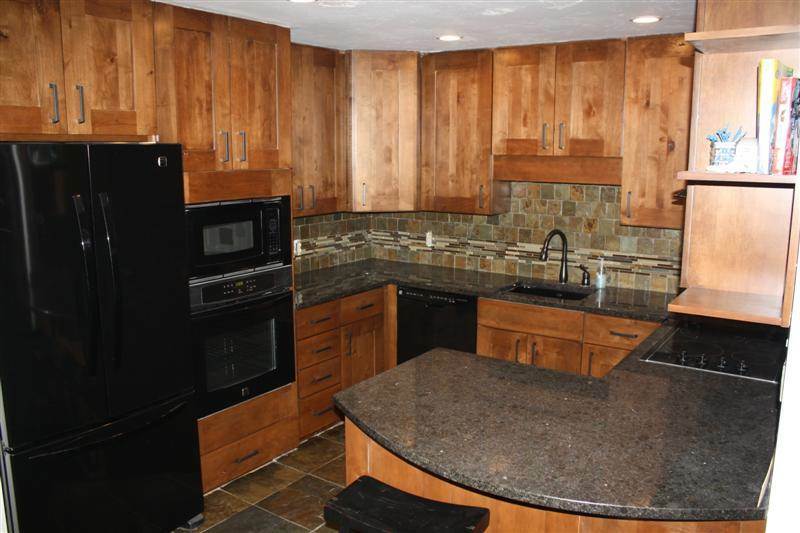 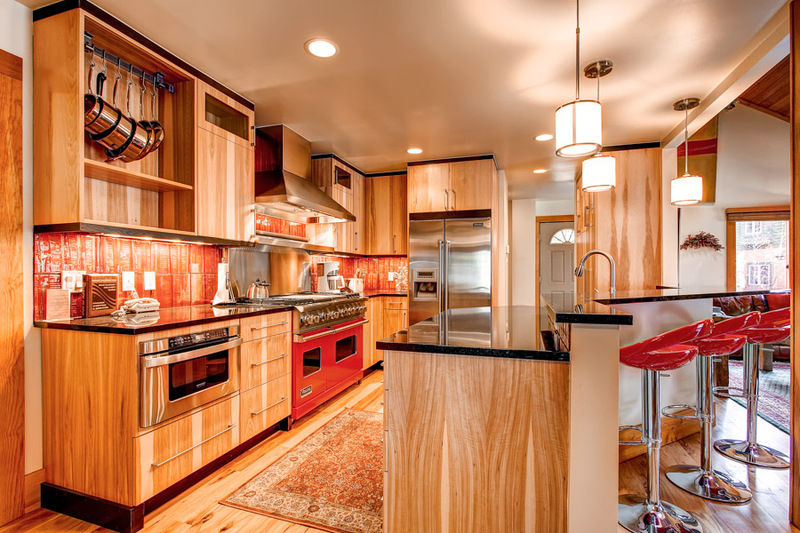 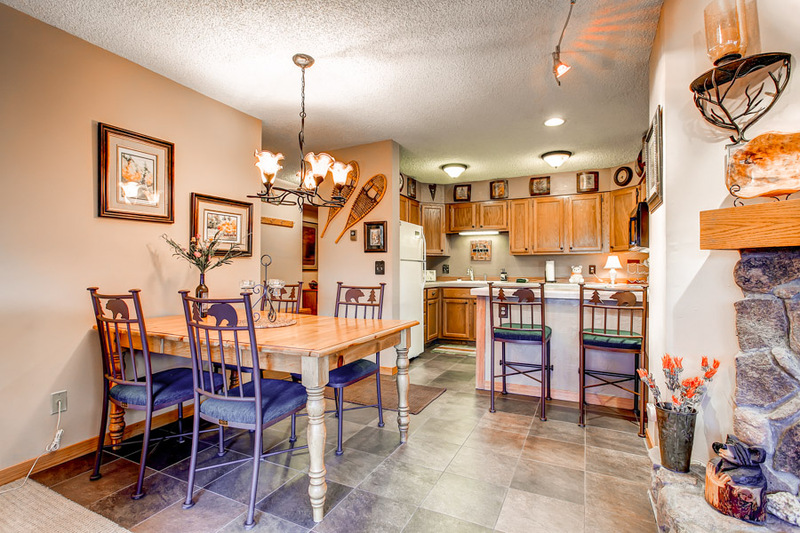 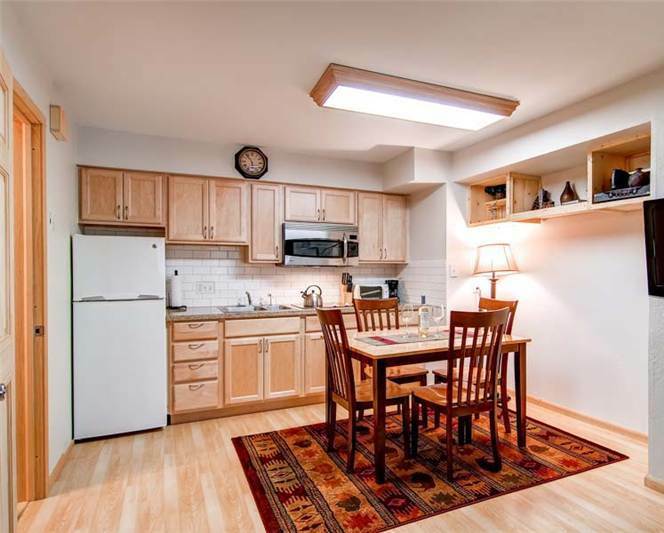 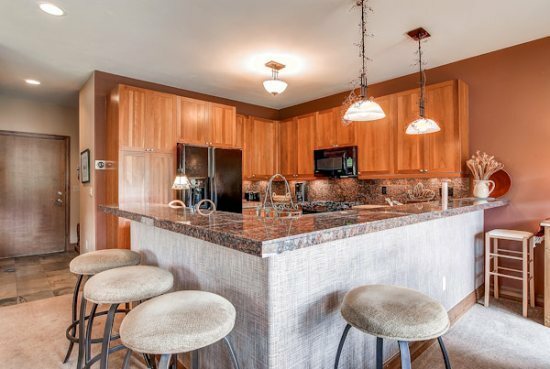 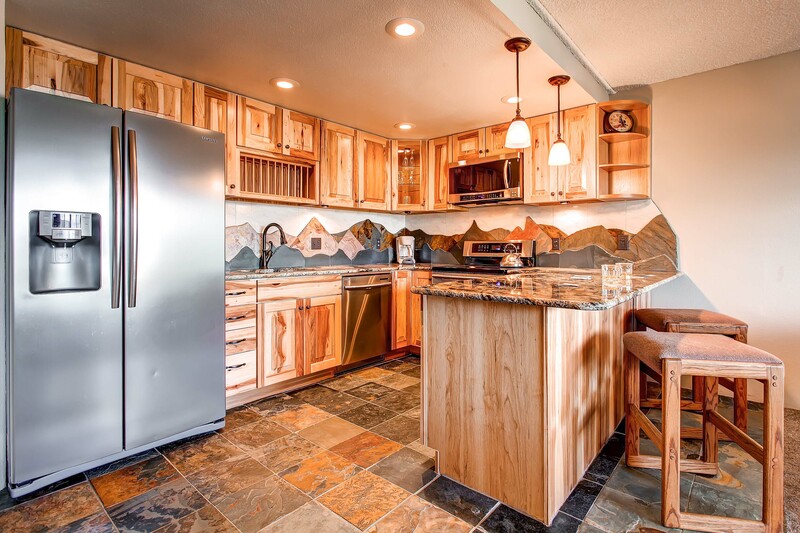 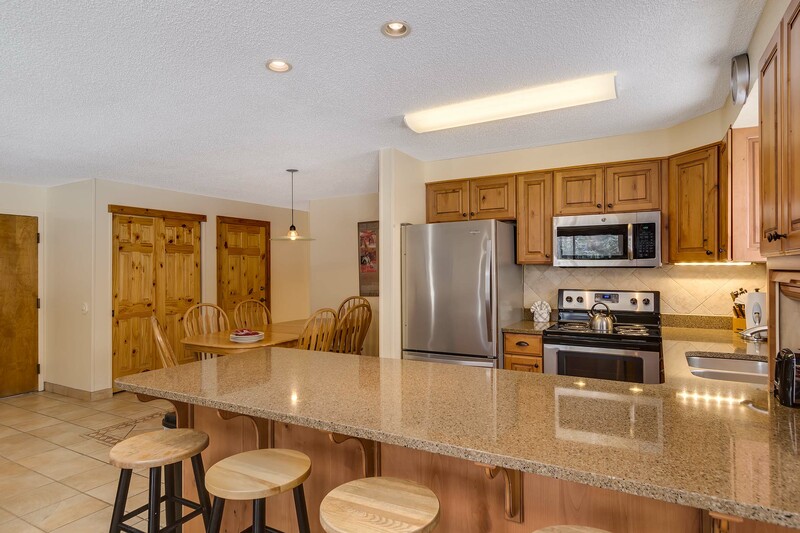 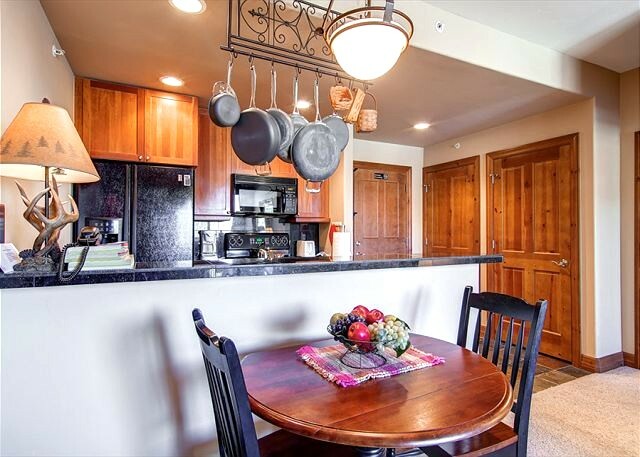 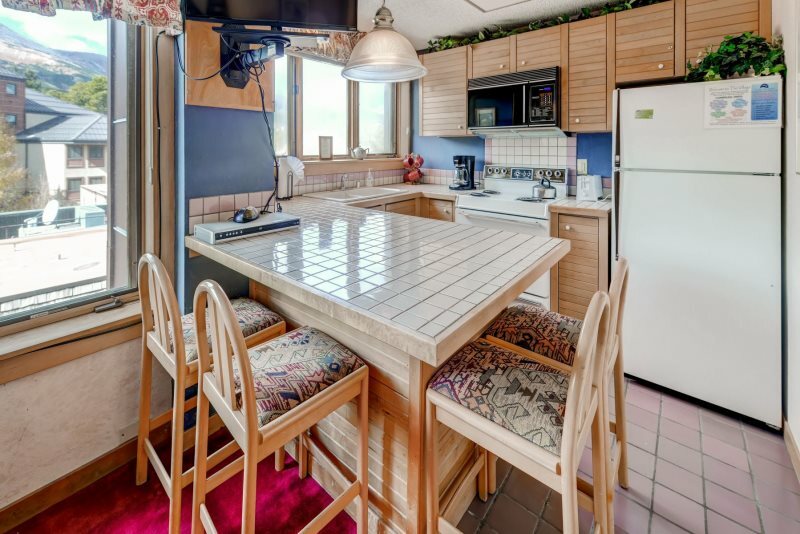 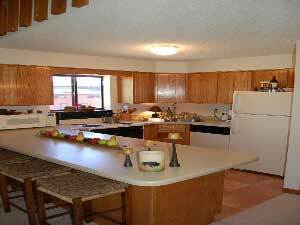 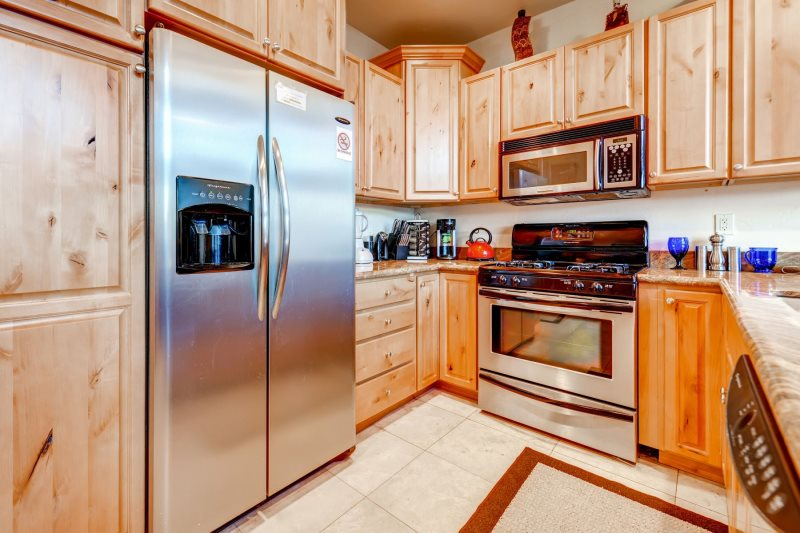 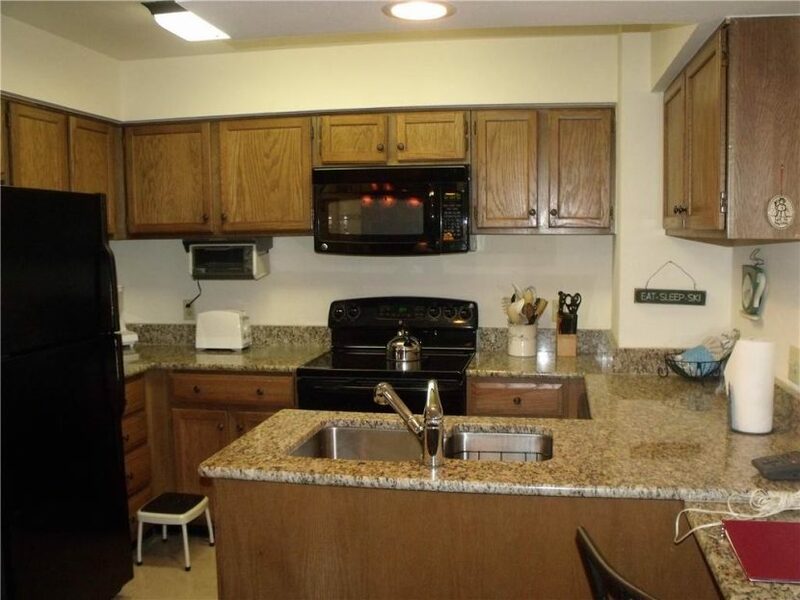 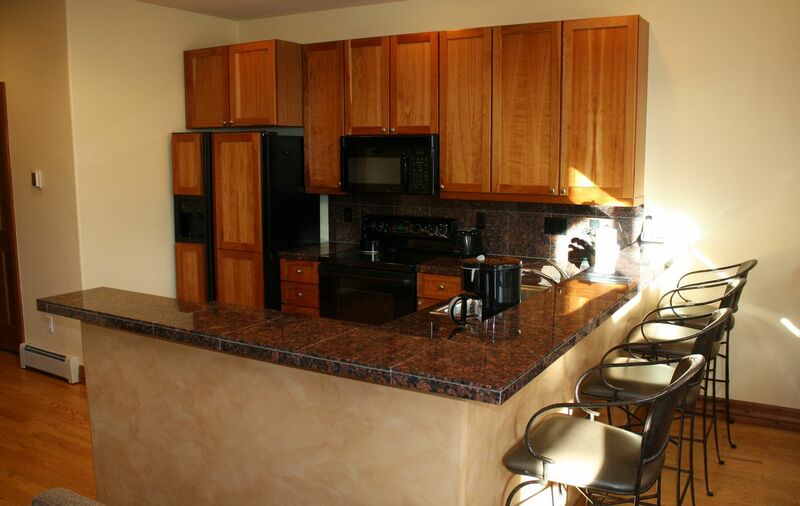 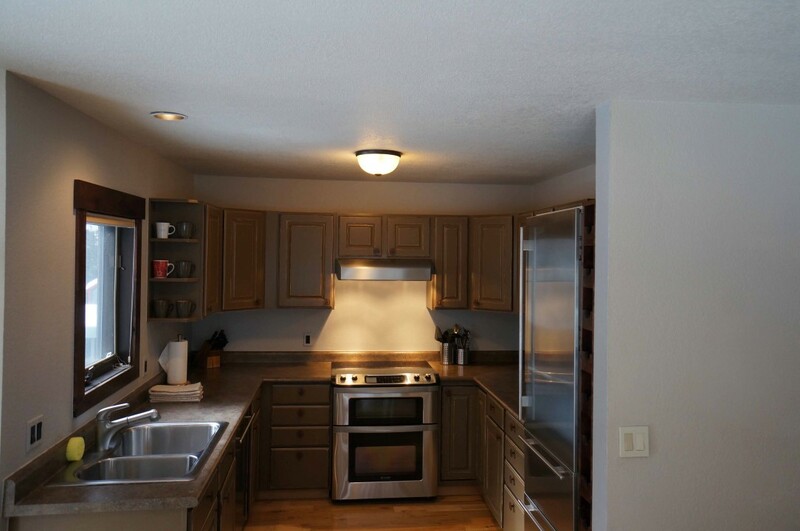 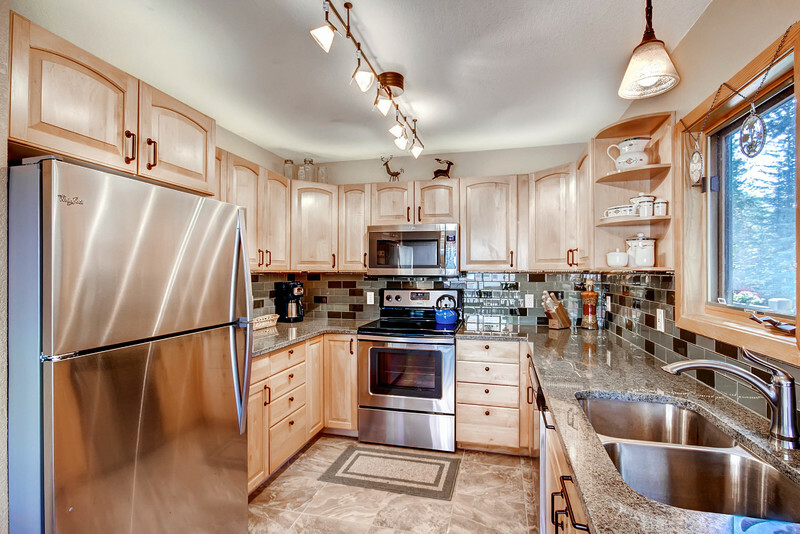 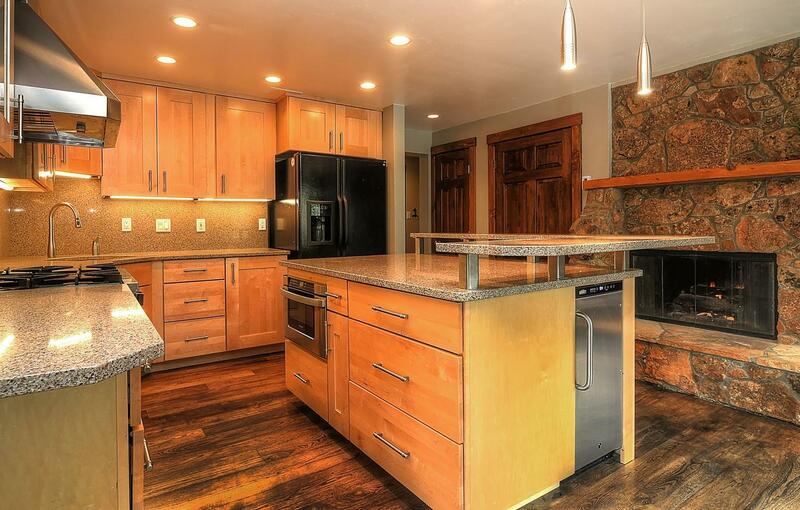 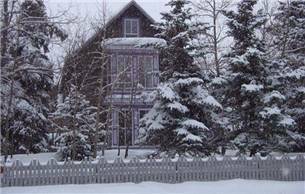 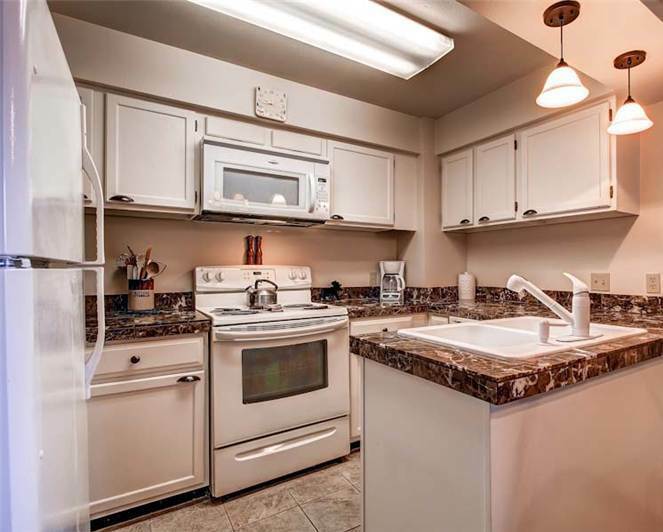 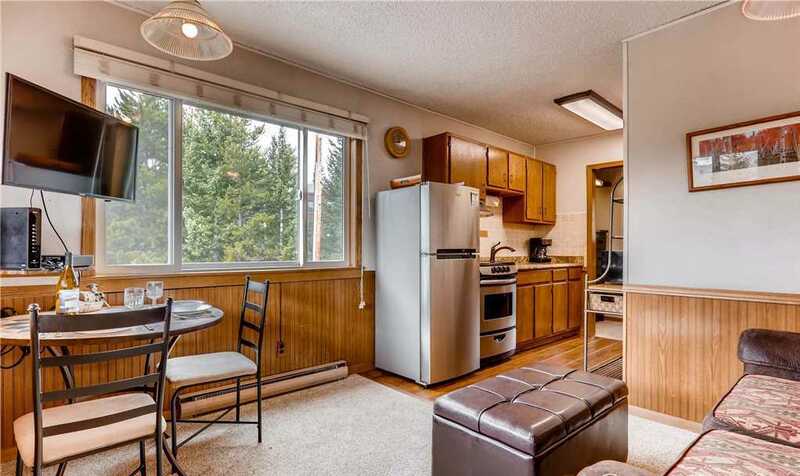 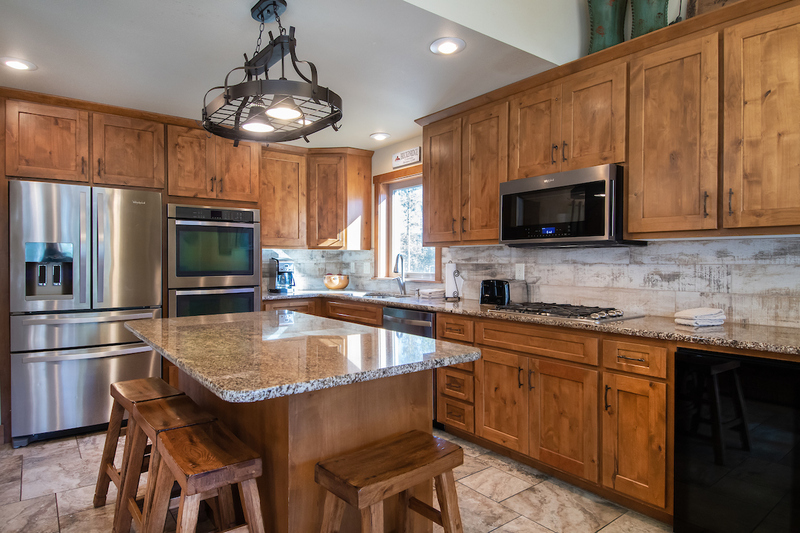 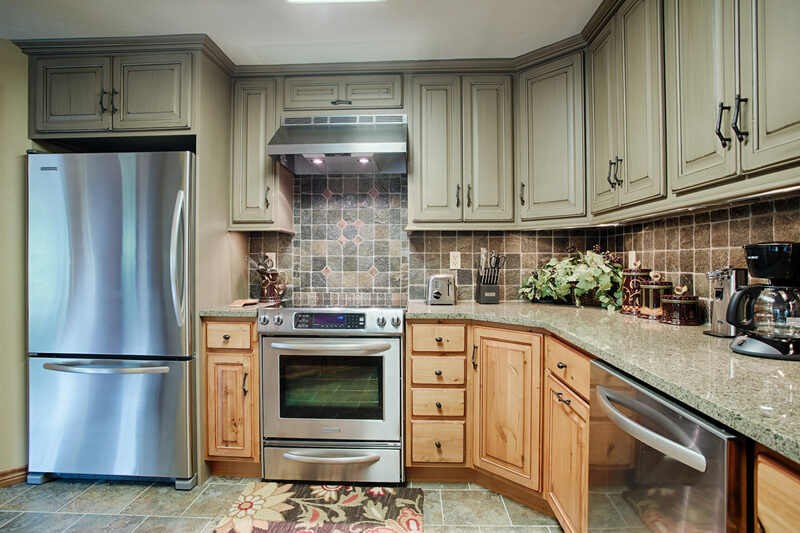 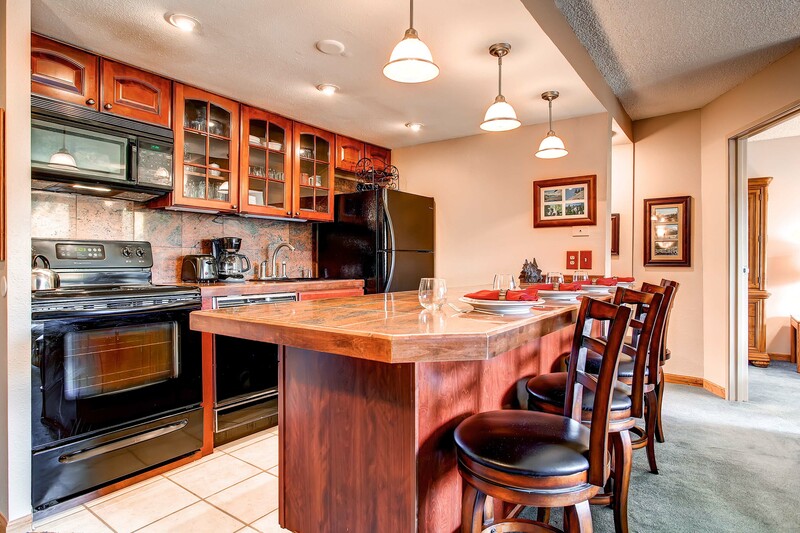 This quaint and cozy condo has a fully stocked kitchen with beautiful new stainless steel appliances perfect for preparing family meals. 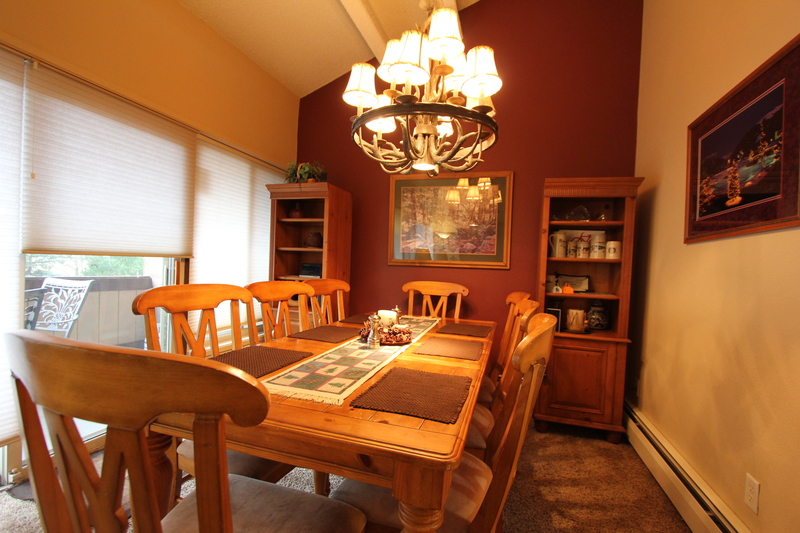 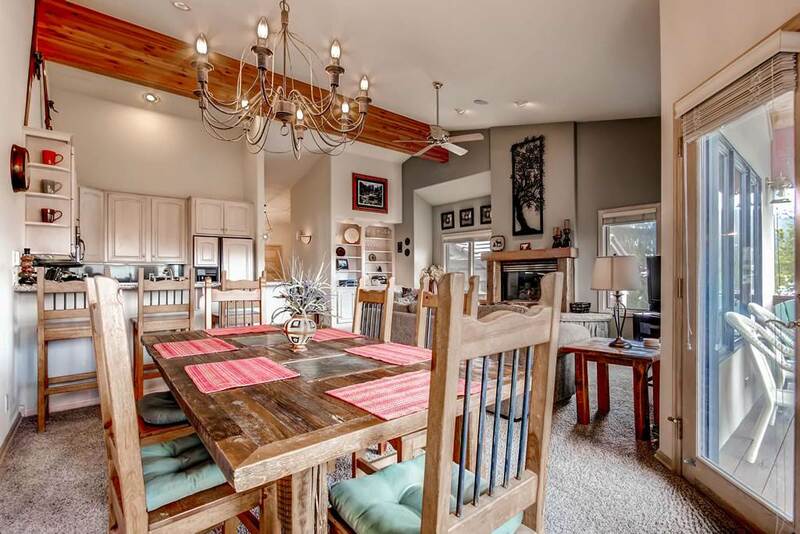 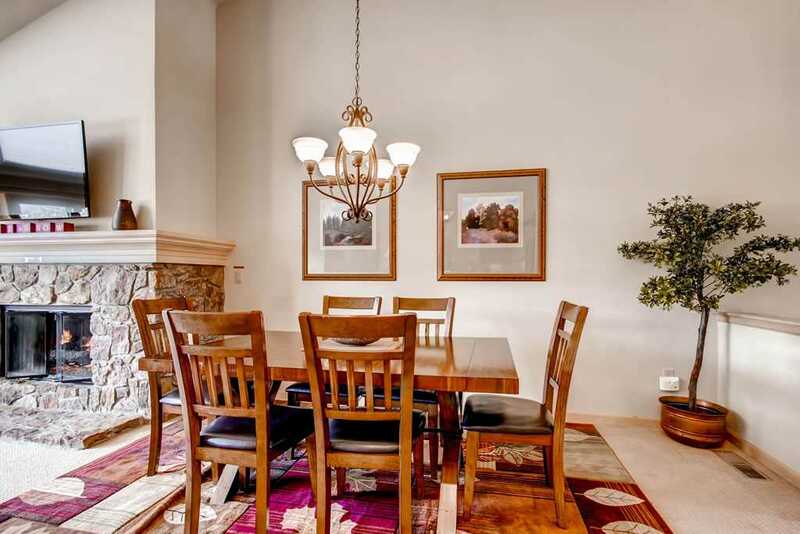 Share stories of the day’s adventures around the large dining table. 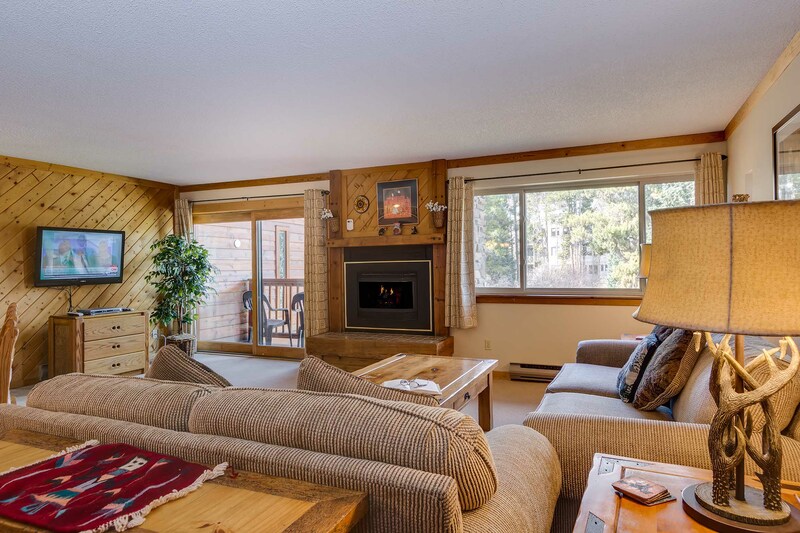 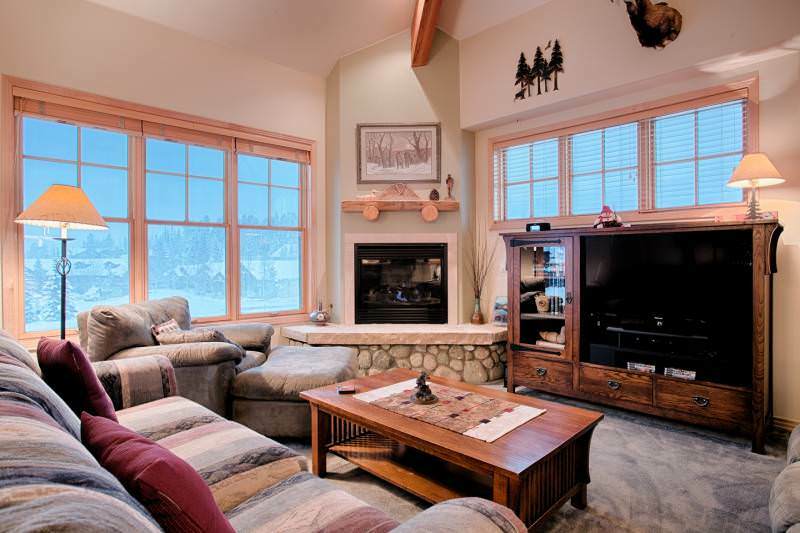 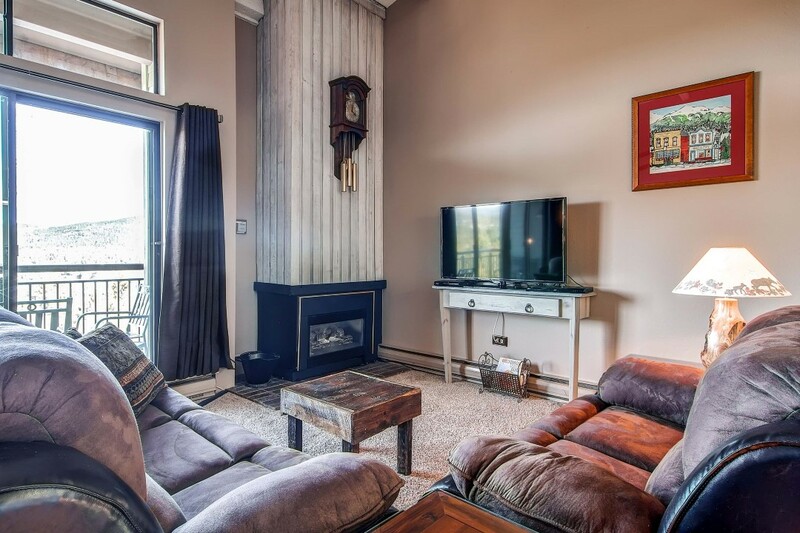 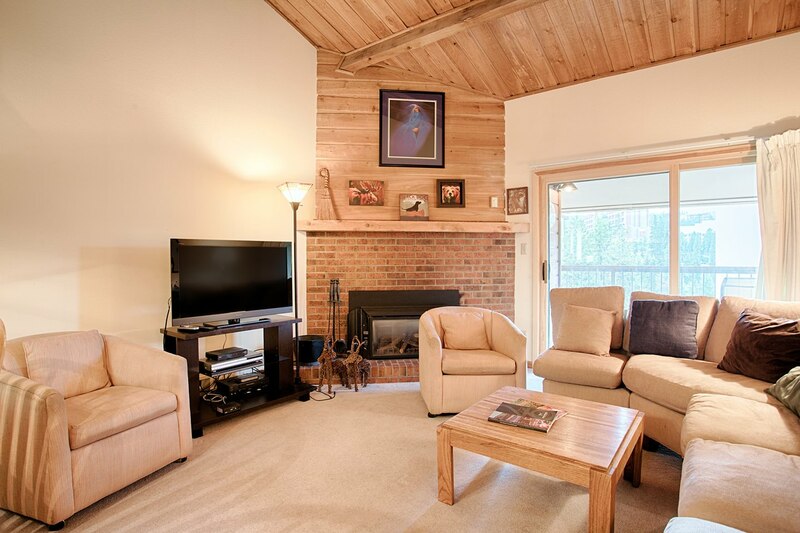 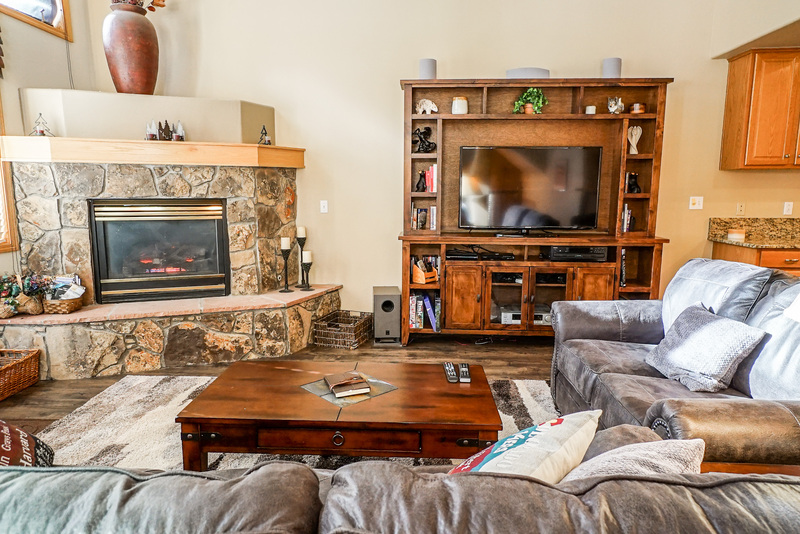 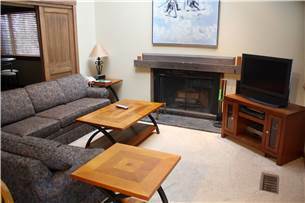 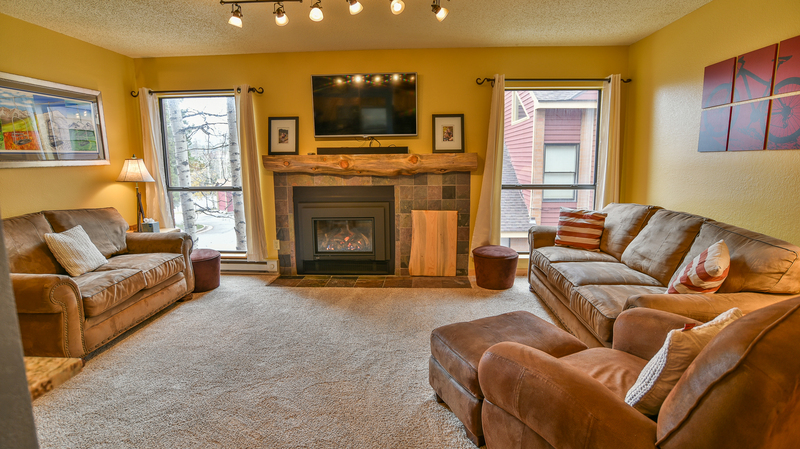 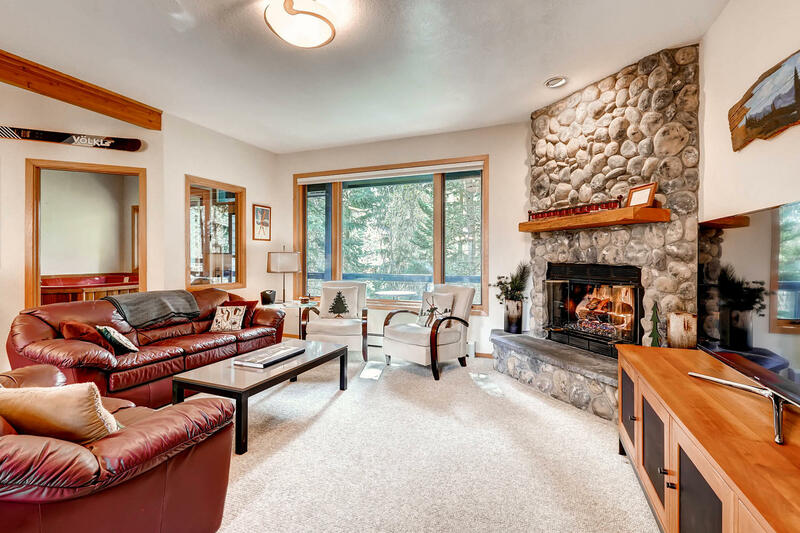 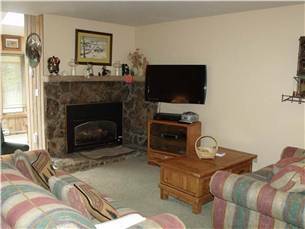 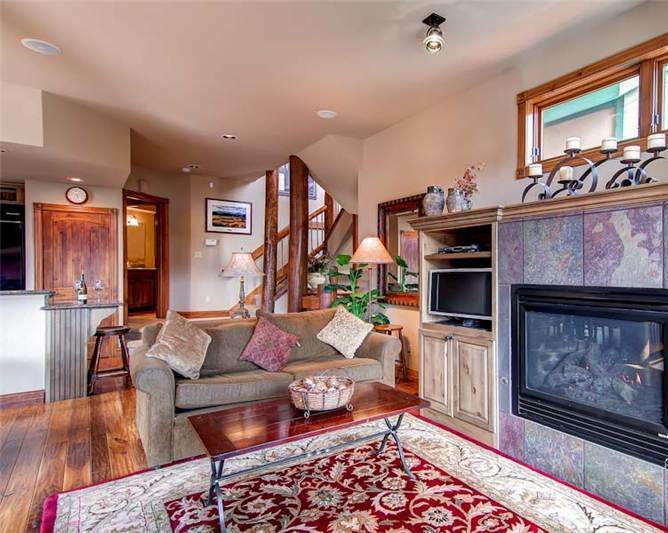 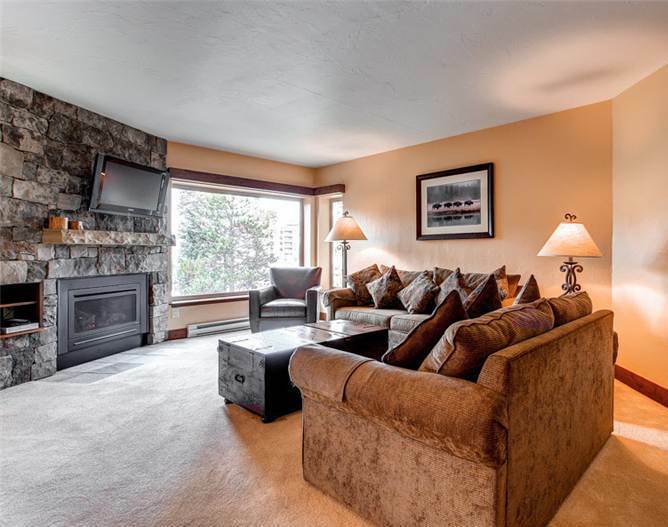 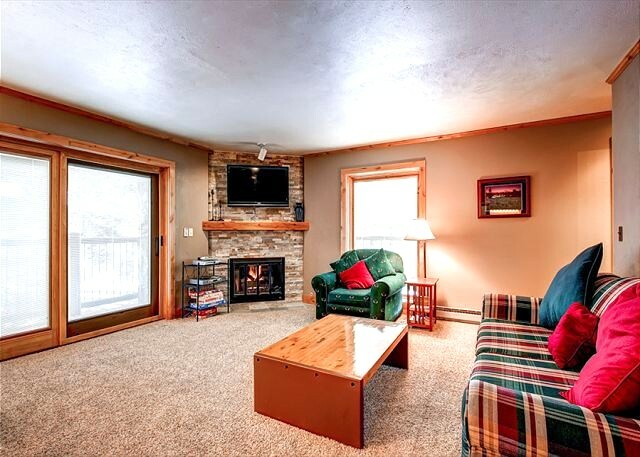 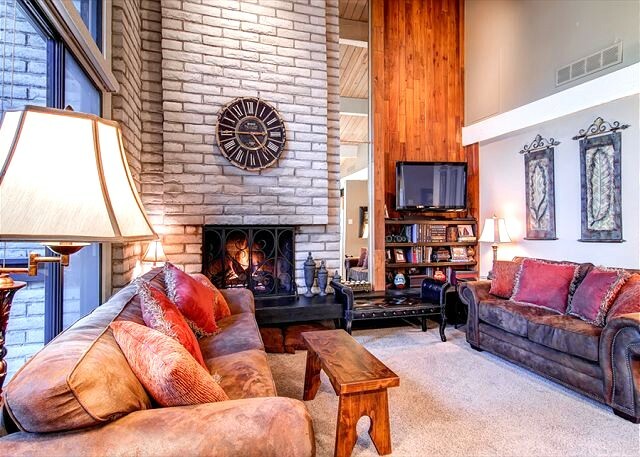 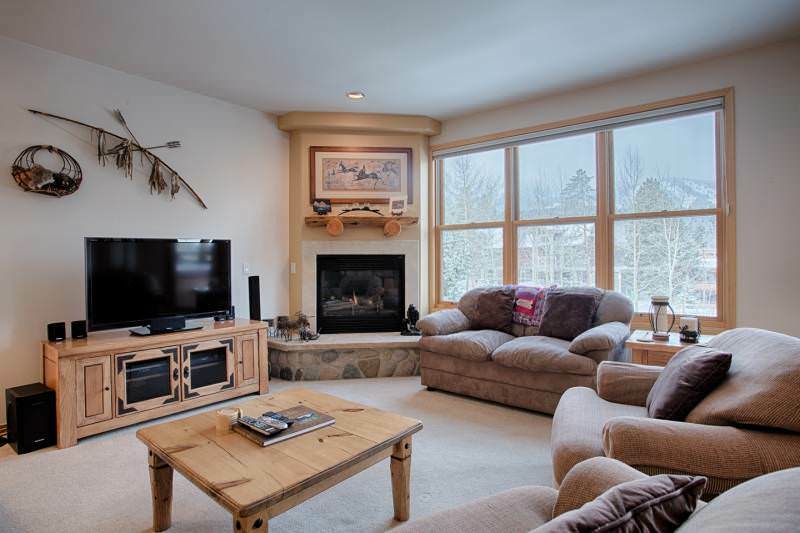 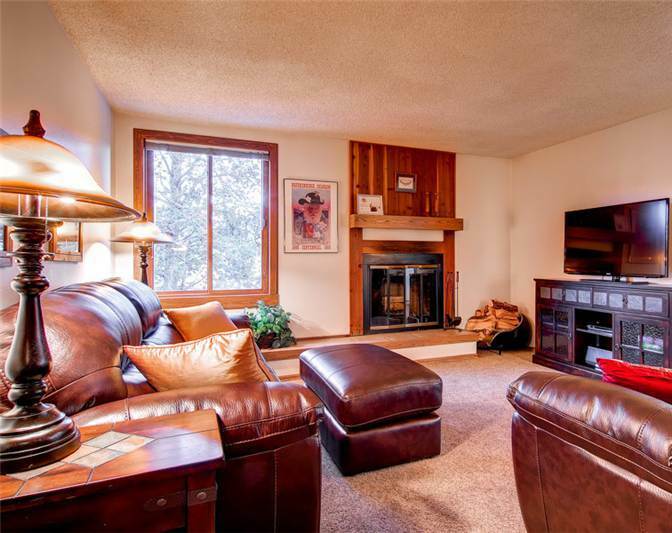 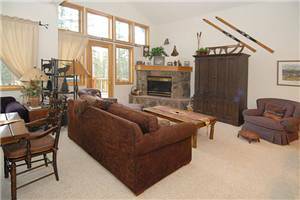 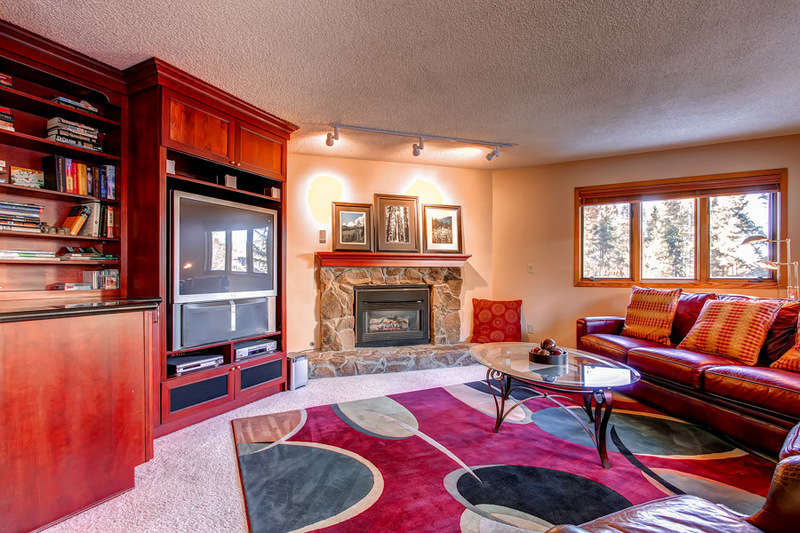 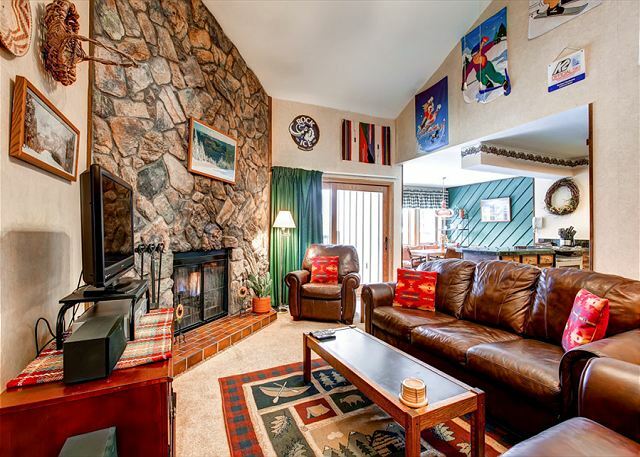 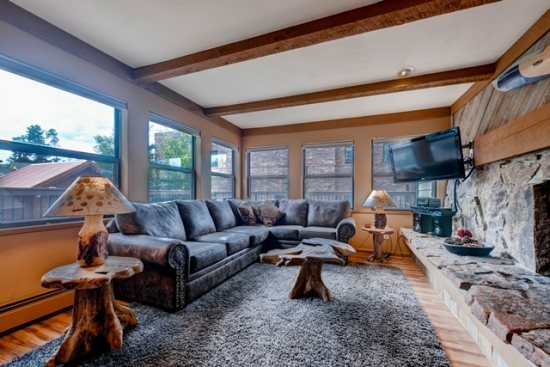 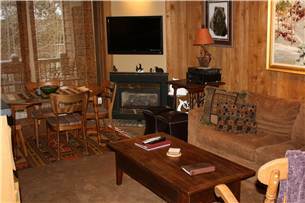 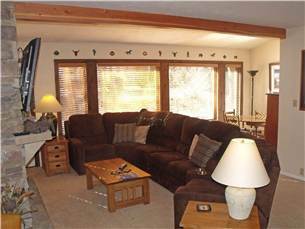 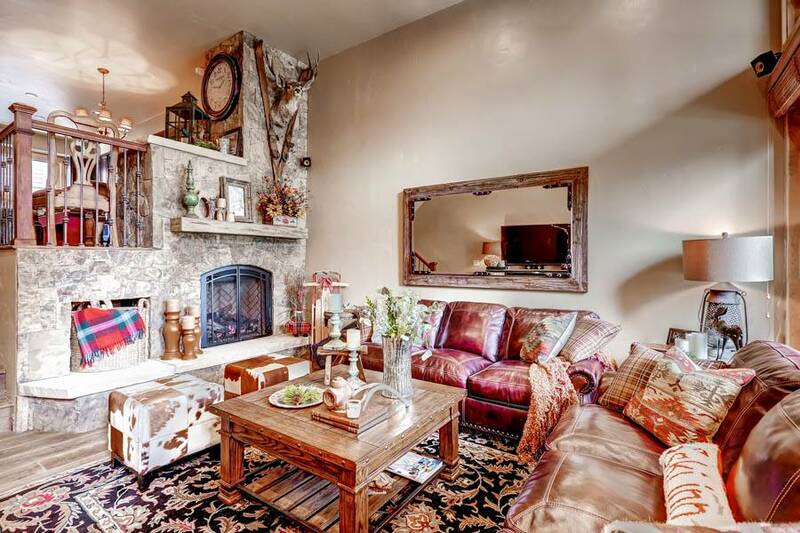 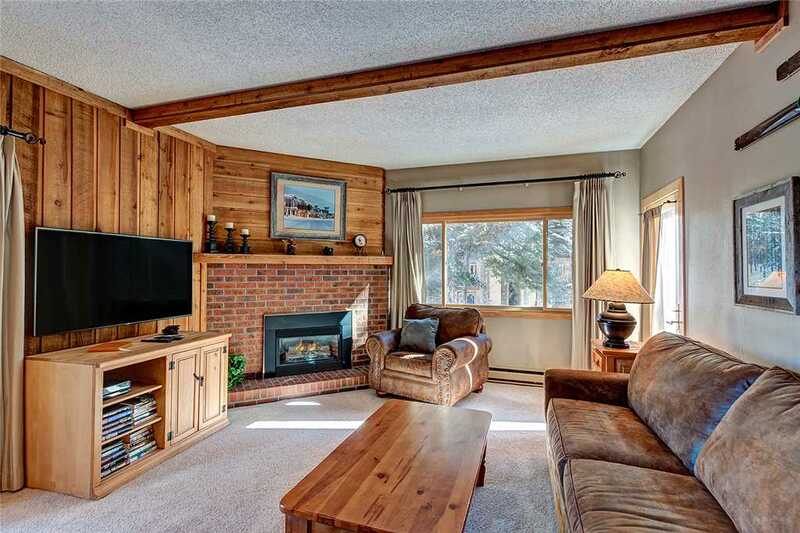 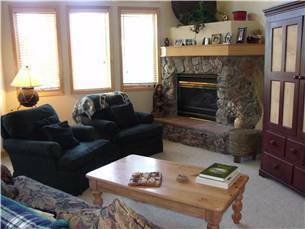 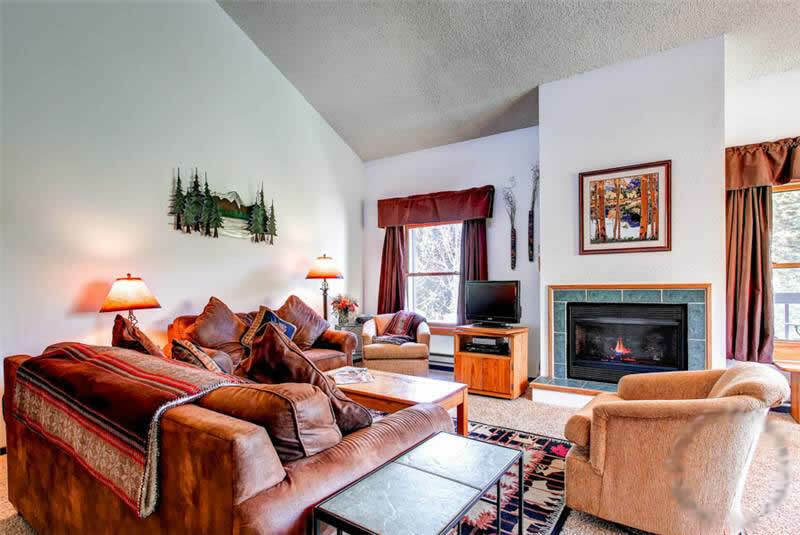 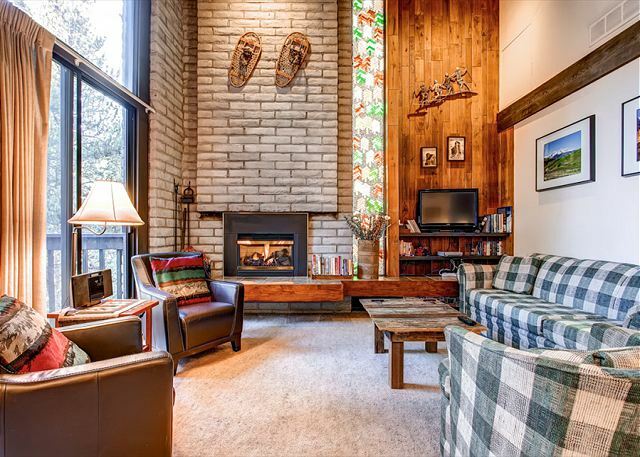 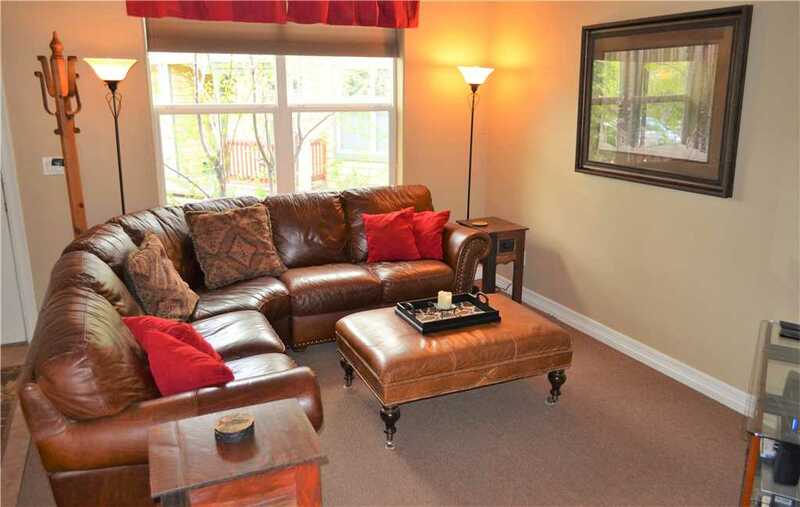 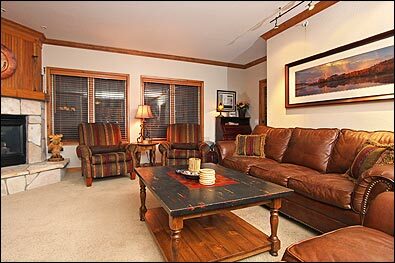 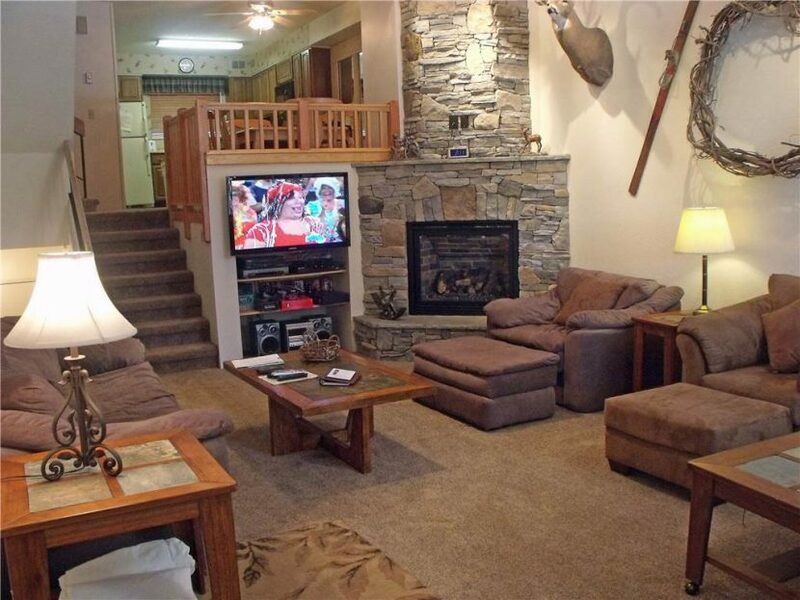 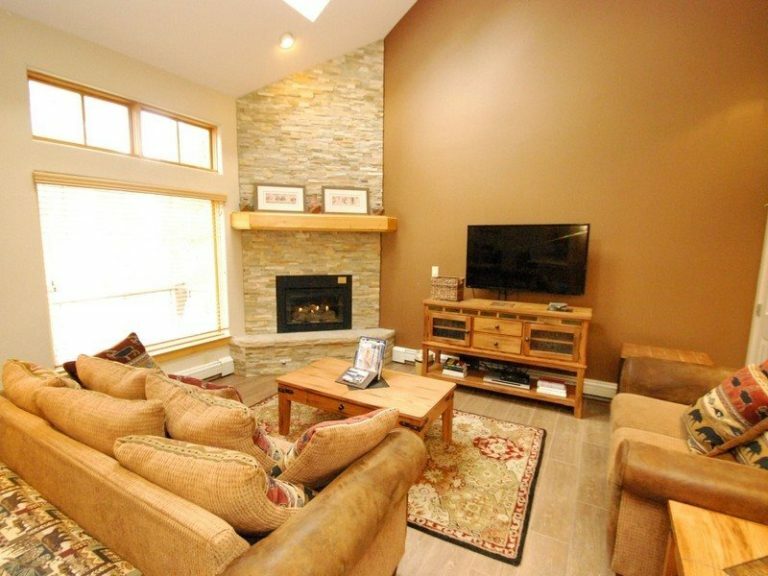 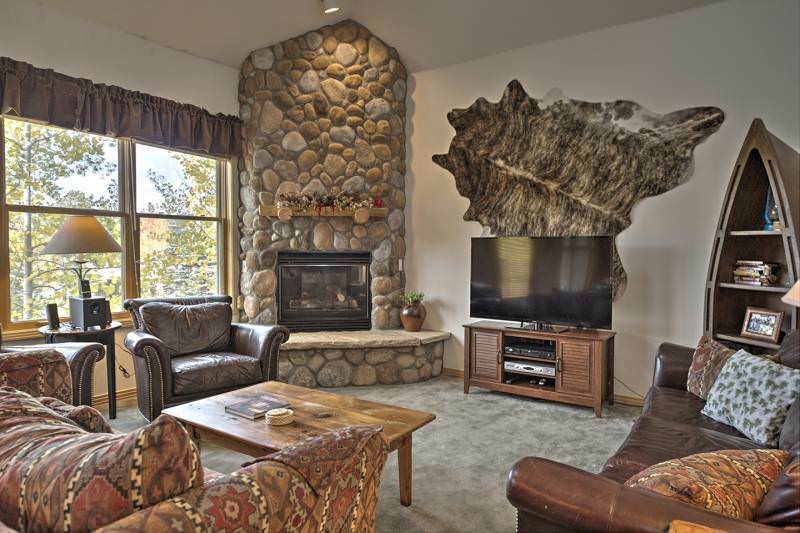 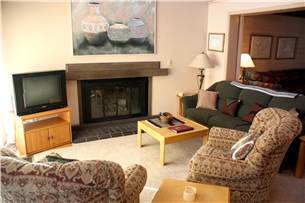 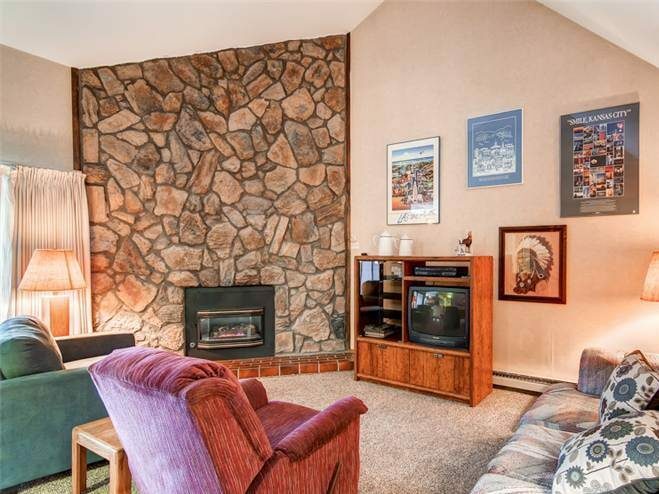 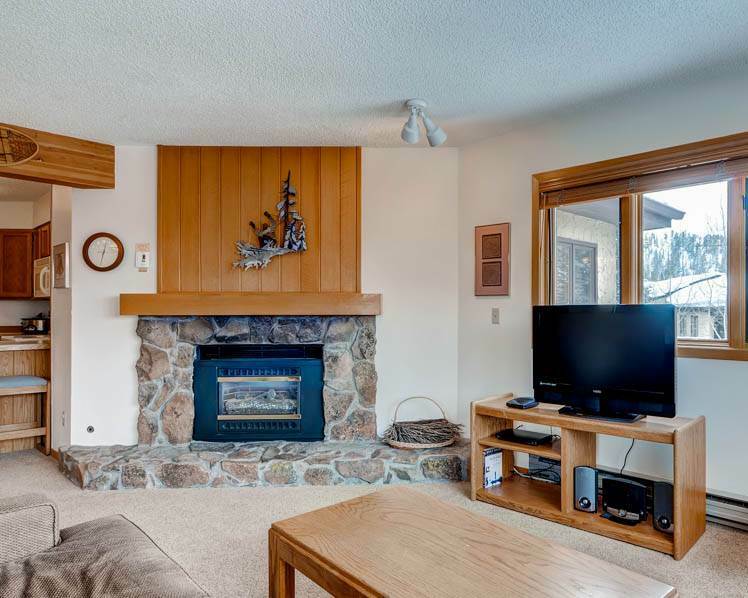 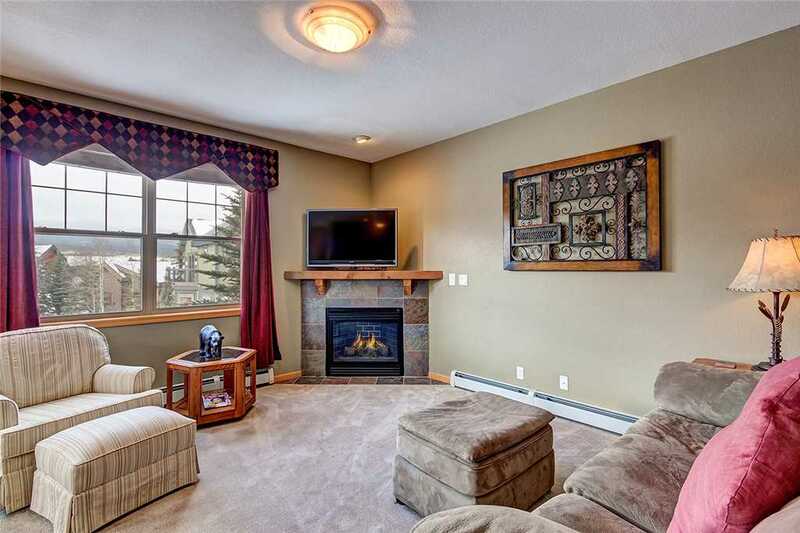 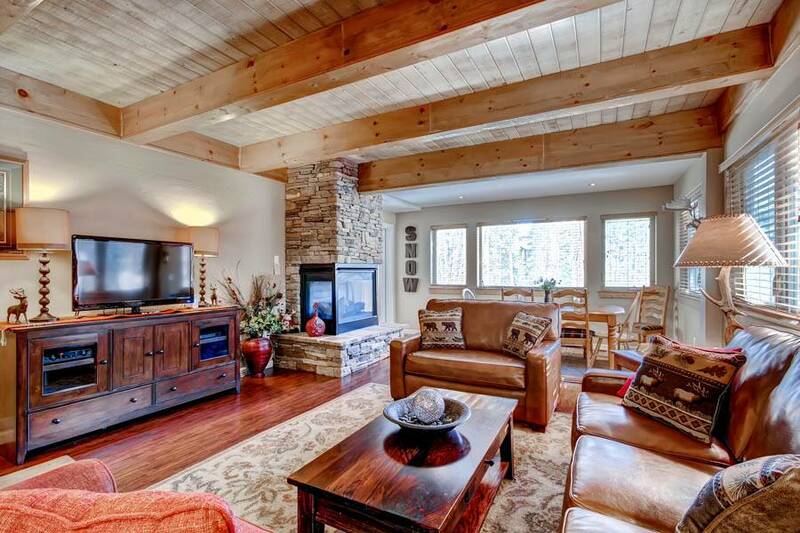 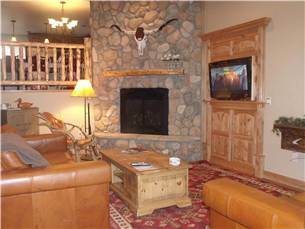 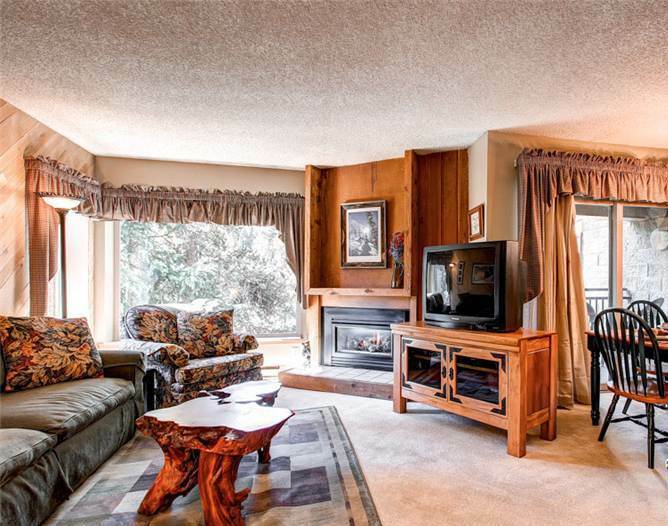 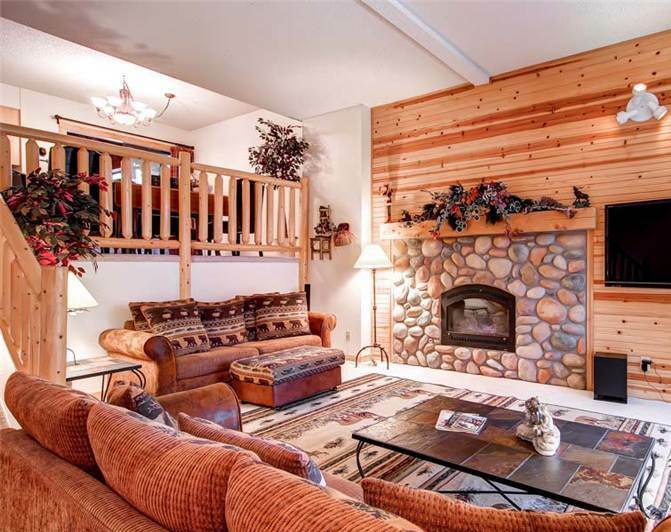 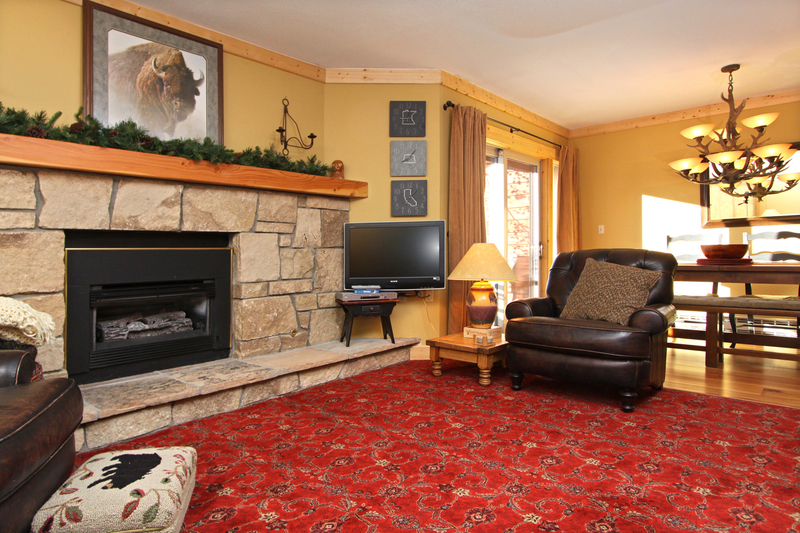 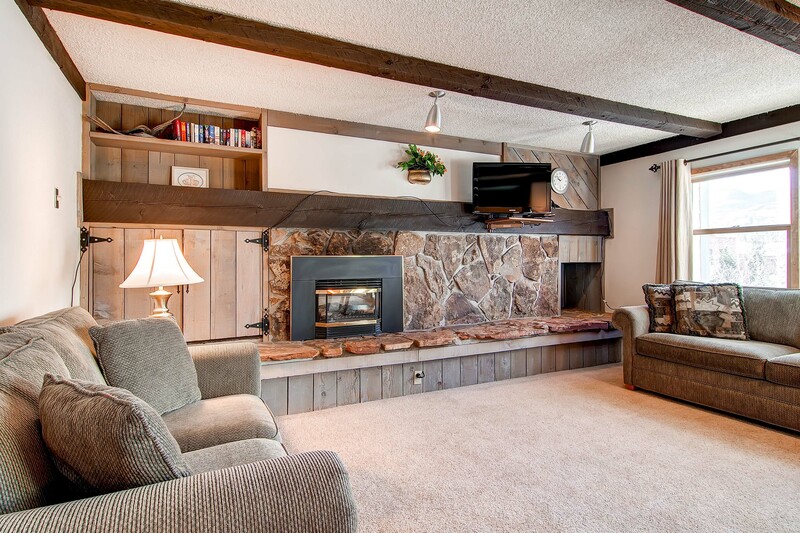 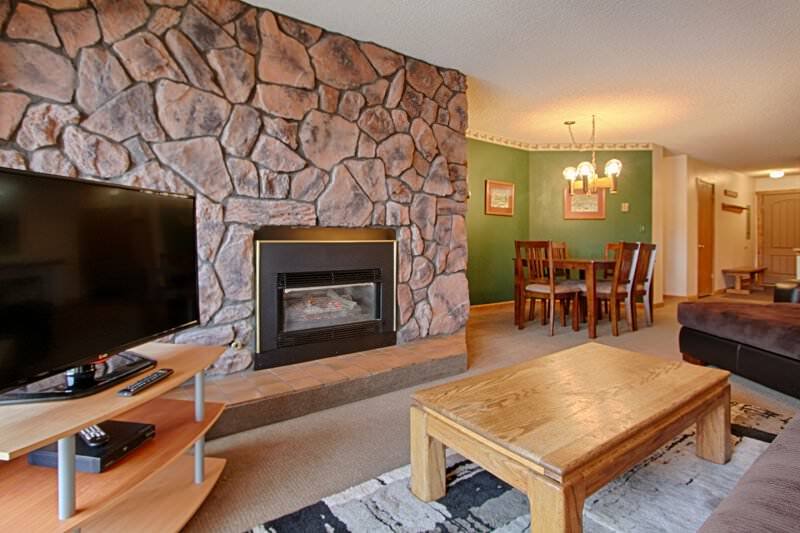 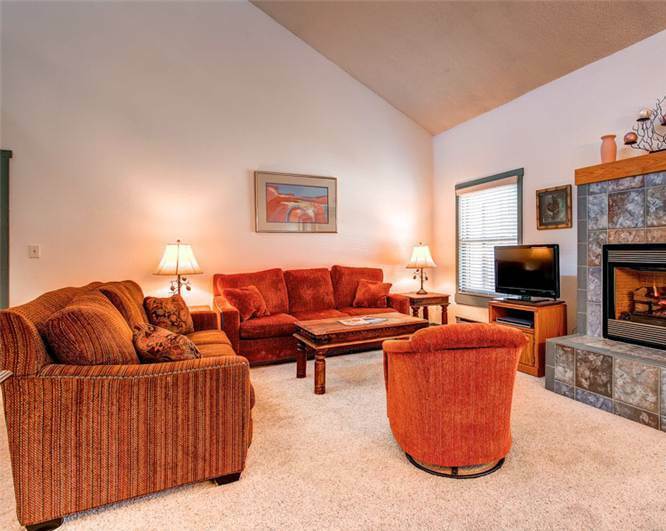 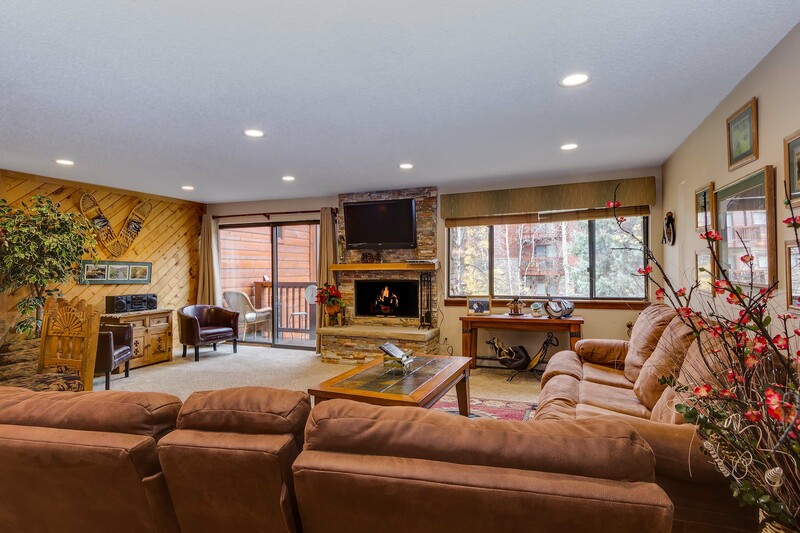 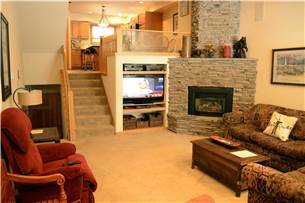 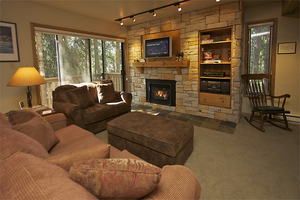 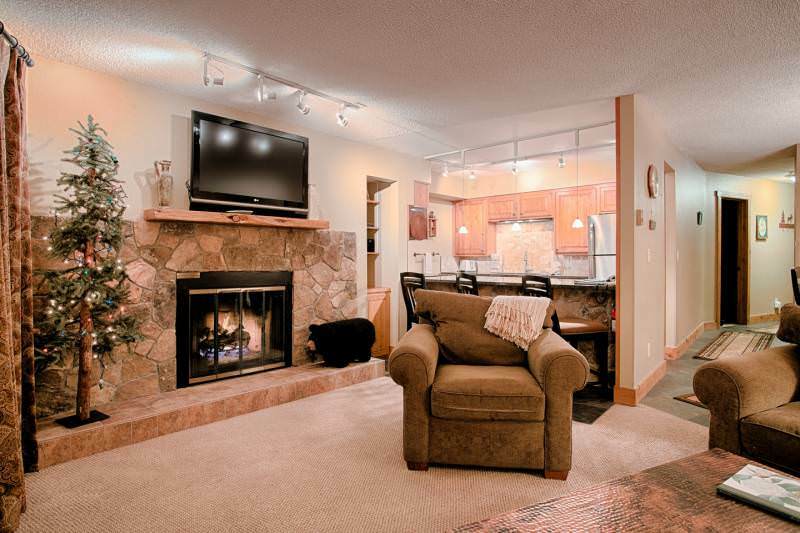 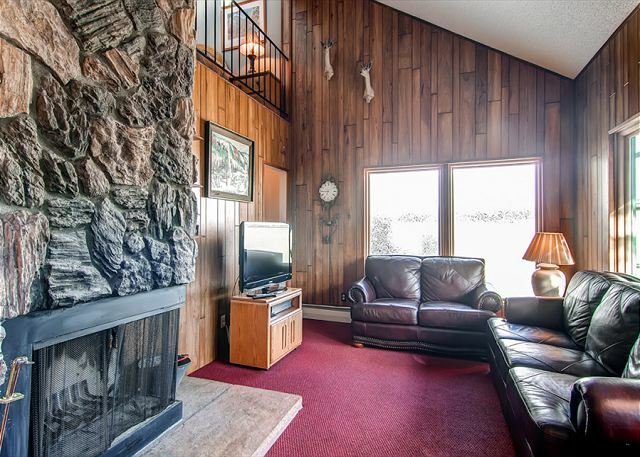 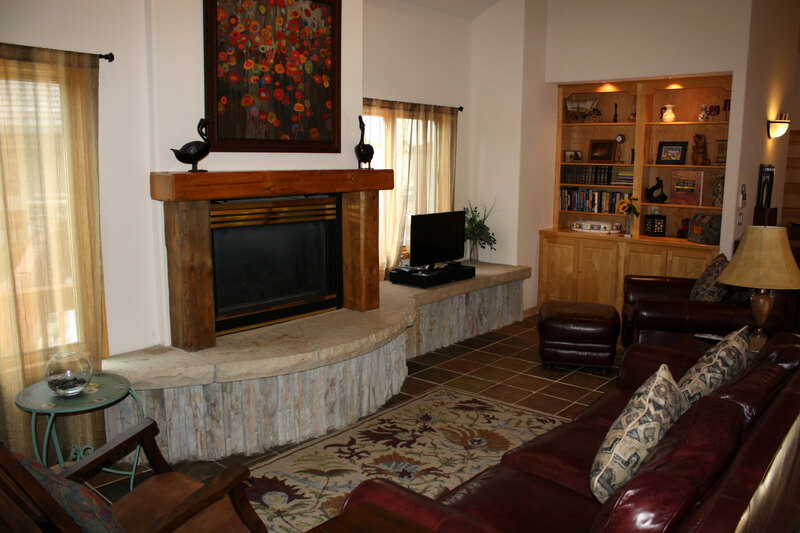 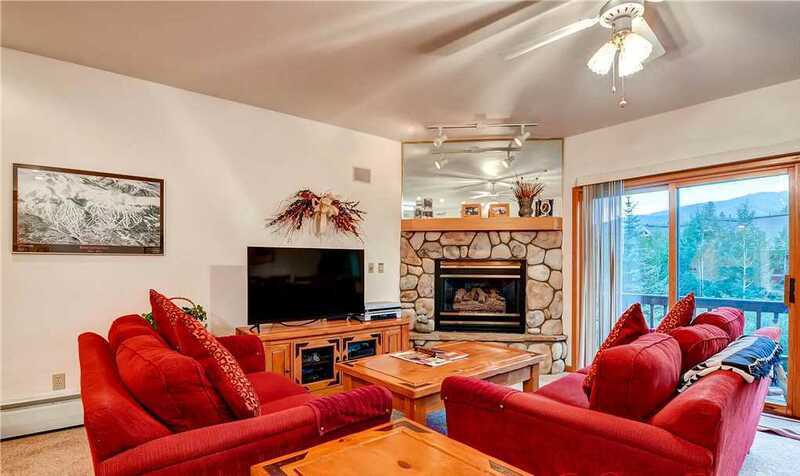 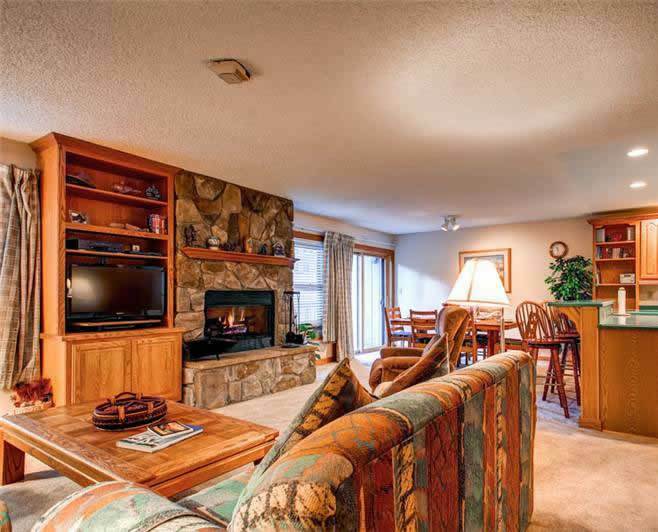 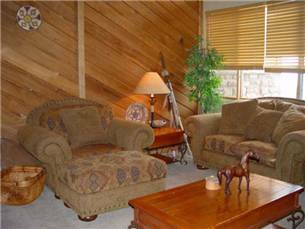 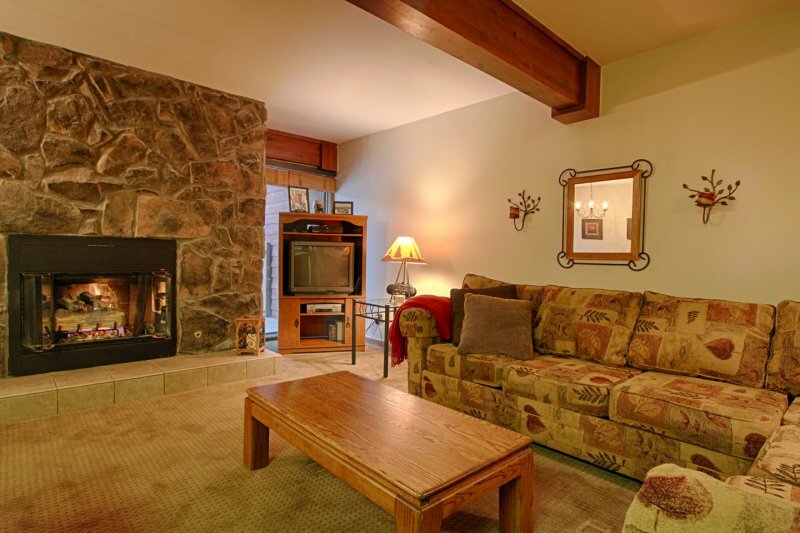 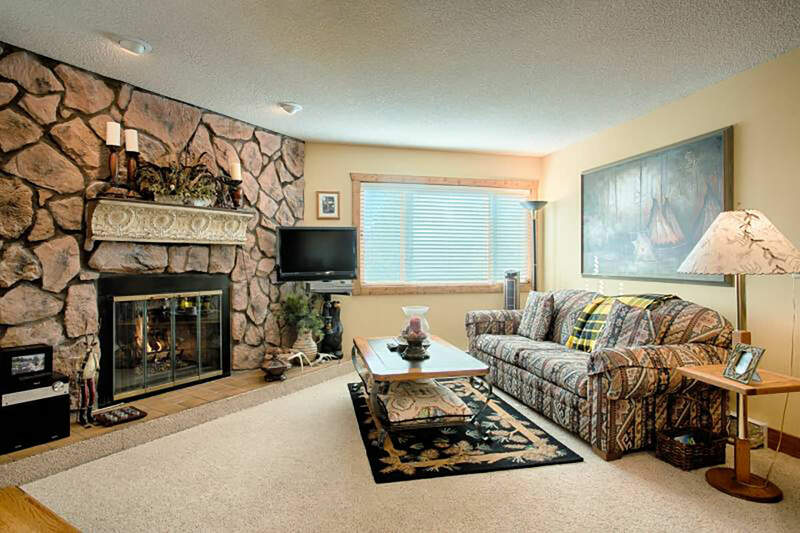 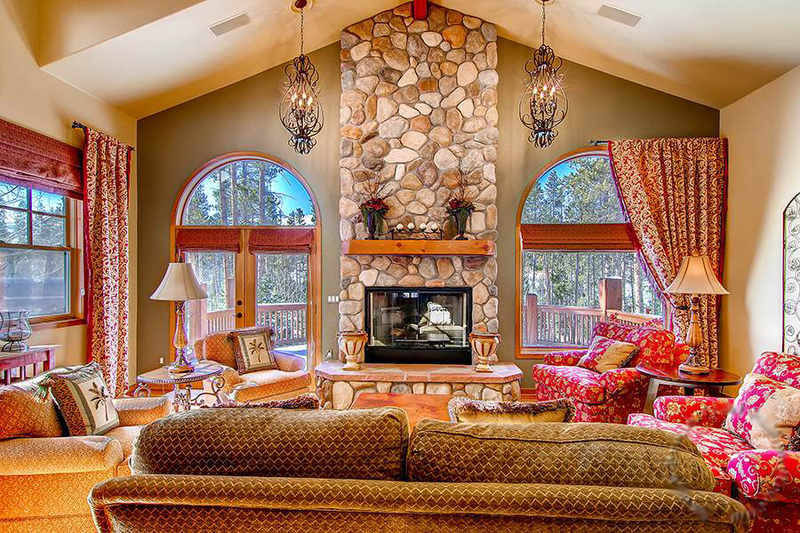 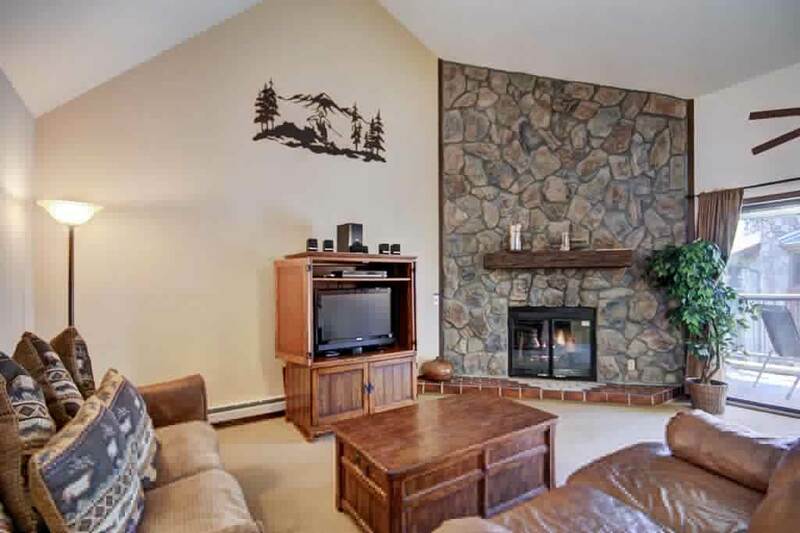 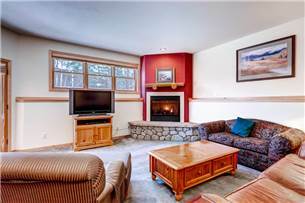 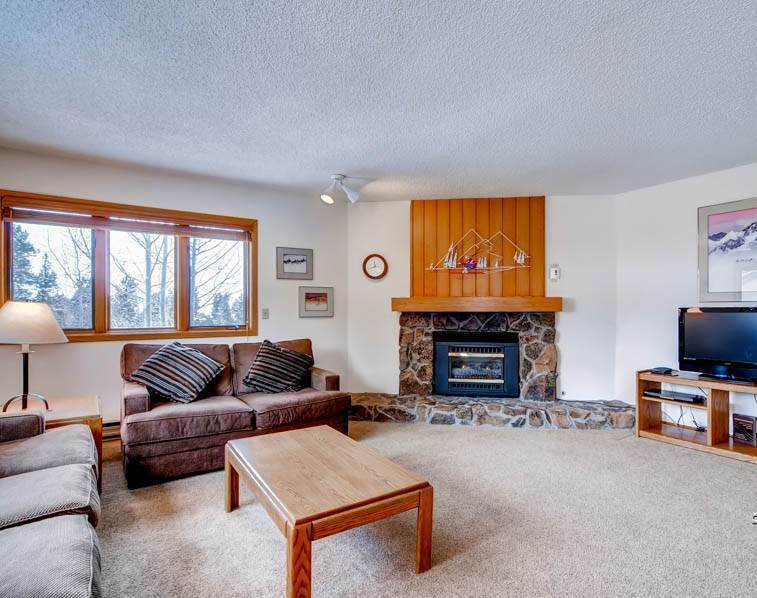 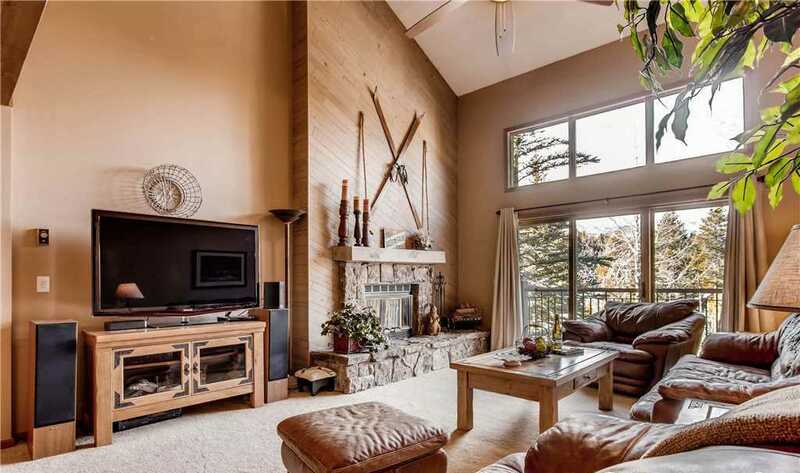 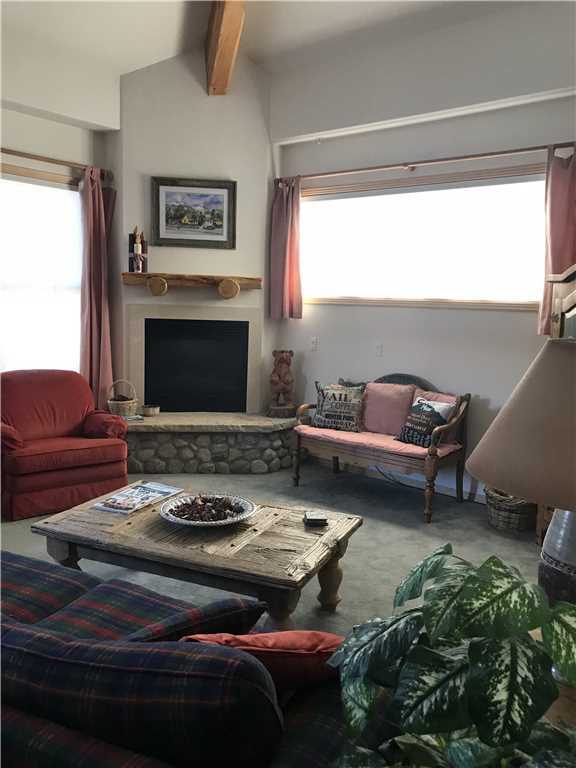 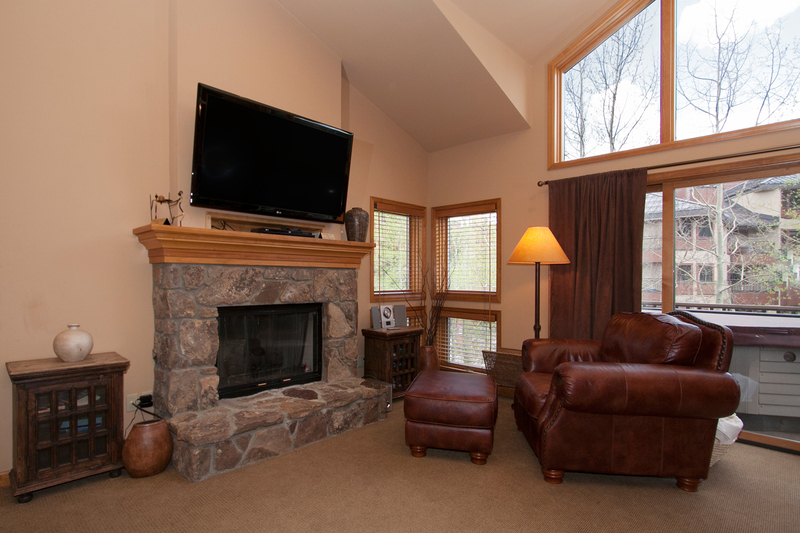 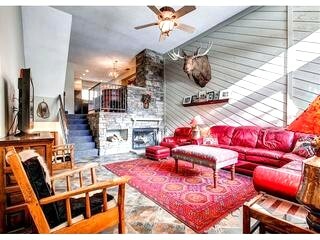 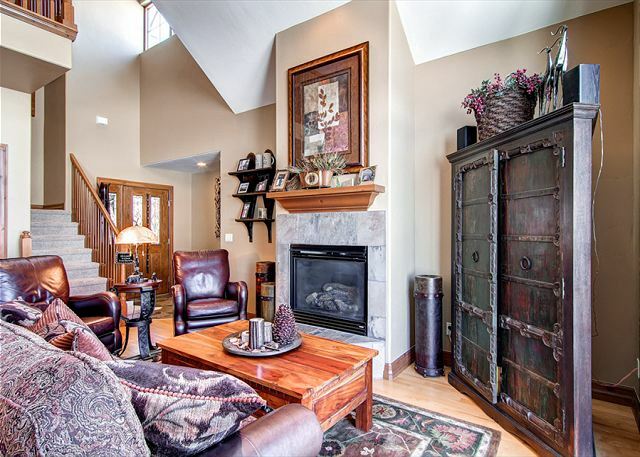 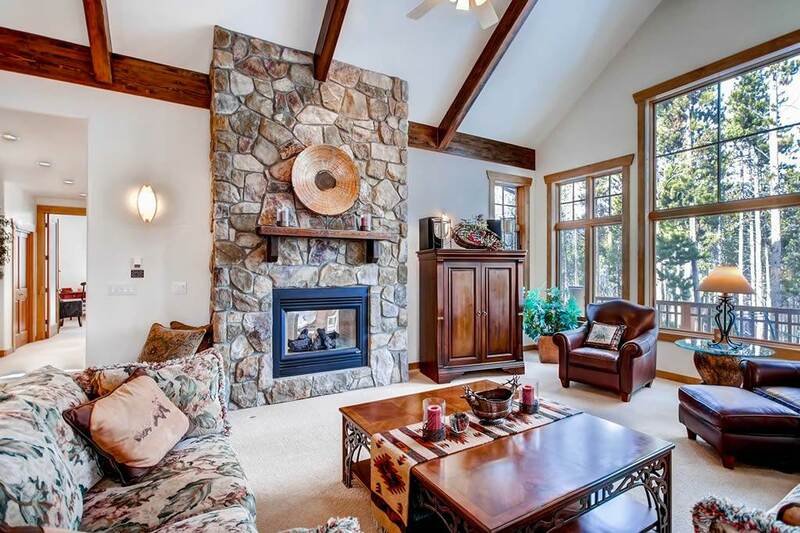 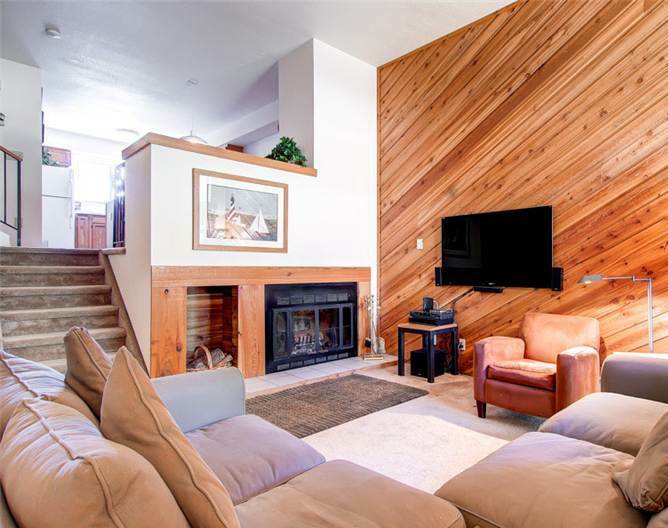 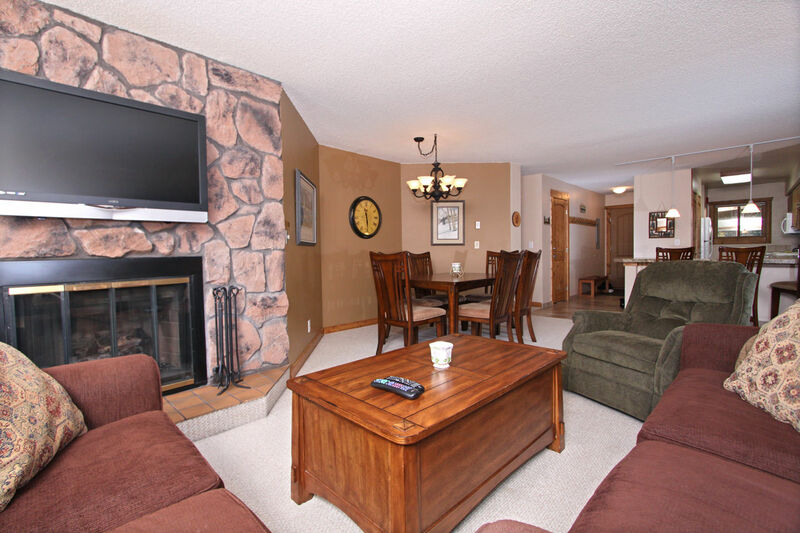 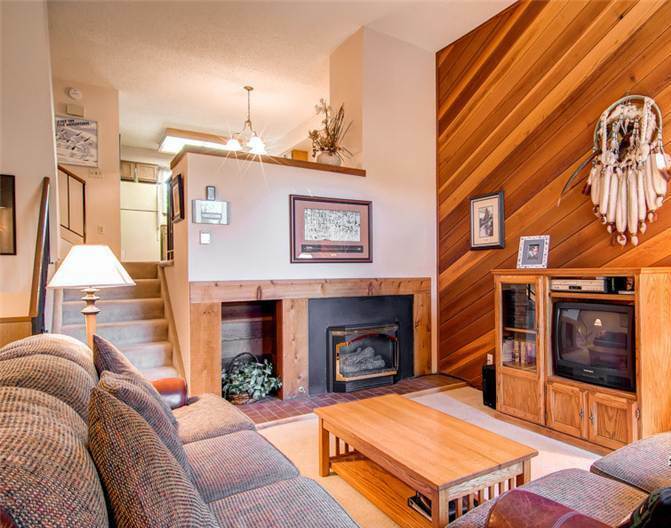 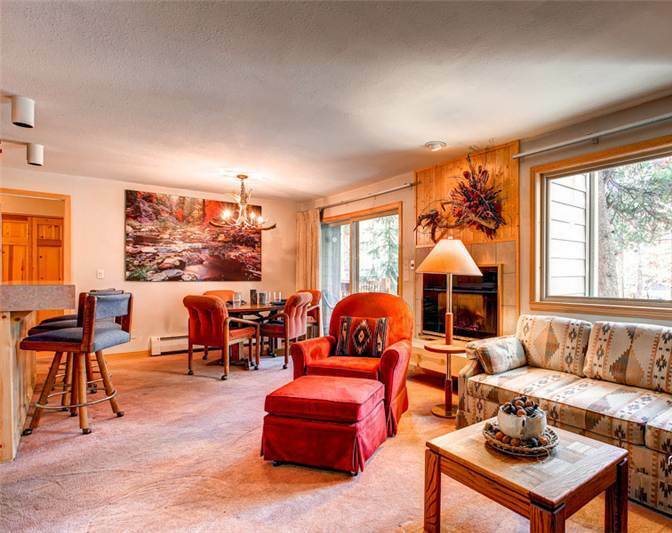 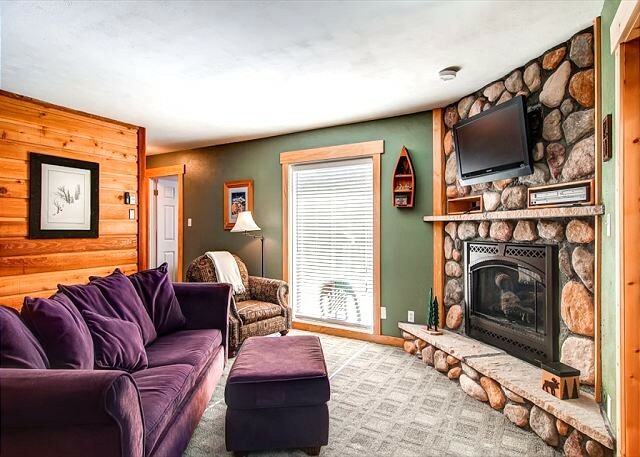 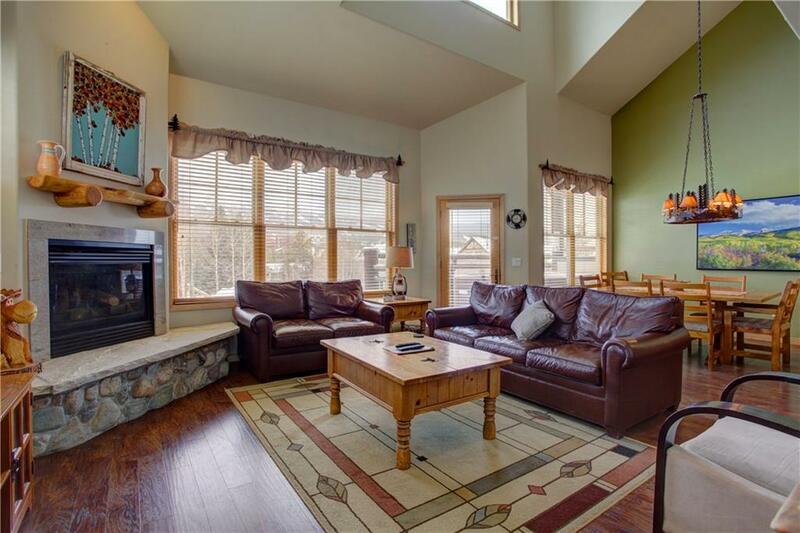 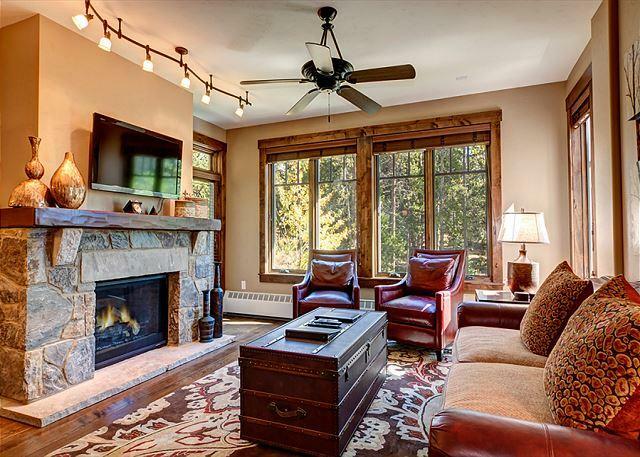 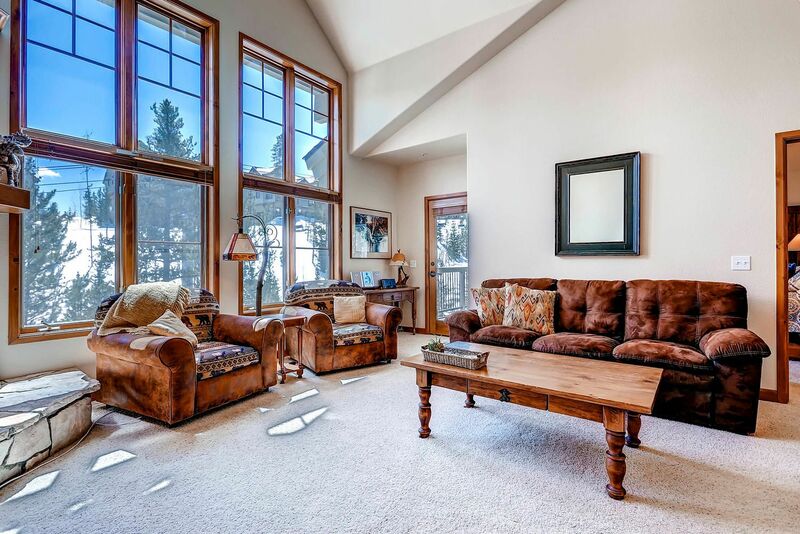 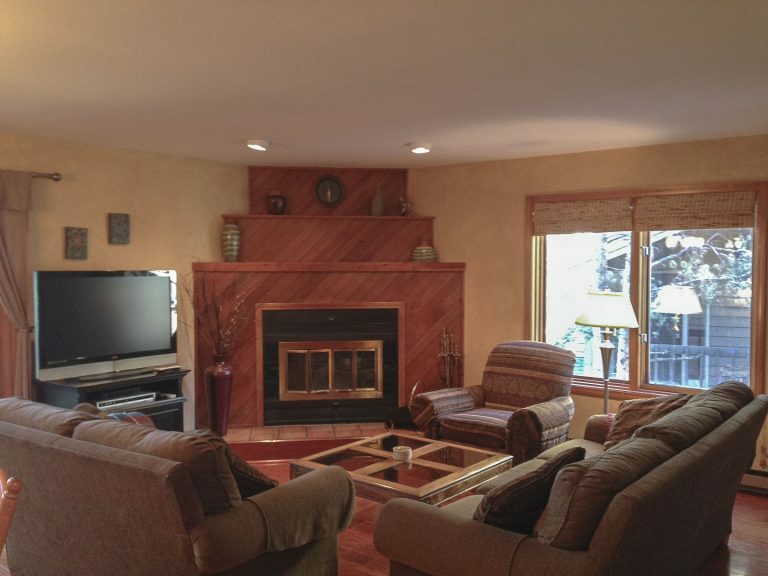 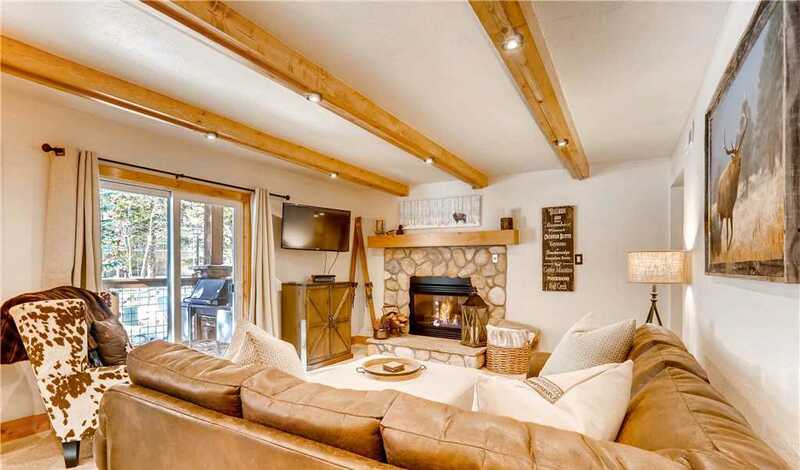 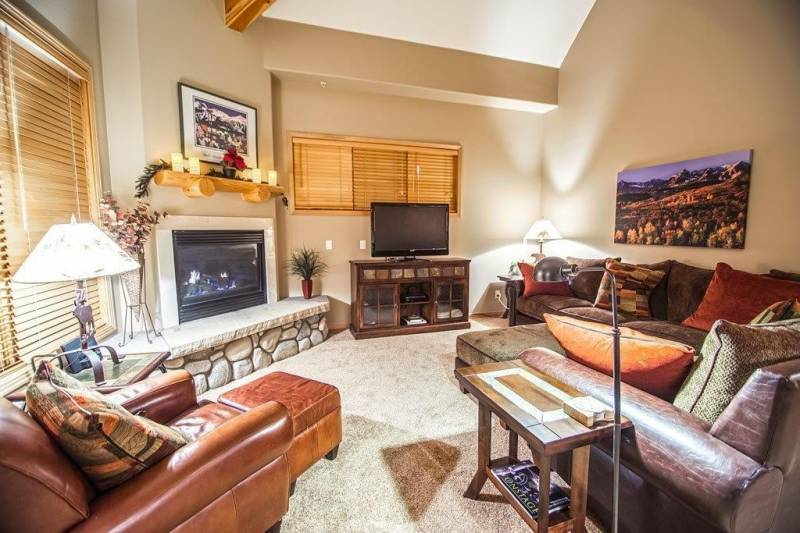 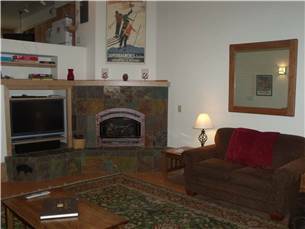 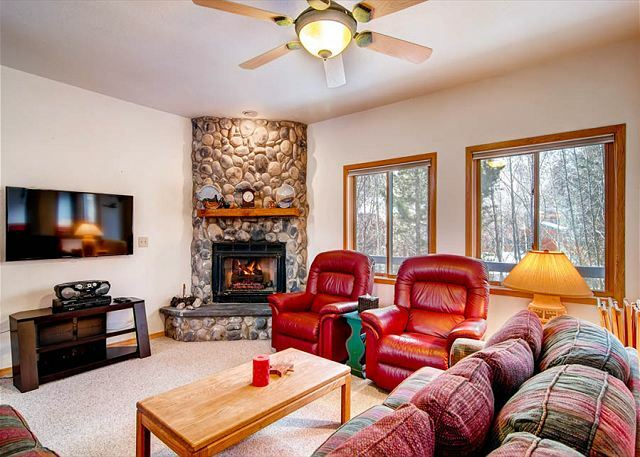 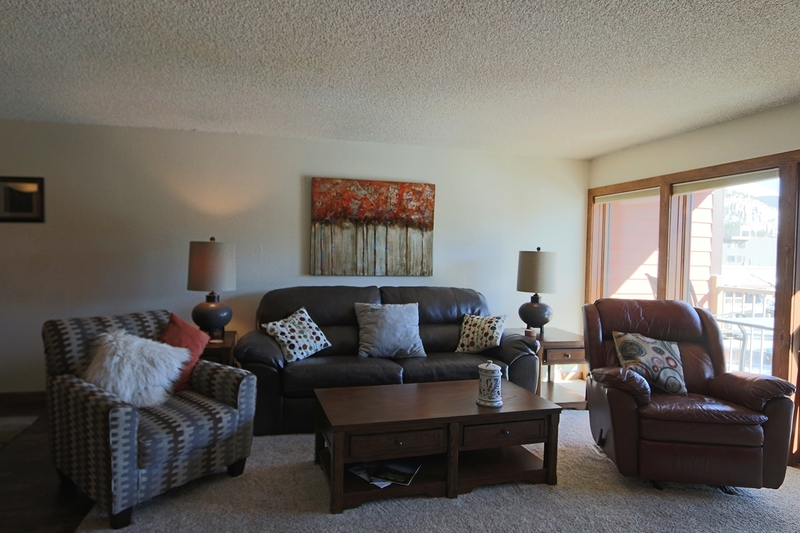 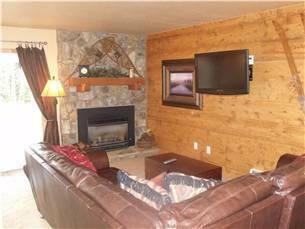 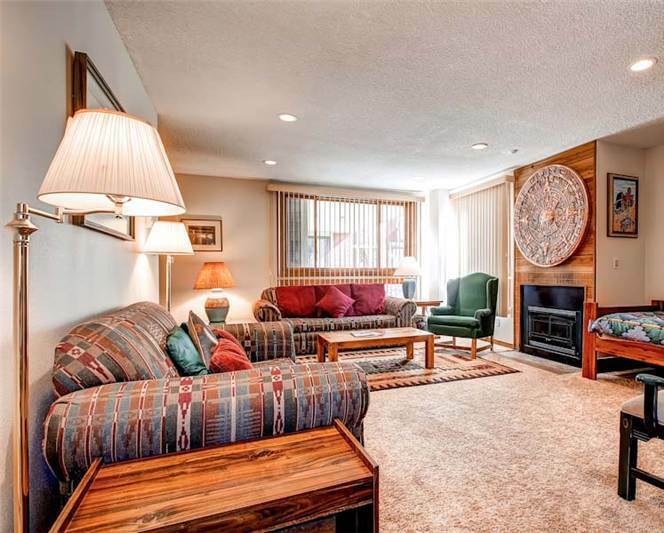 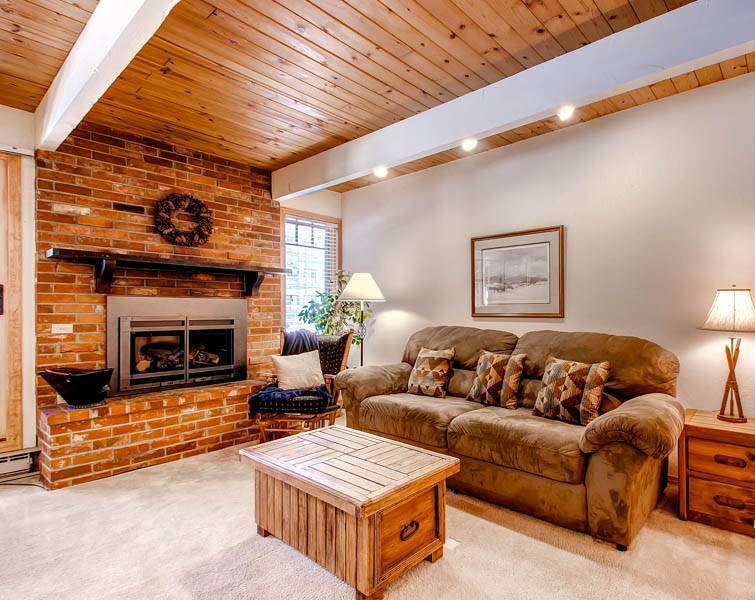 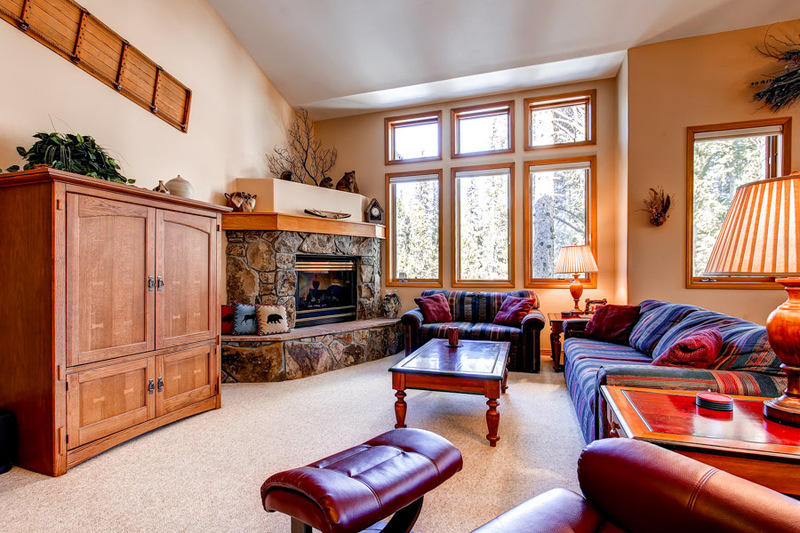 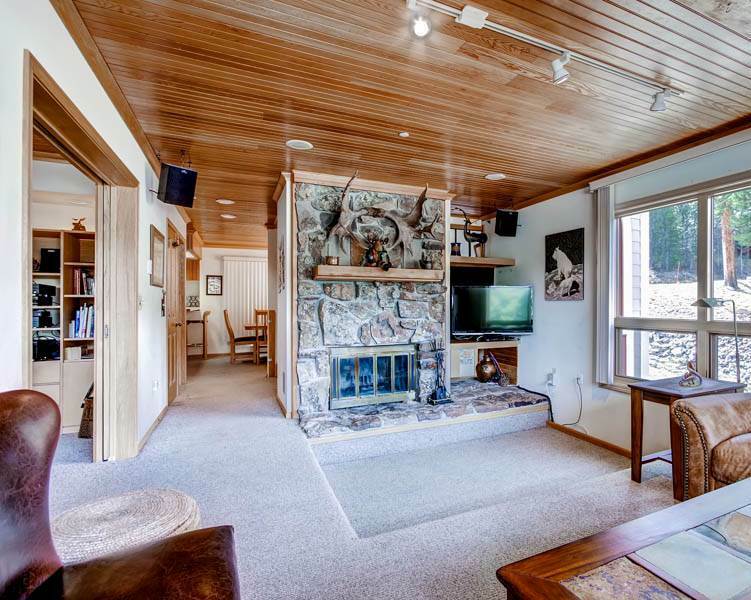 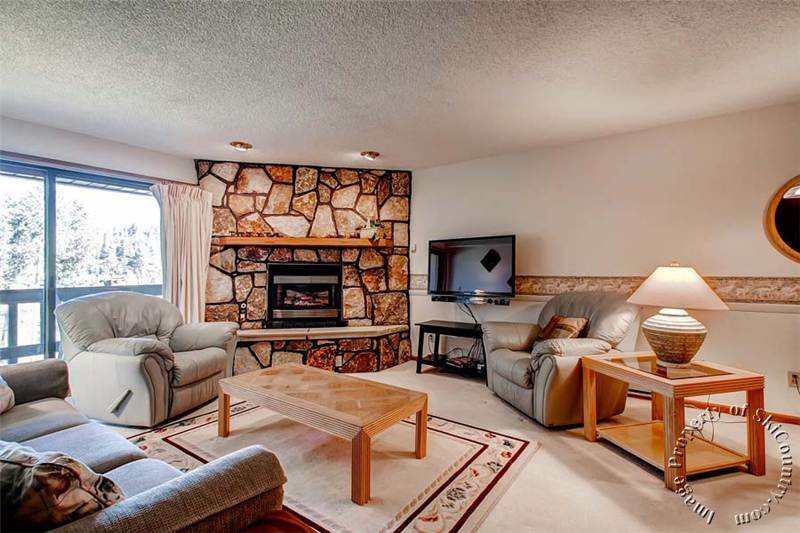 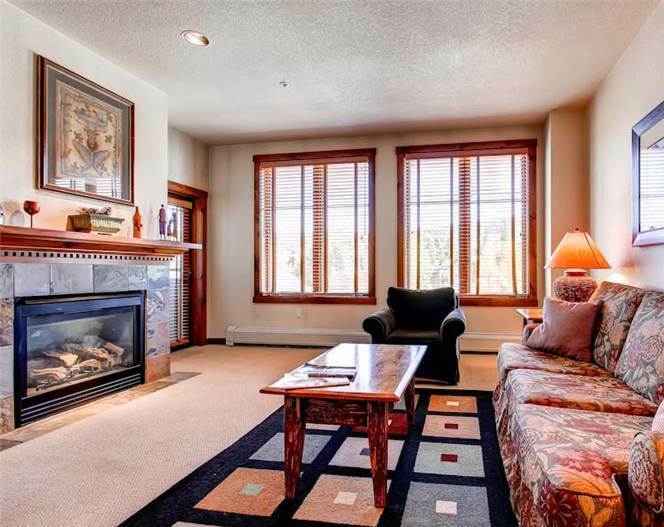 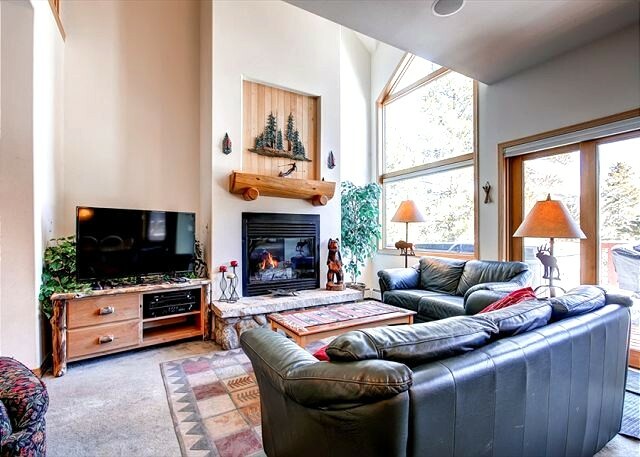 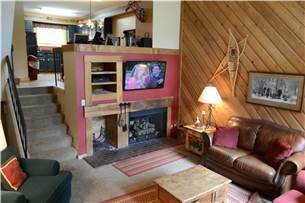 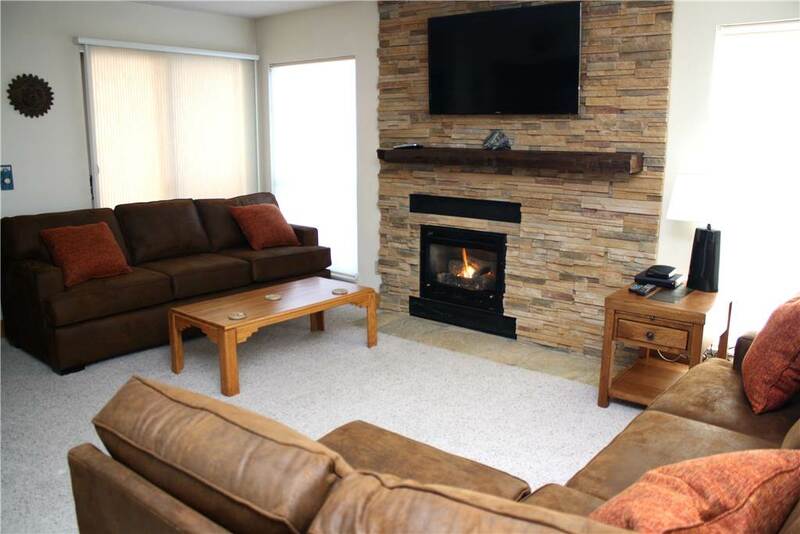 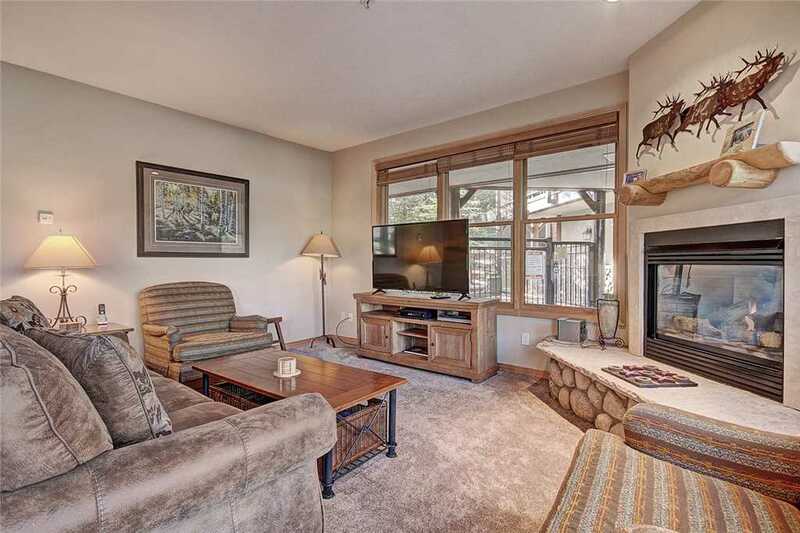 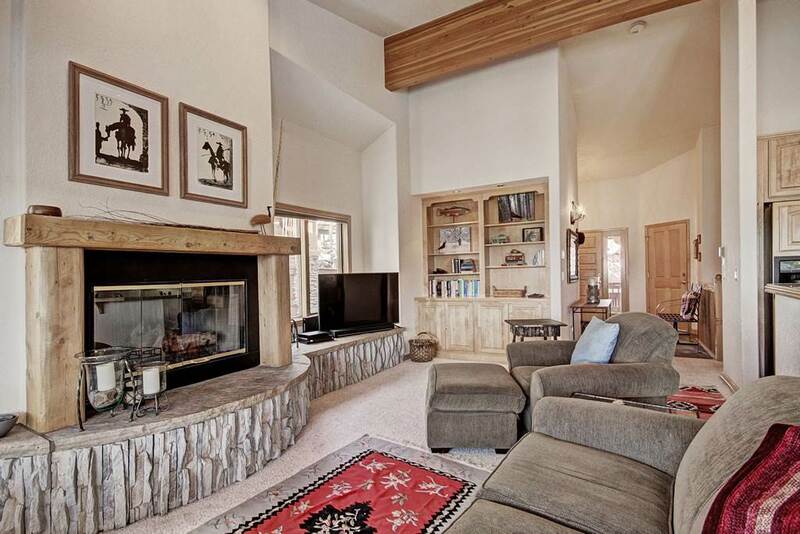 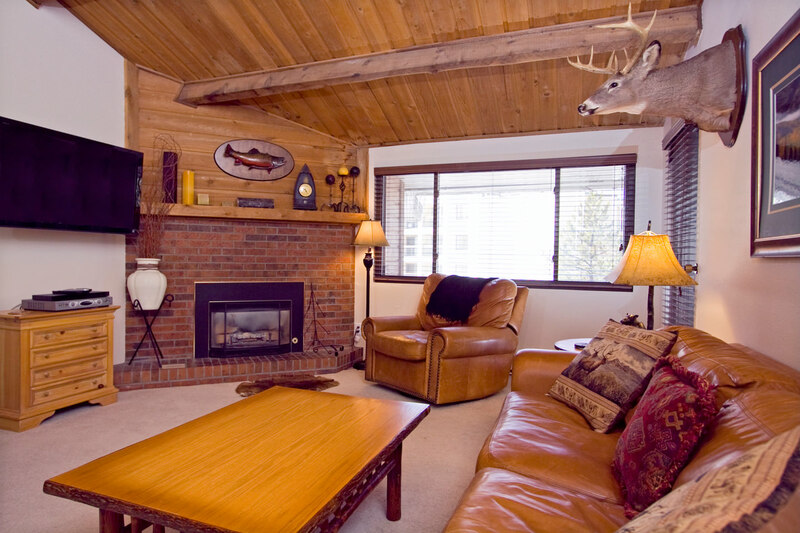 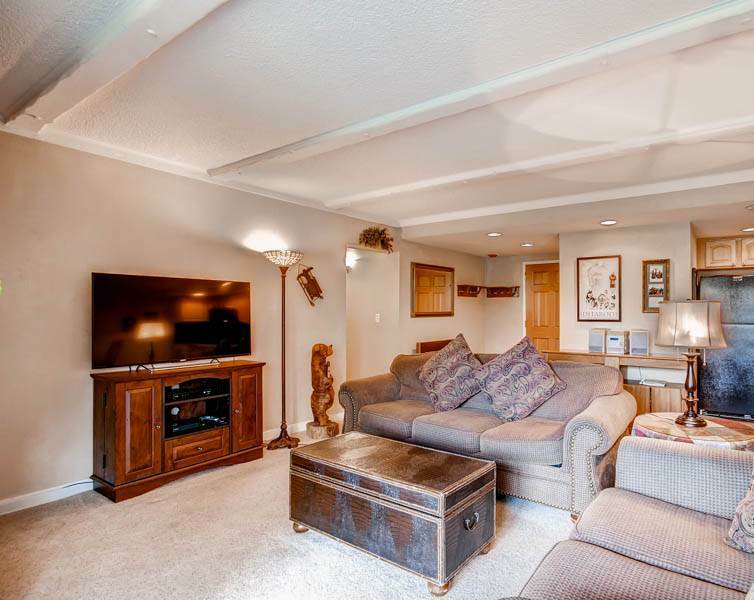 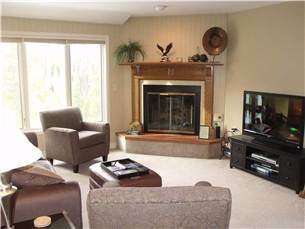 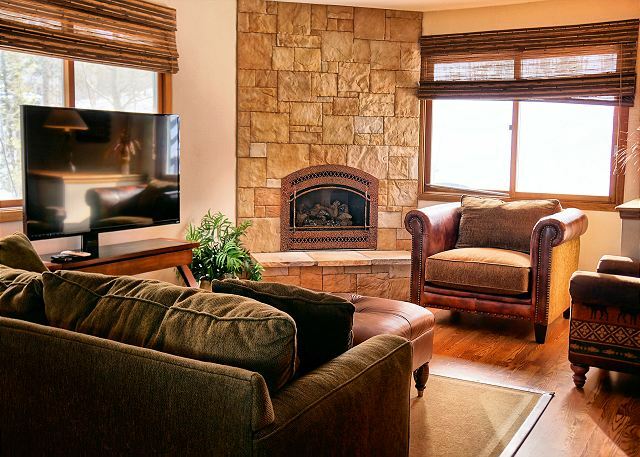 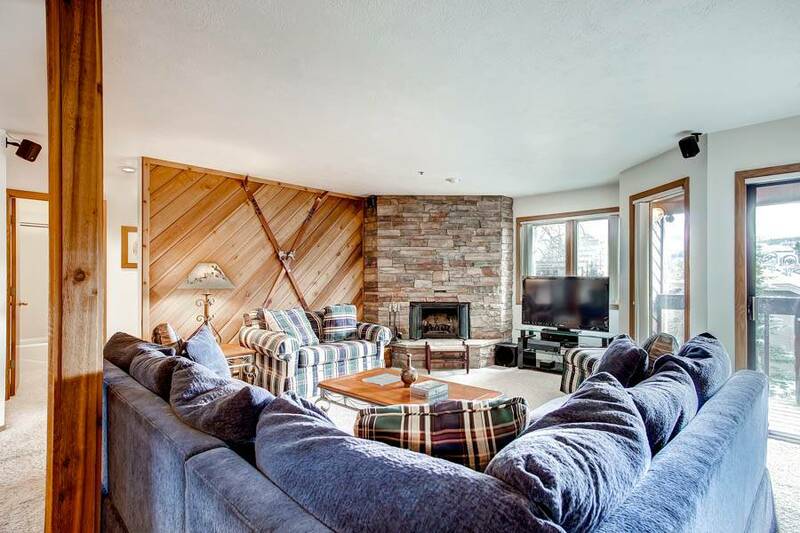 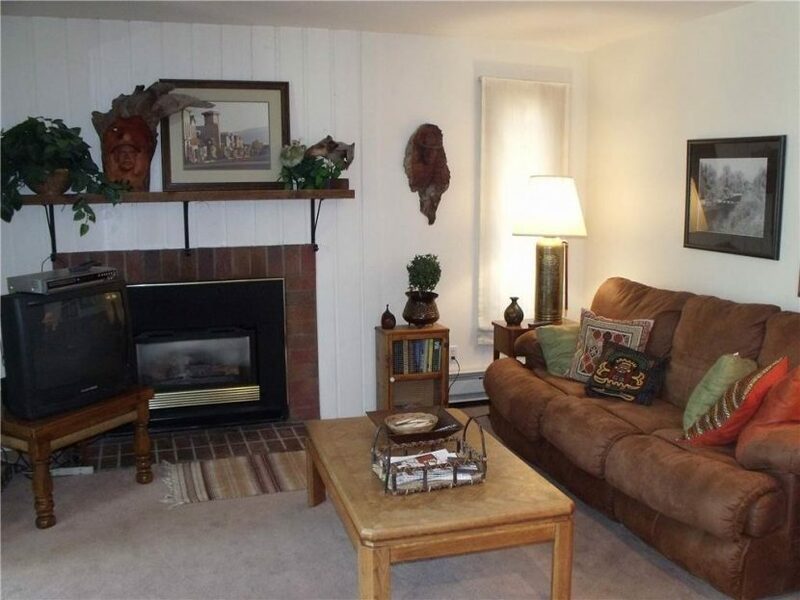 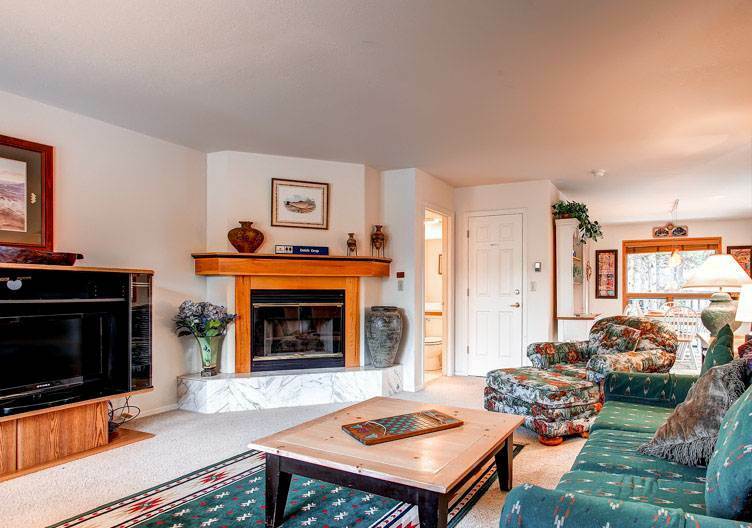 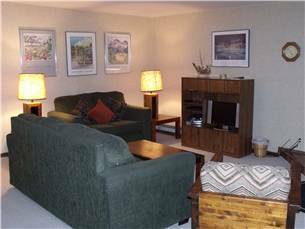 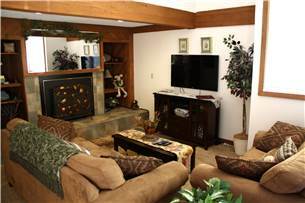 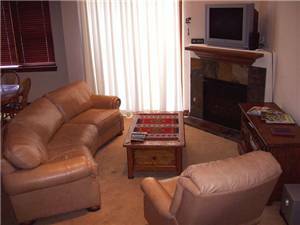 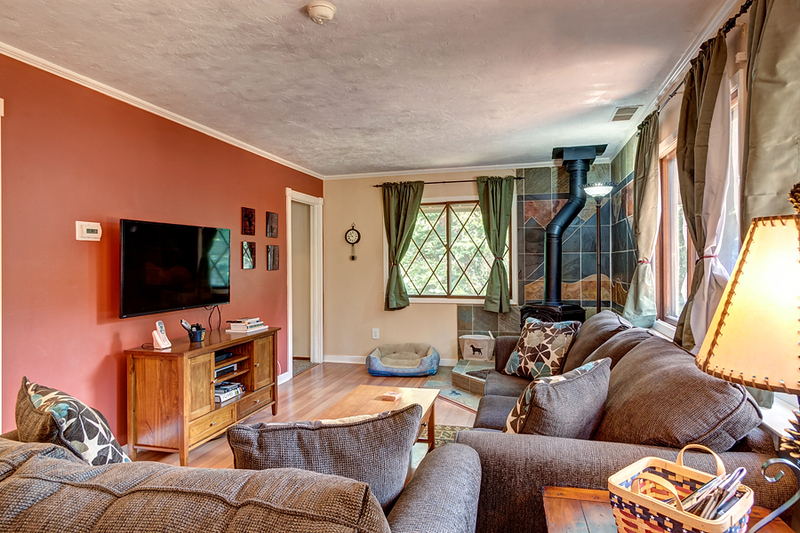 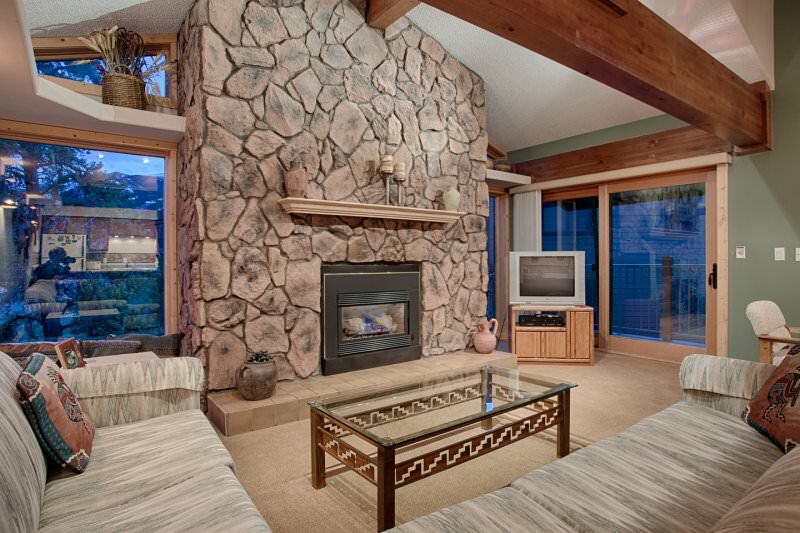 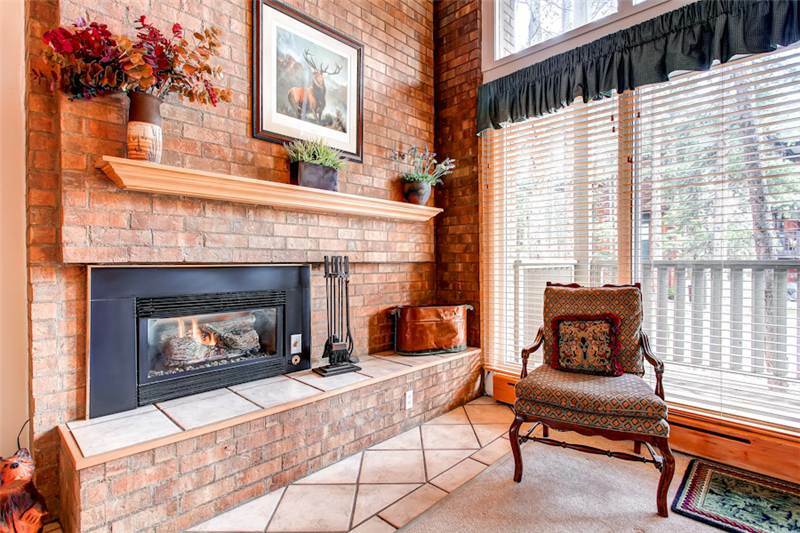 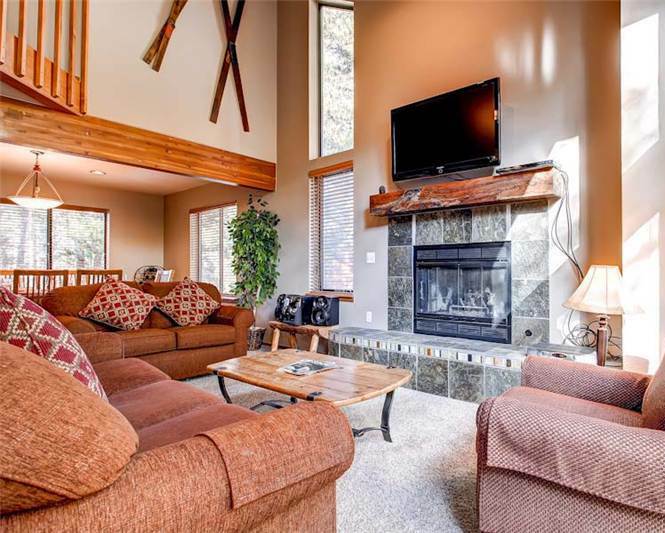 Relax in the living room on the leather couches watching tv together on the flat screen and warming up by the gas fireplace. 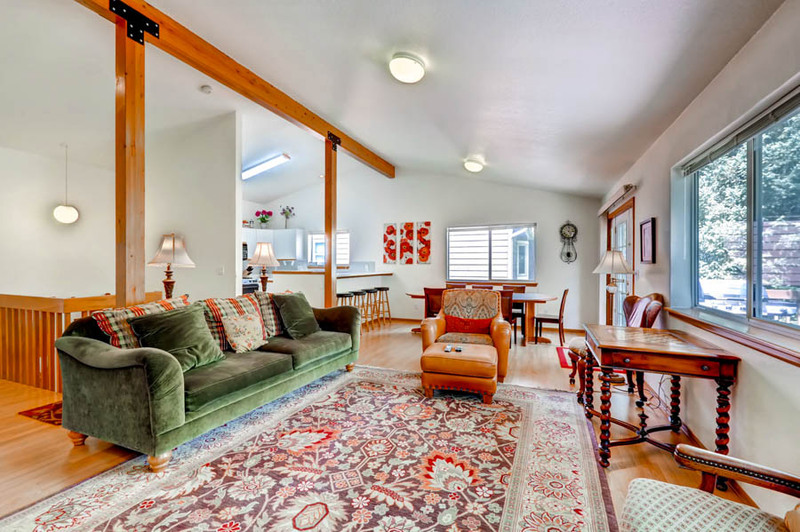 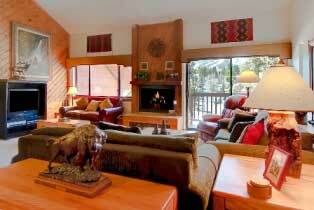 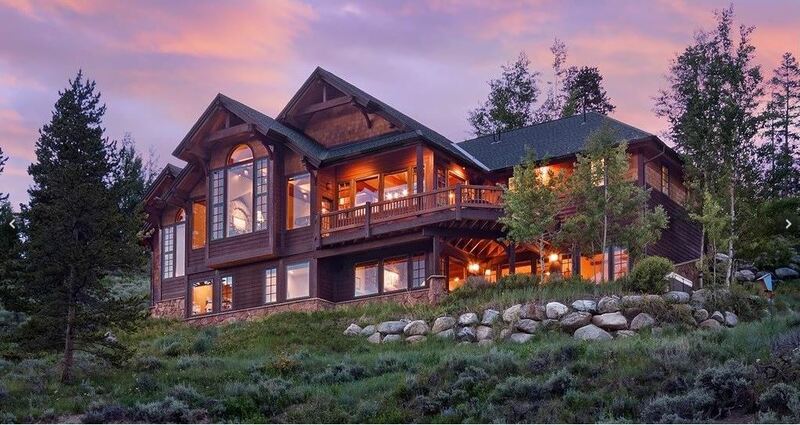 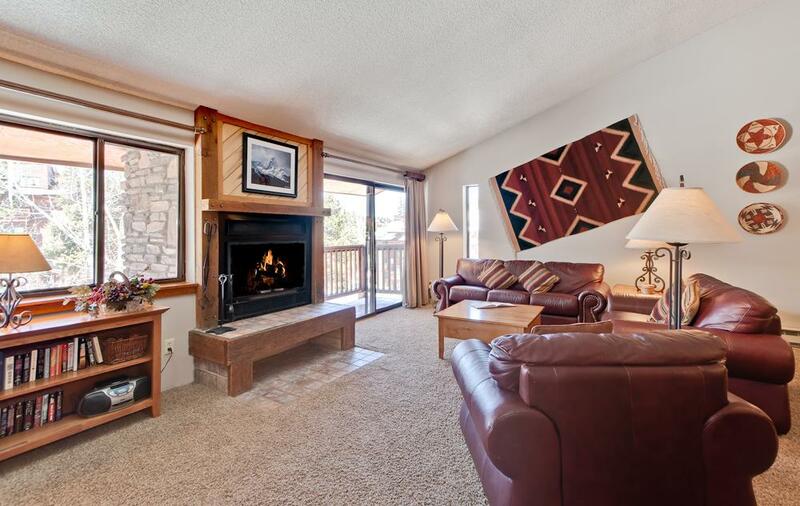 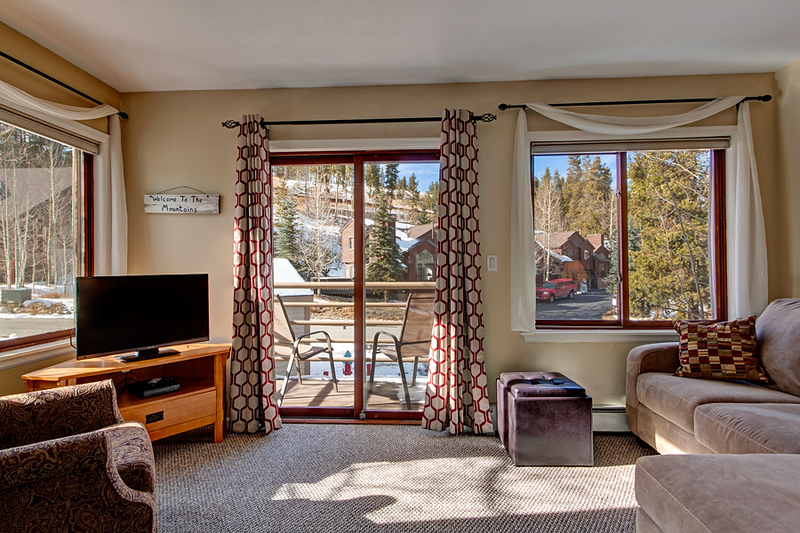 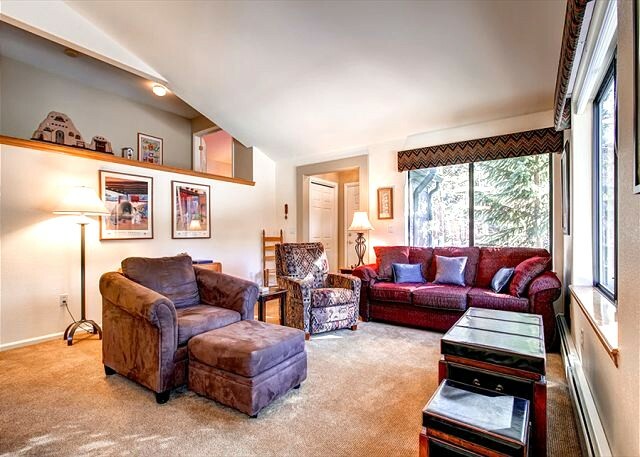 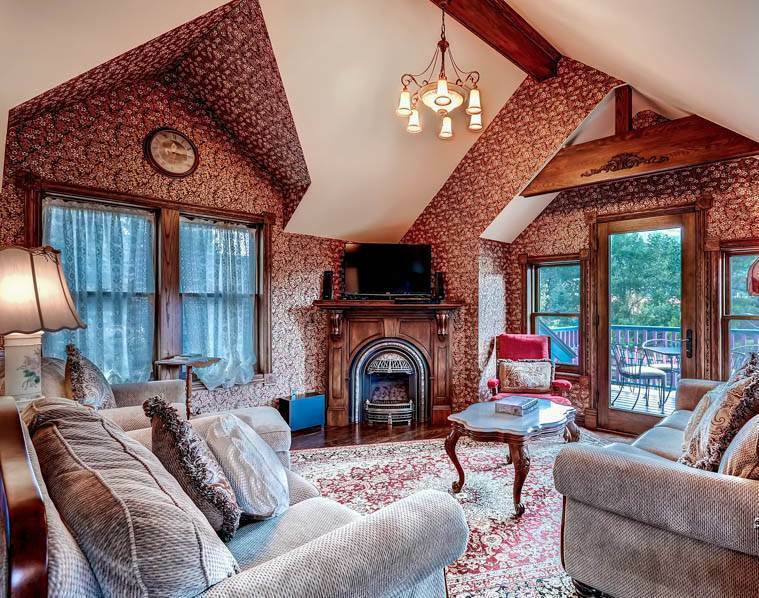 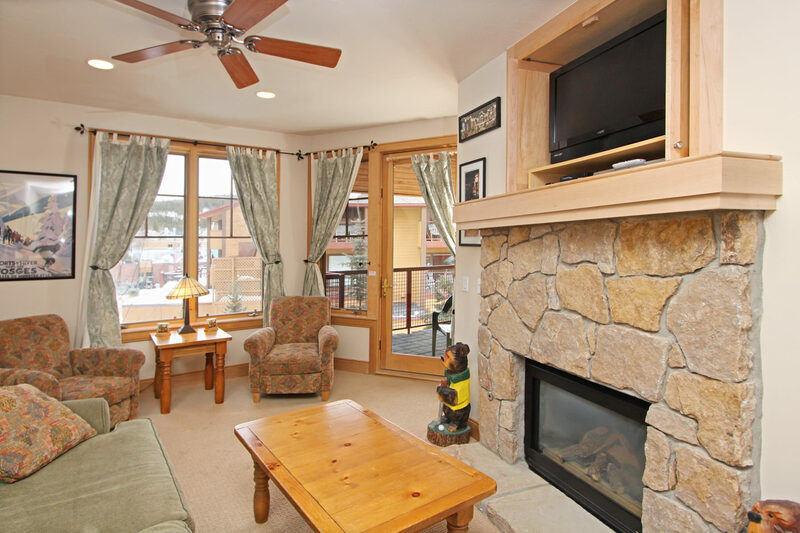 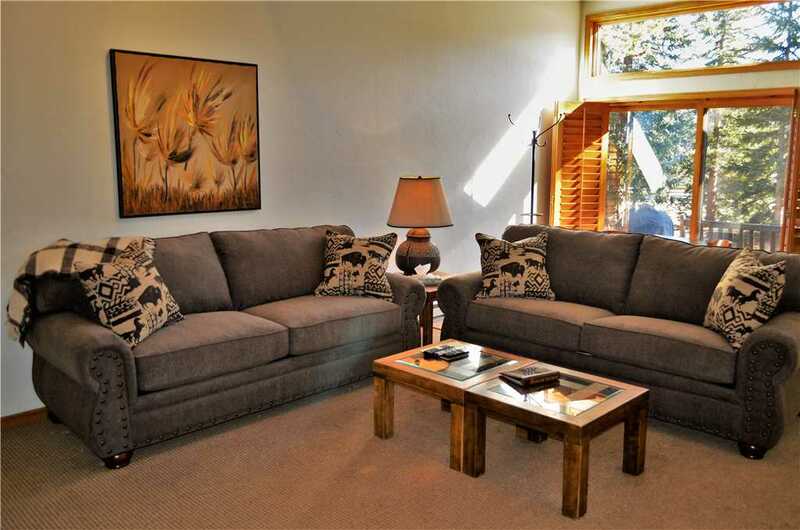 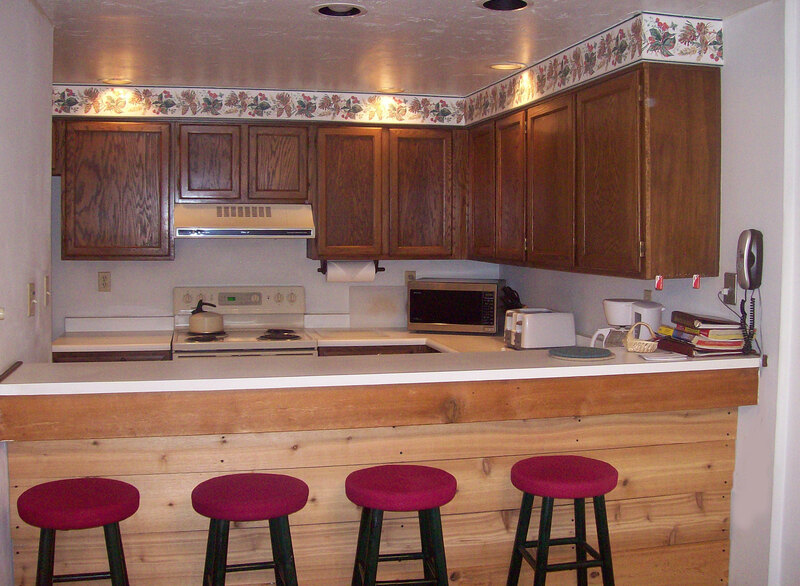 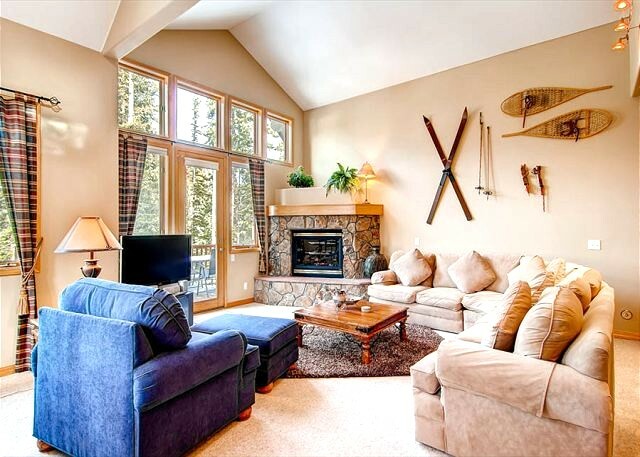 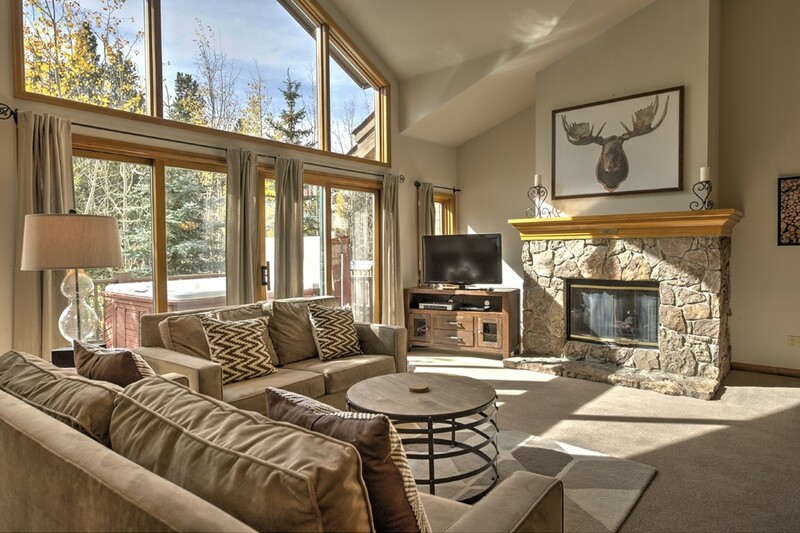 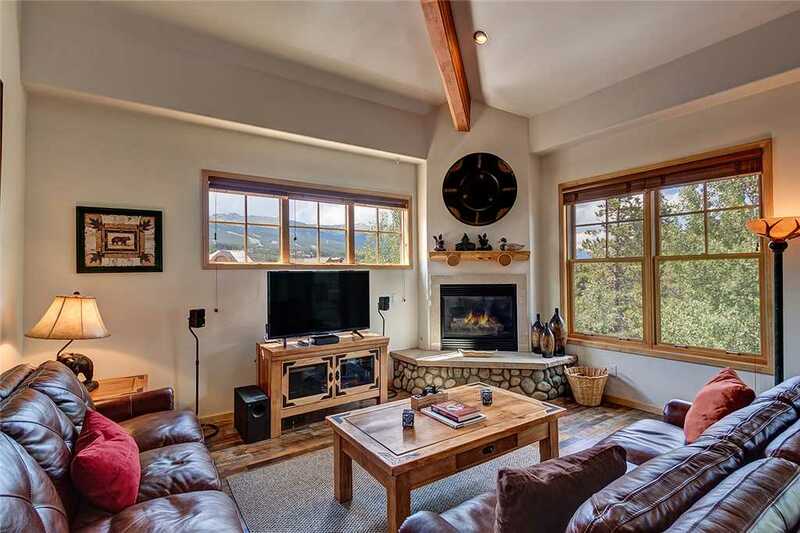 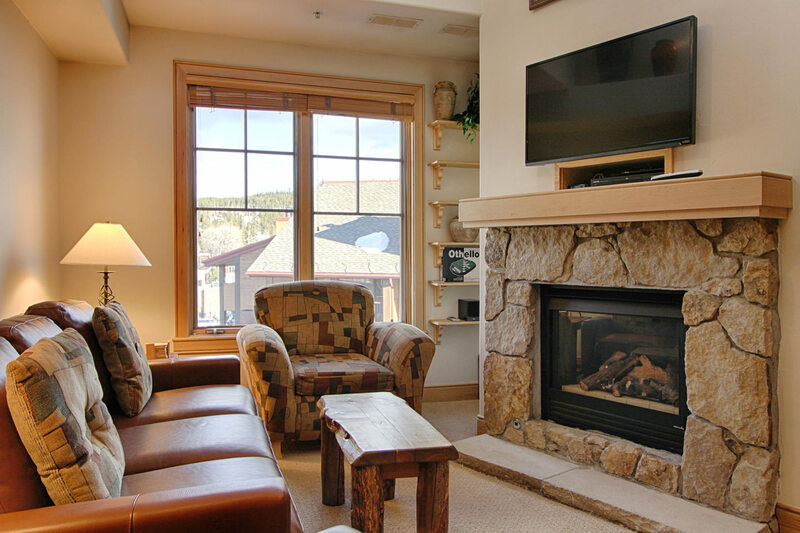 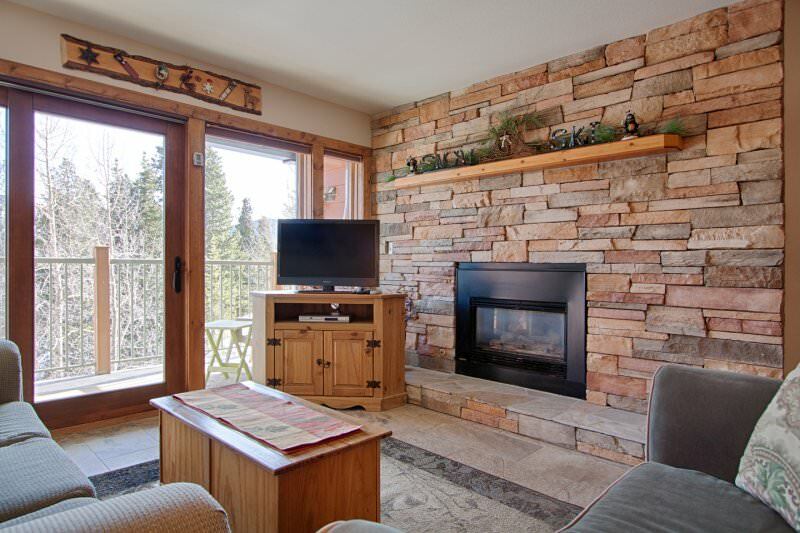 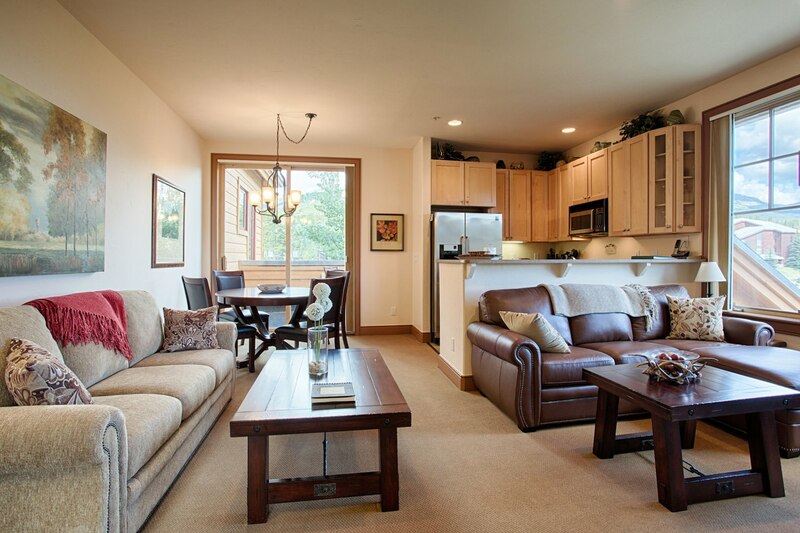 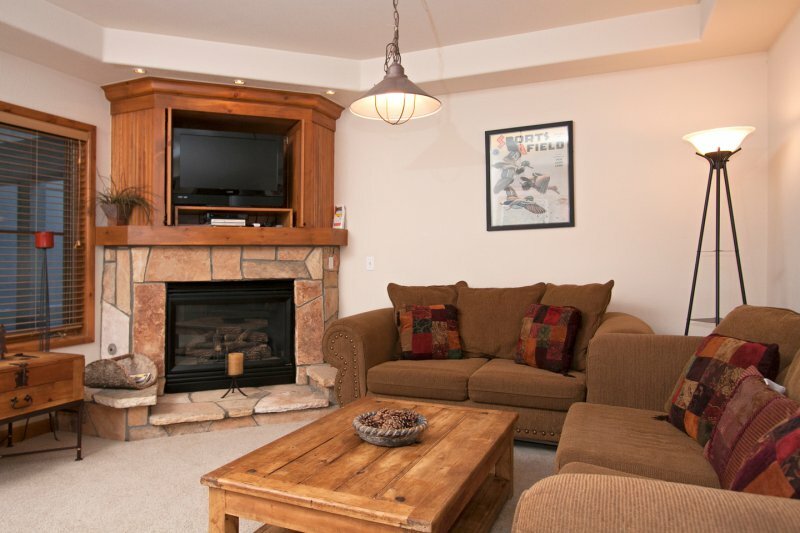 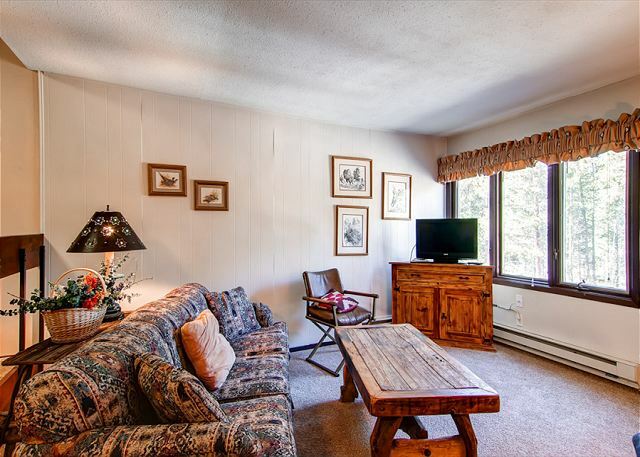 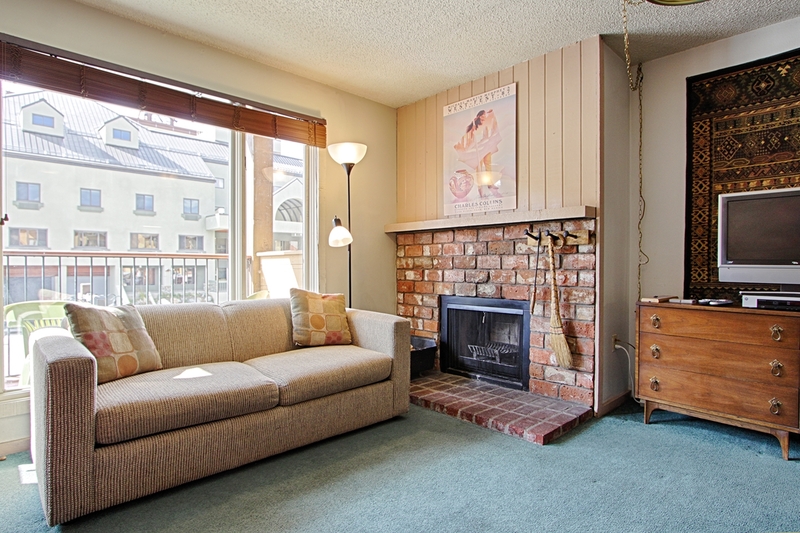 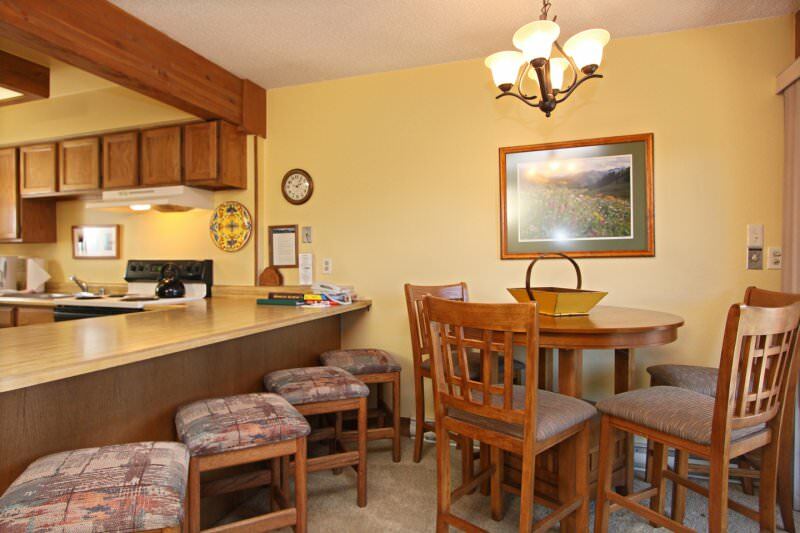 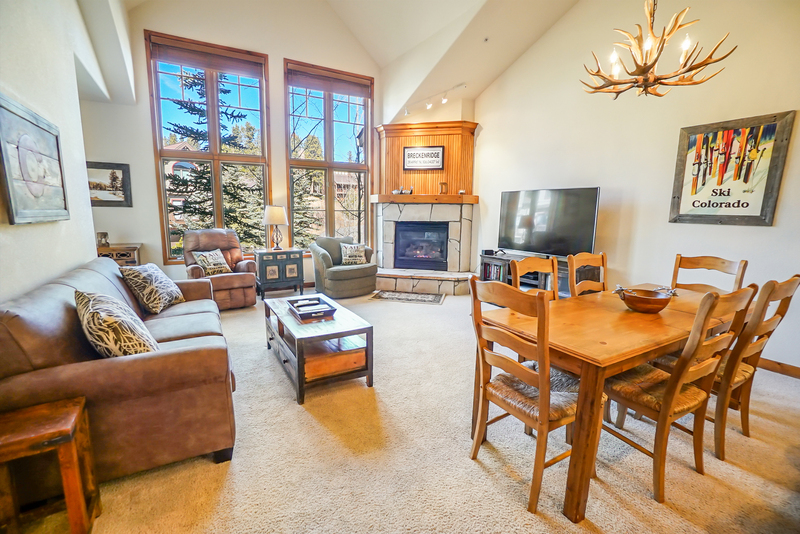 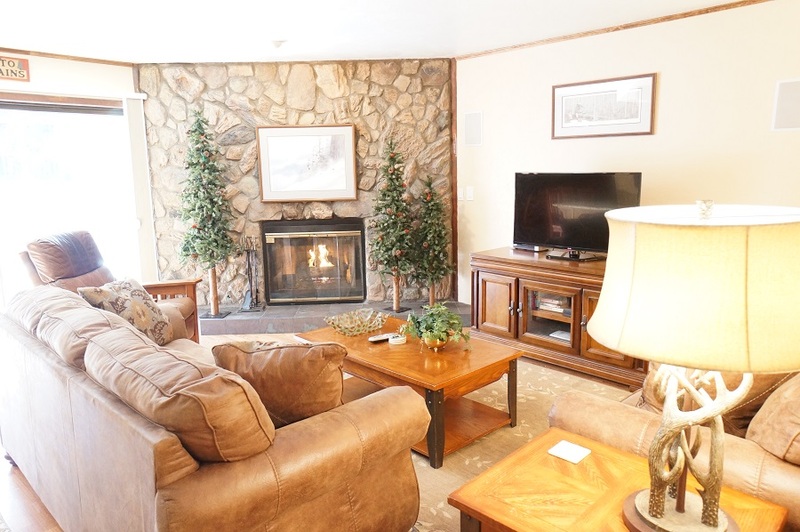 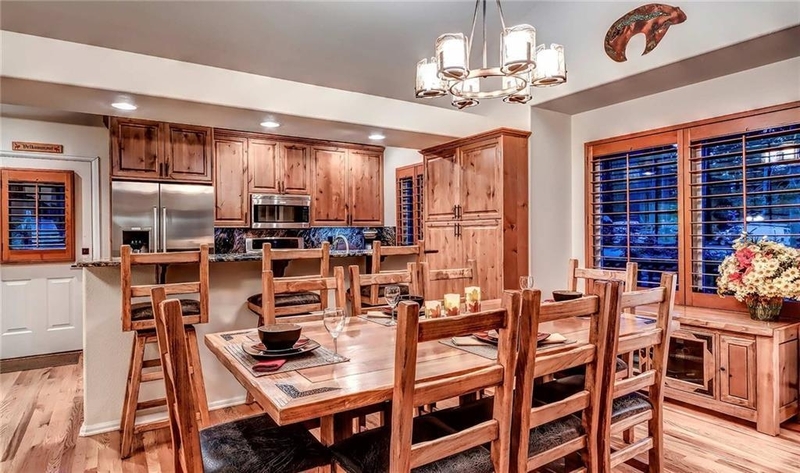 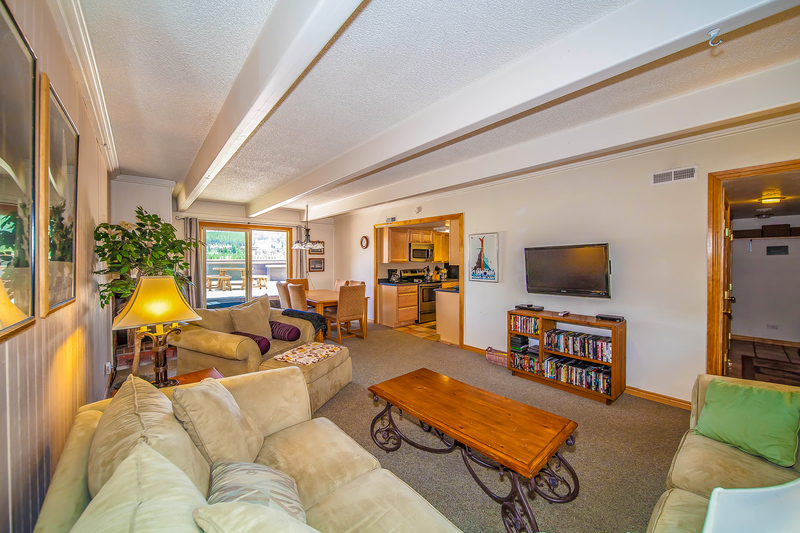 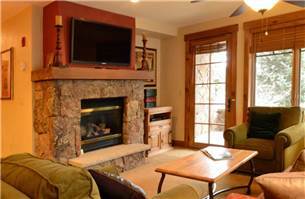 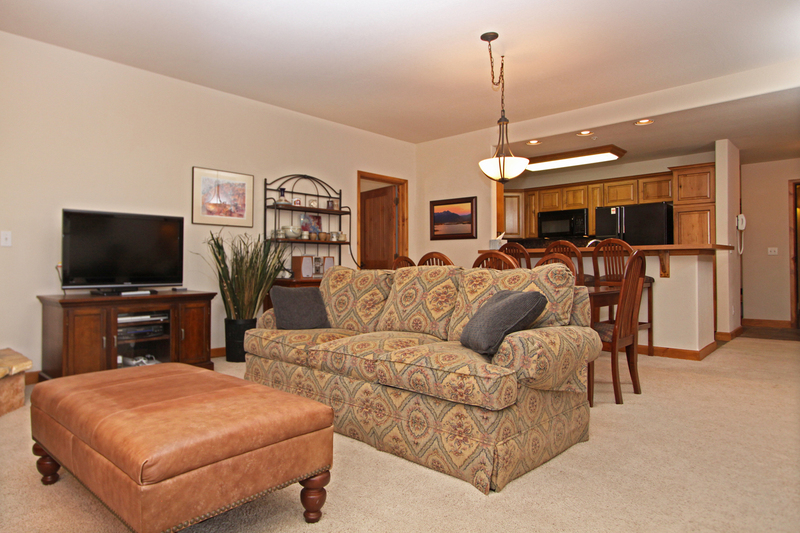 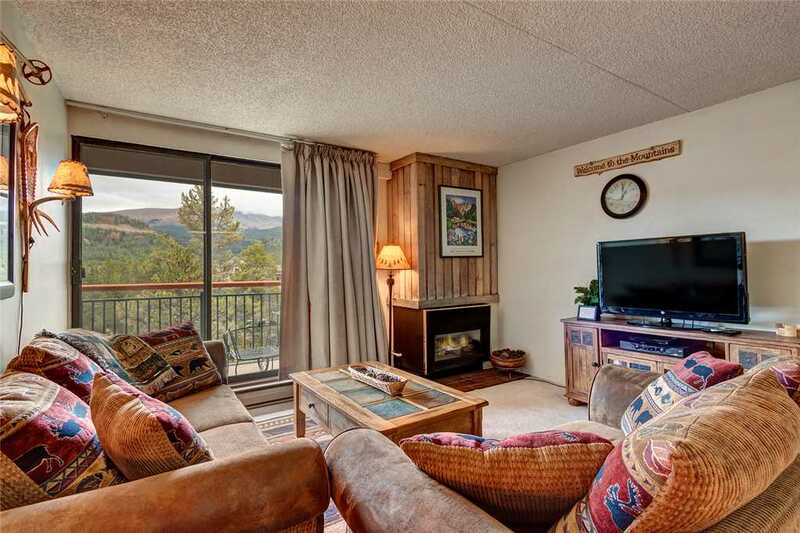 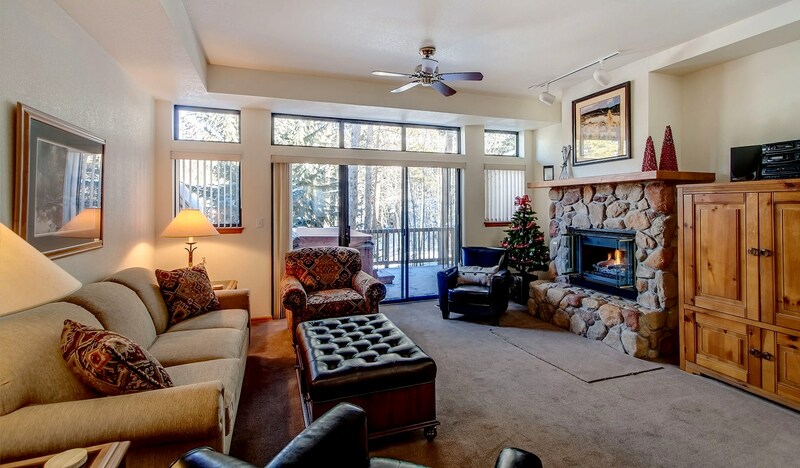 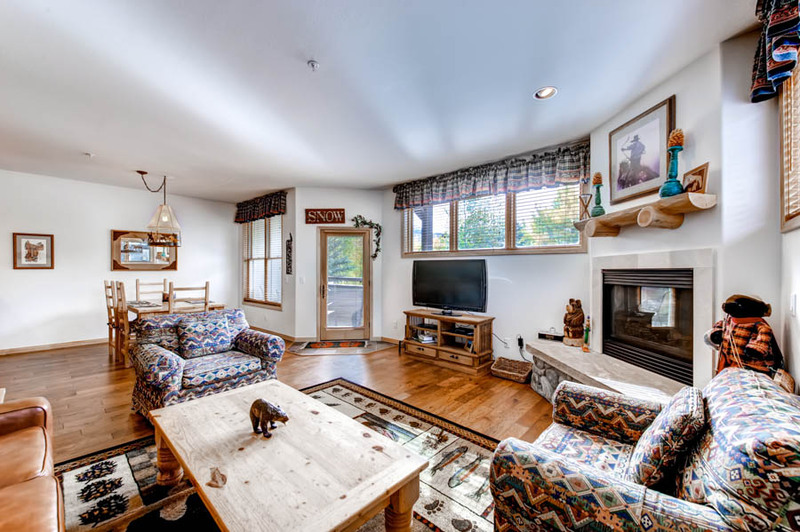 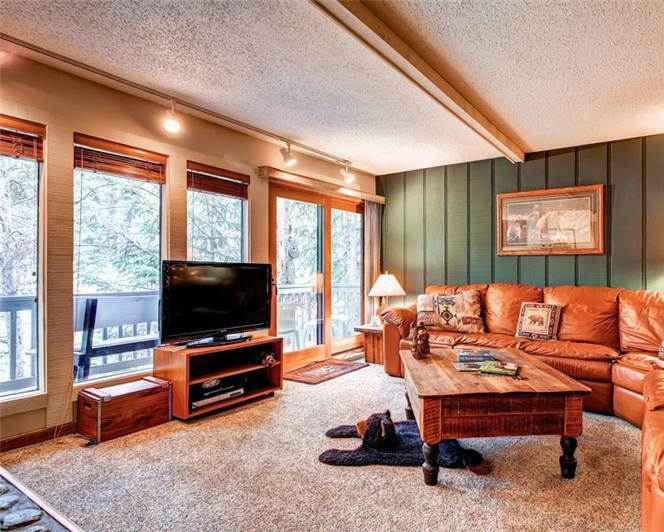 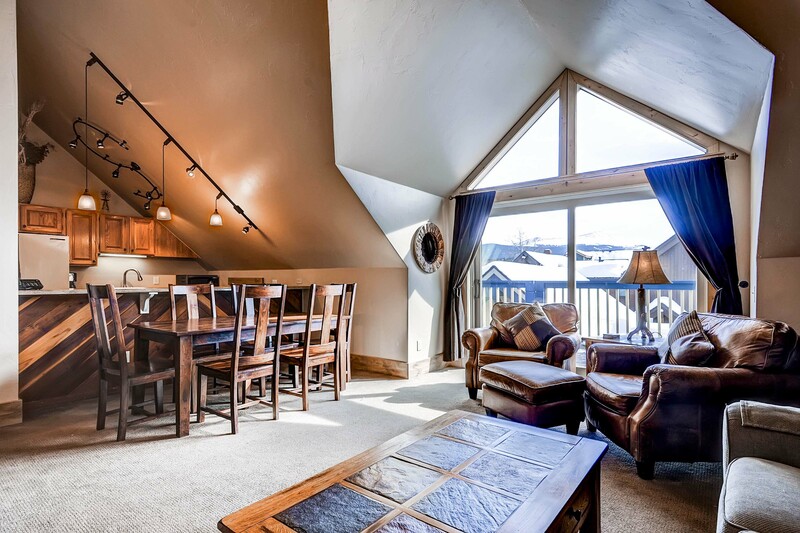 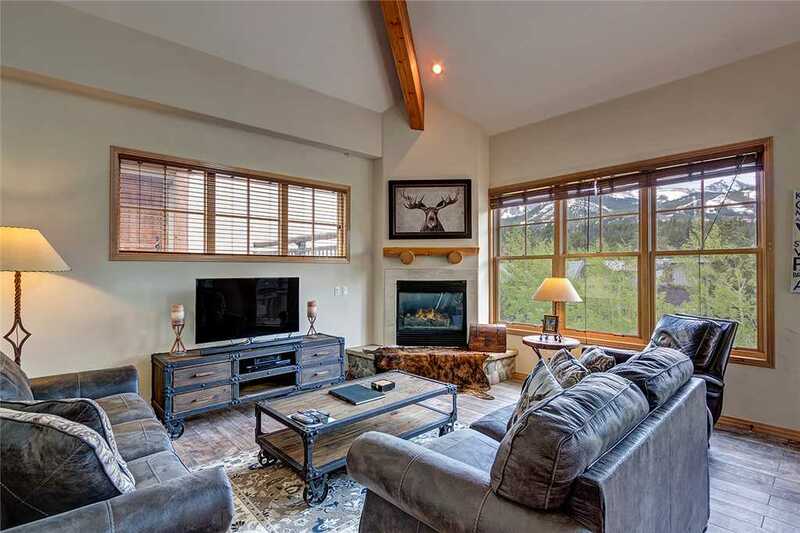 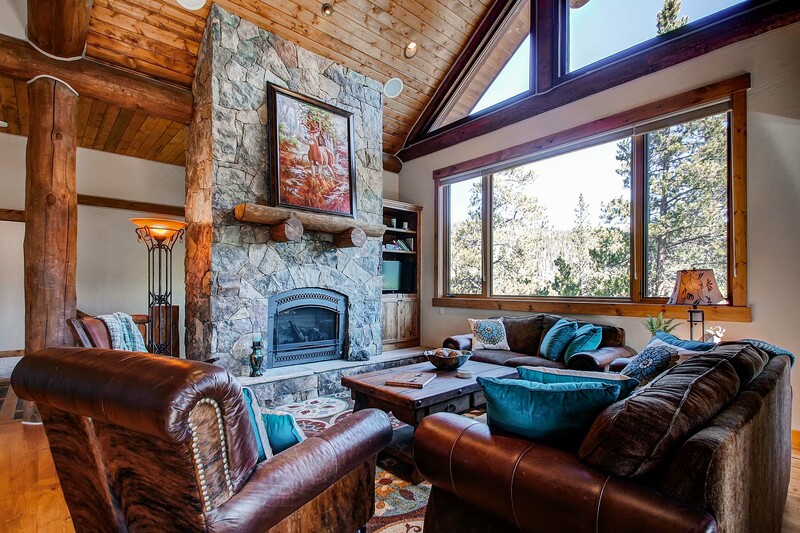 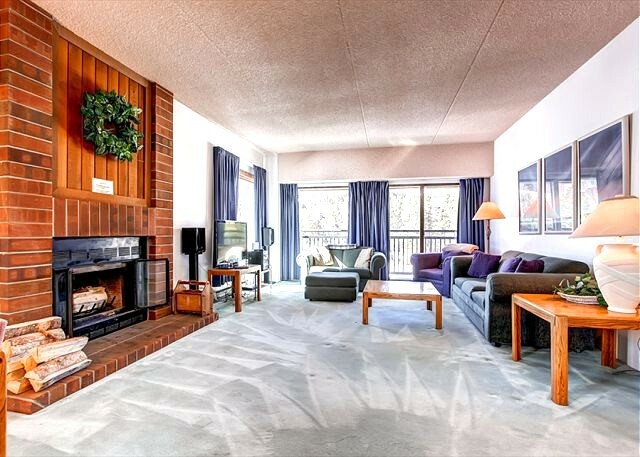 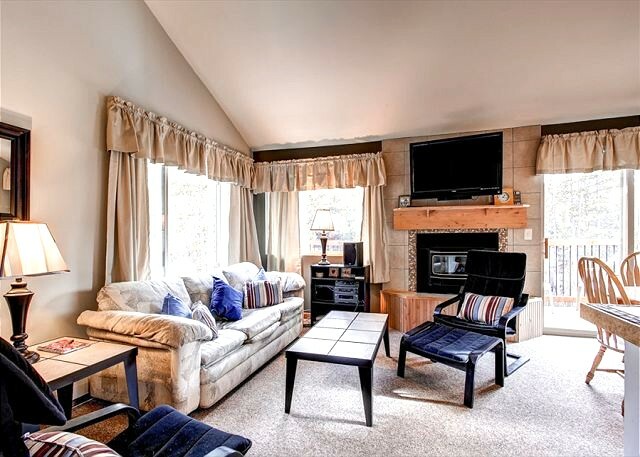 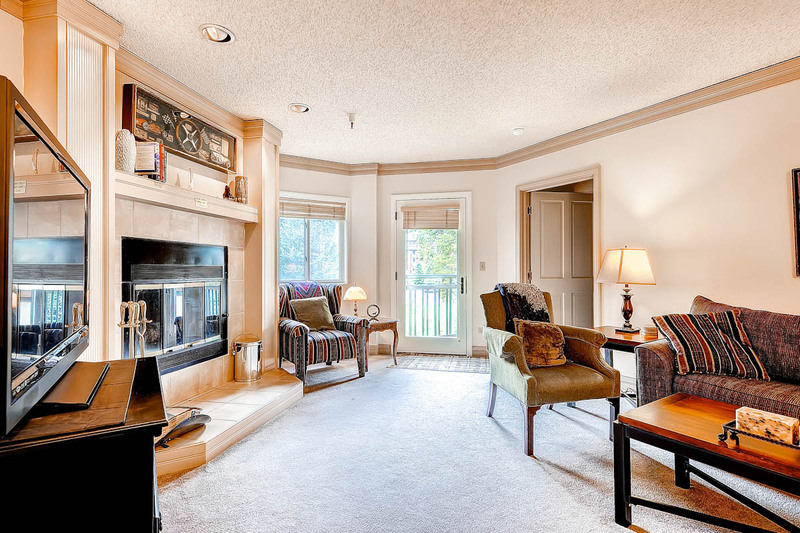 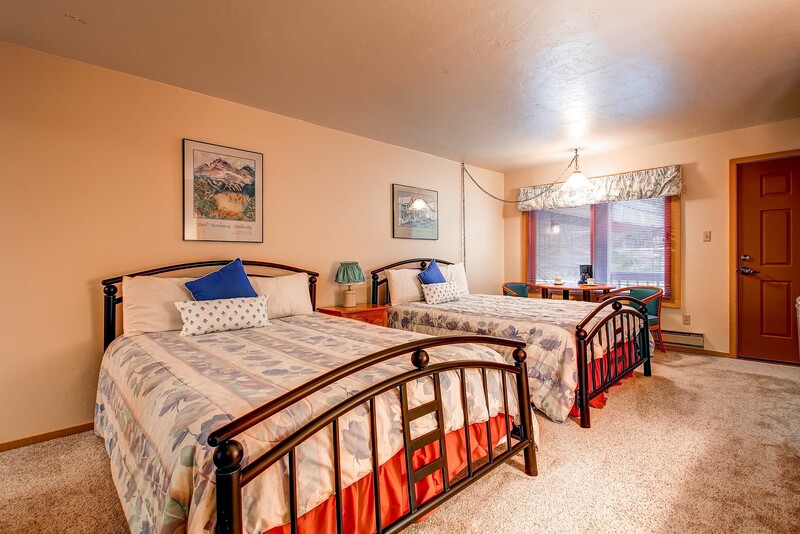 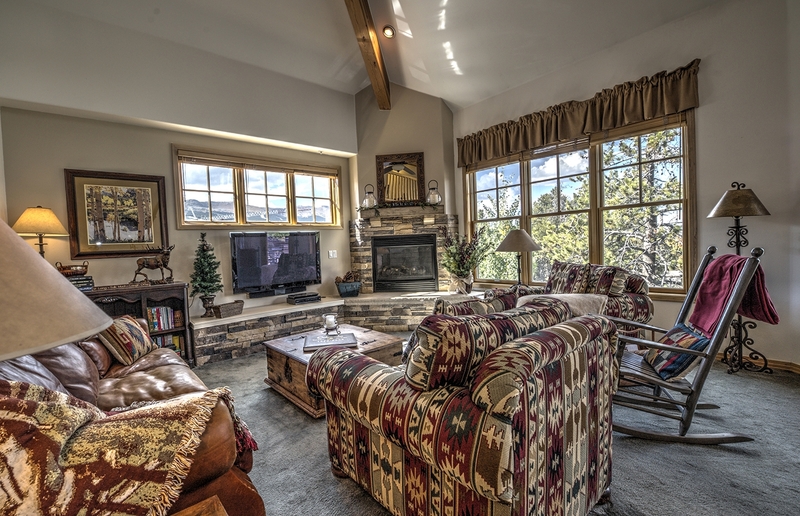 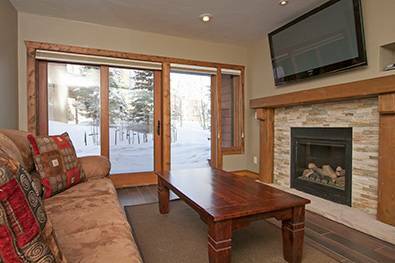 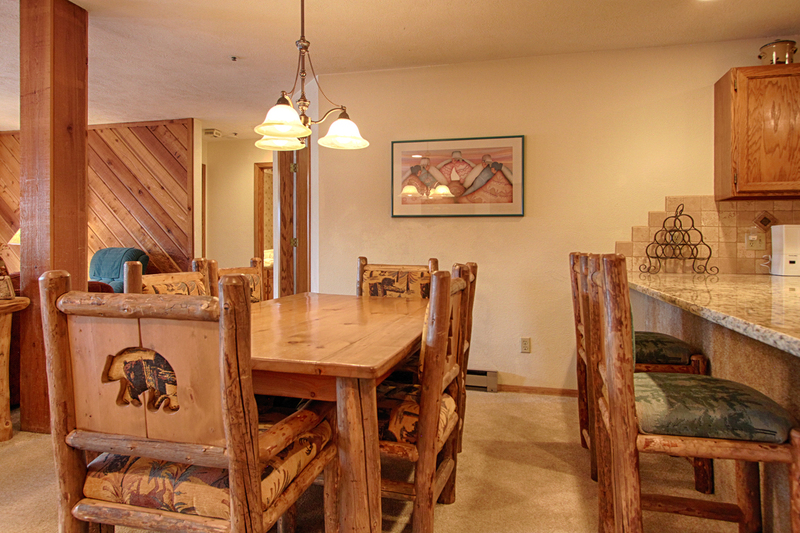 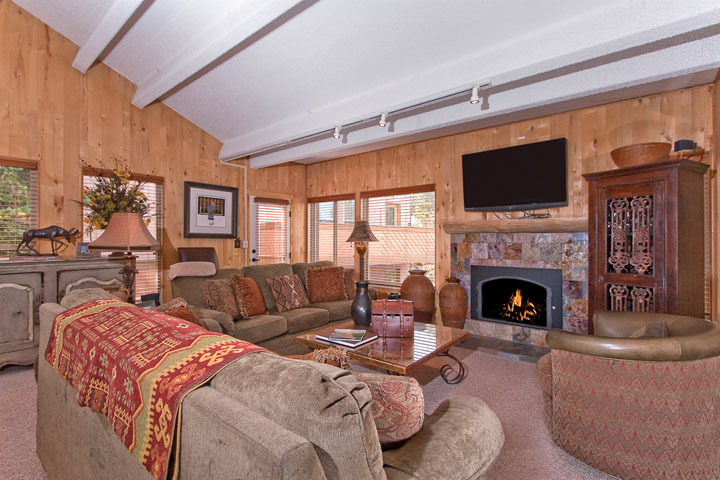 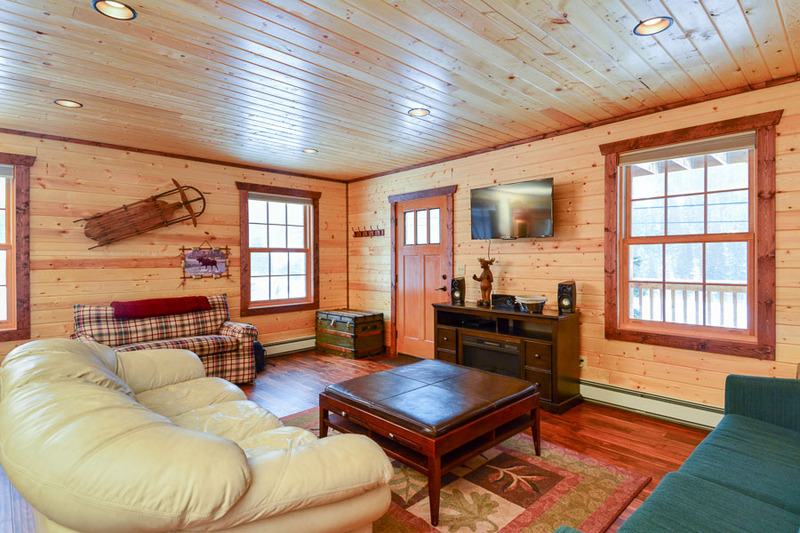 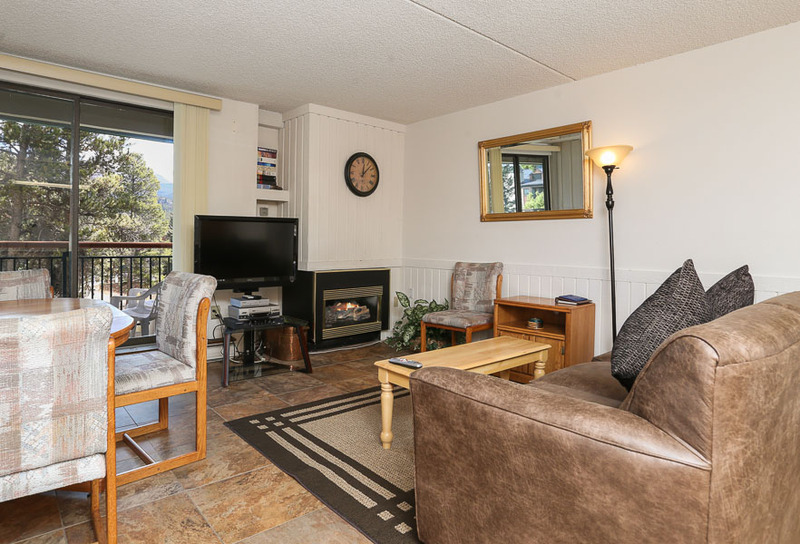 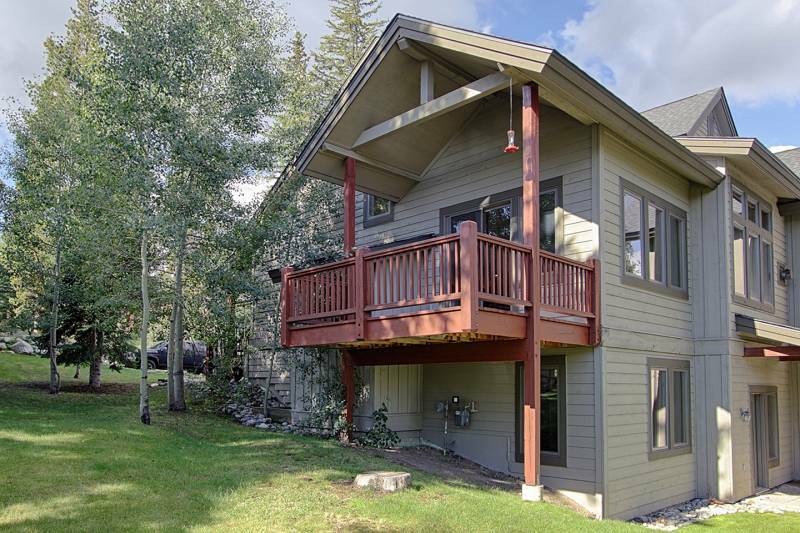 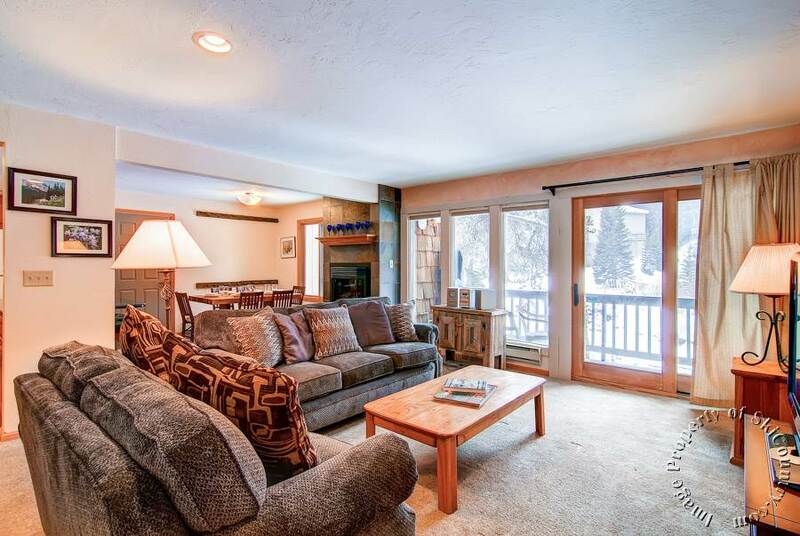 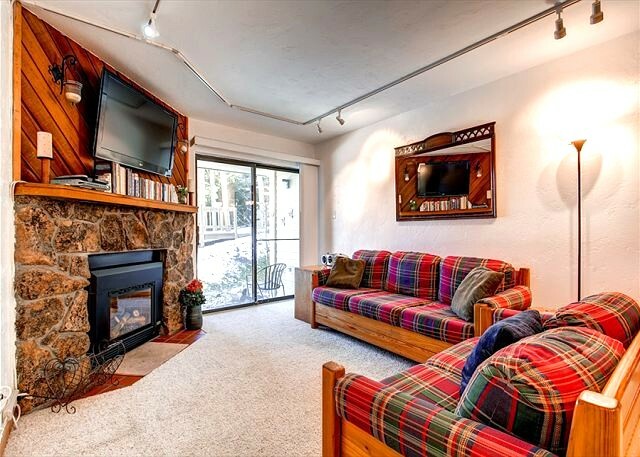 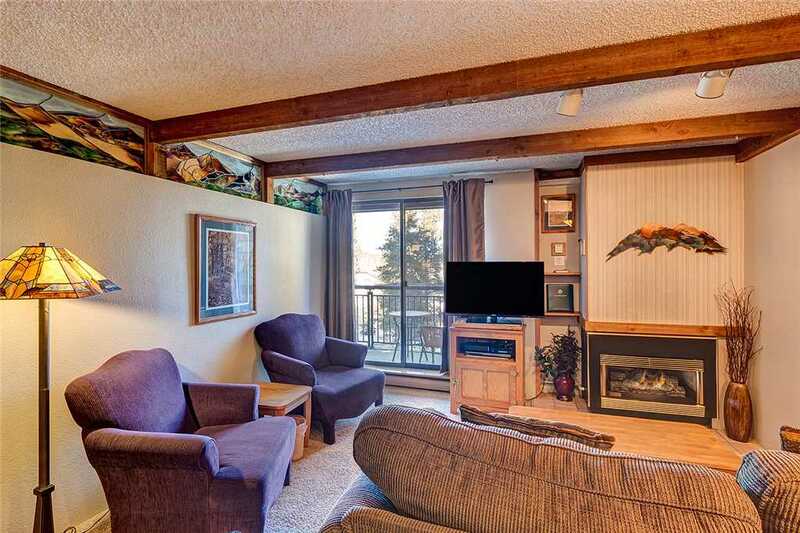 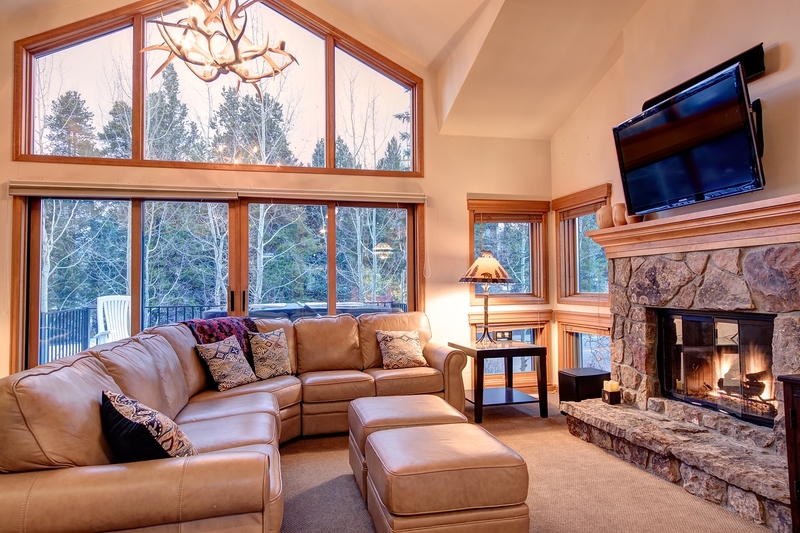 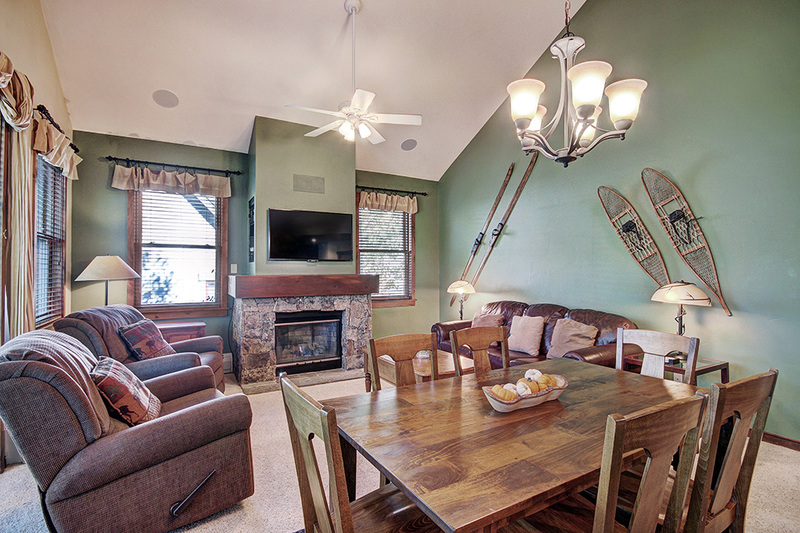 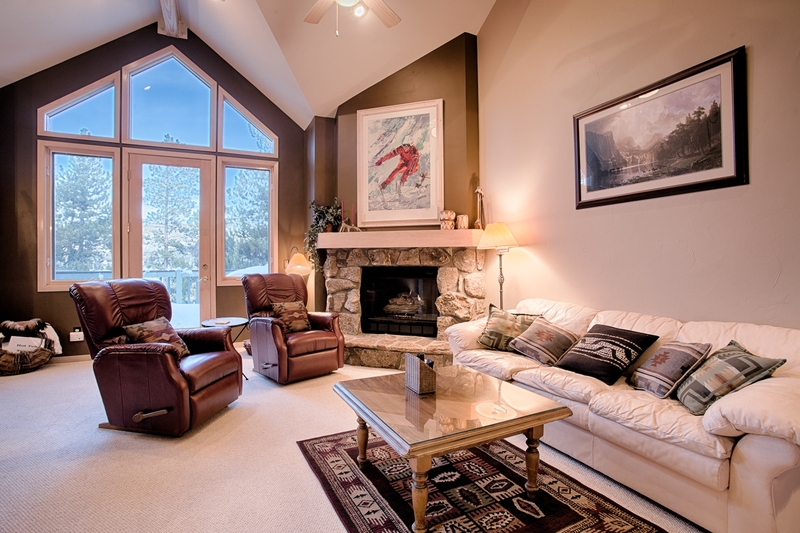 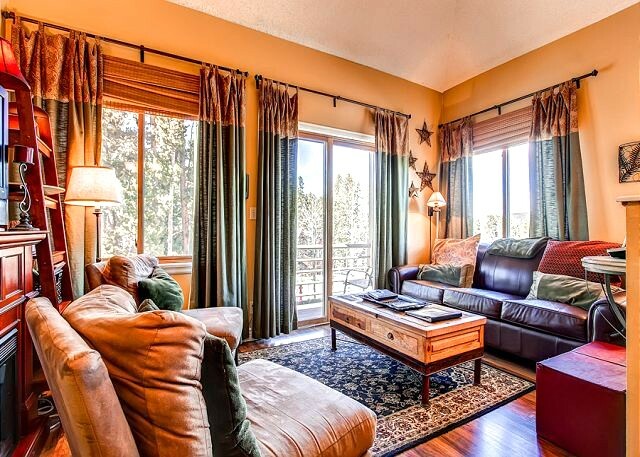 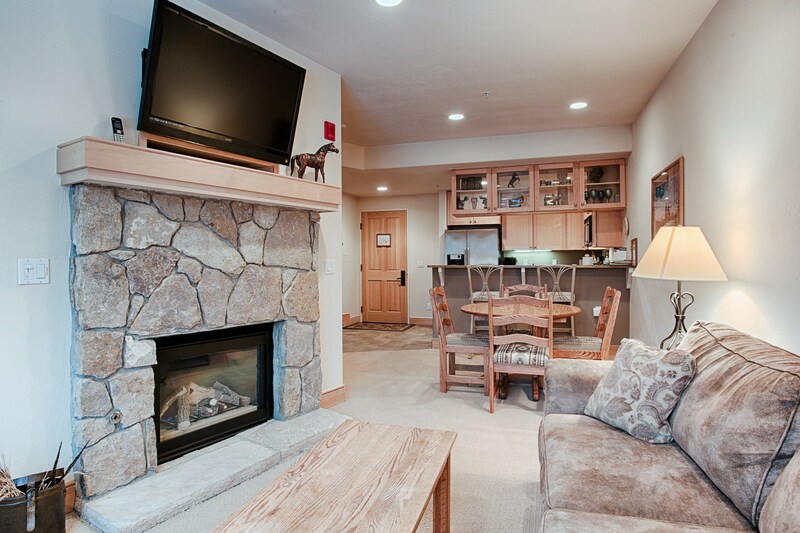 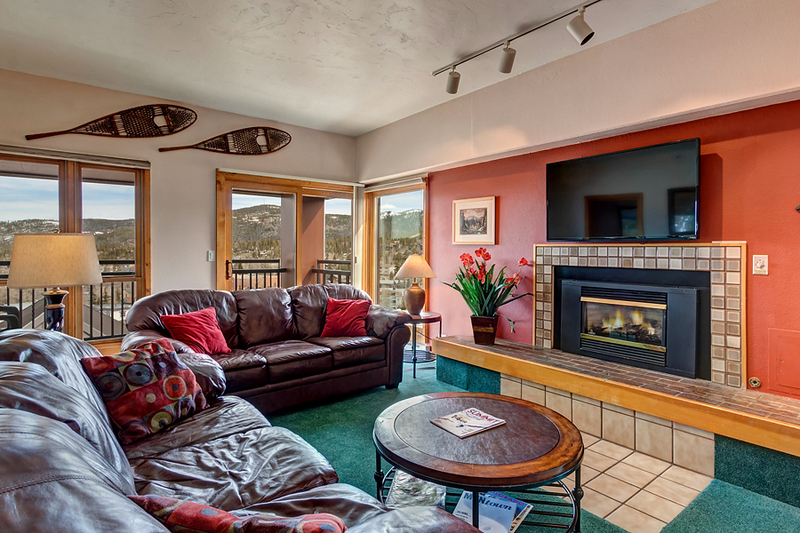 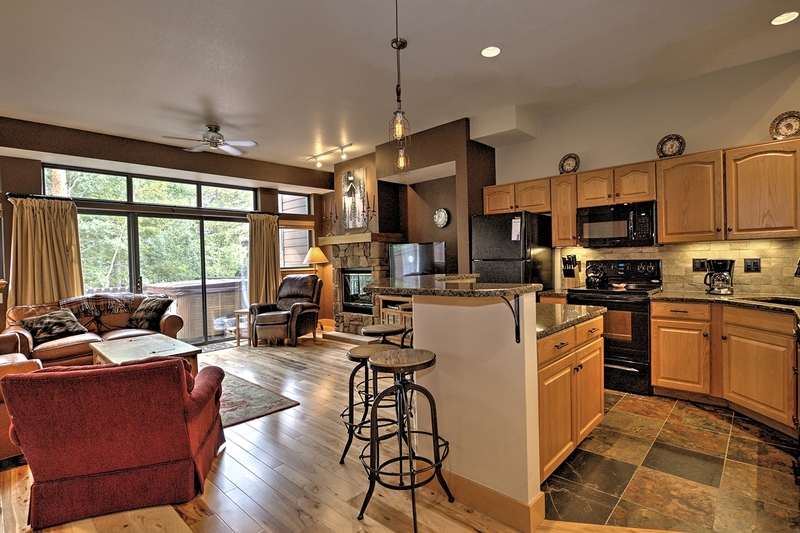 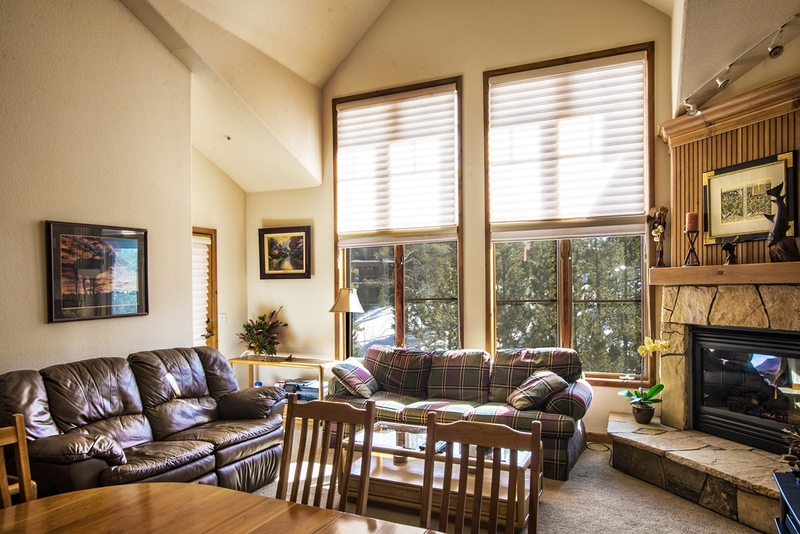 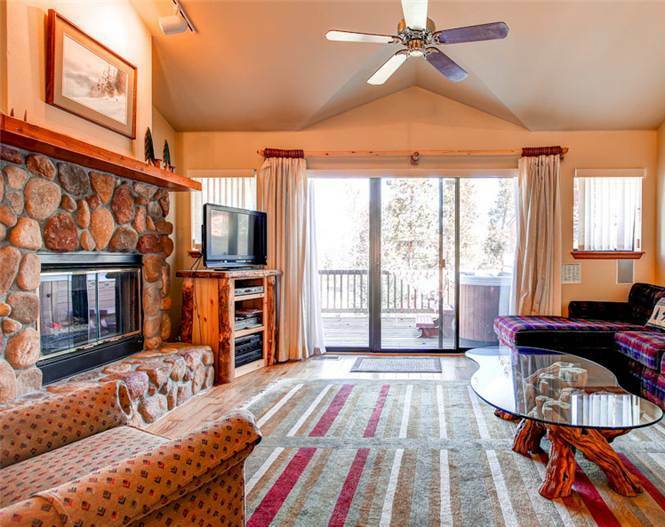 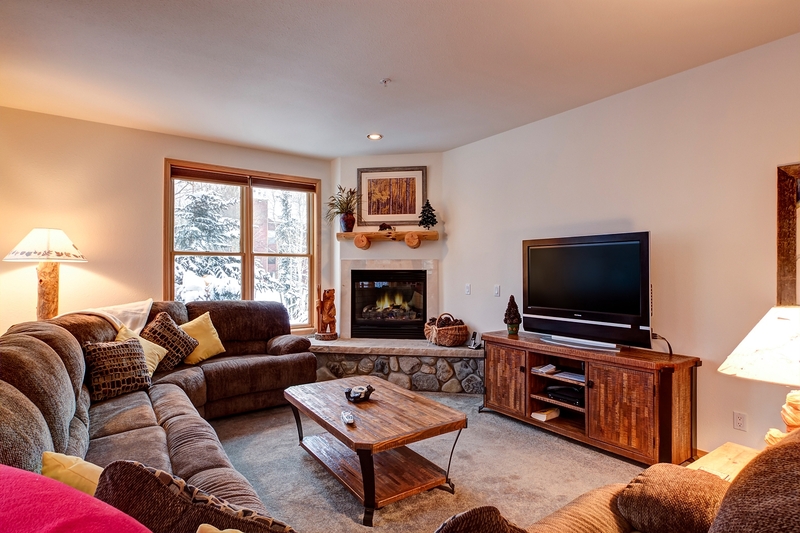 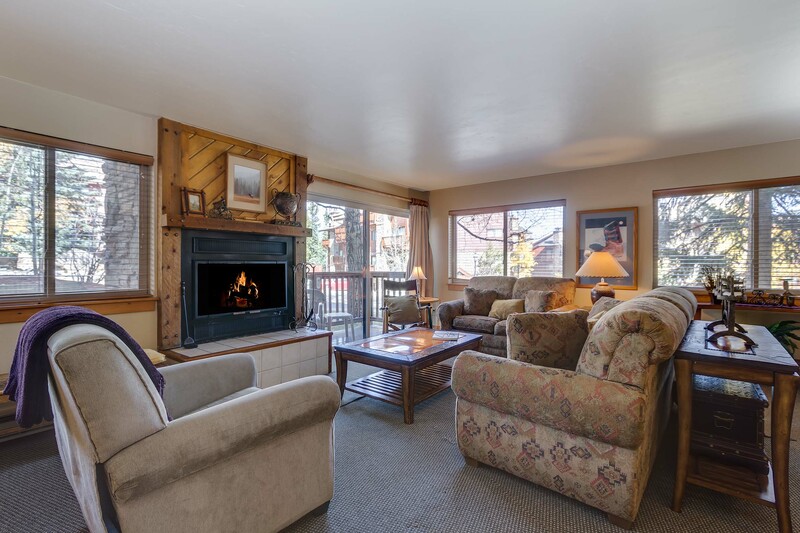 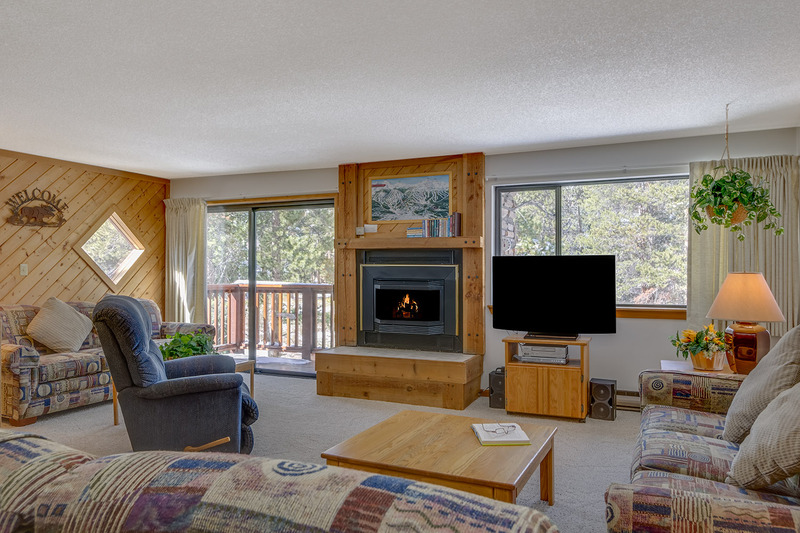 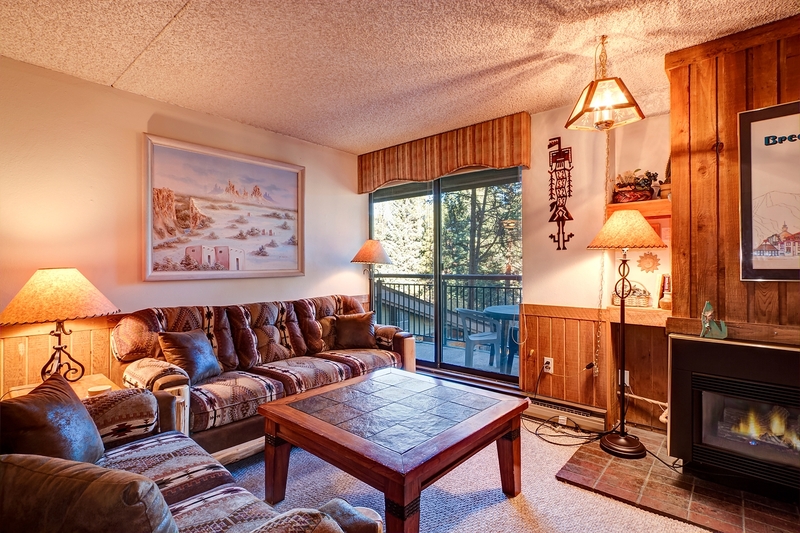 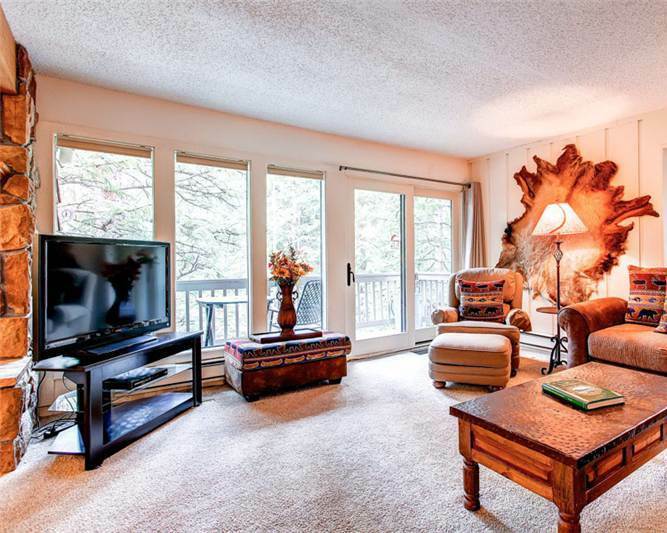 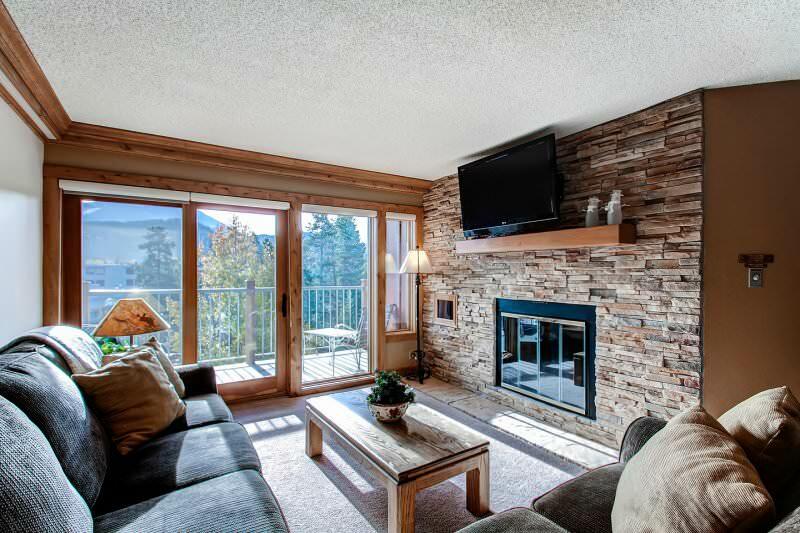 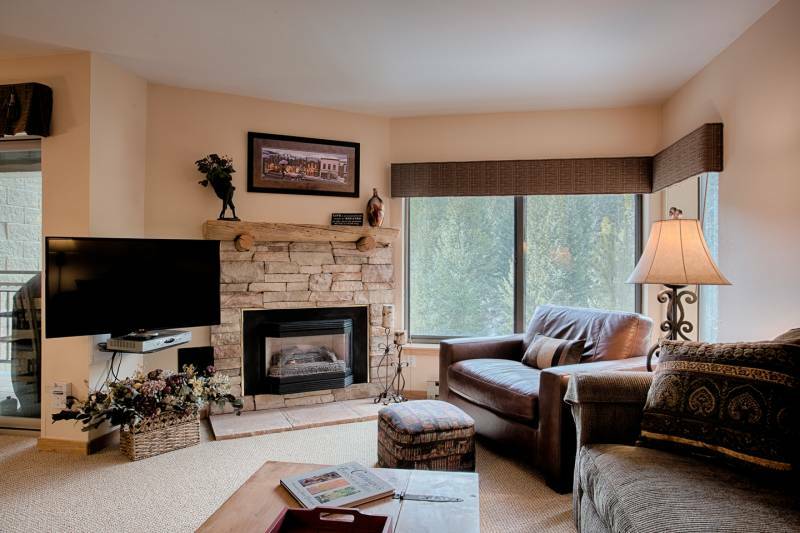 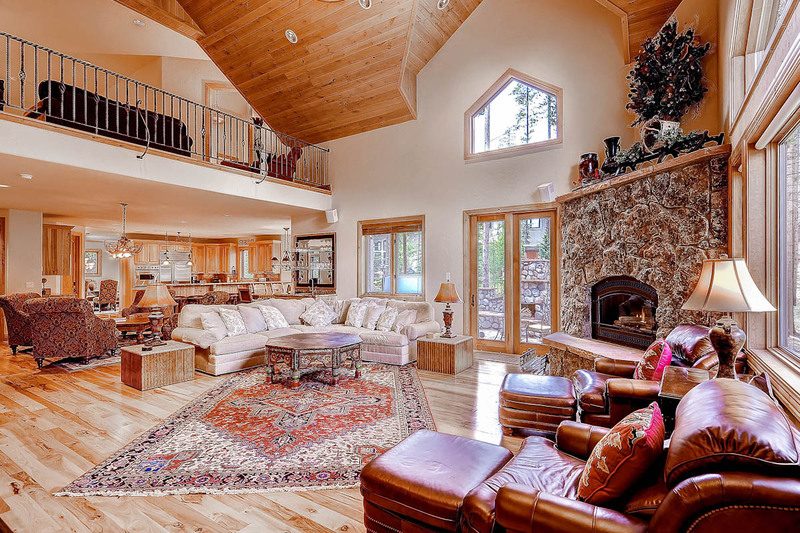 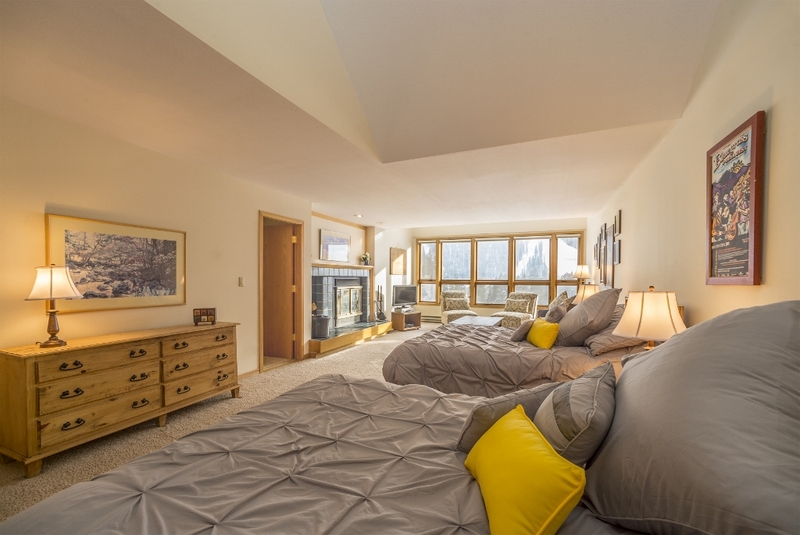 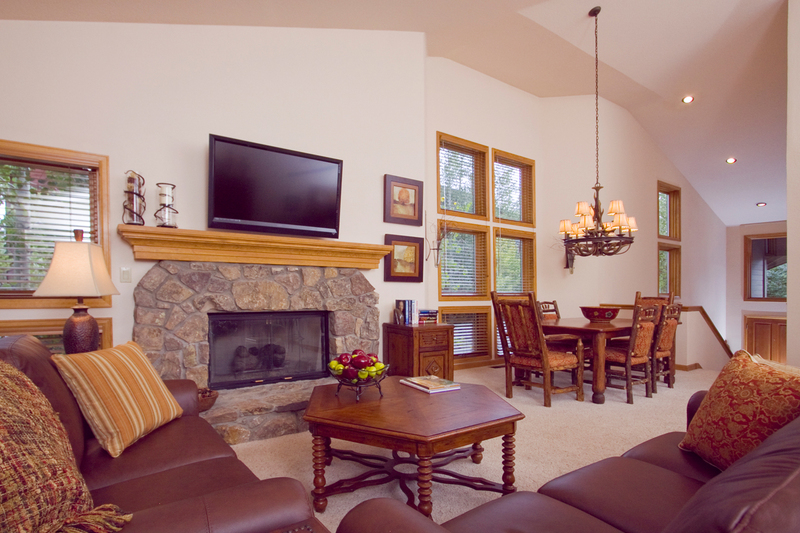 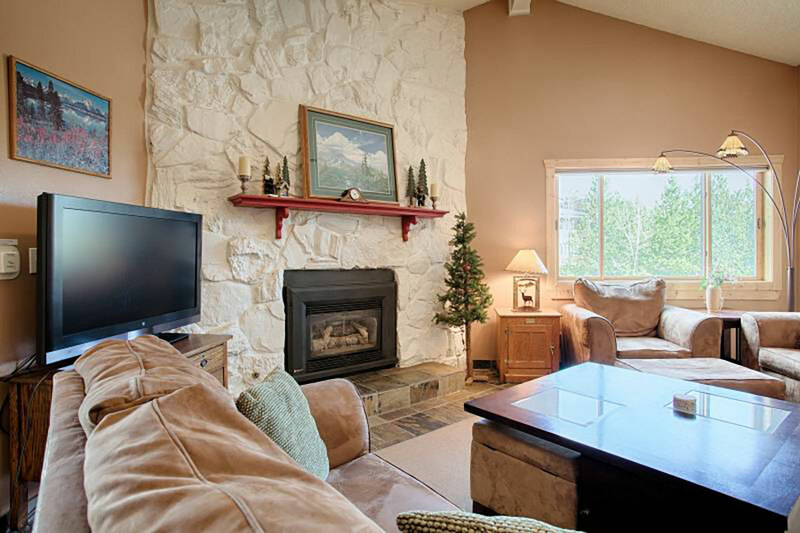 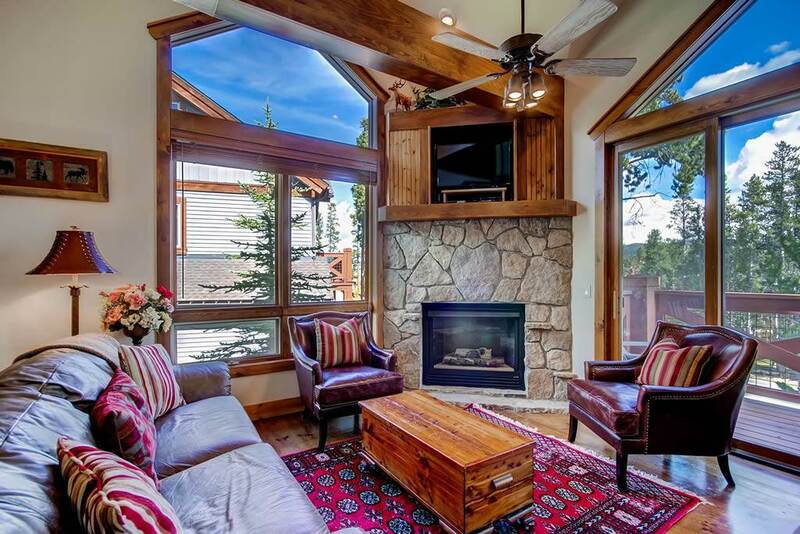 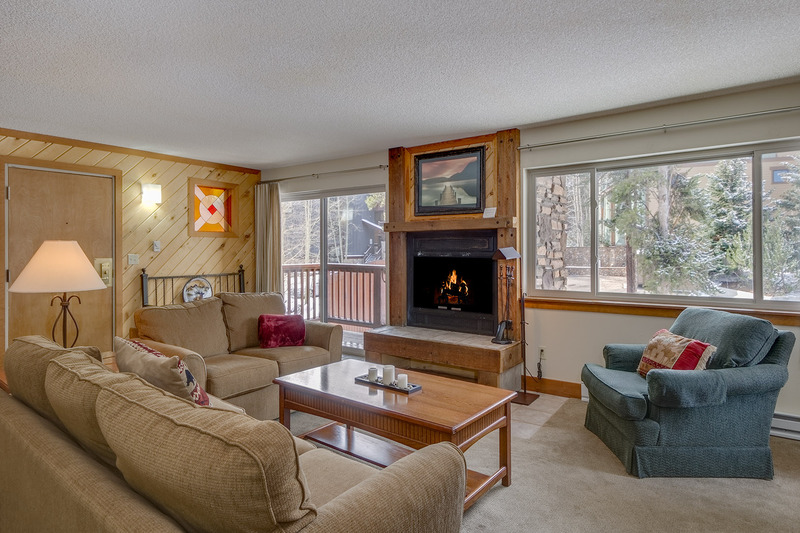 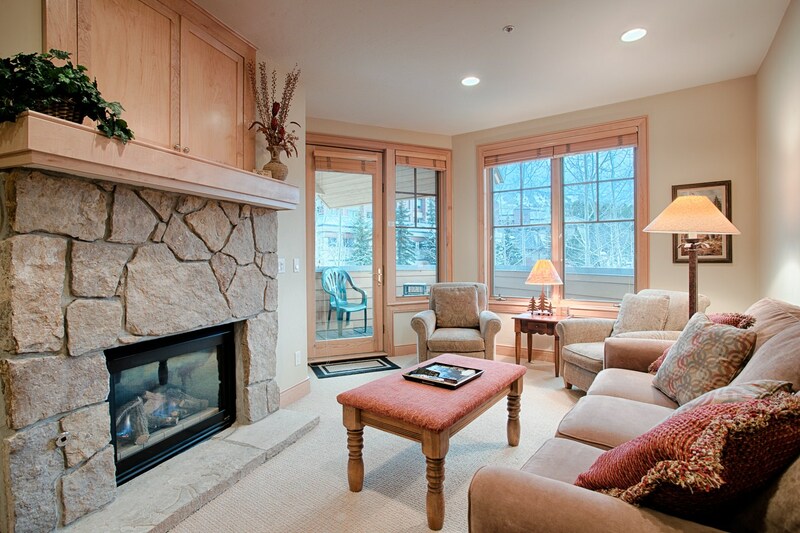 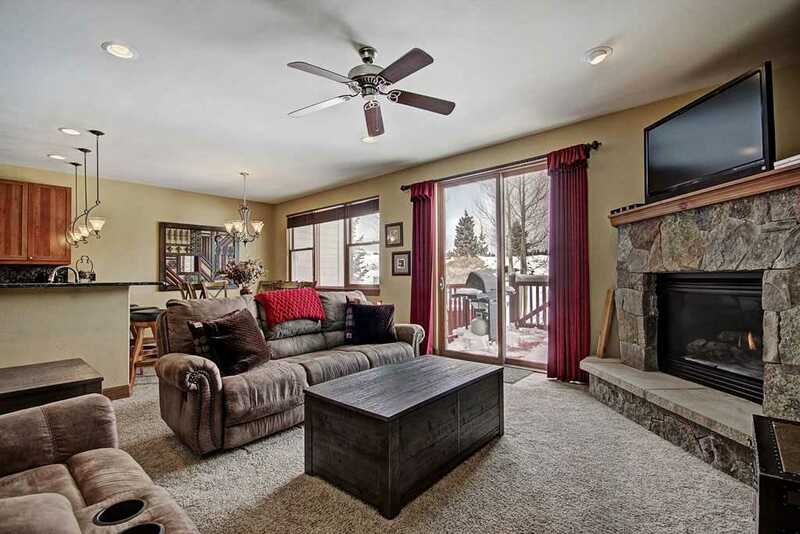 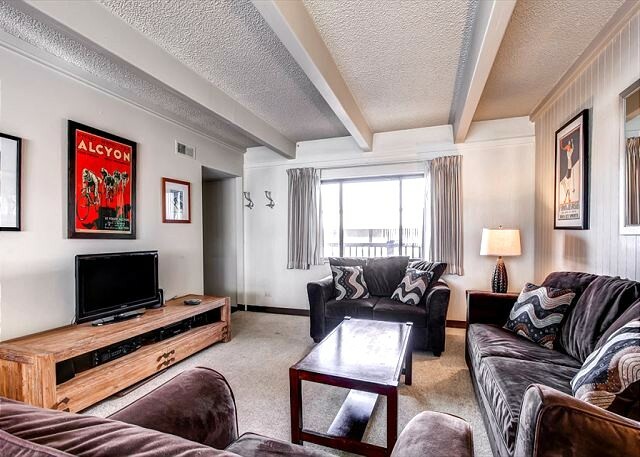 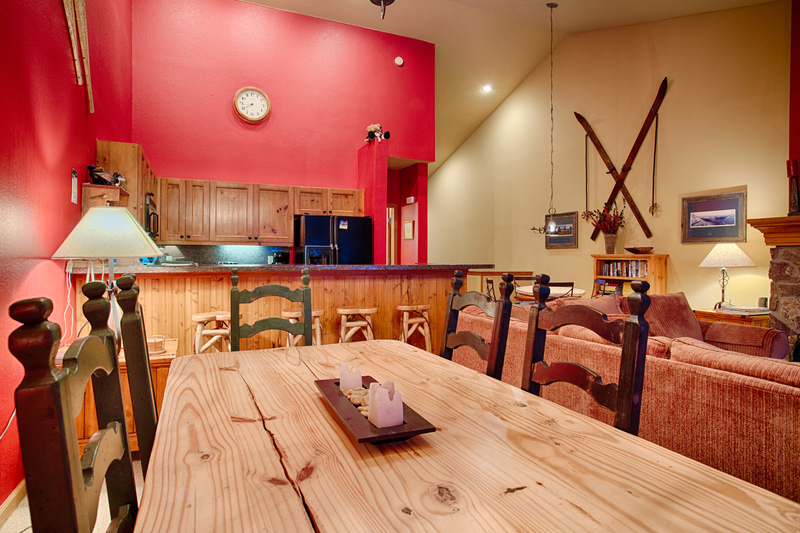 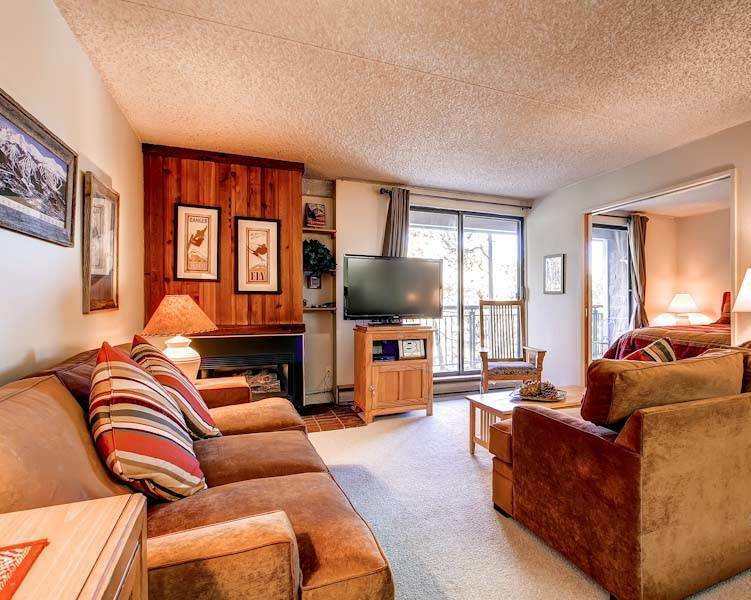 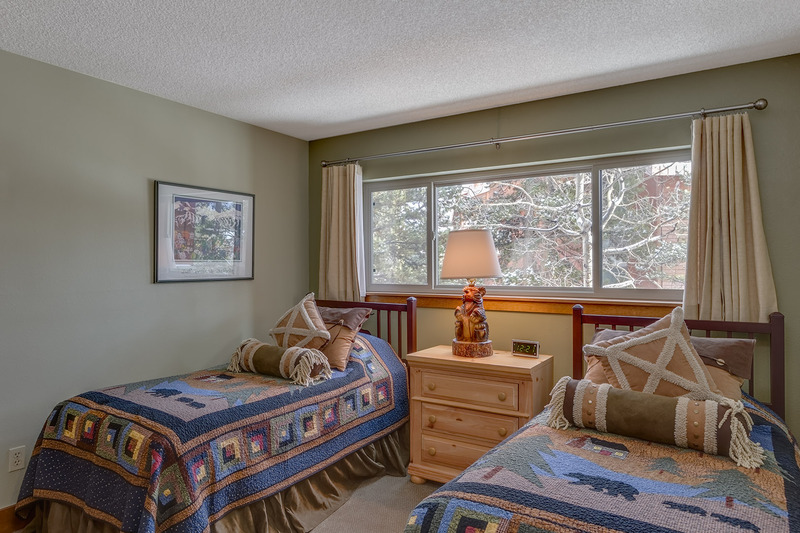 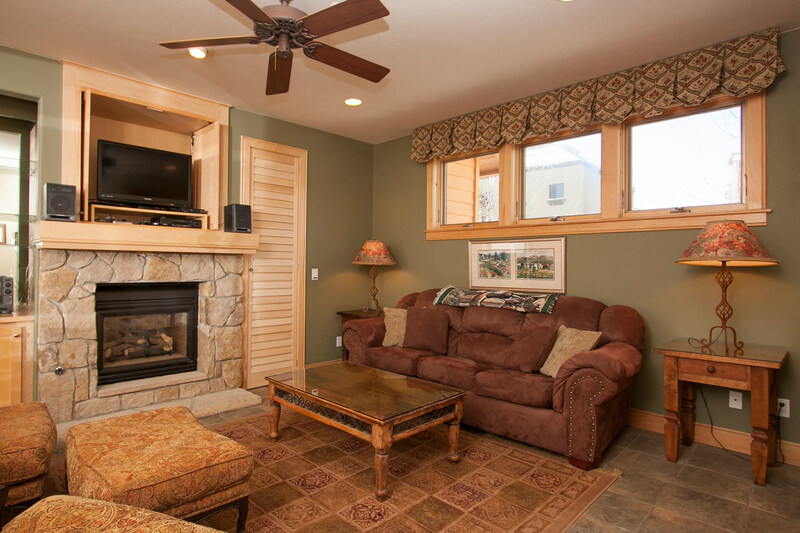 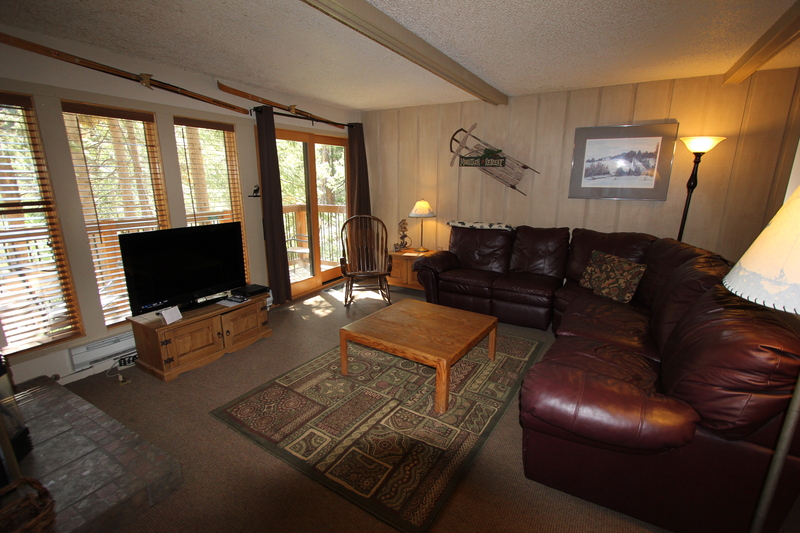 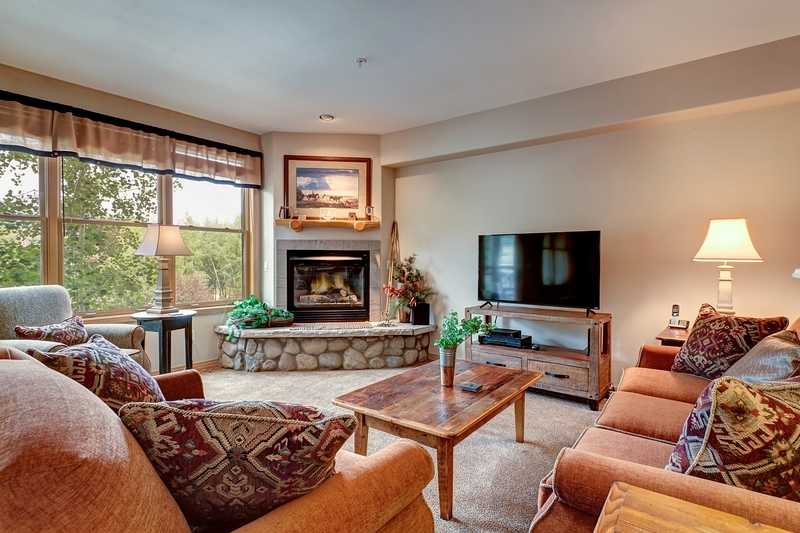 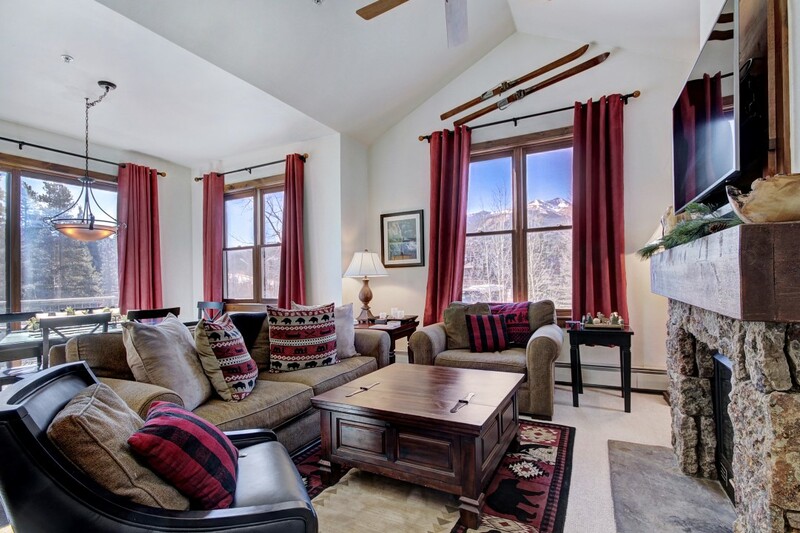 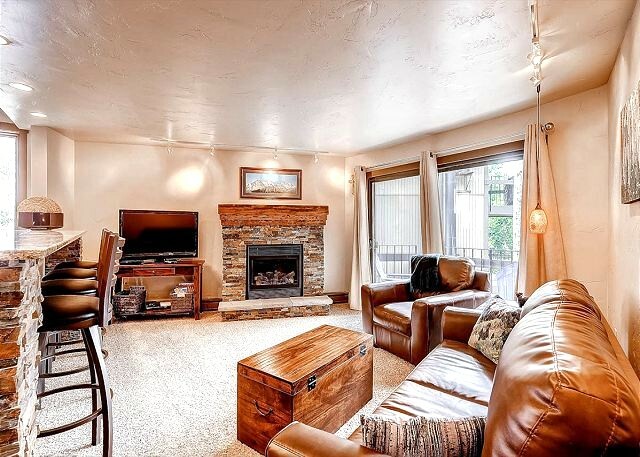 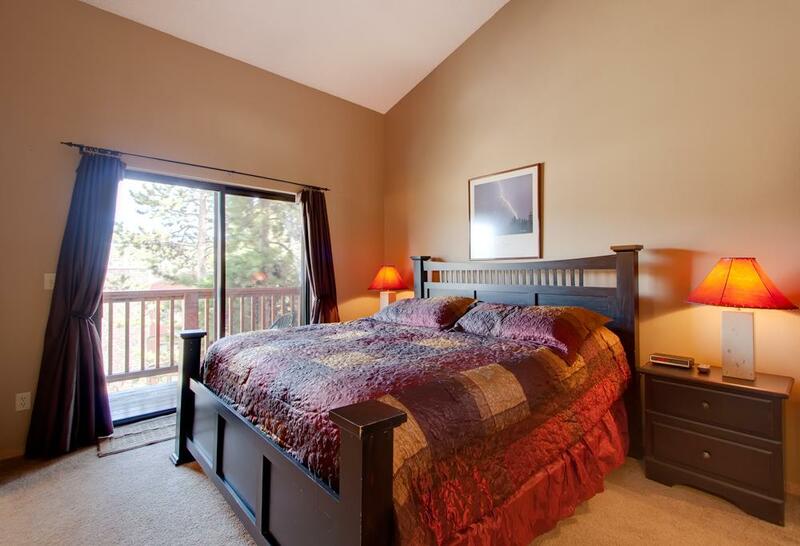 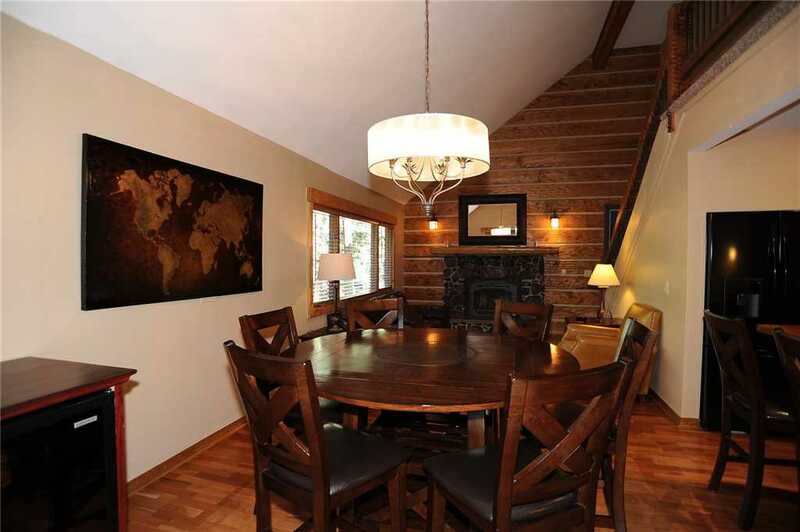 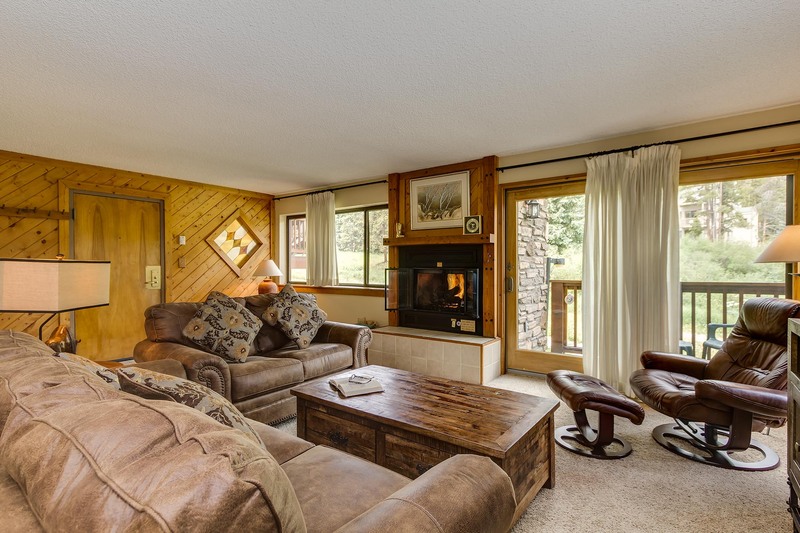 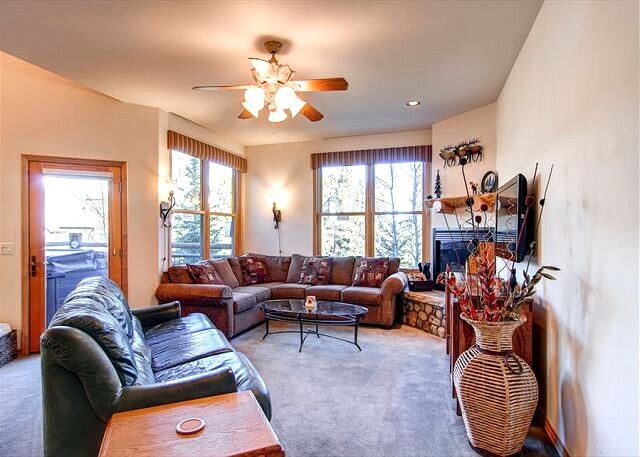 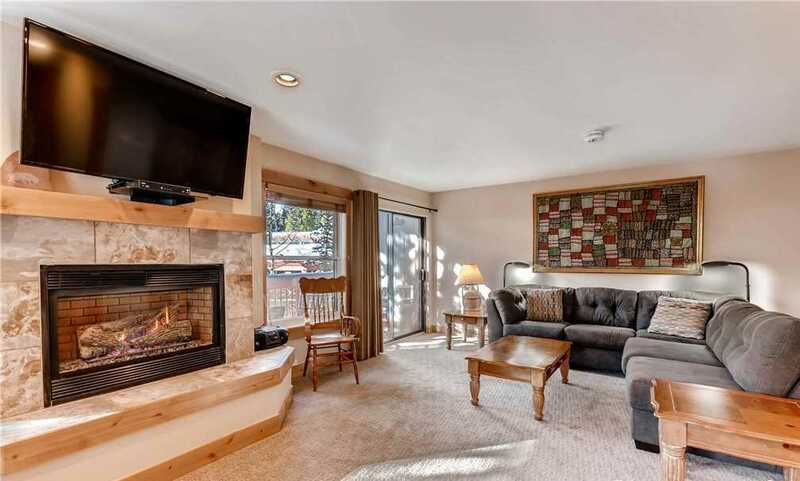 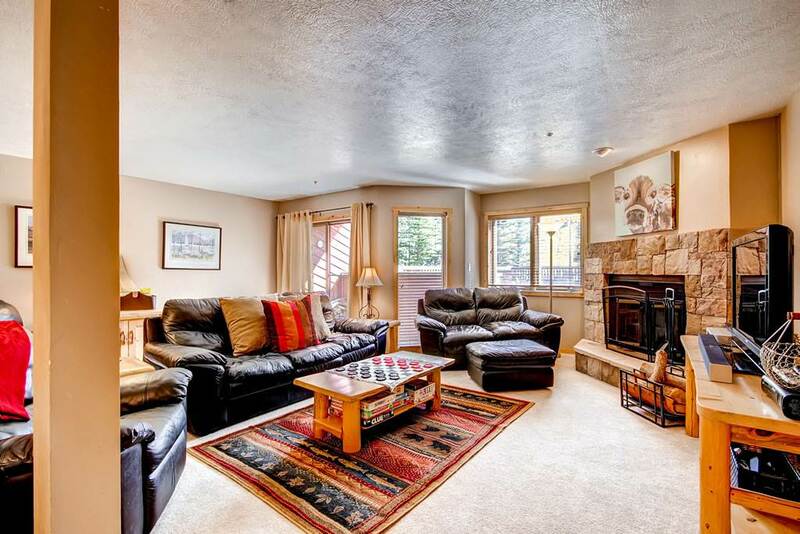 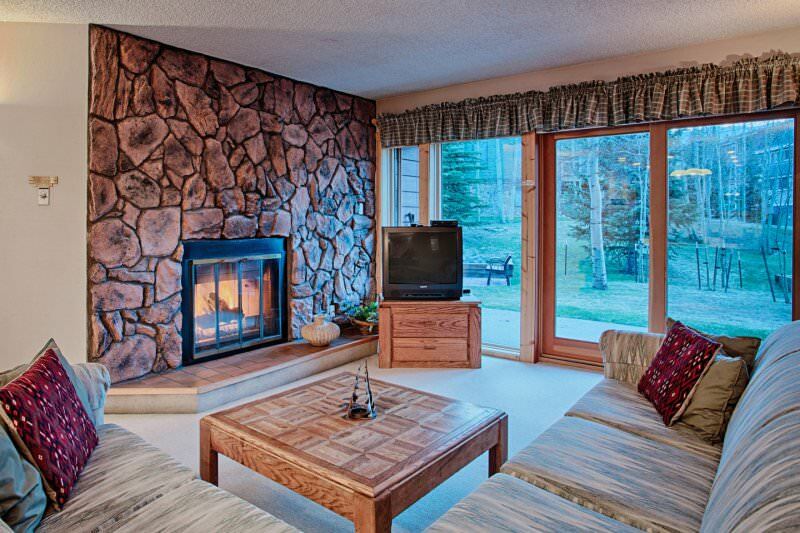 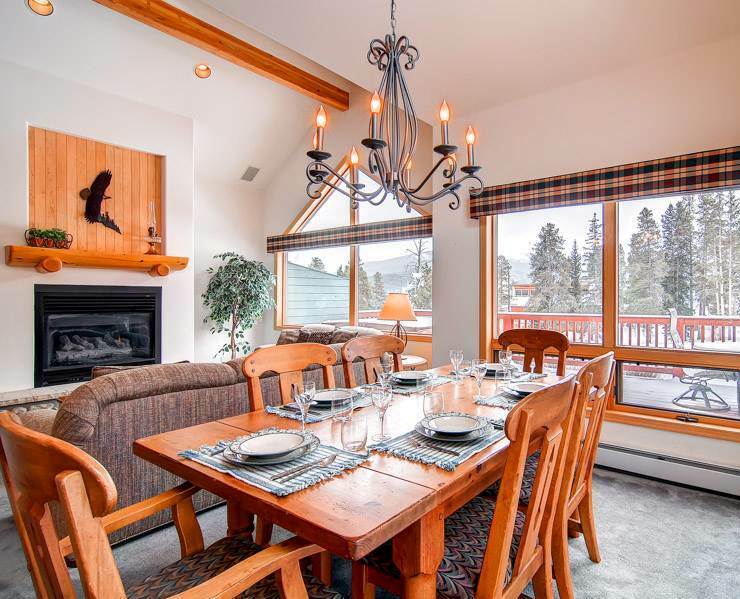 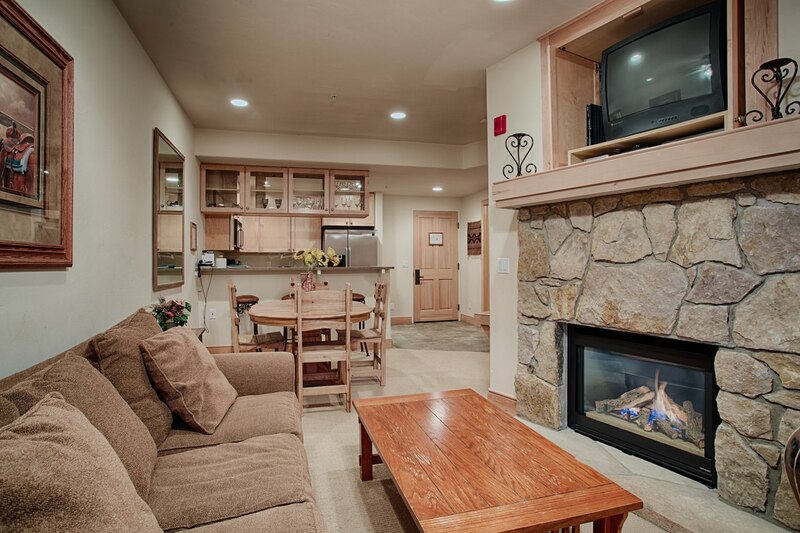 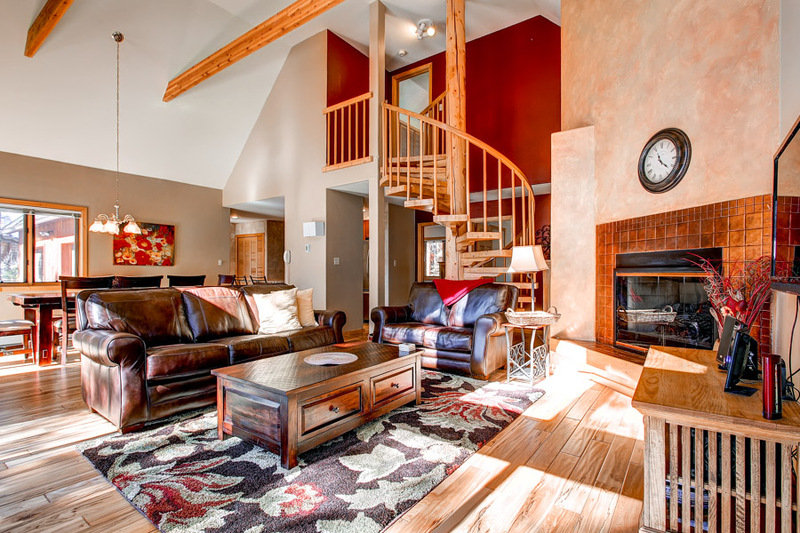 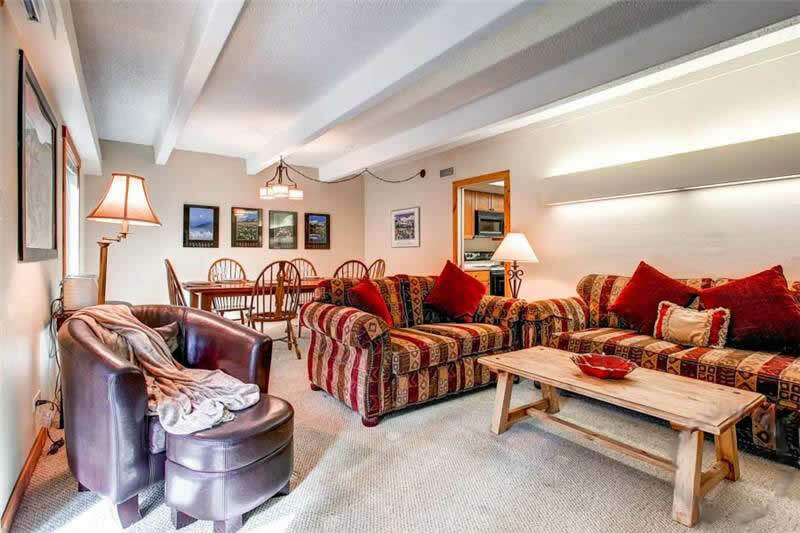 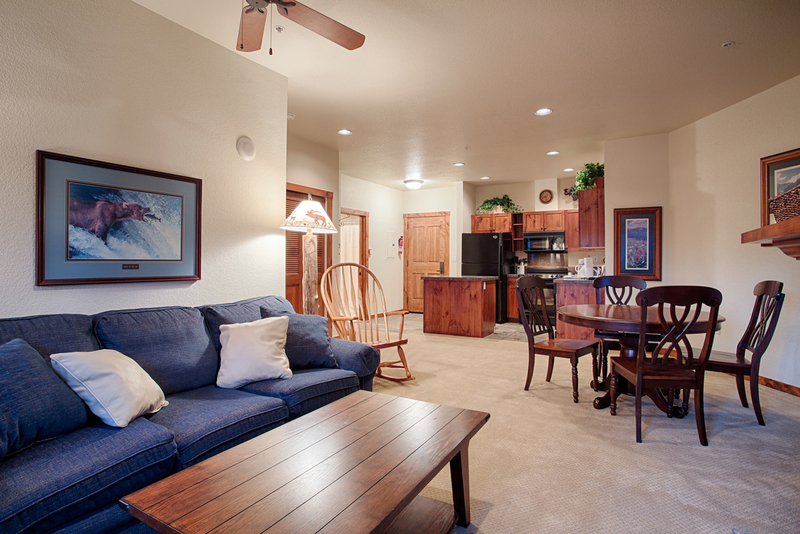 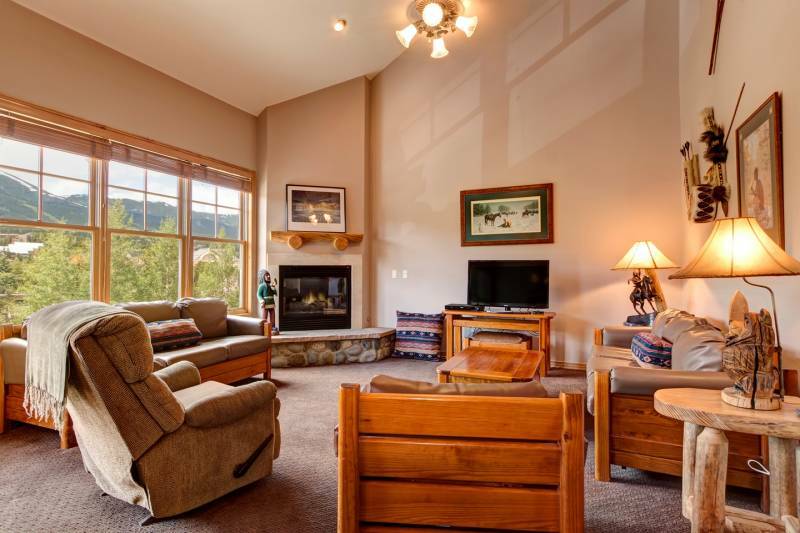 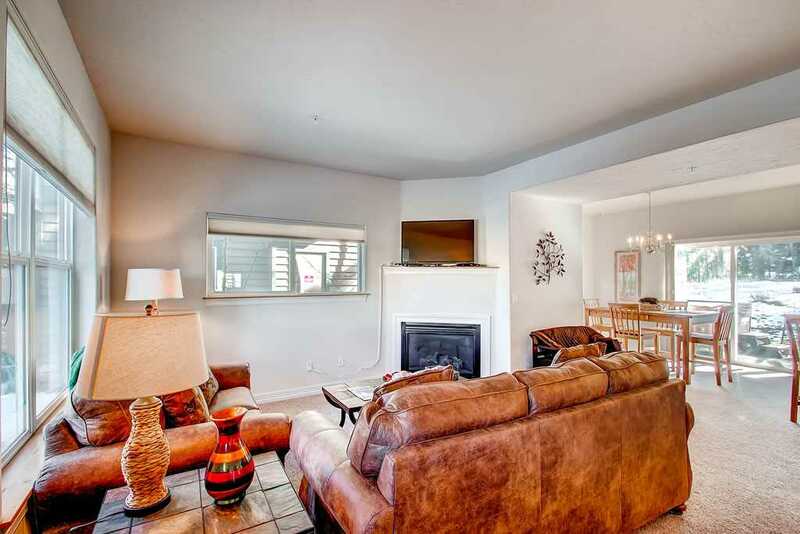 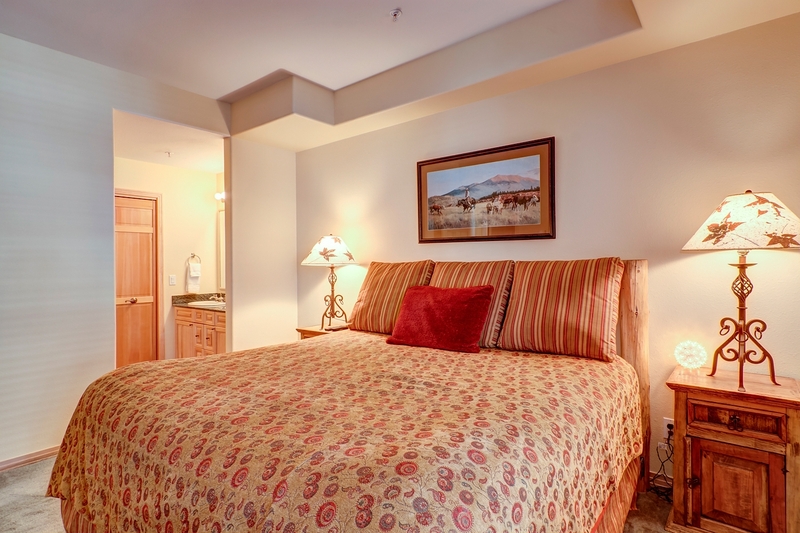 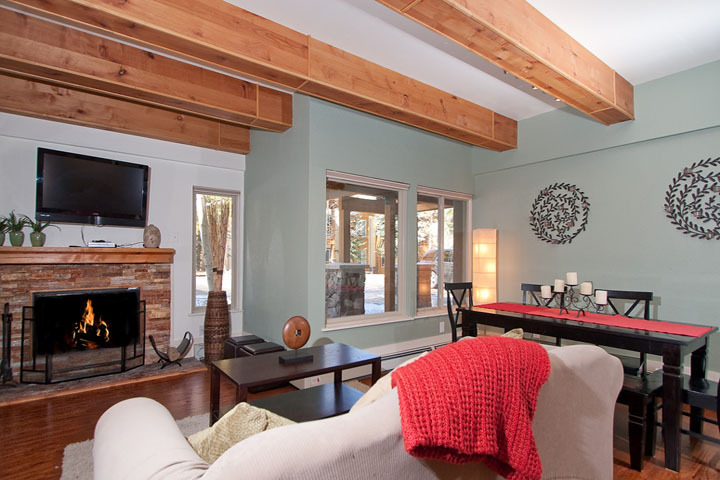 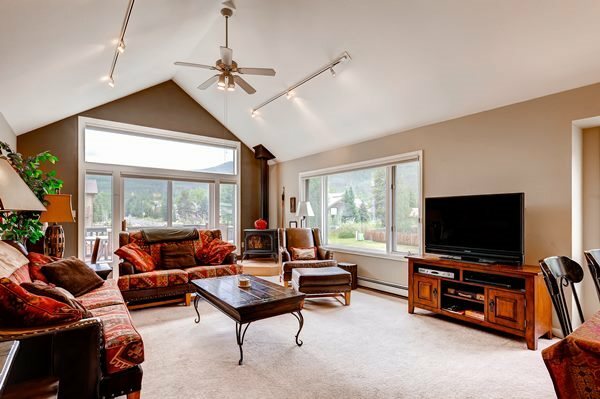 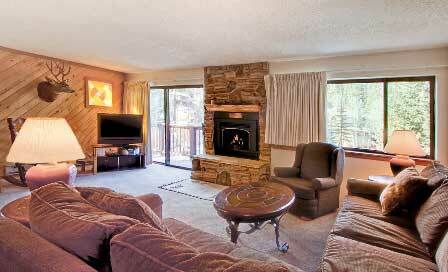 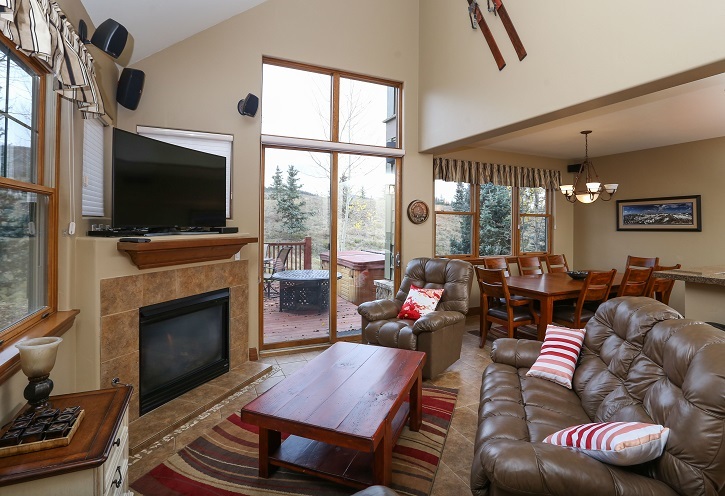 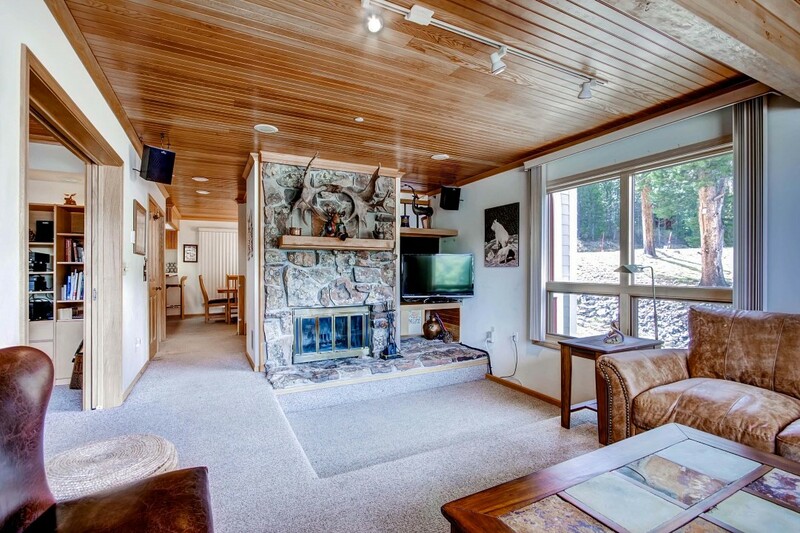 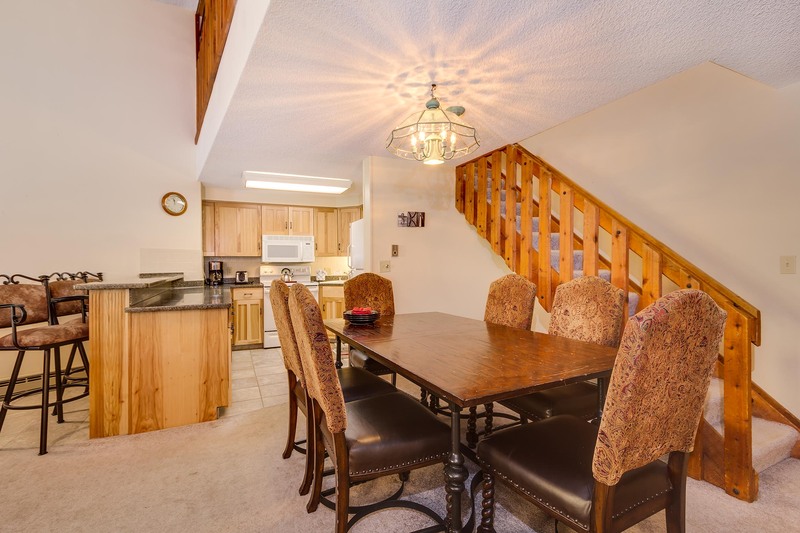 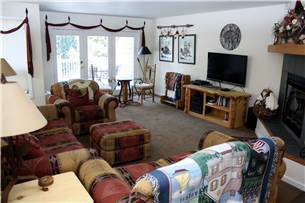 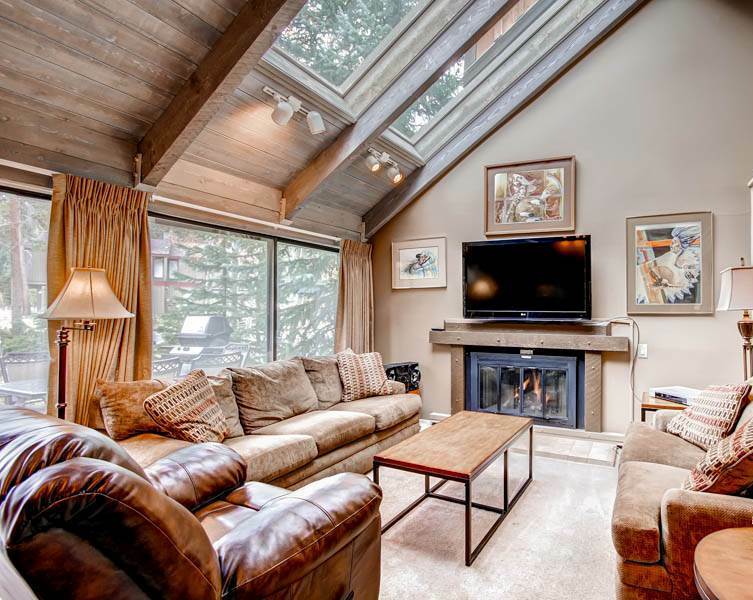 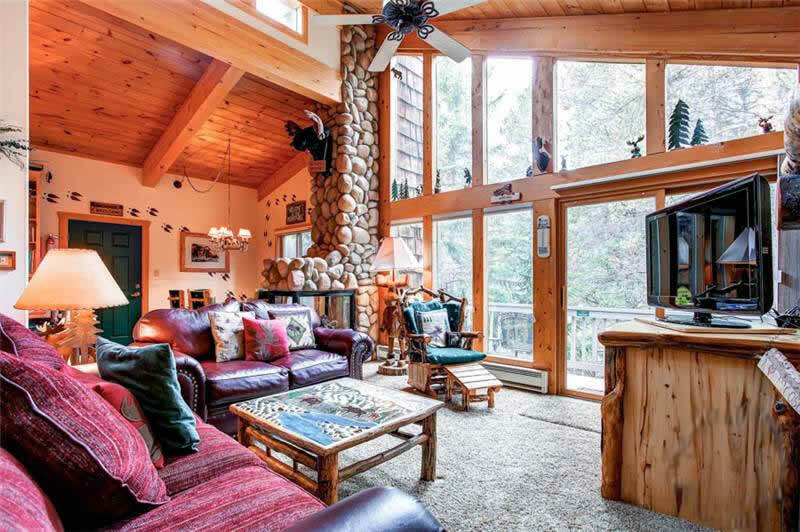 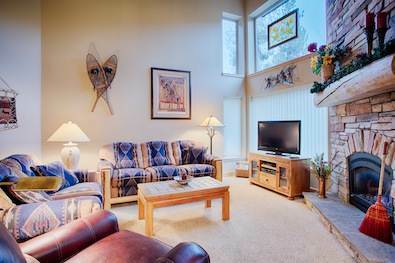 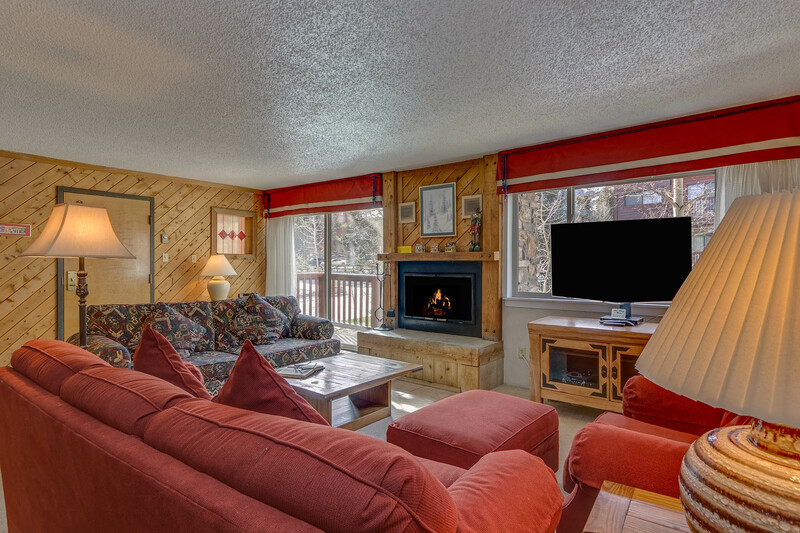 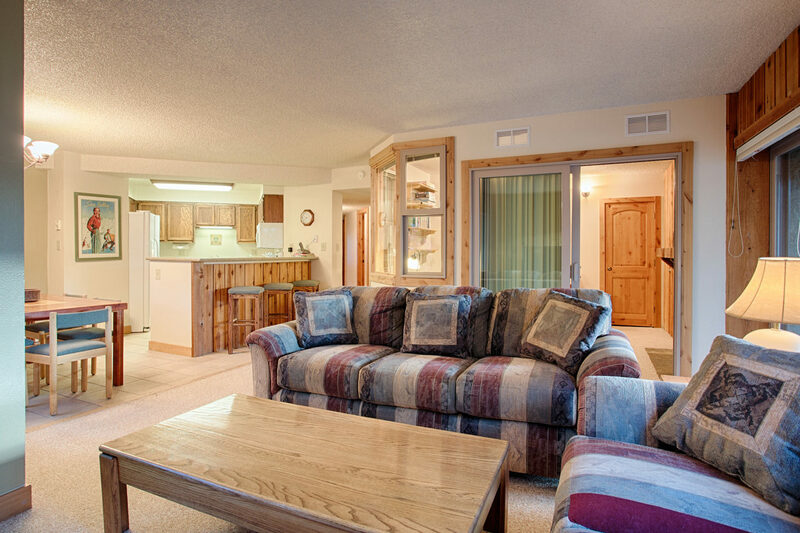 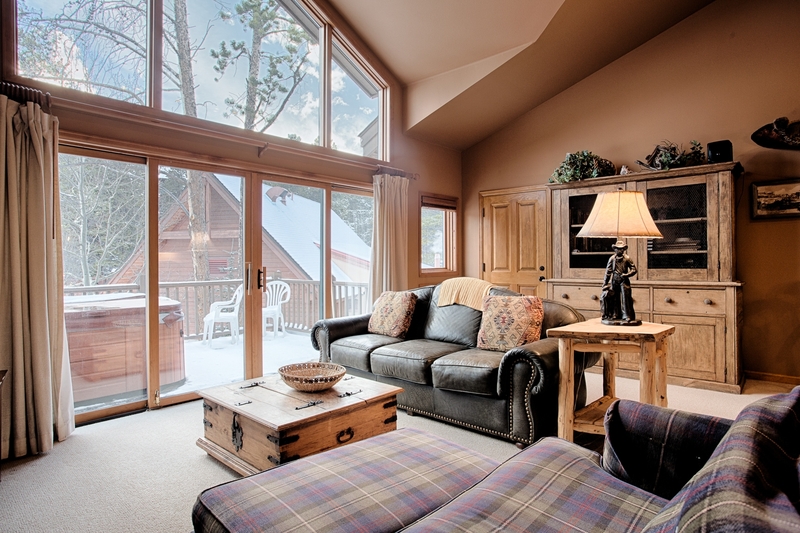 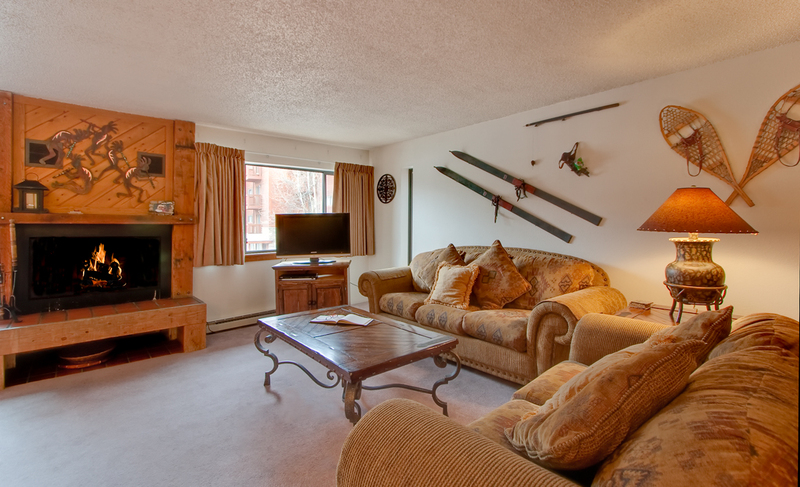 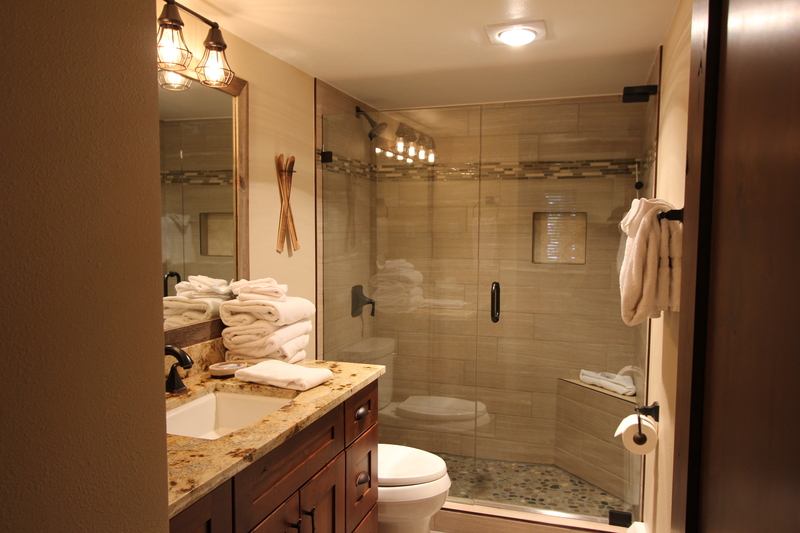 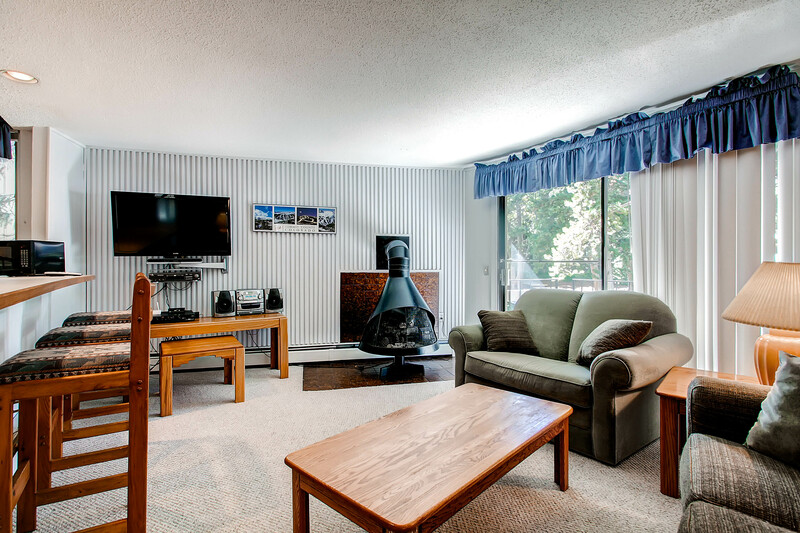 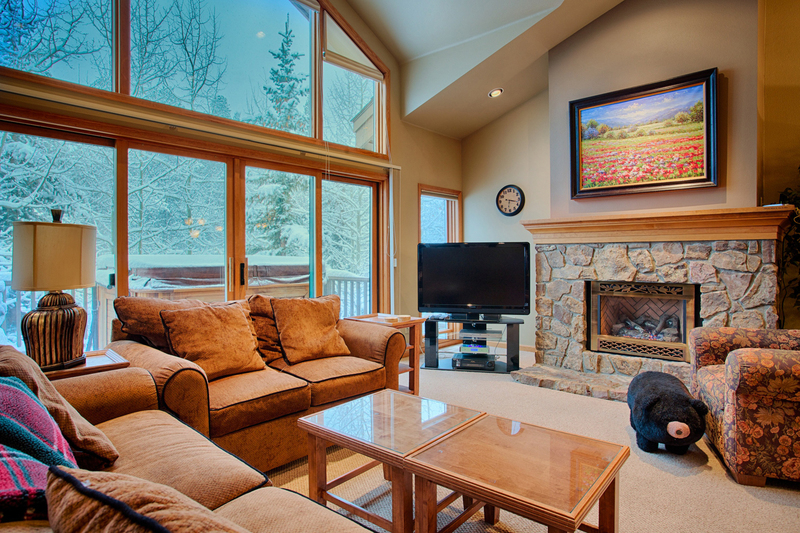 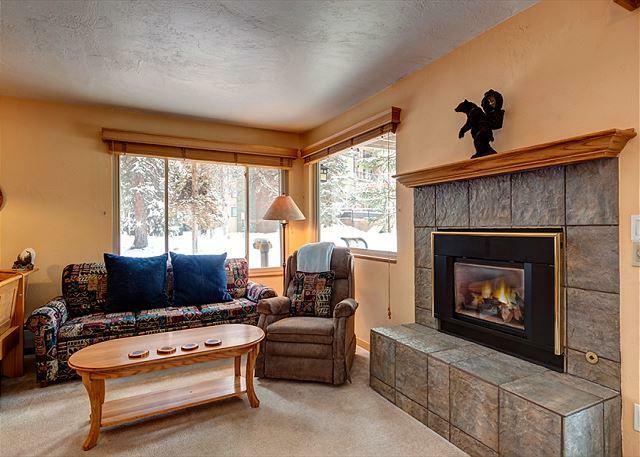 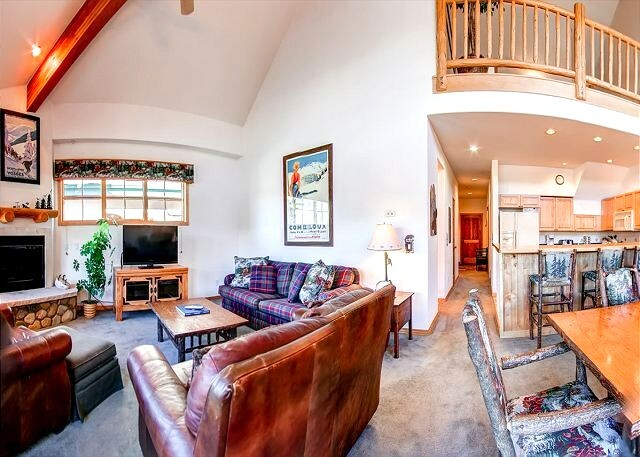 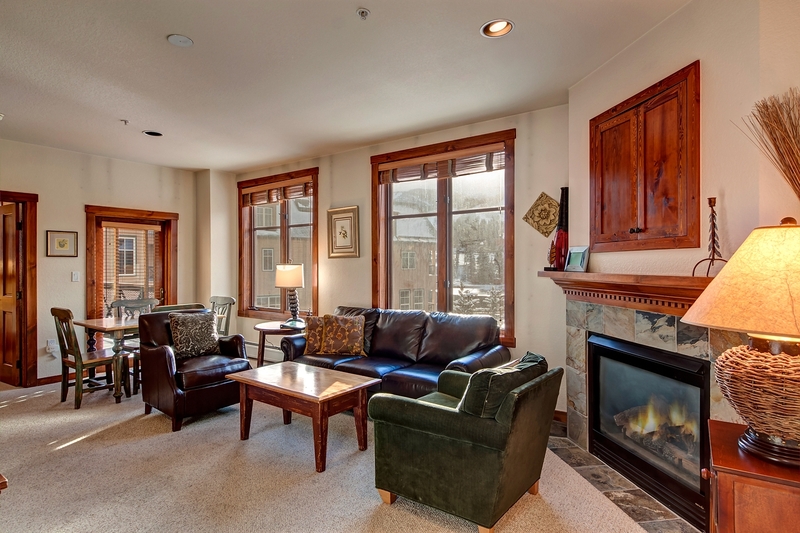 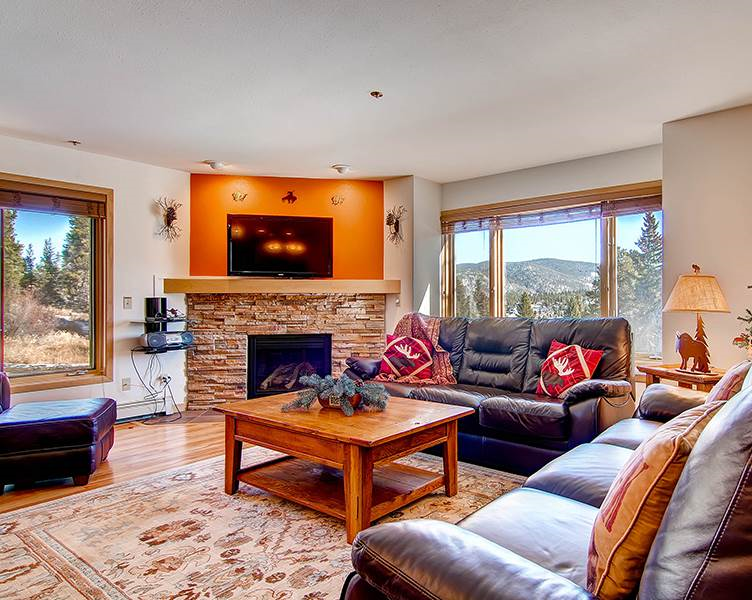 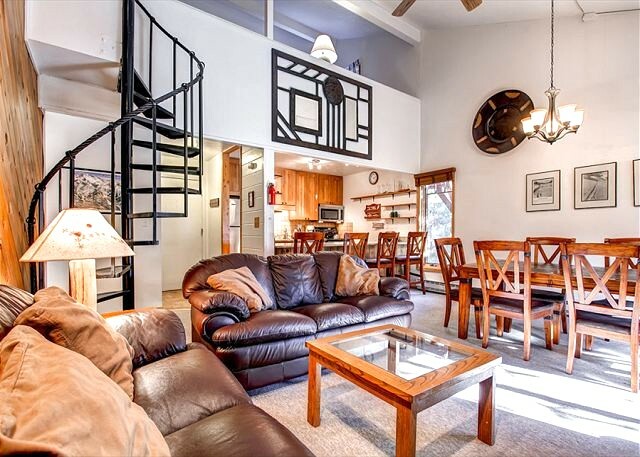 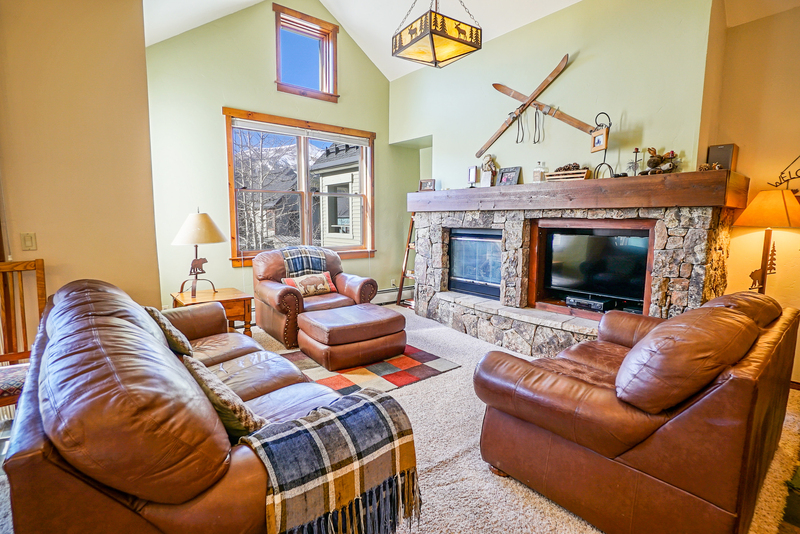 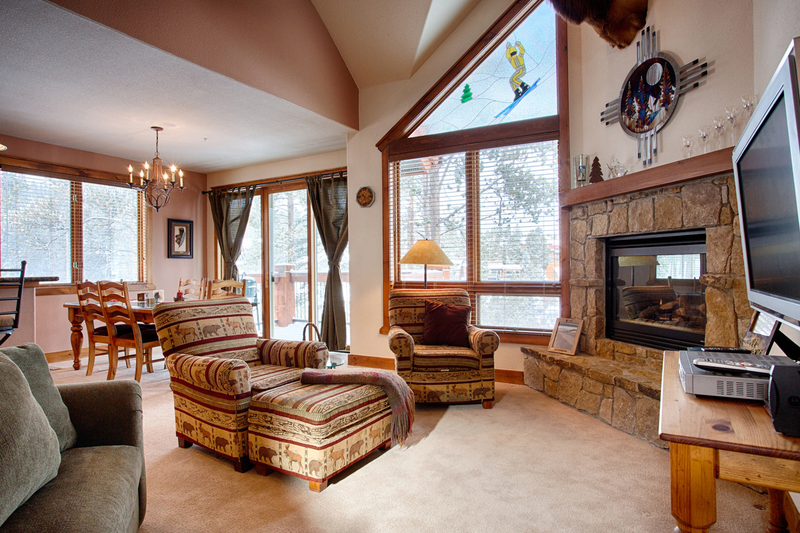 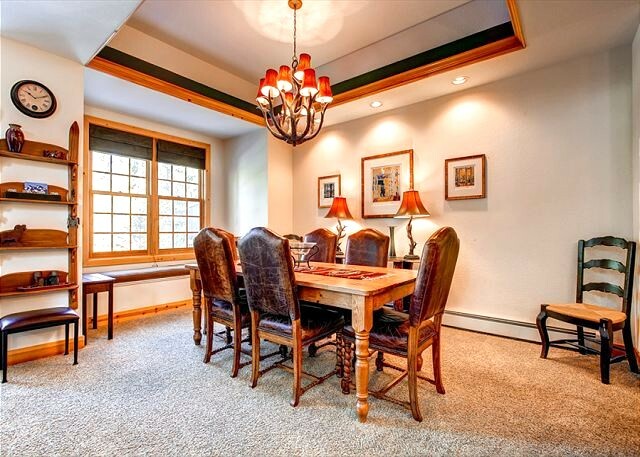 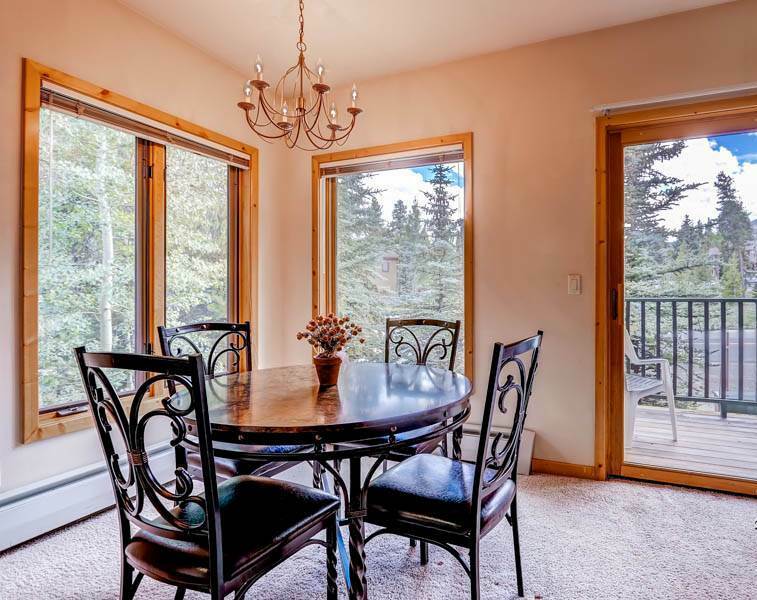 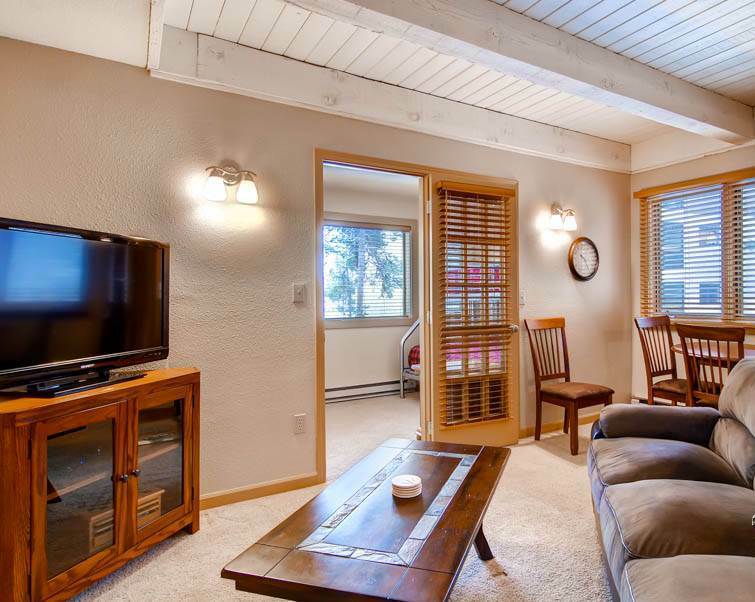 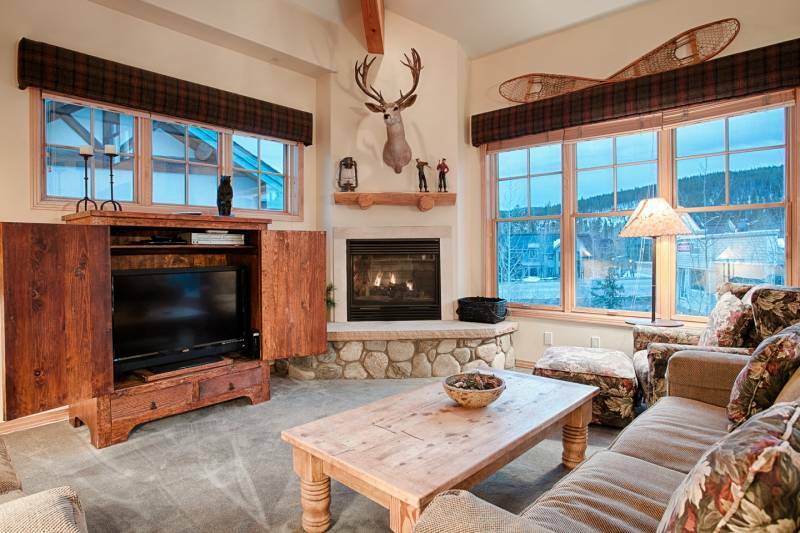 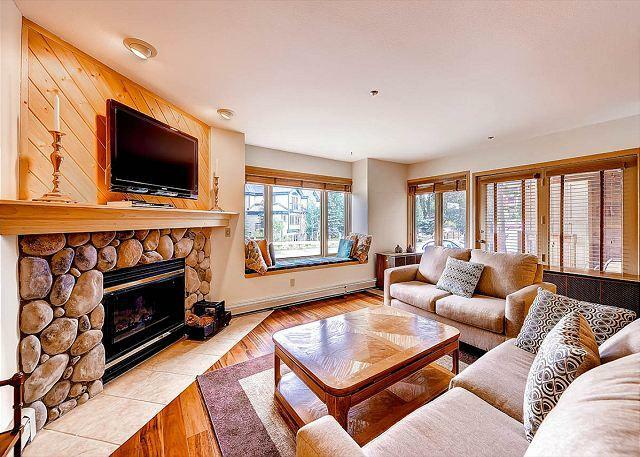 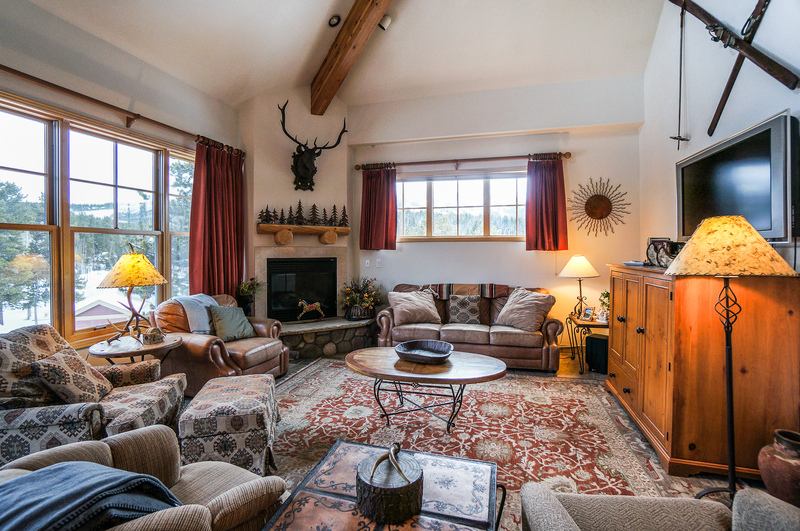 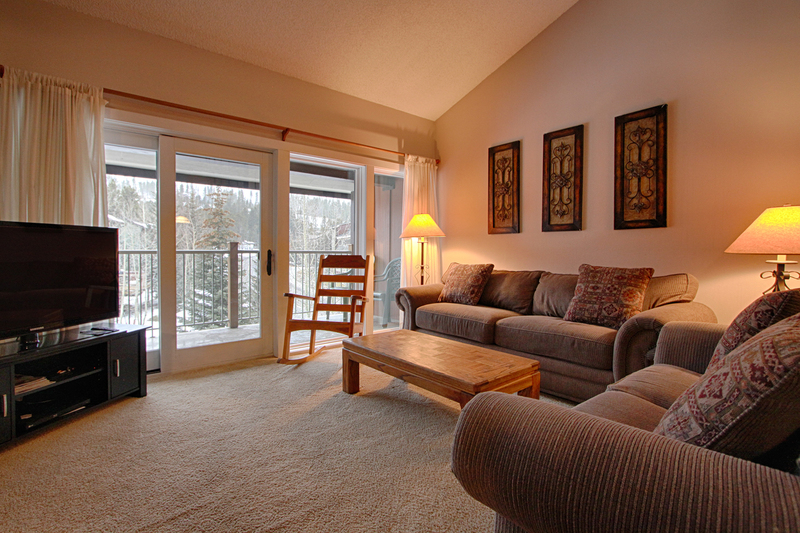 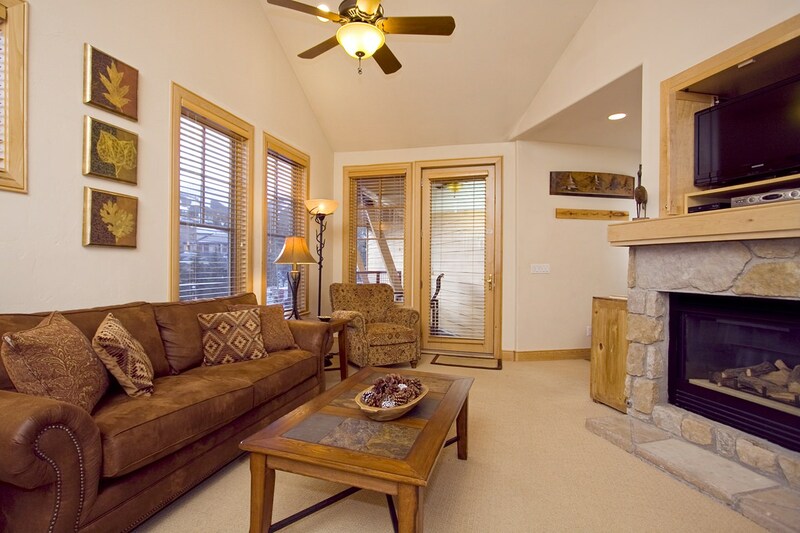 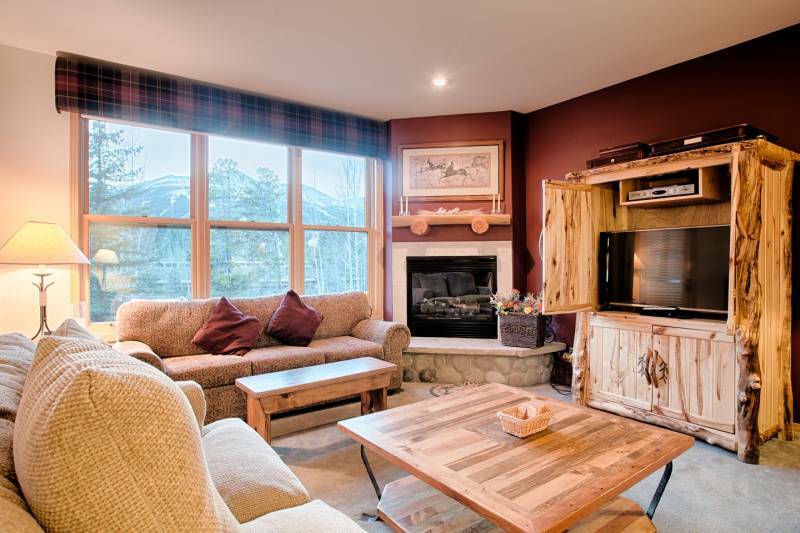 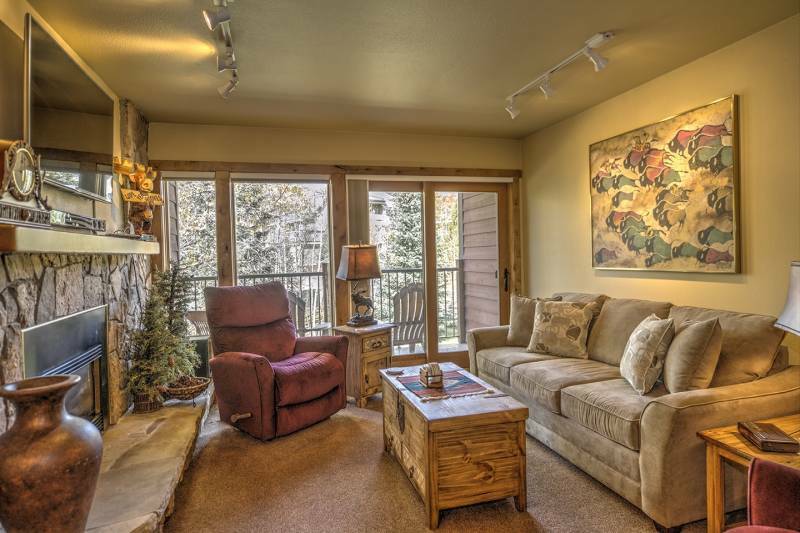 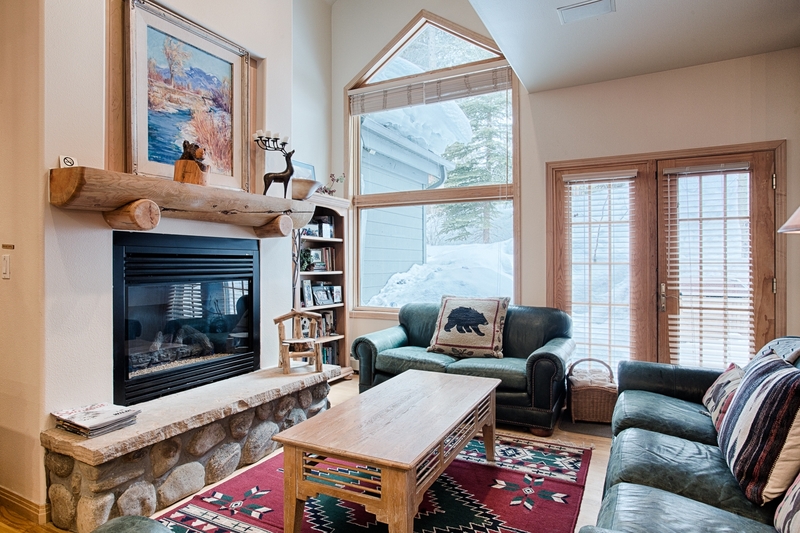 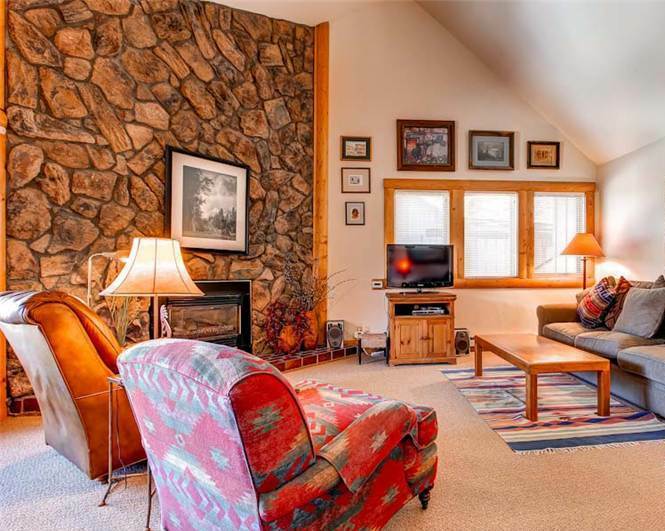 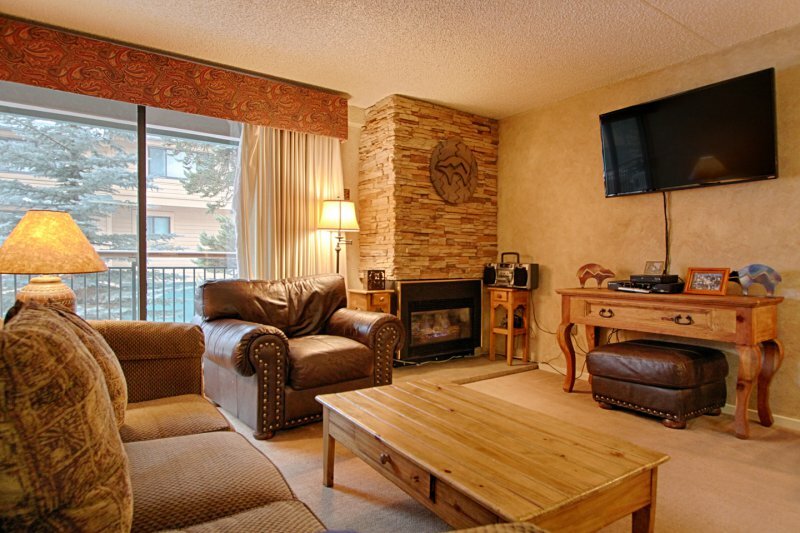 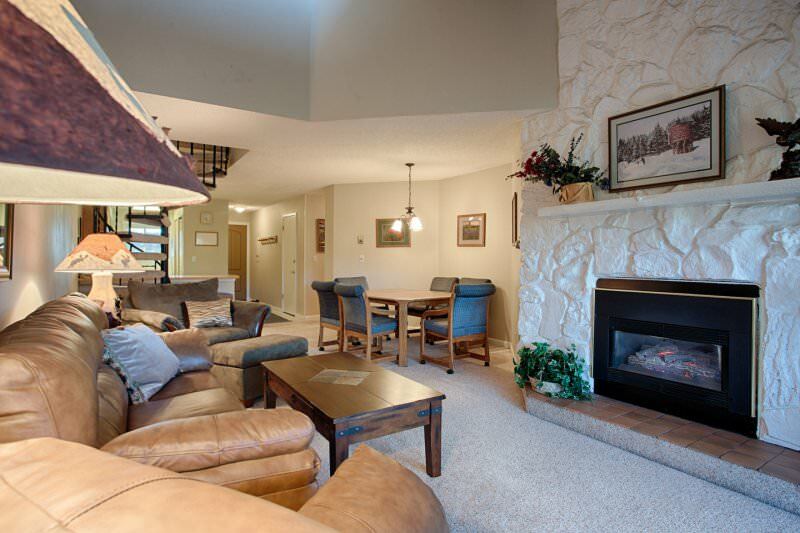 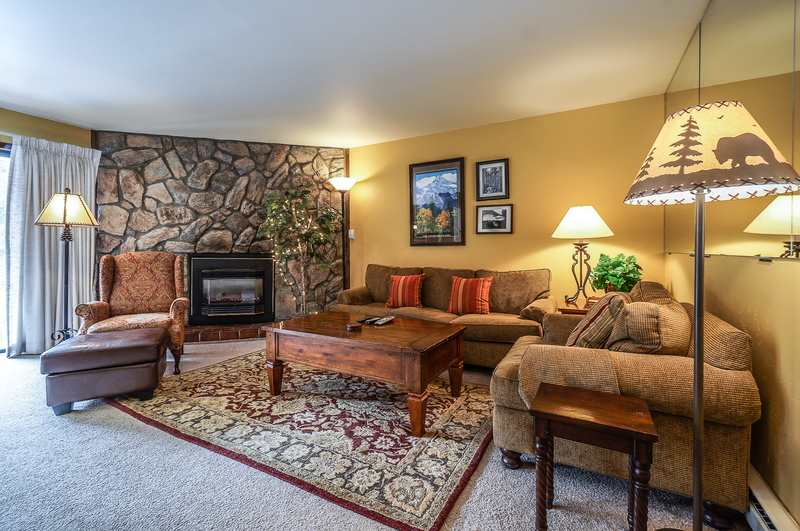 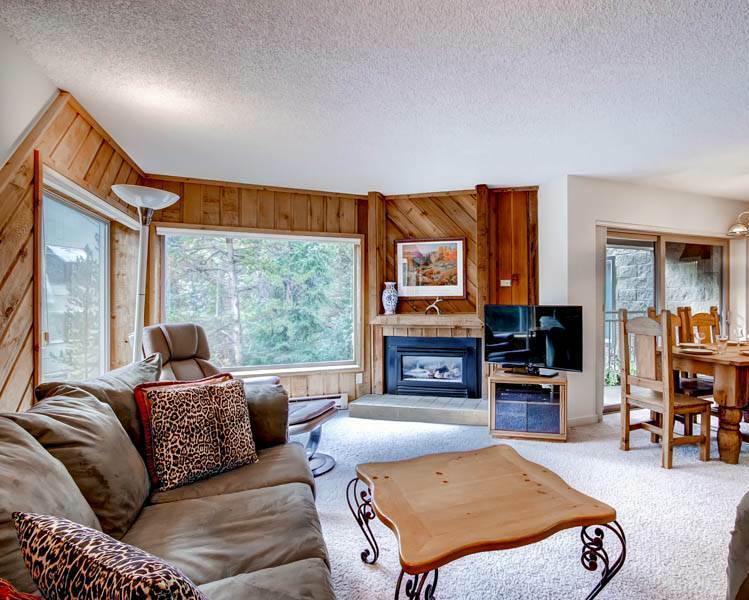 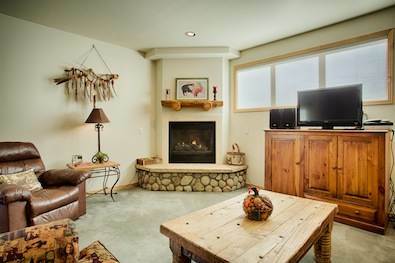 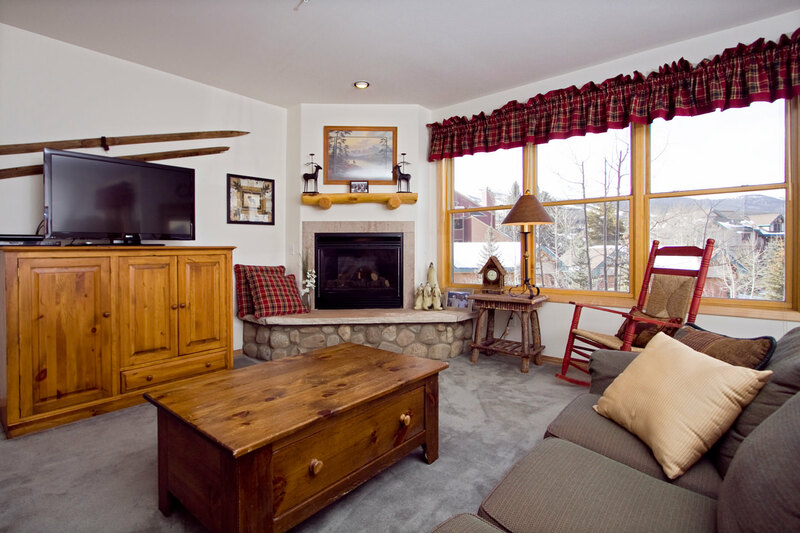 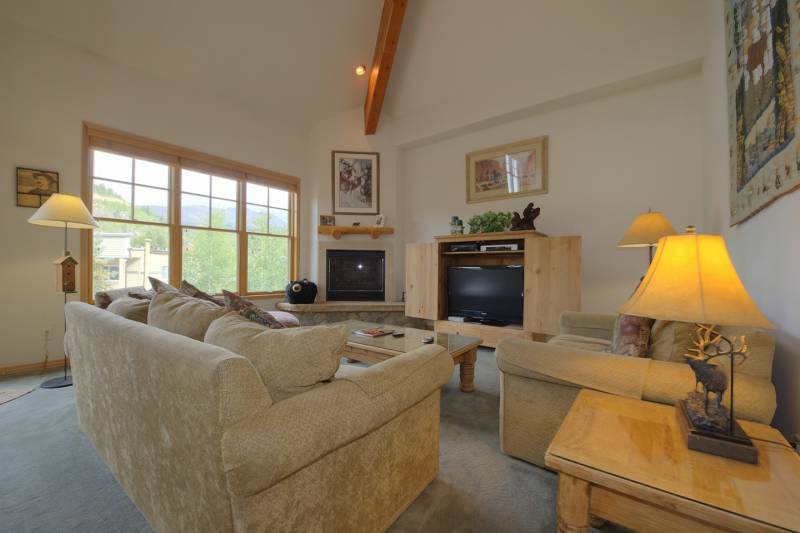 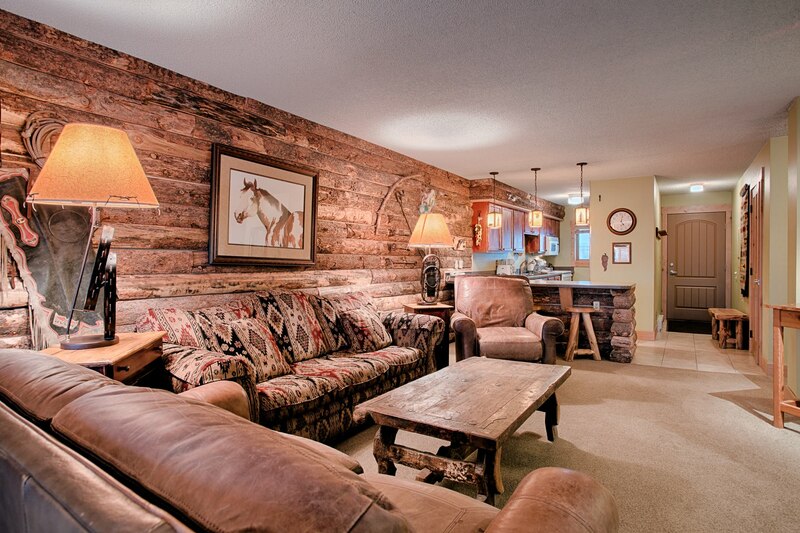 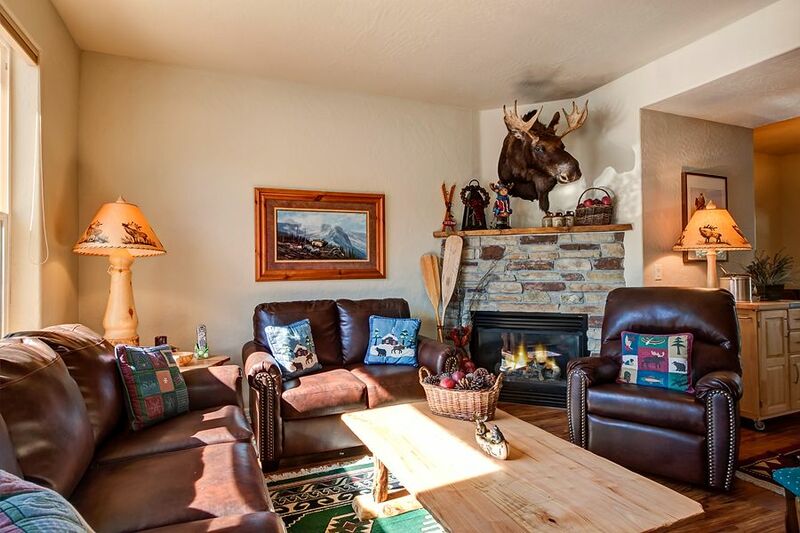 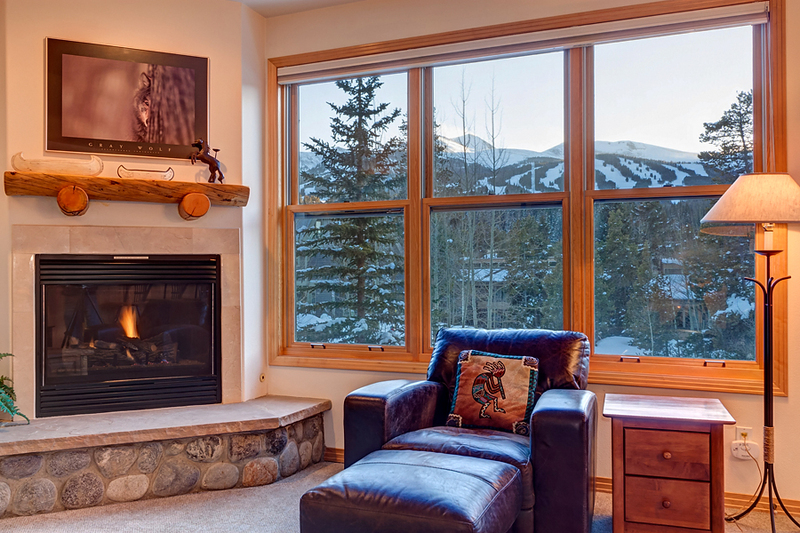 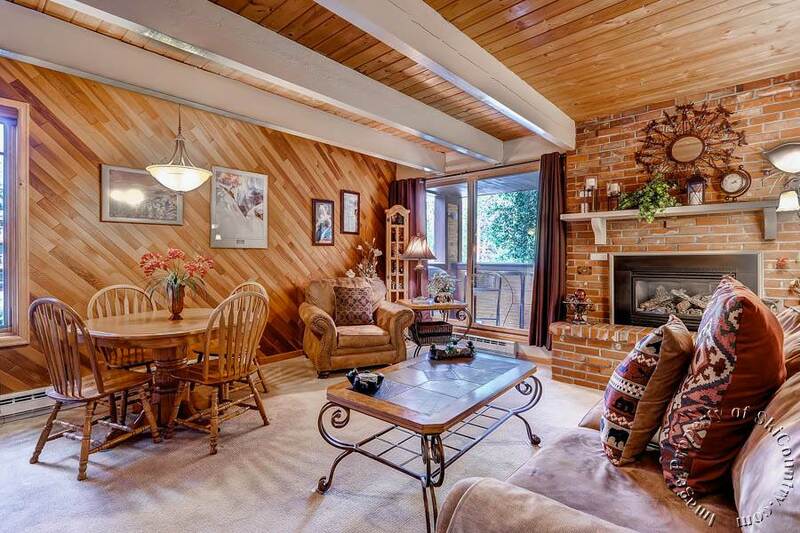 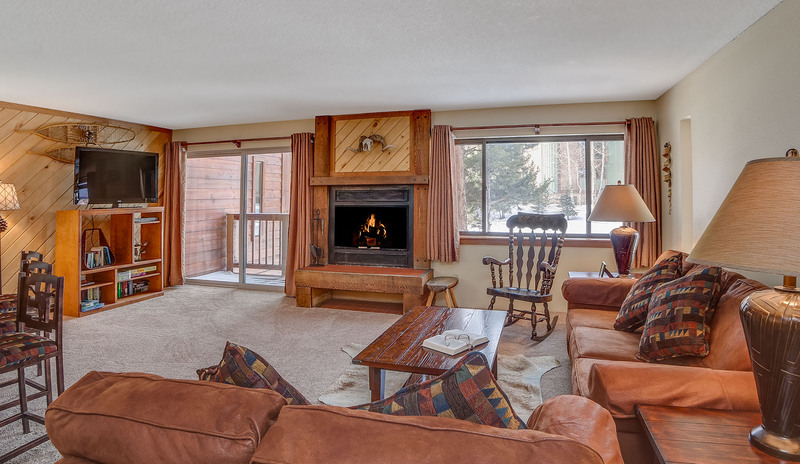 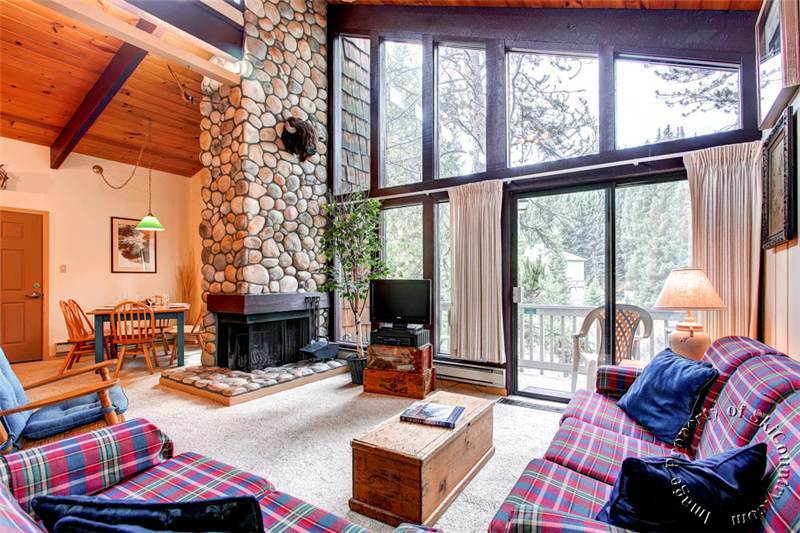 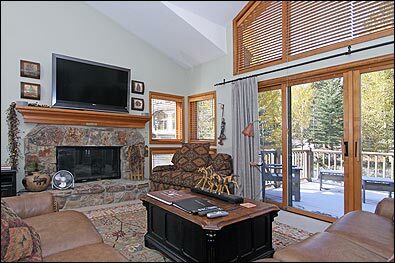 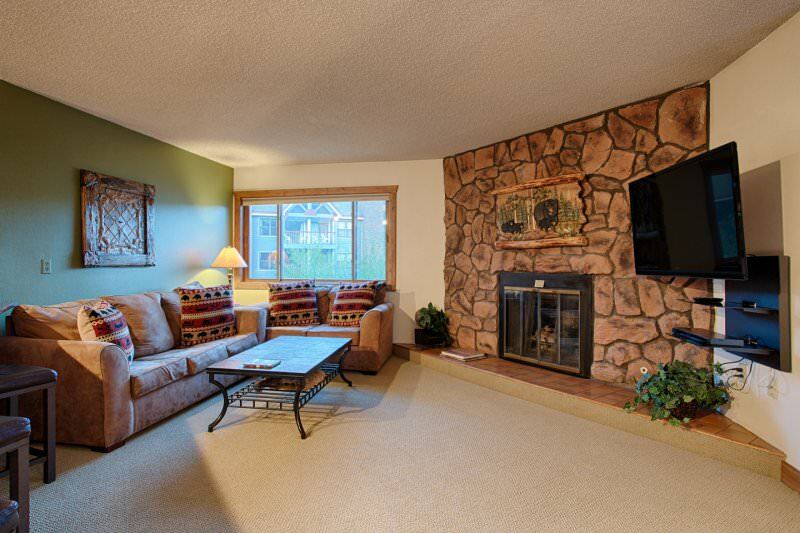 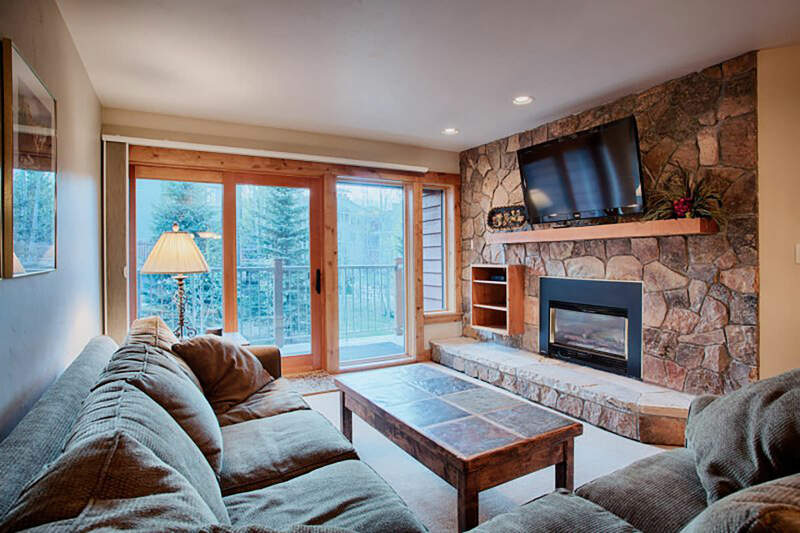 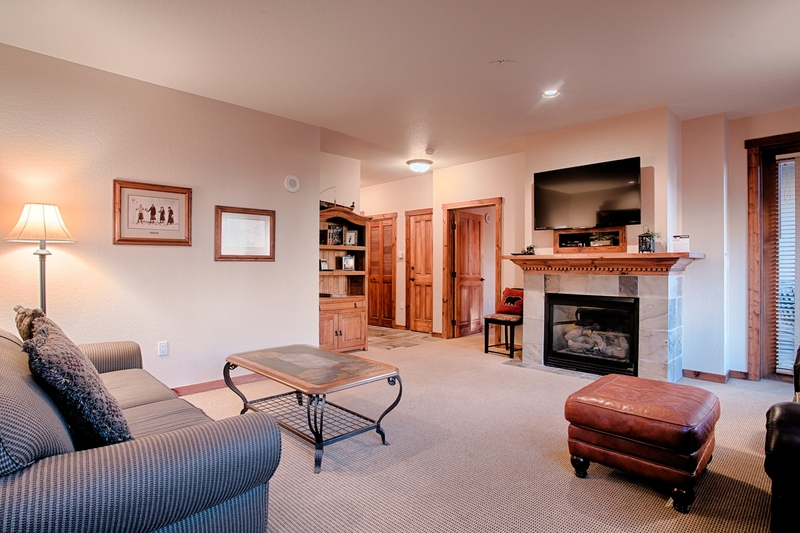 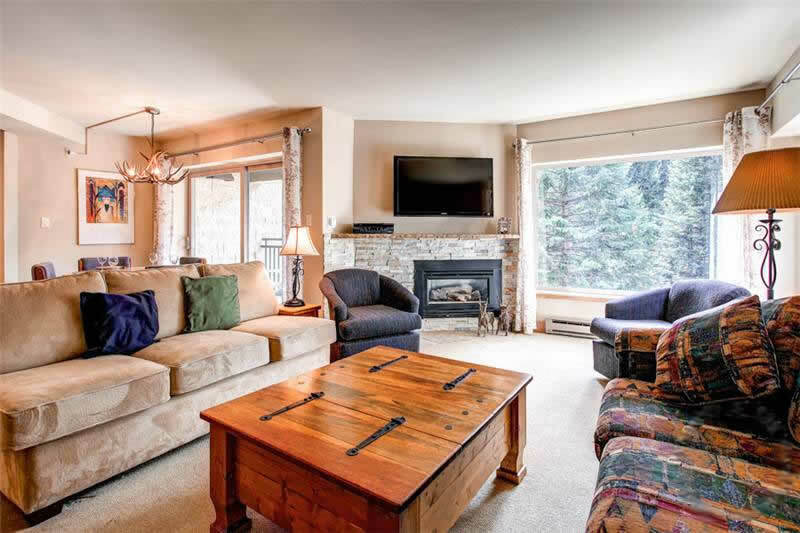 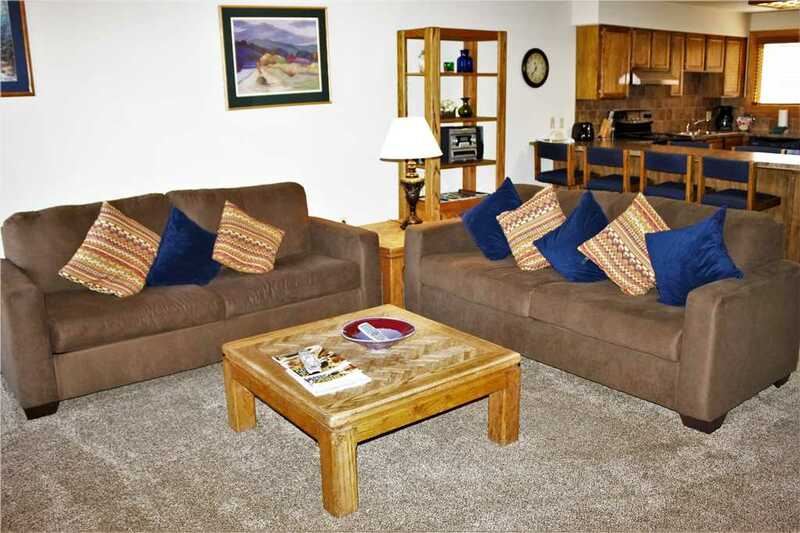 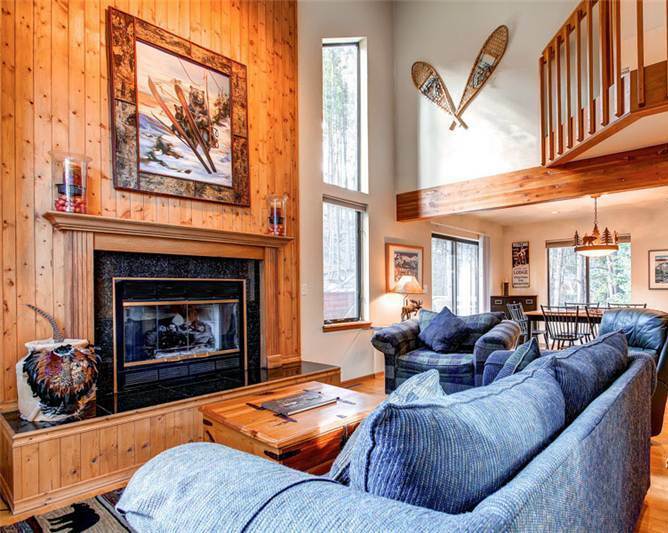 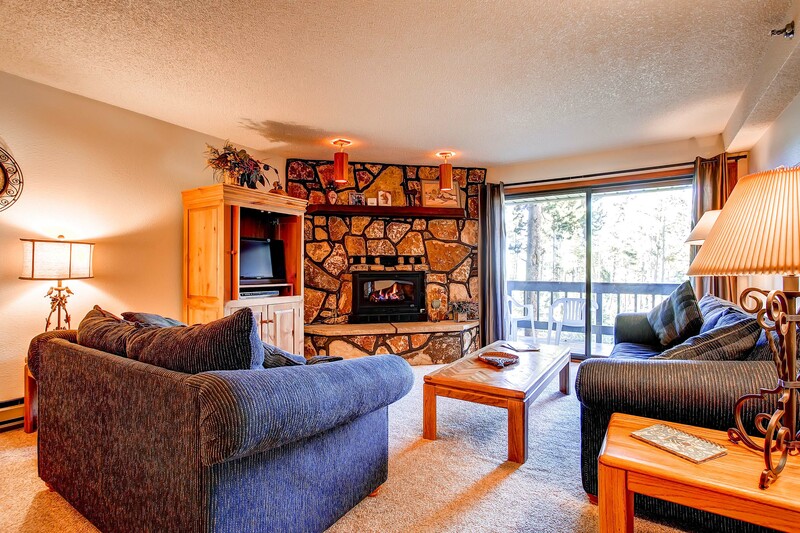 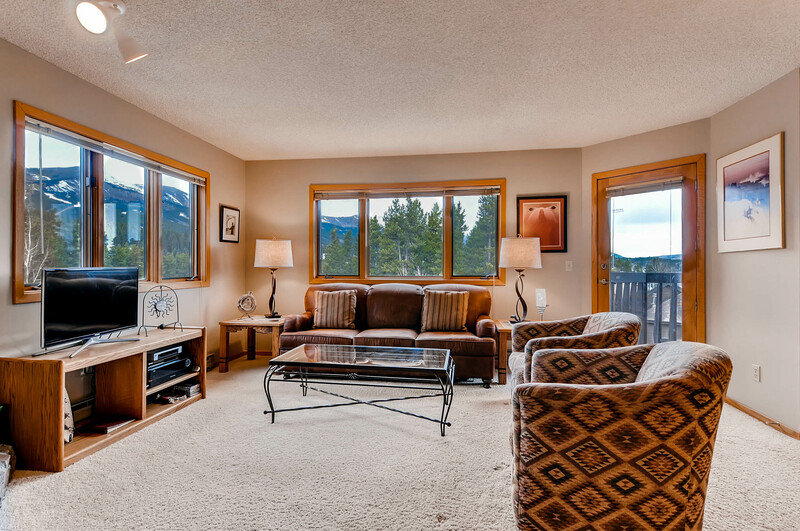 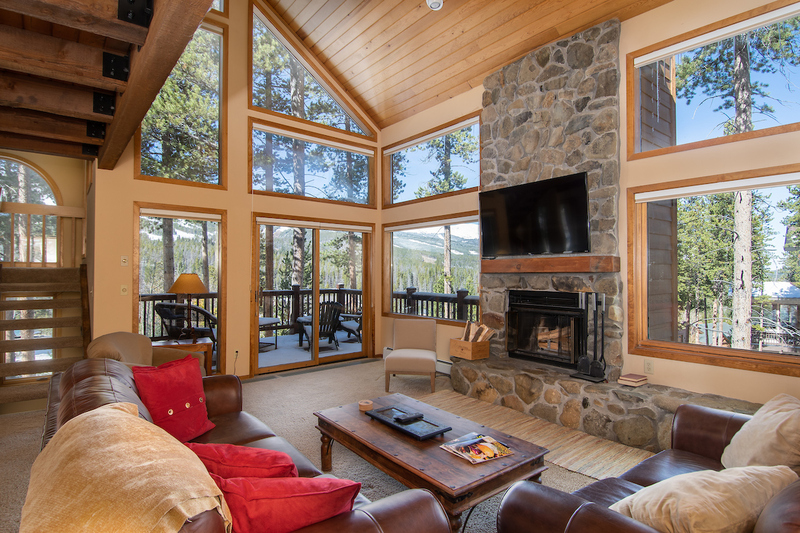 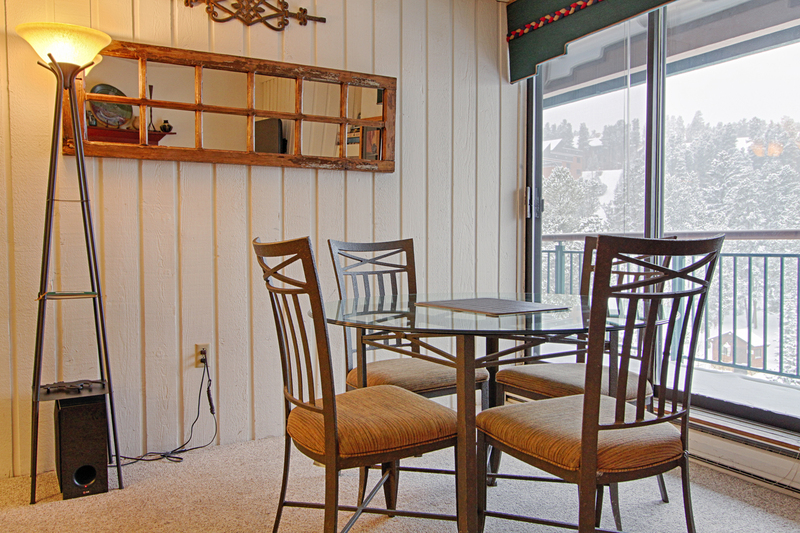 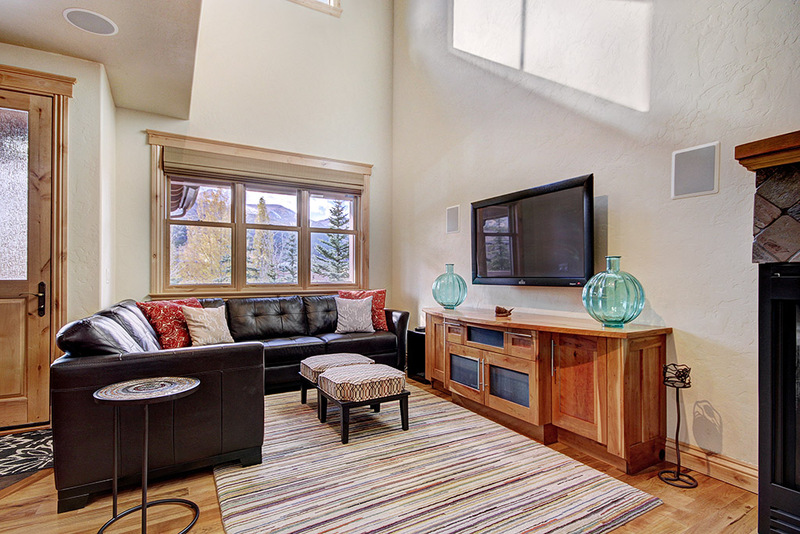 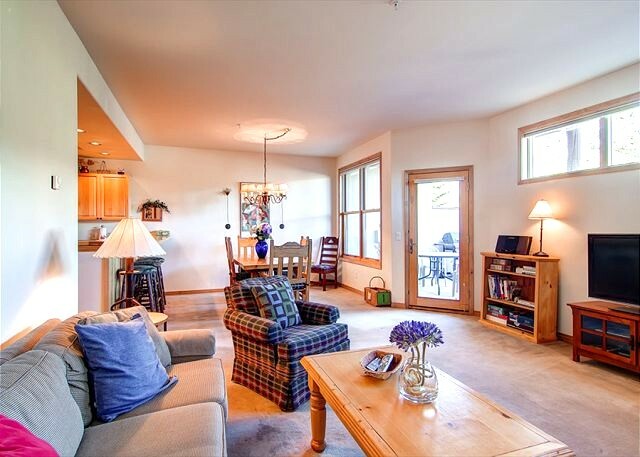 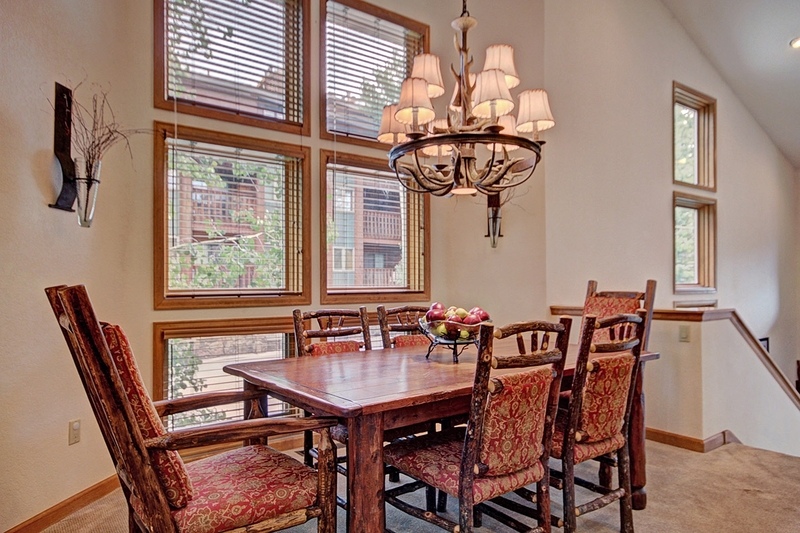 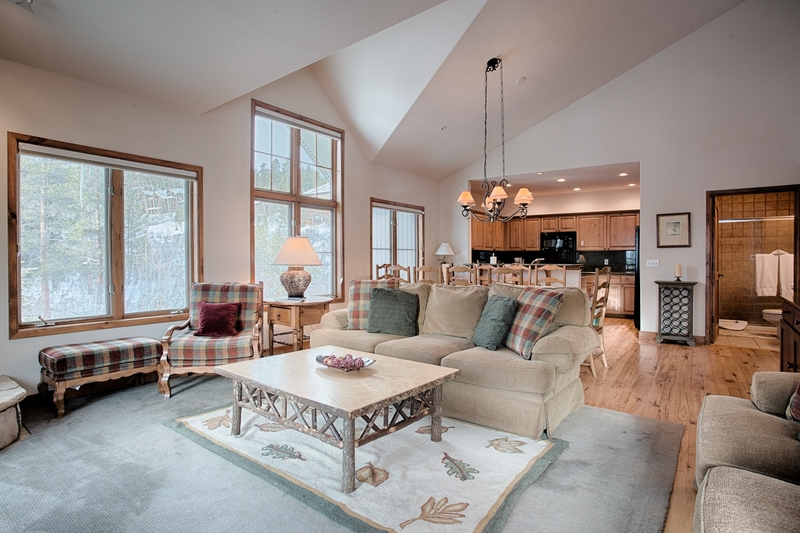 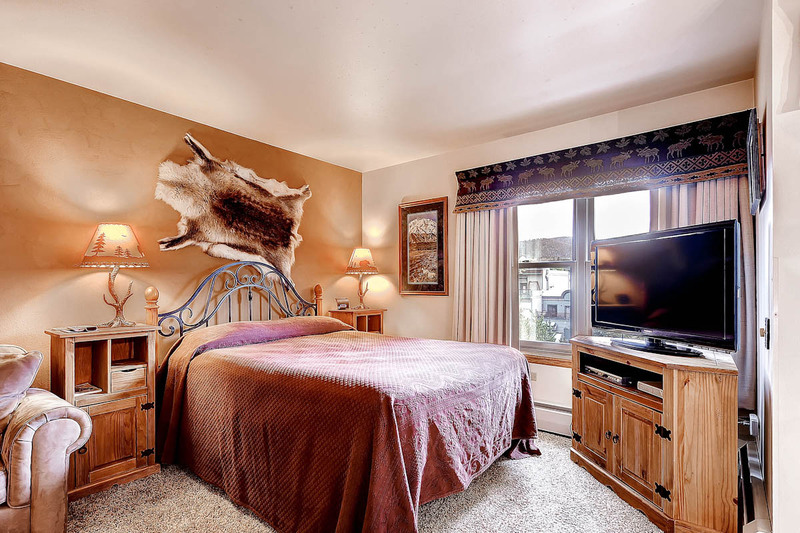 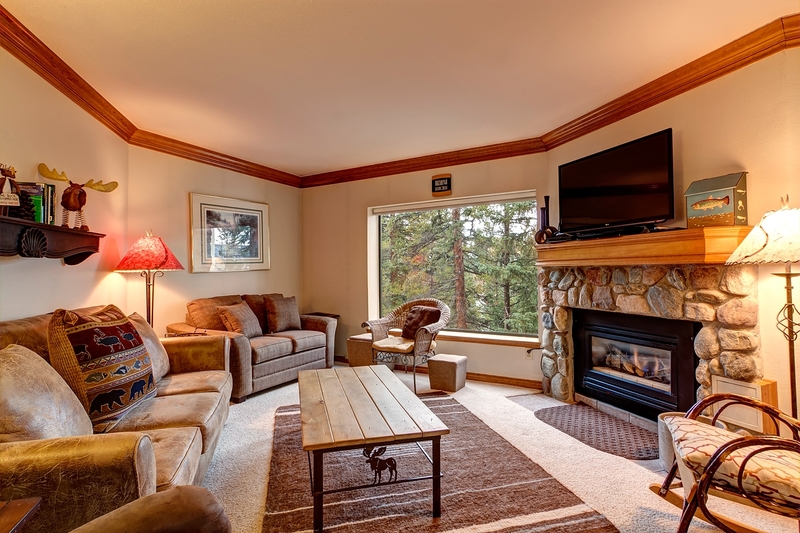 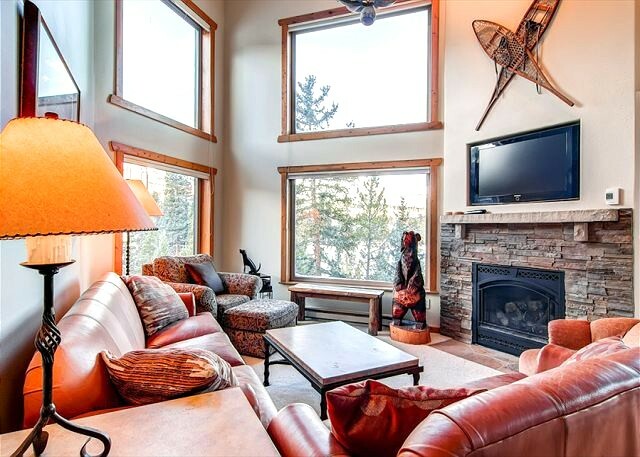 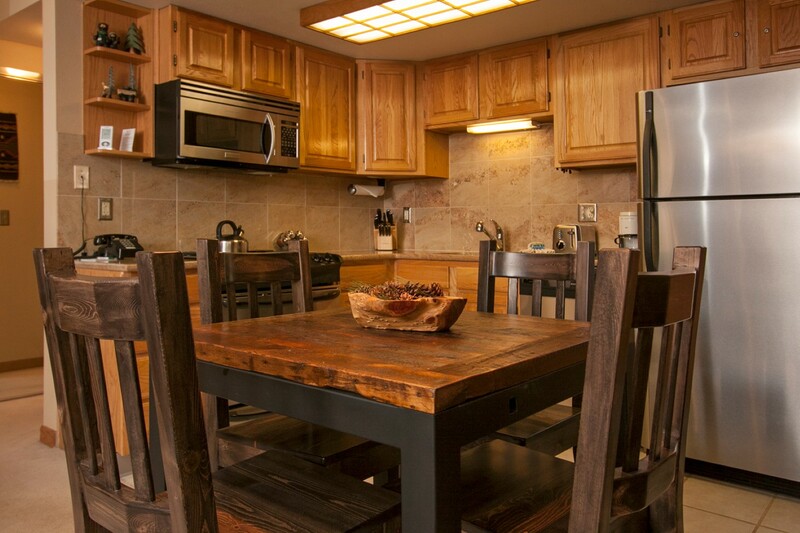 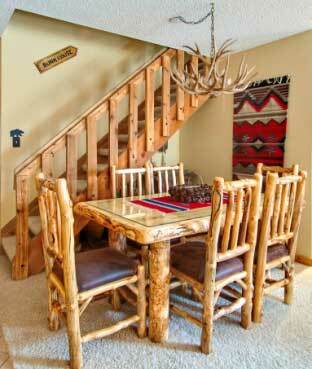 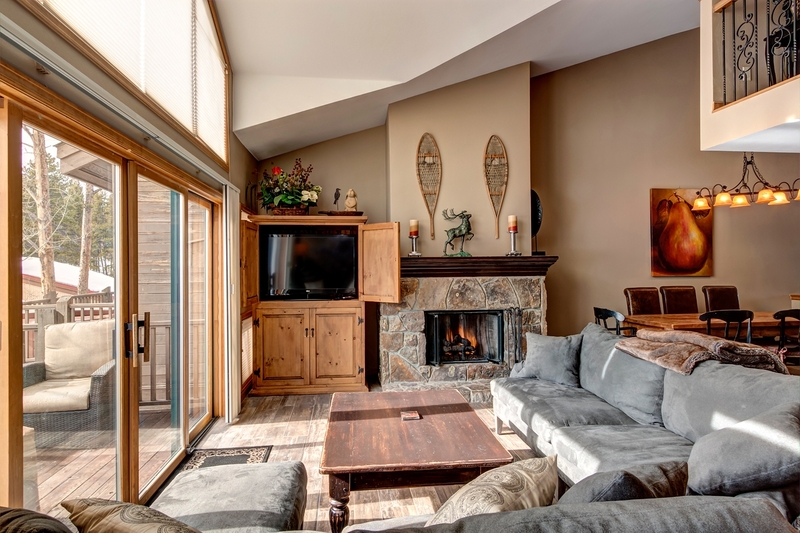 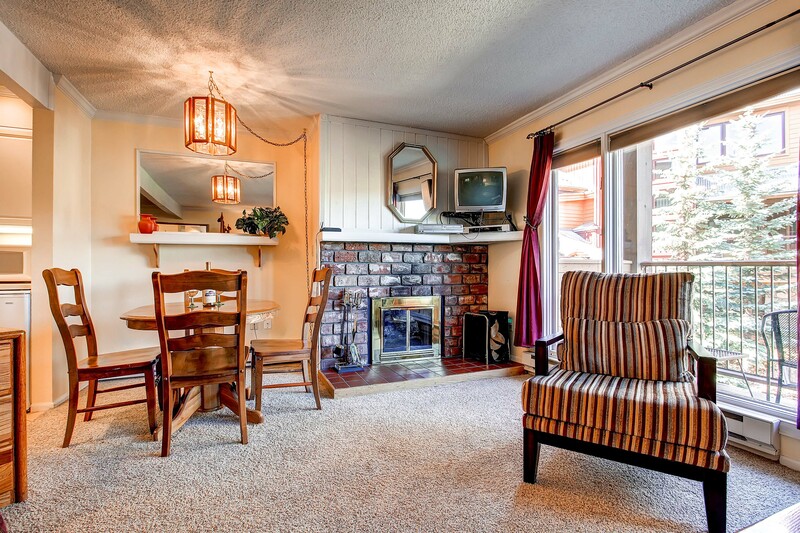 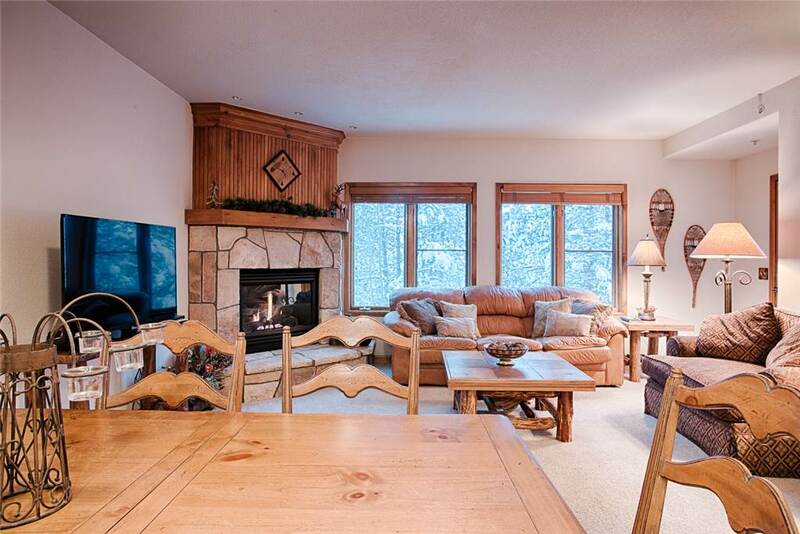 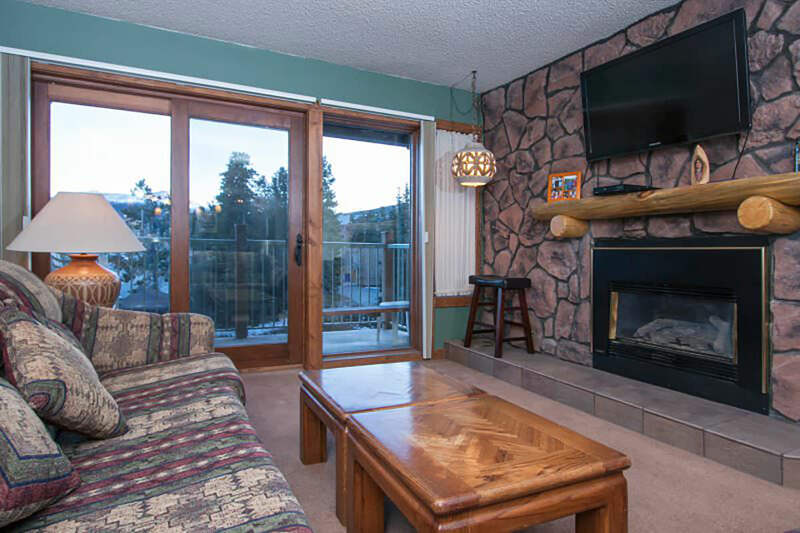 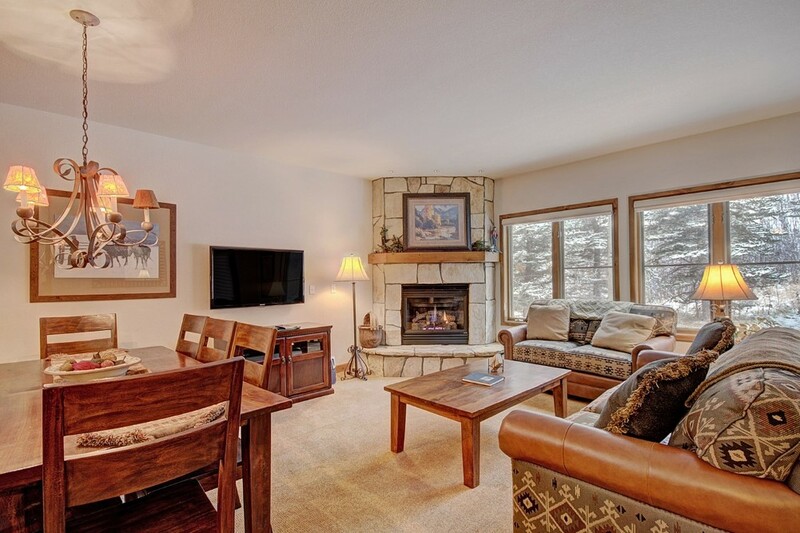 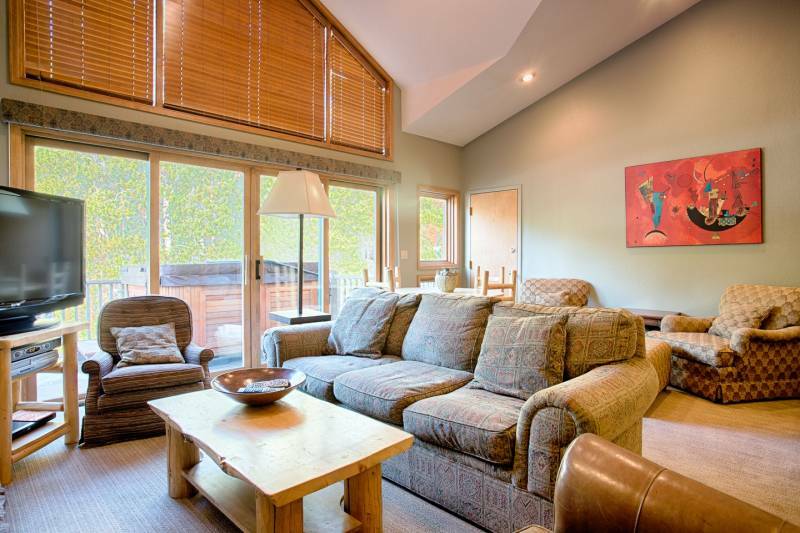 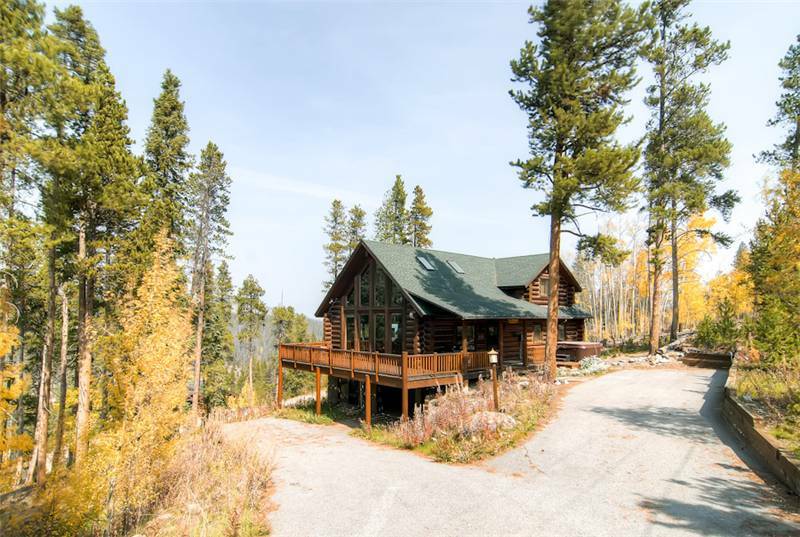 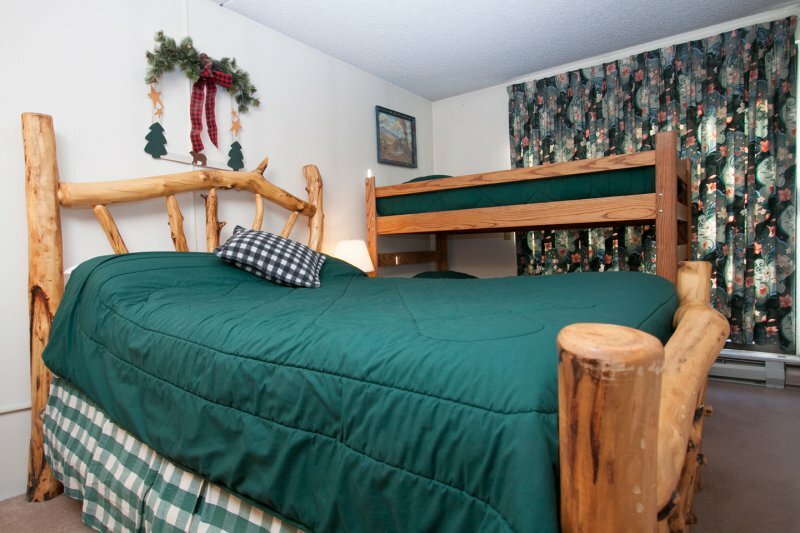 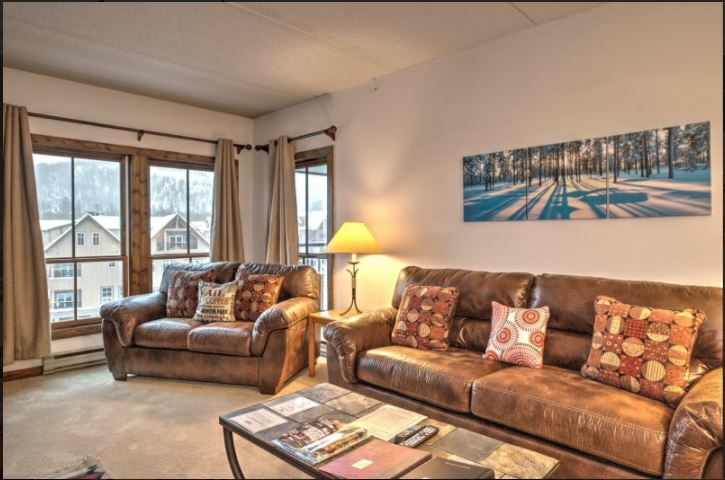 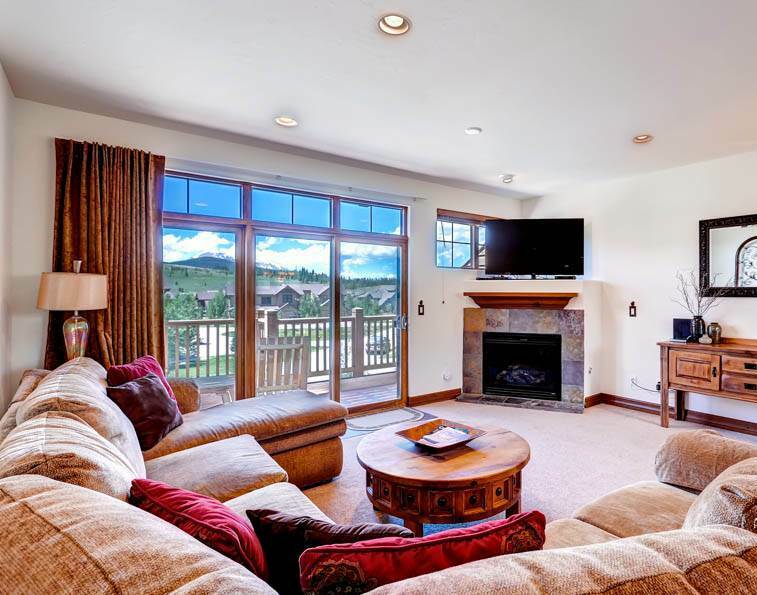 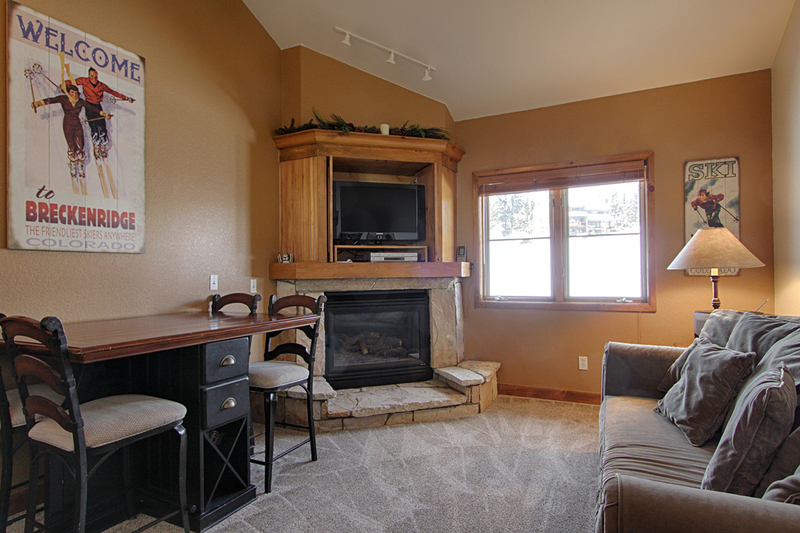 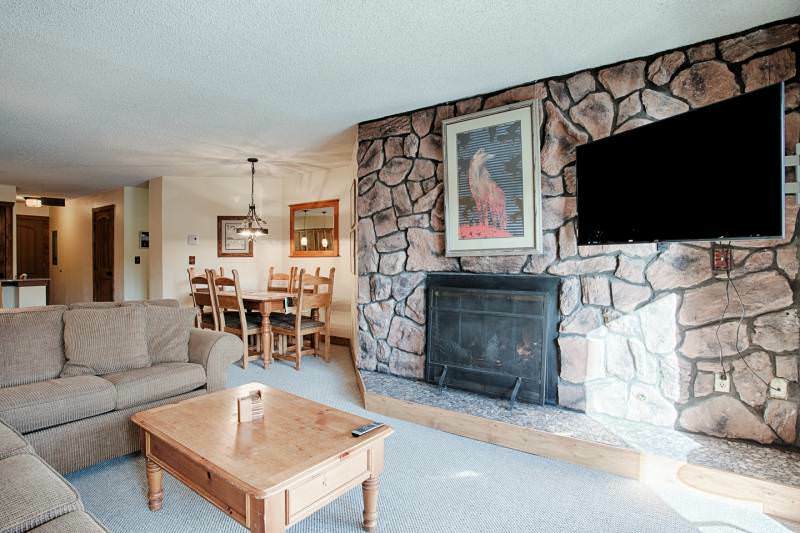 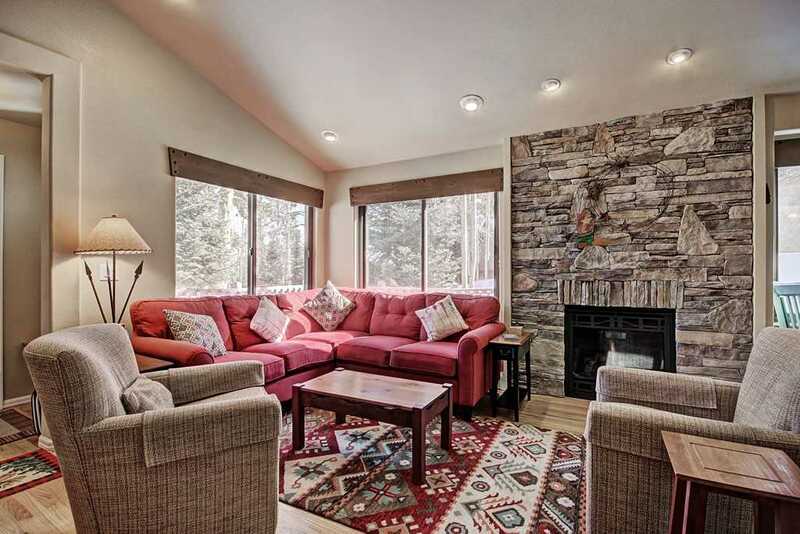 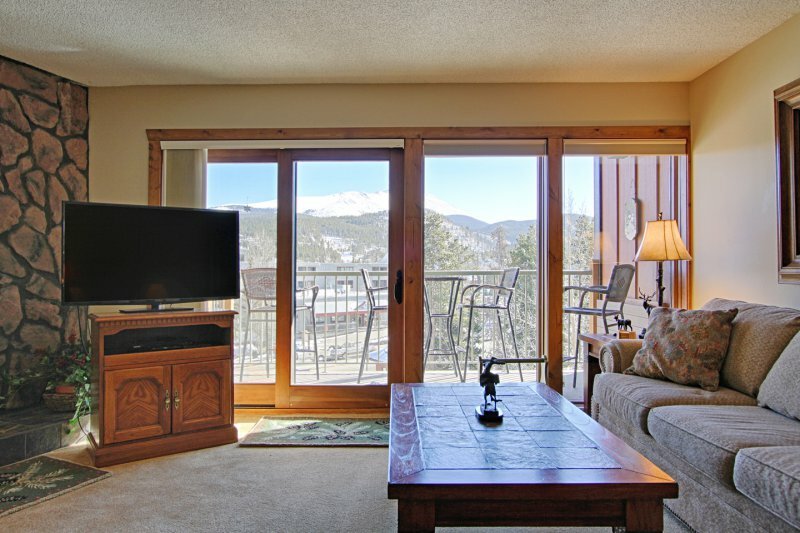 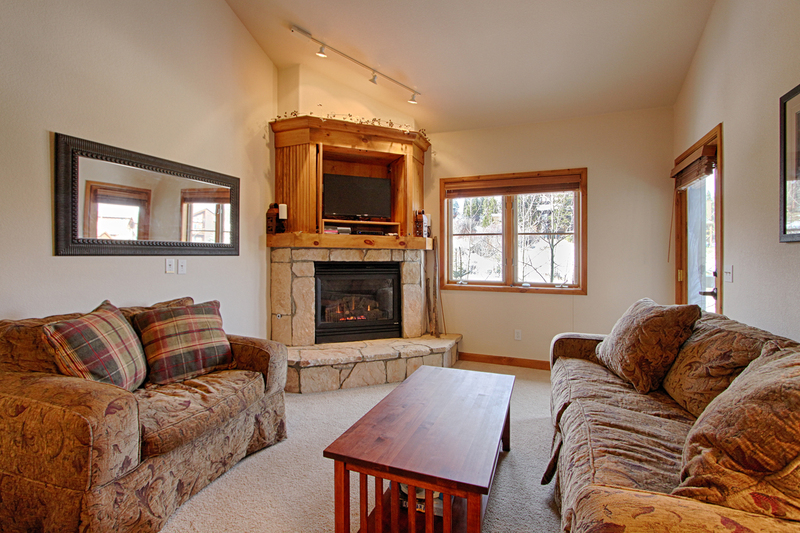 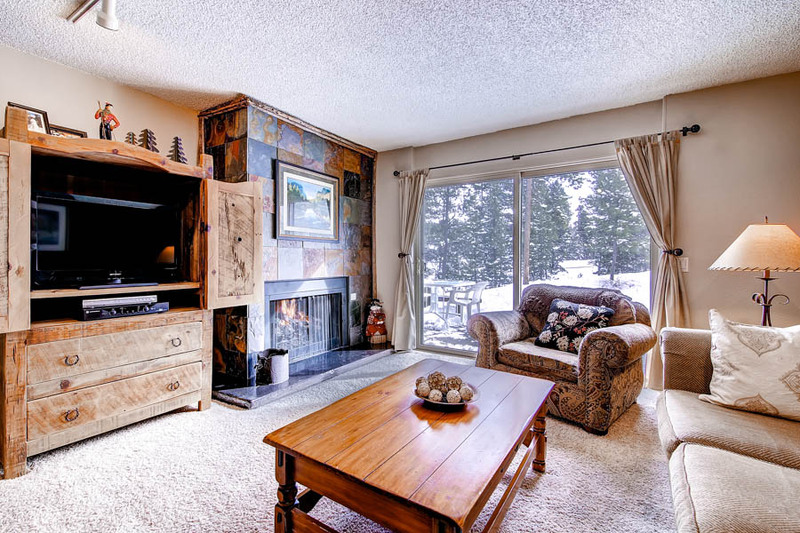 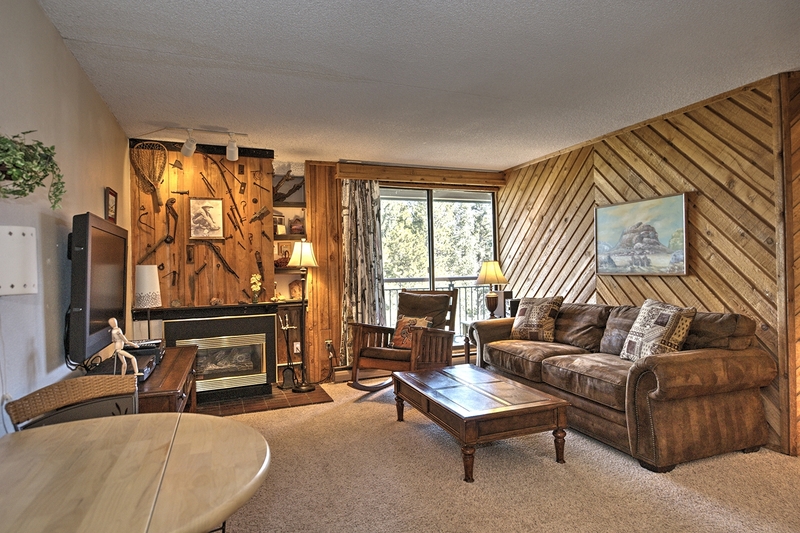 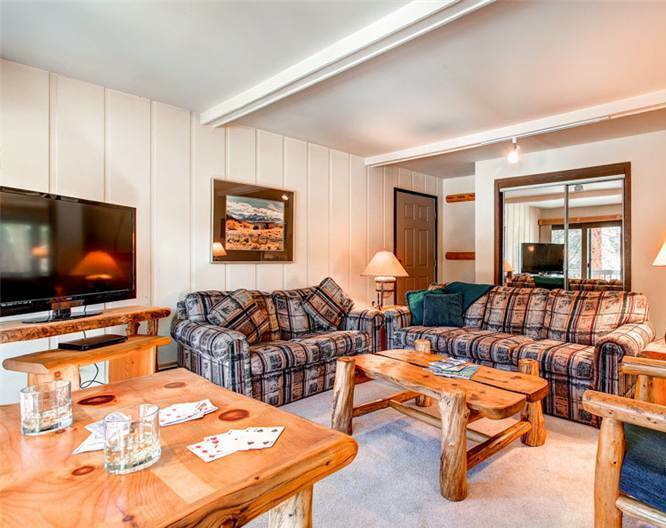 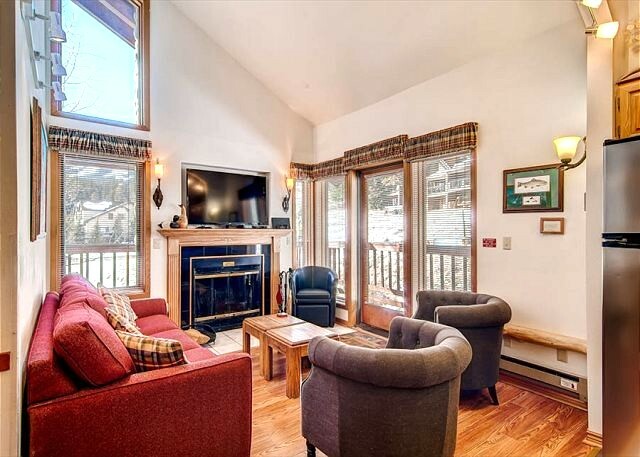 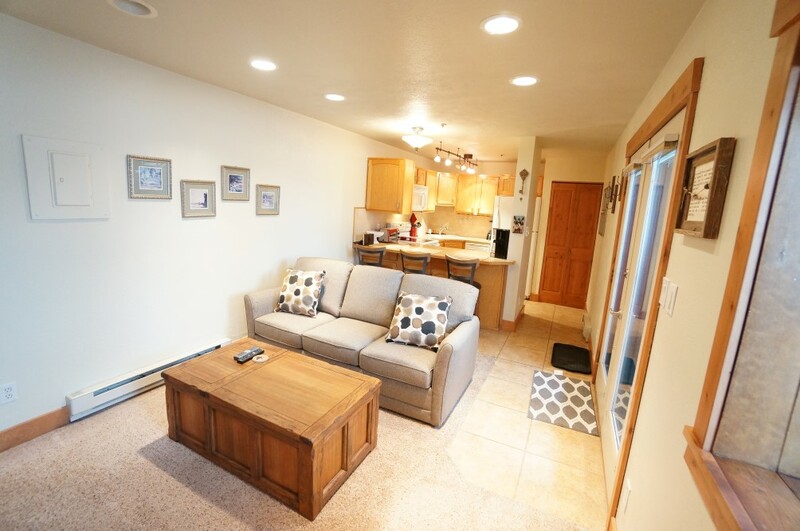 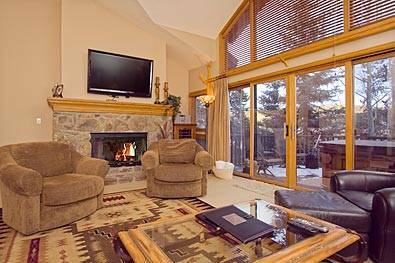 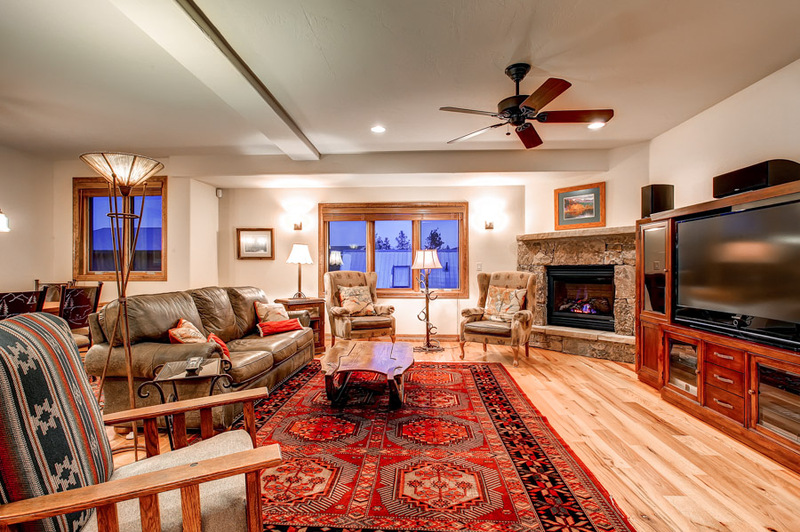 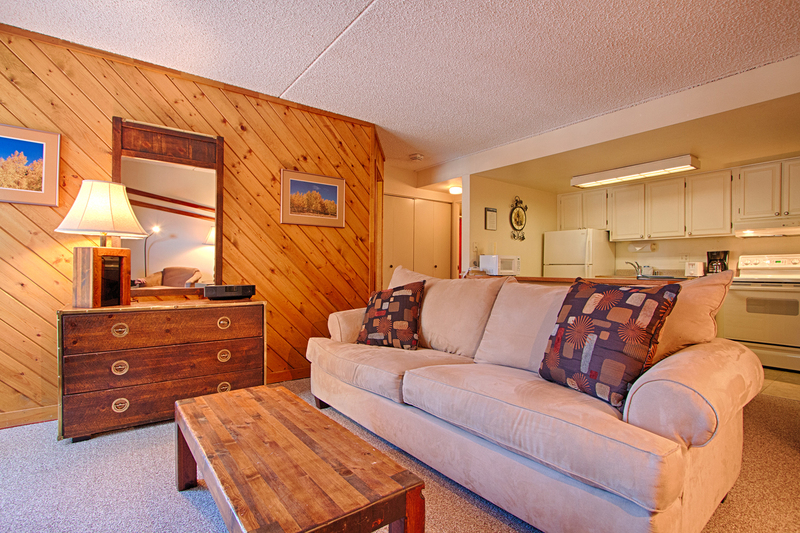 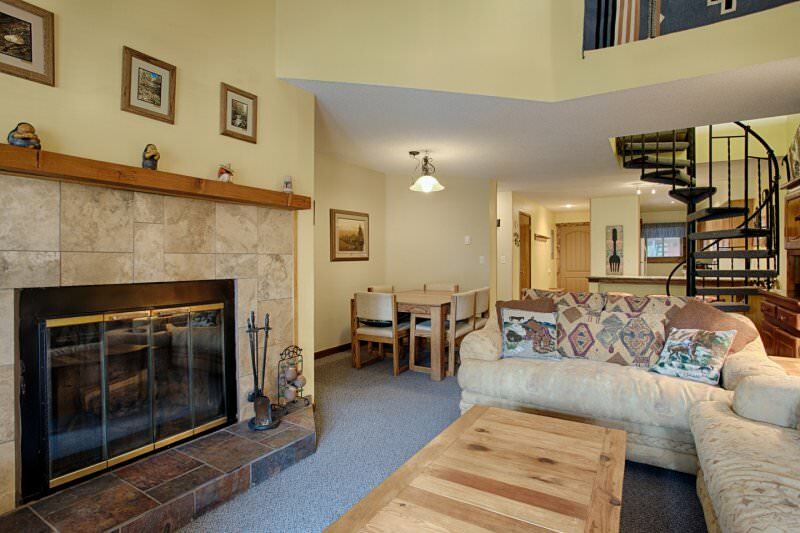 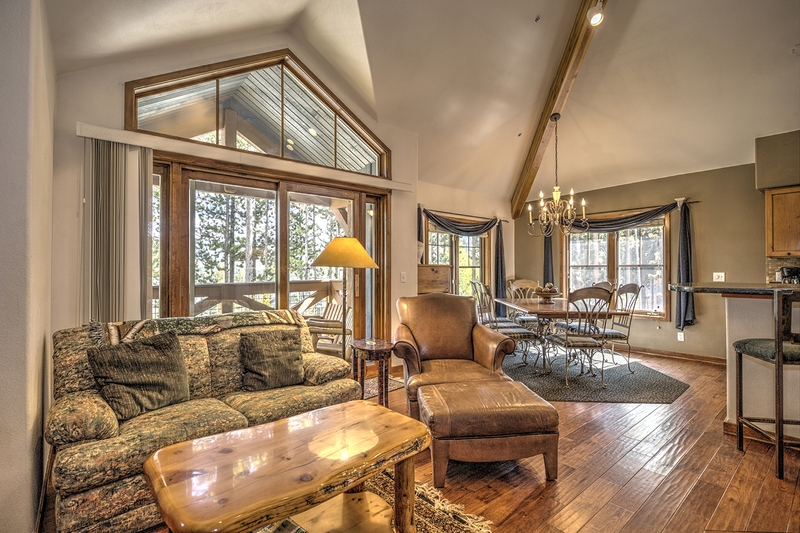 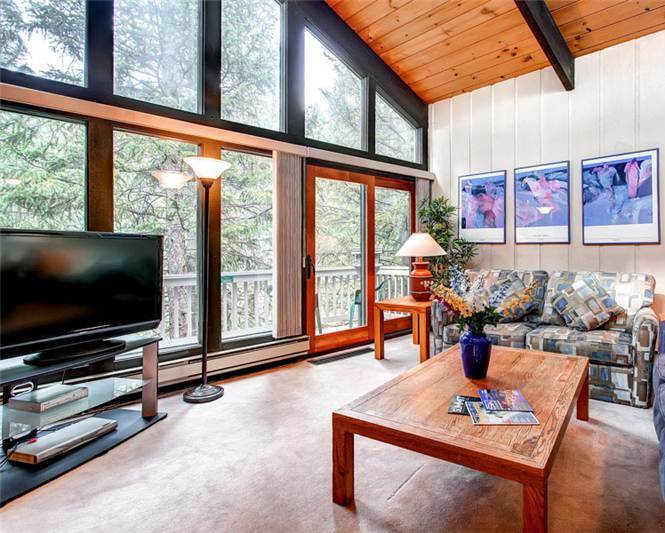 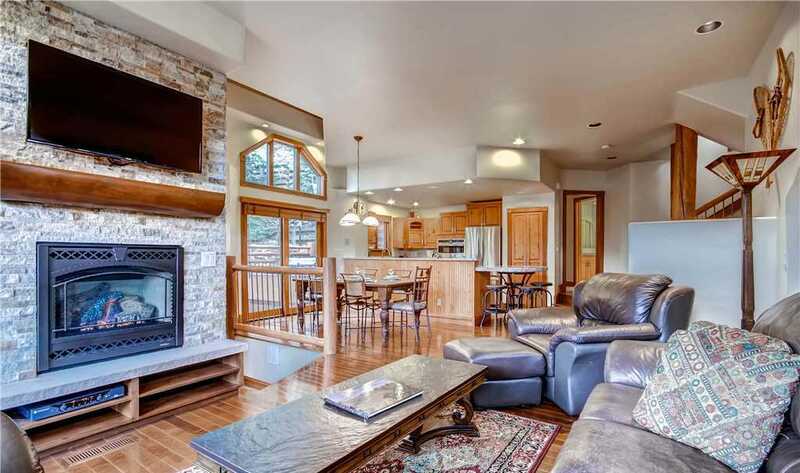 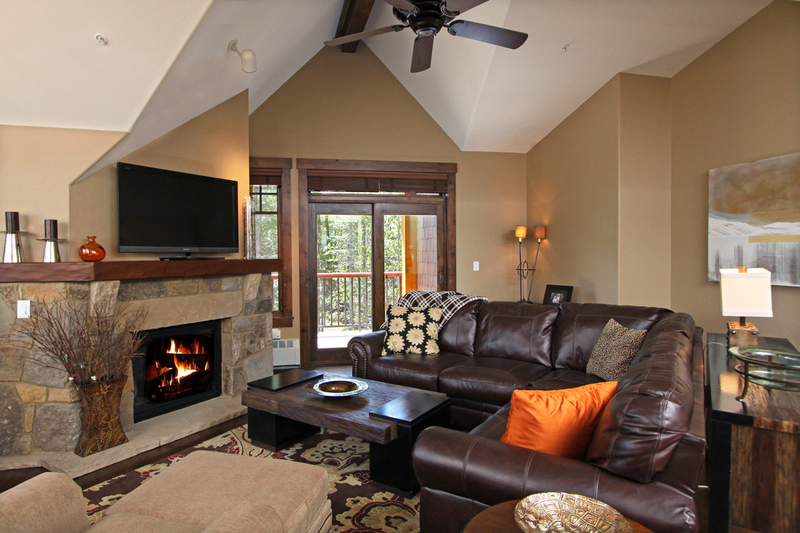 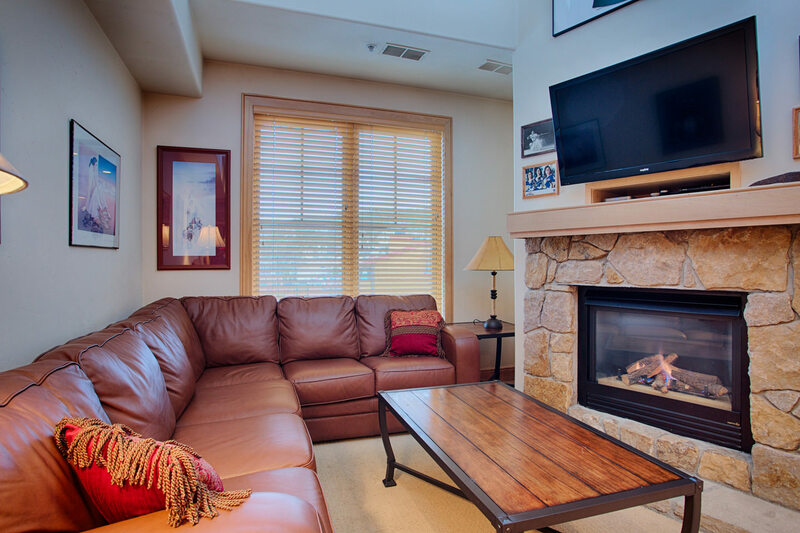 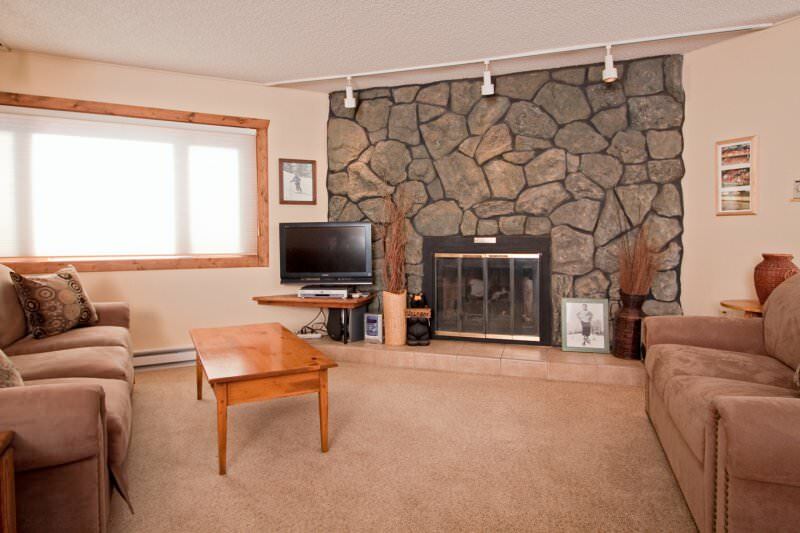 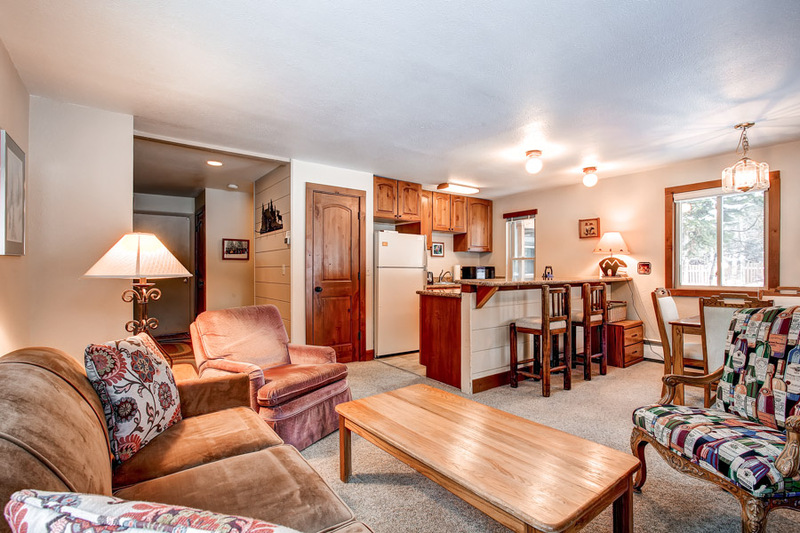 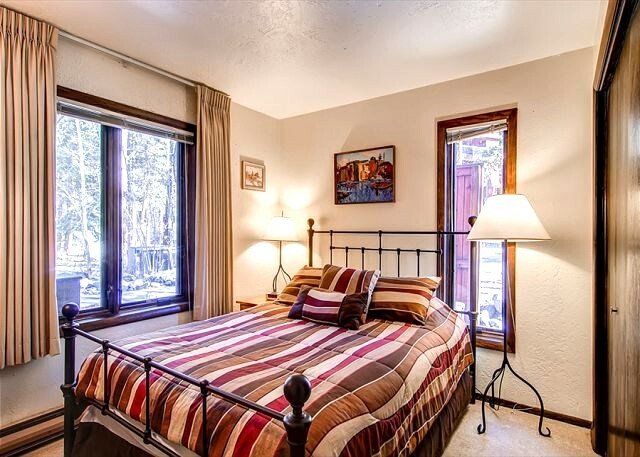 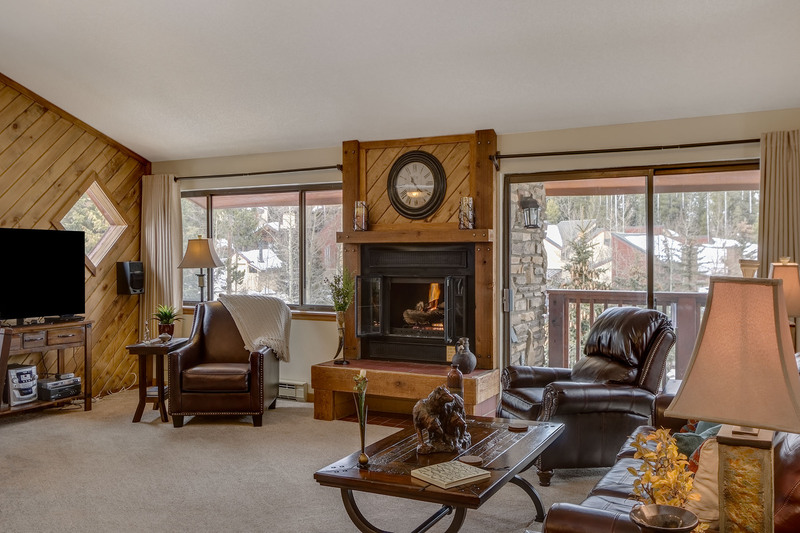 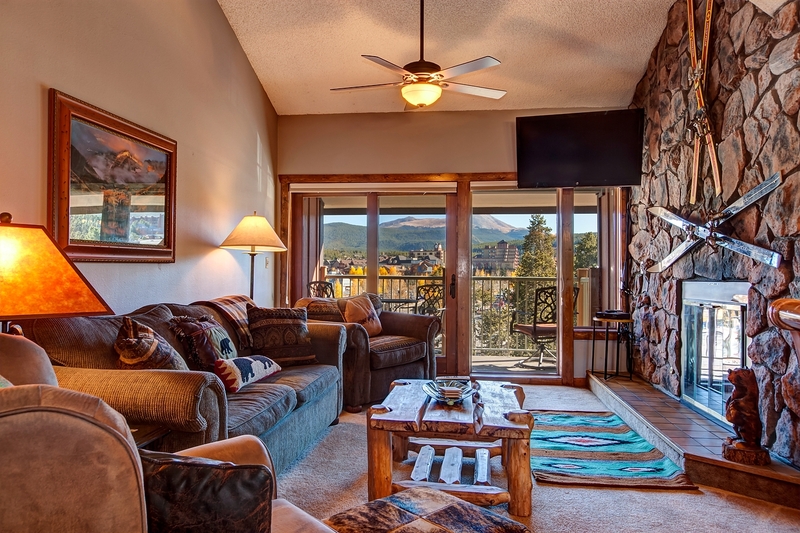 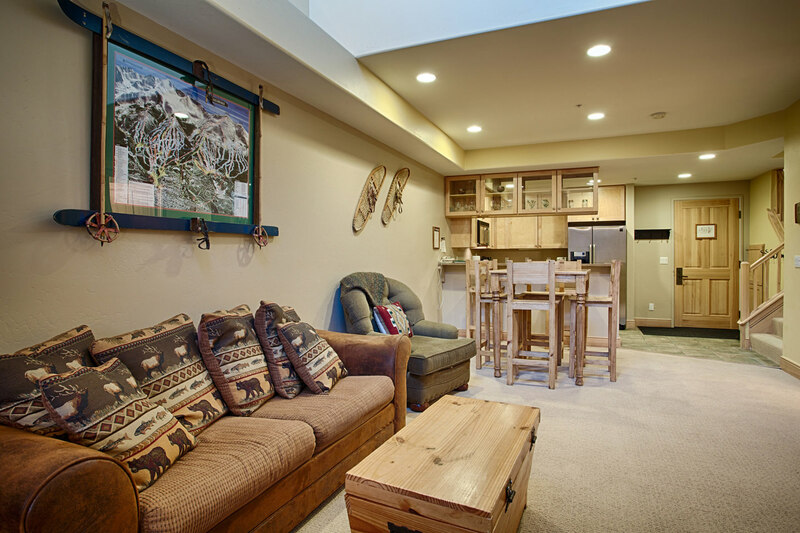 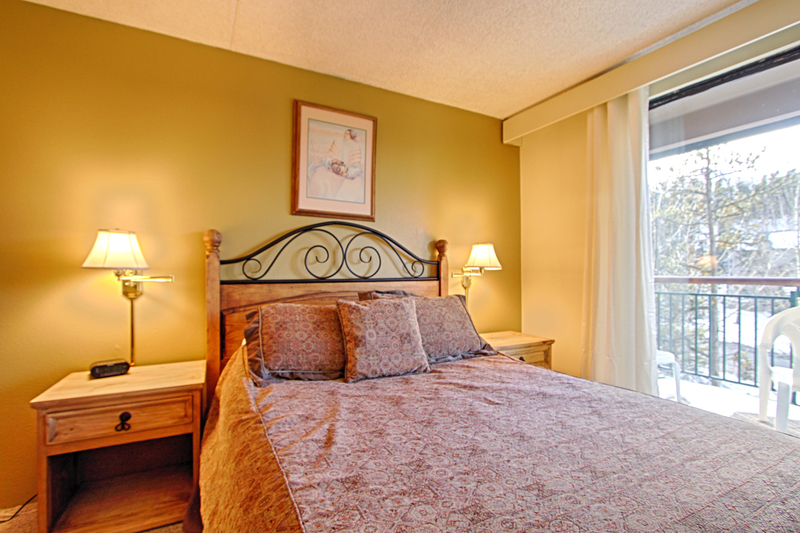 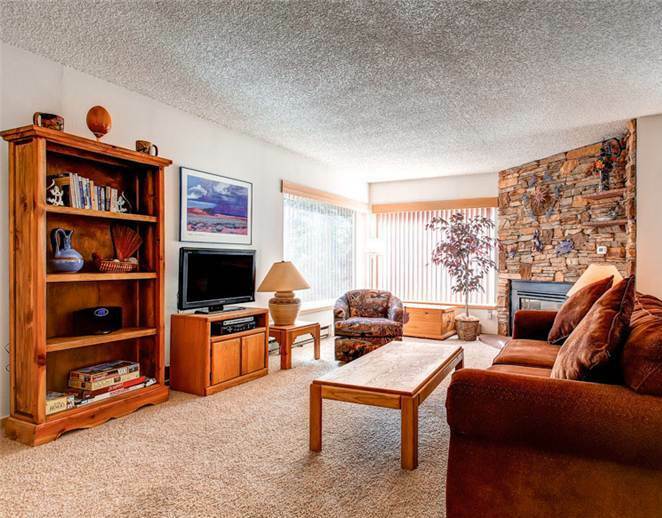 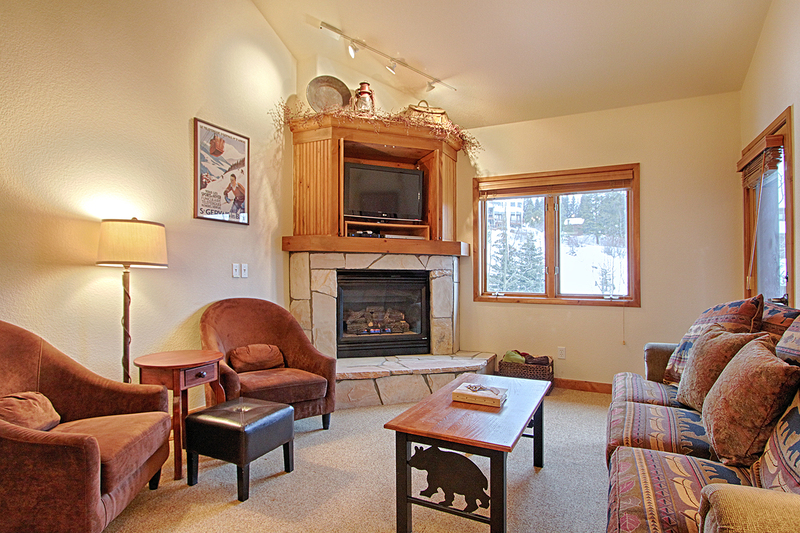 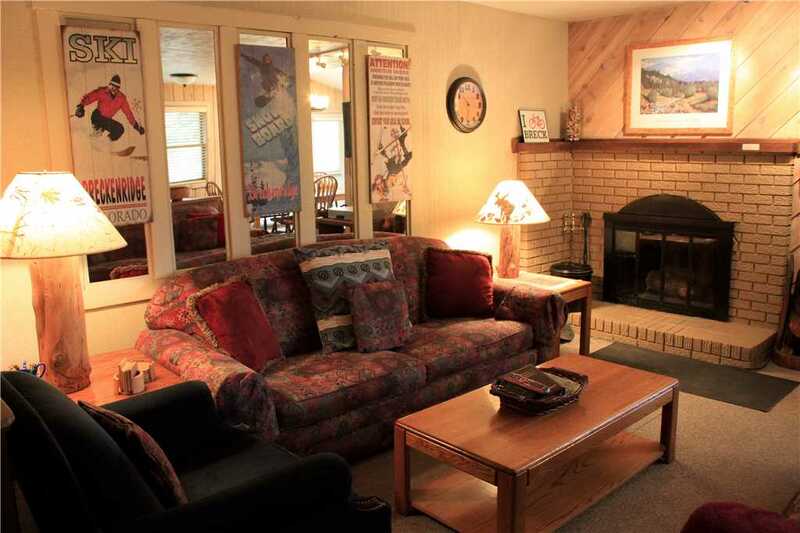 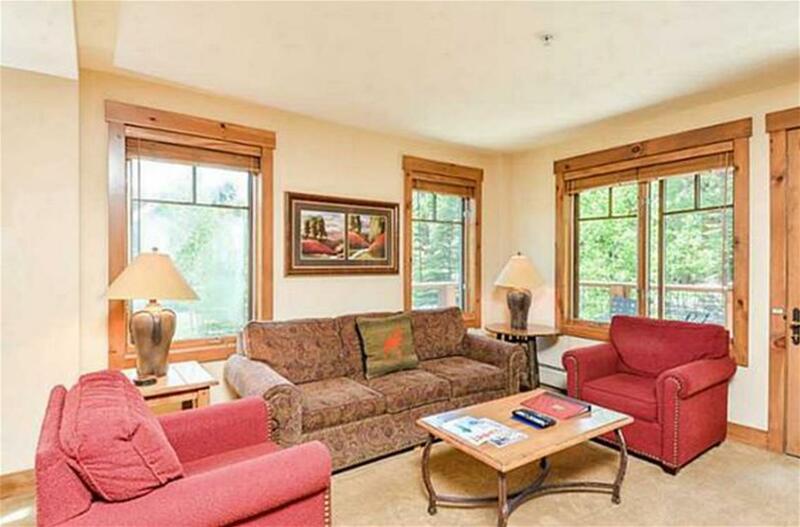 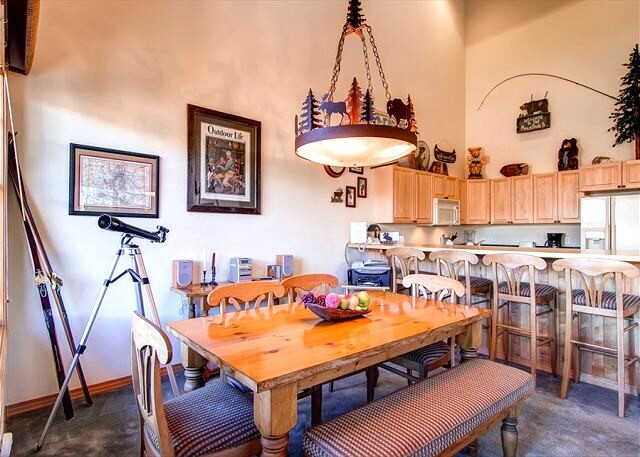 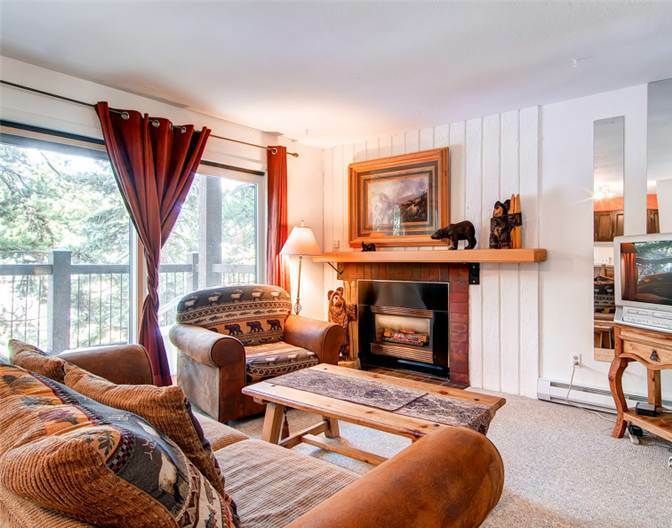 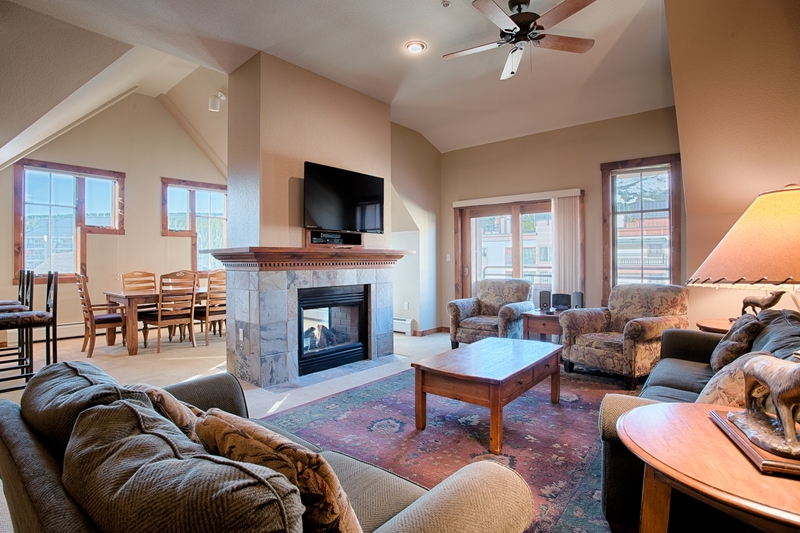 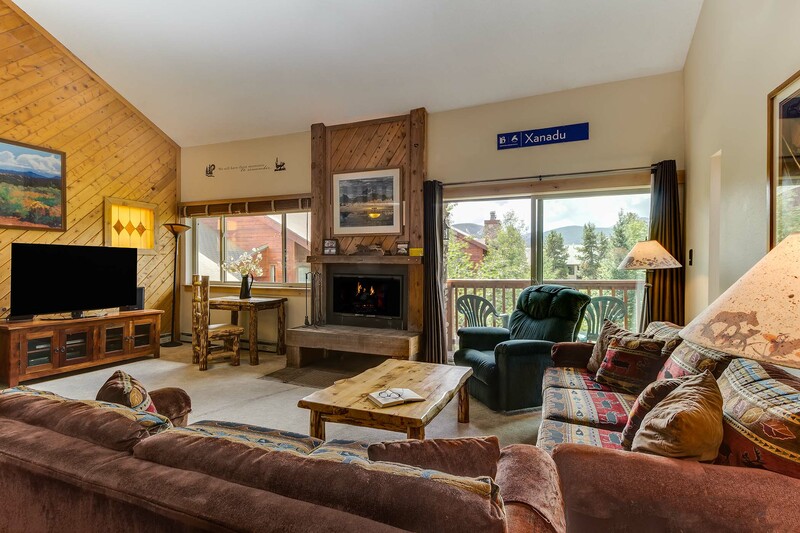 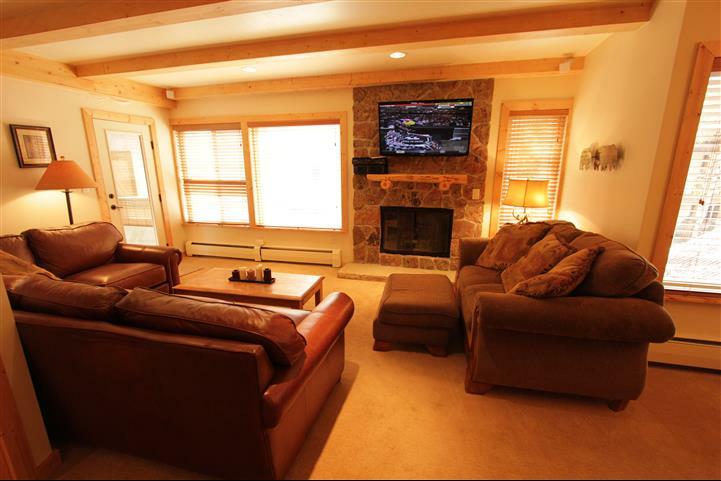 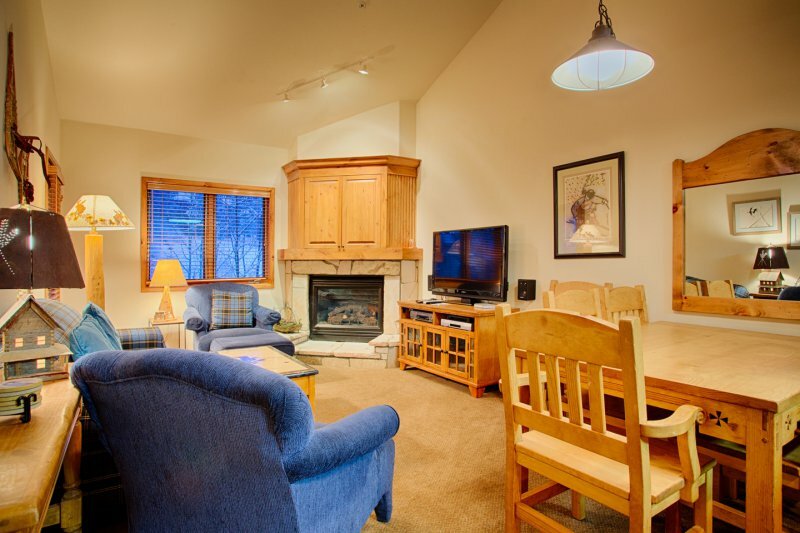 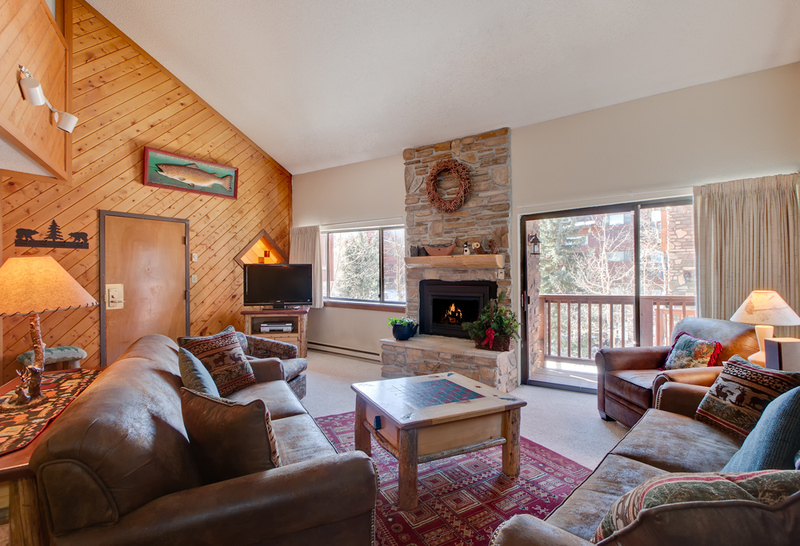 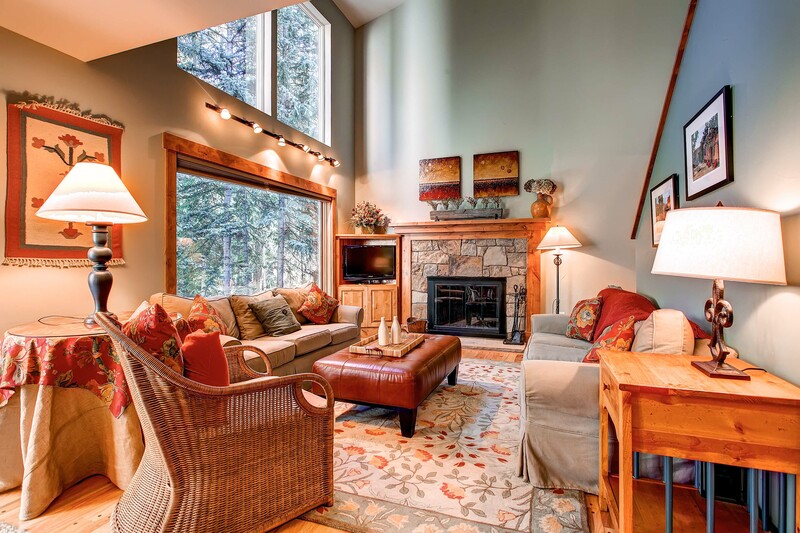 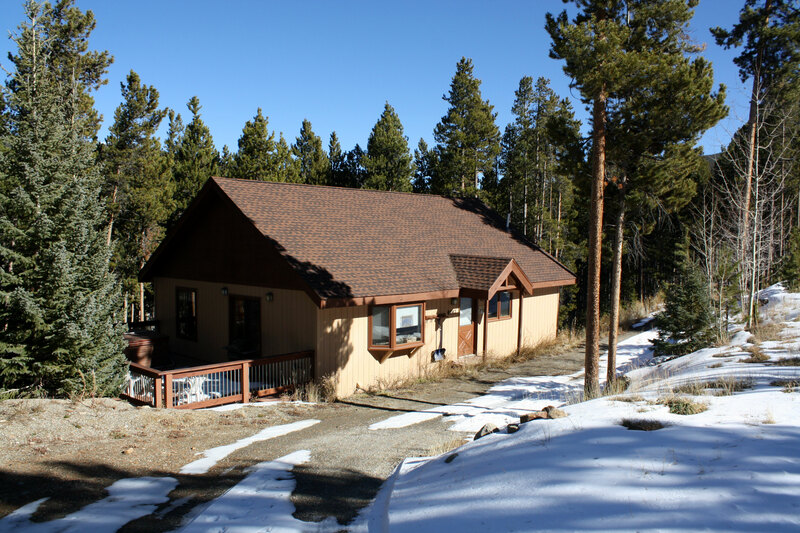 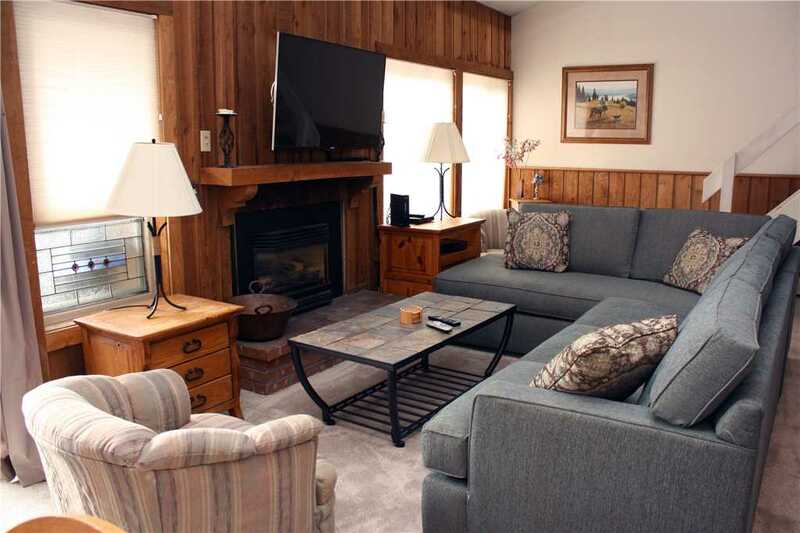 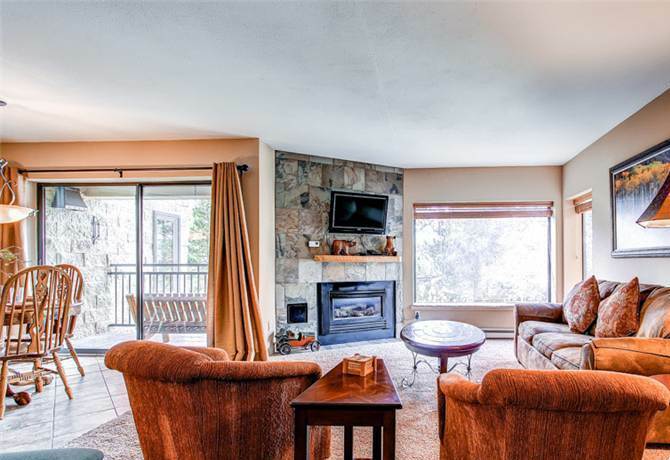 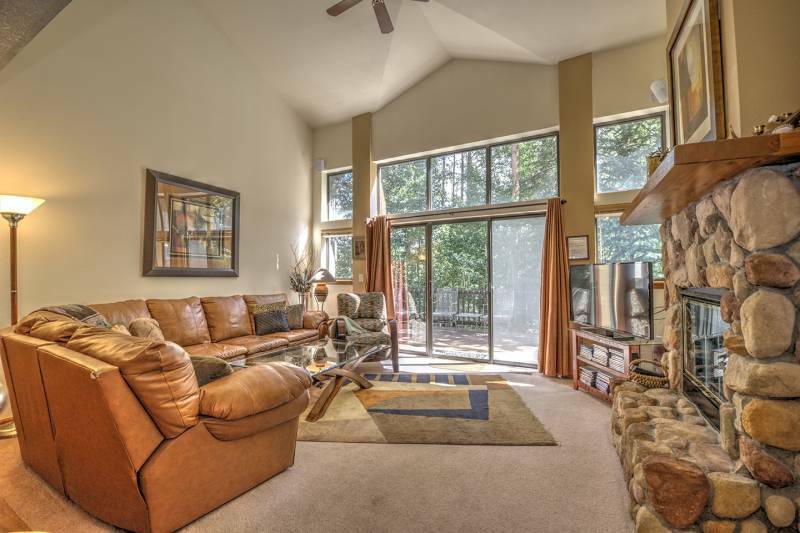 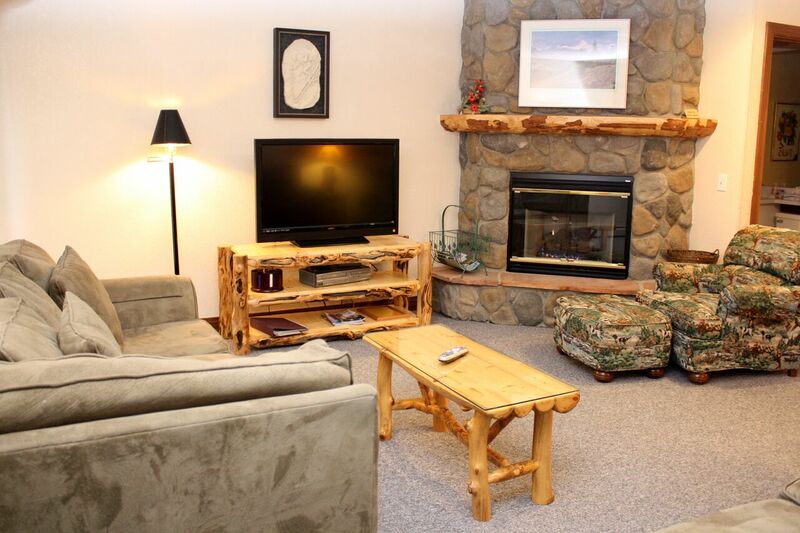 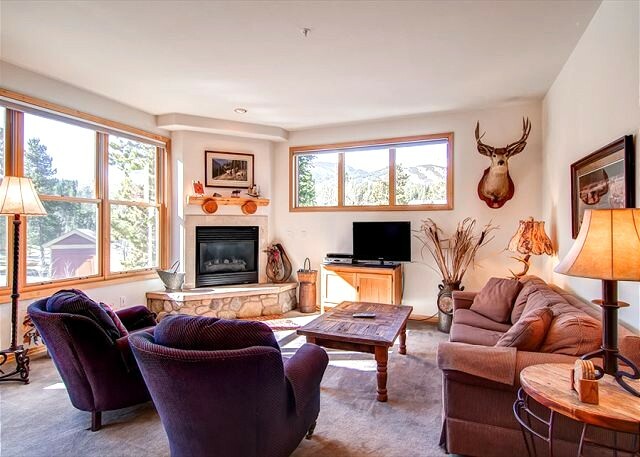 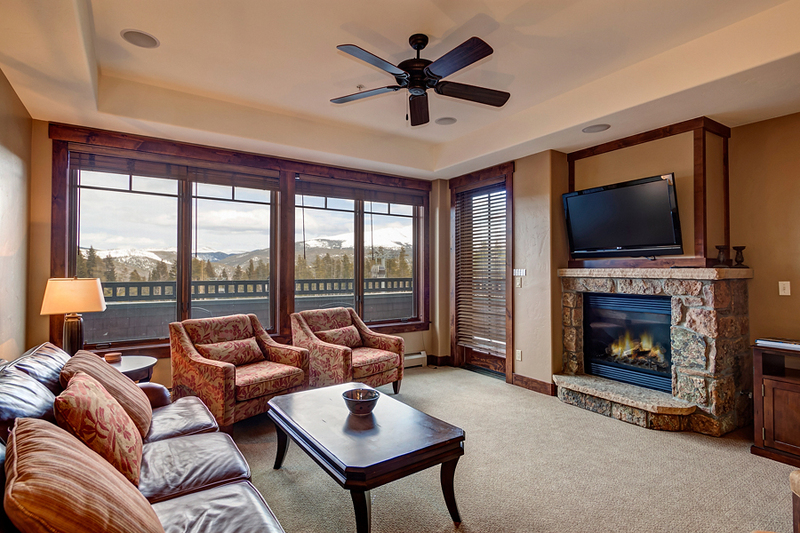 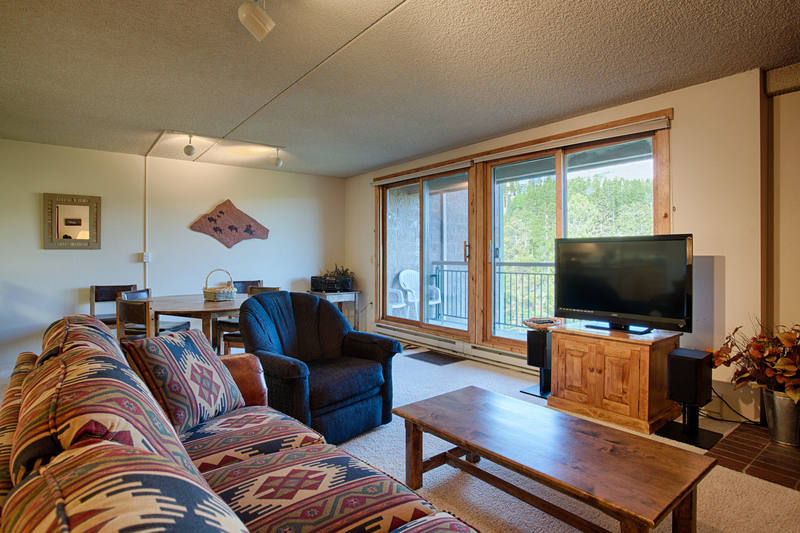 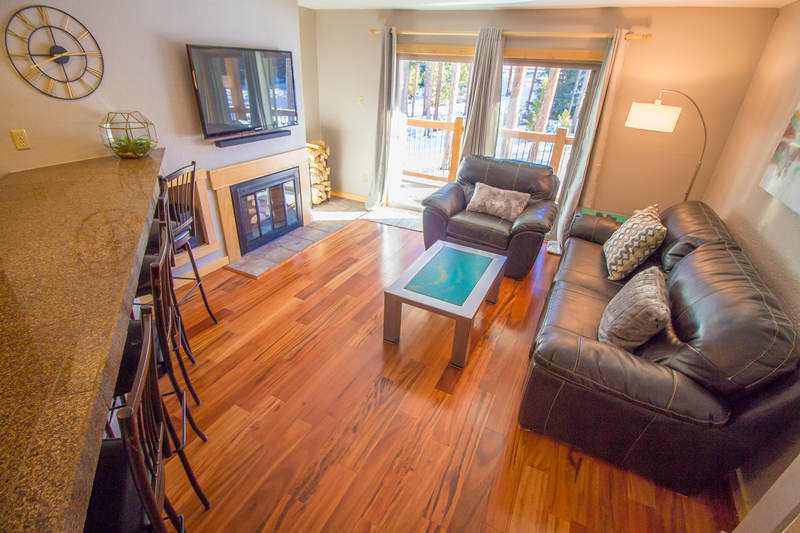 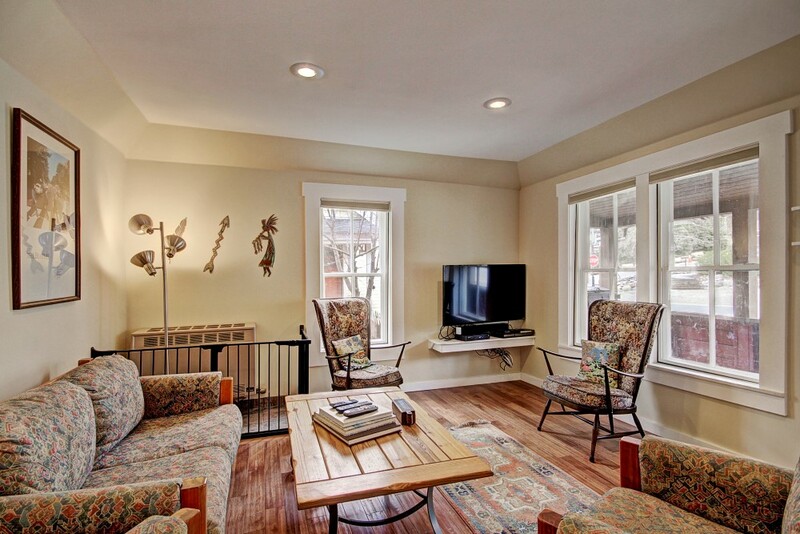 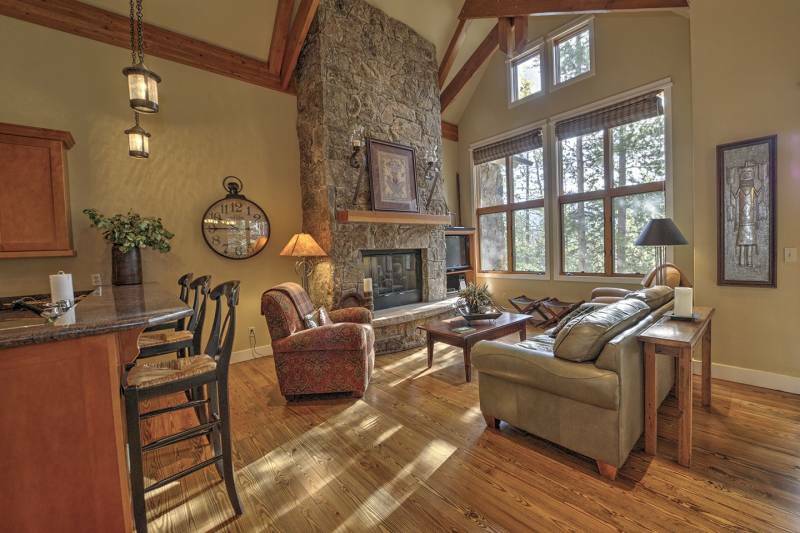 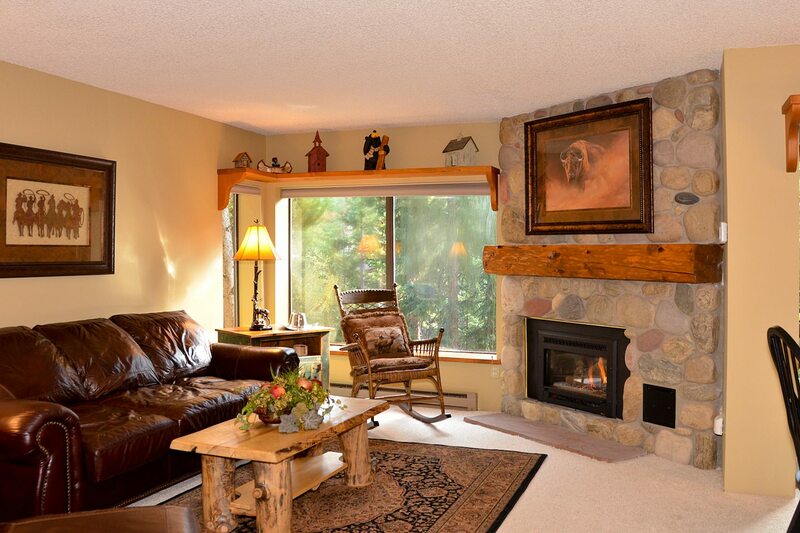 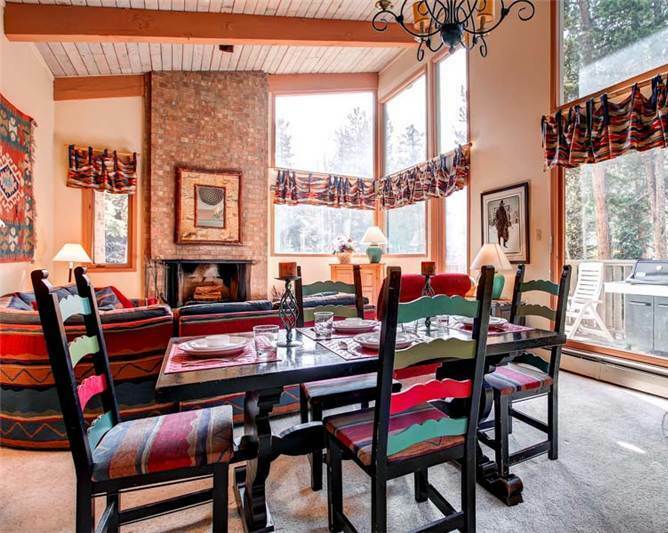 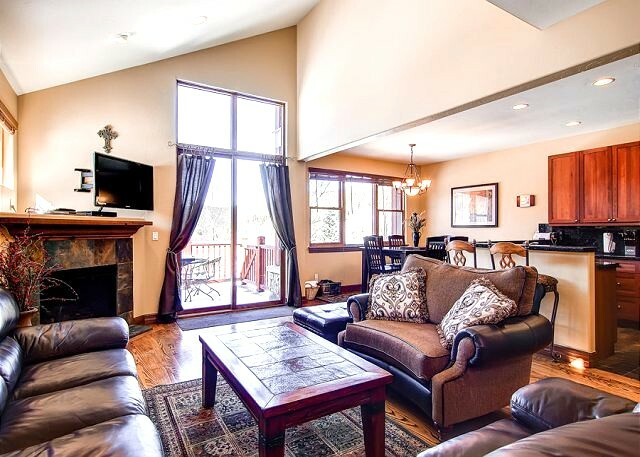 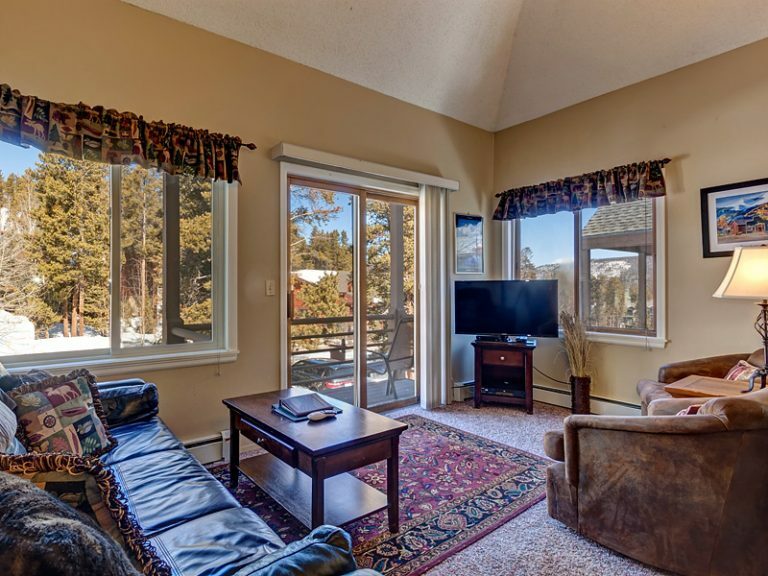 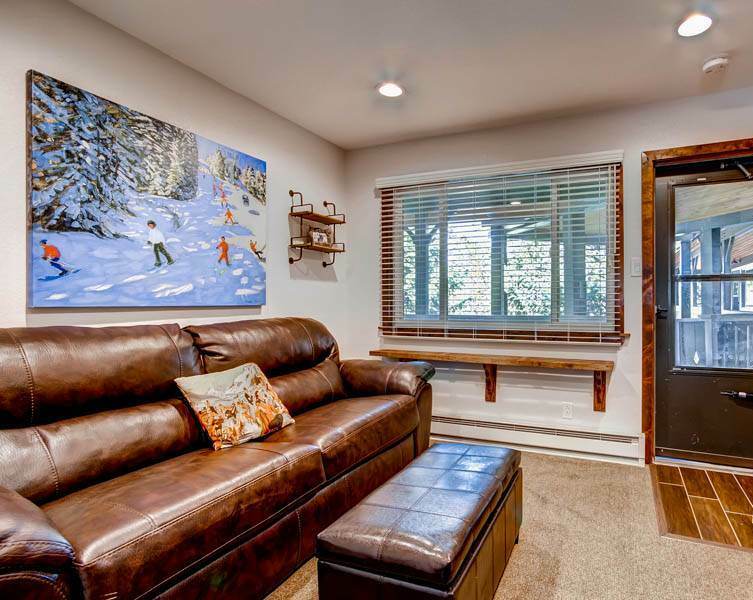 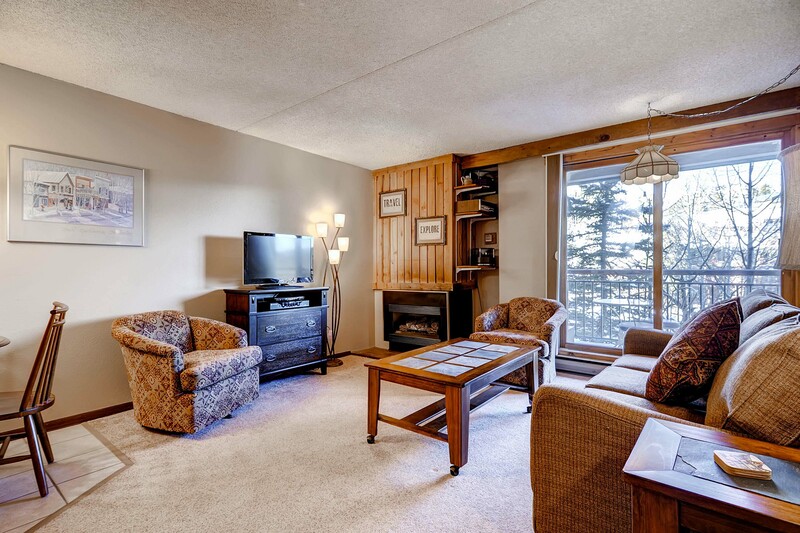 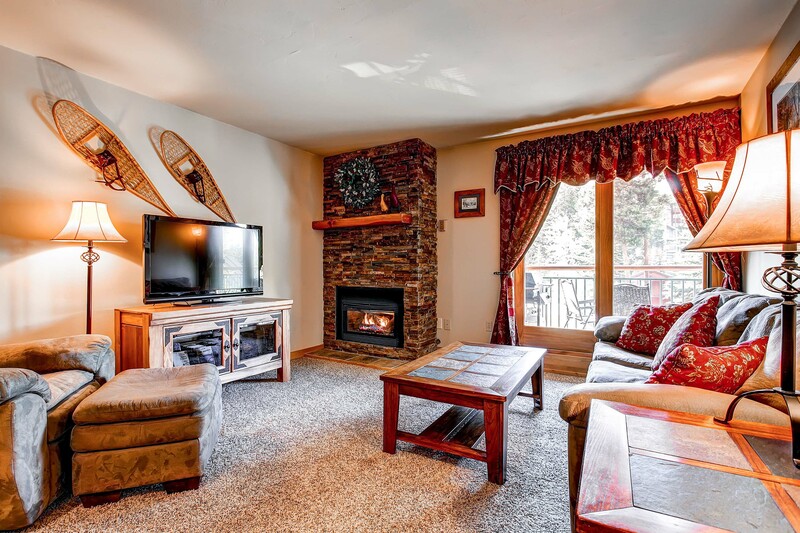 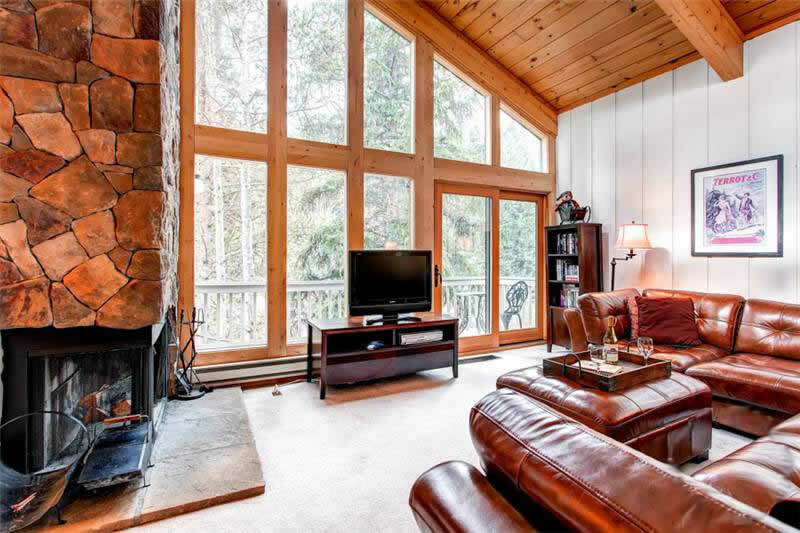 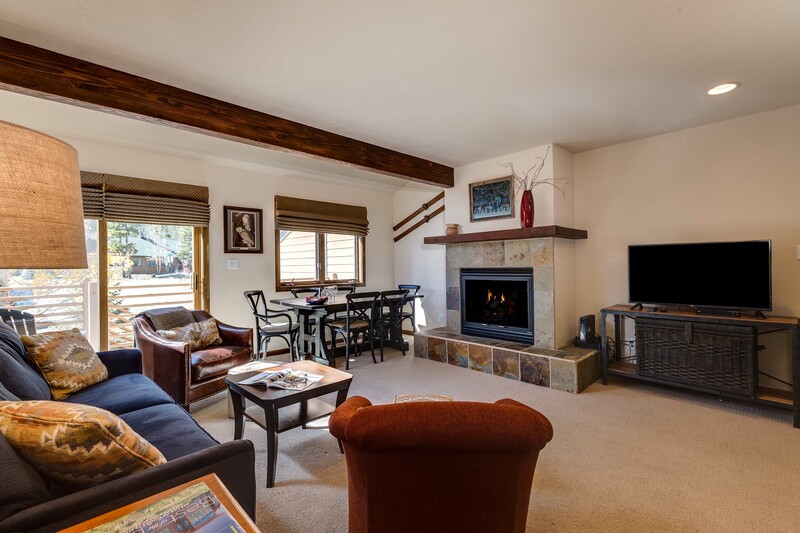 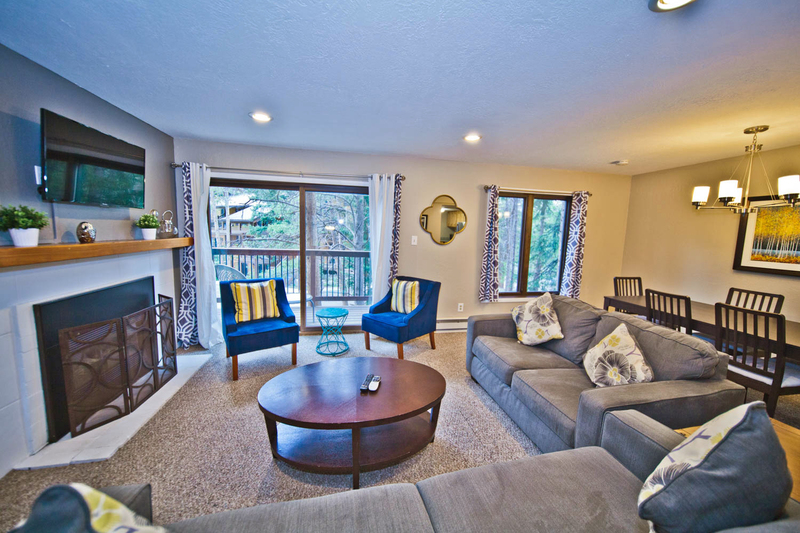 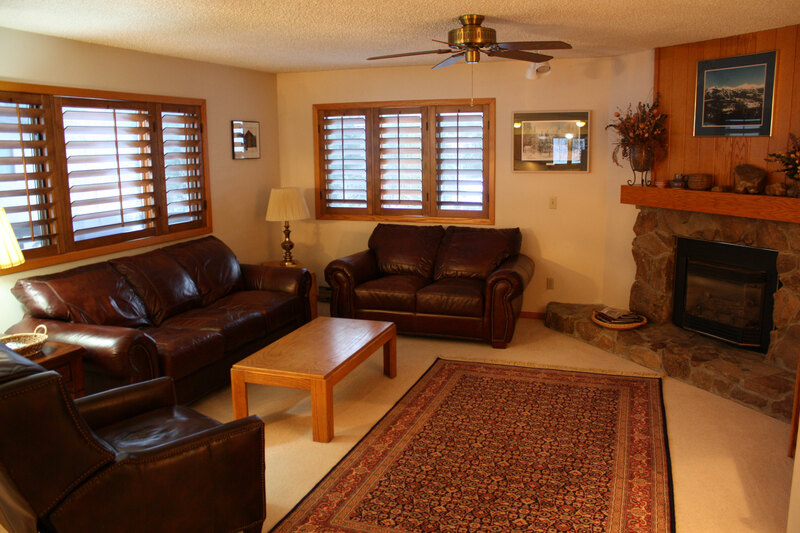 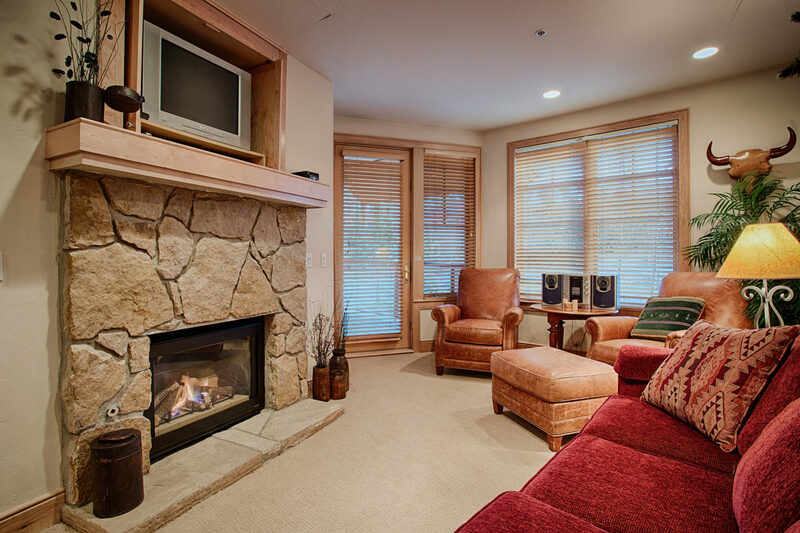 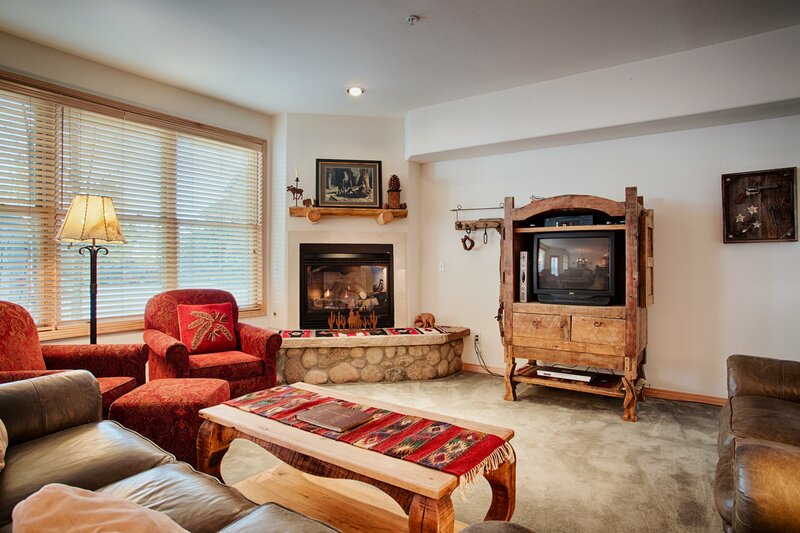 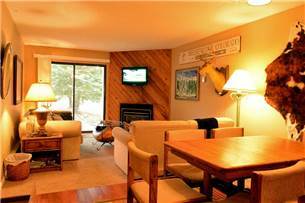 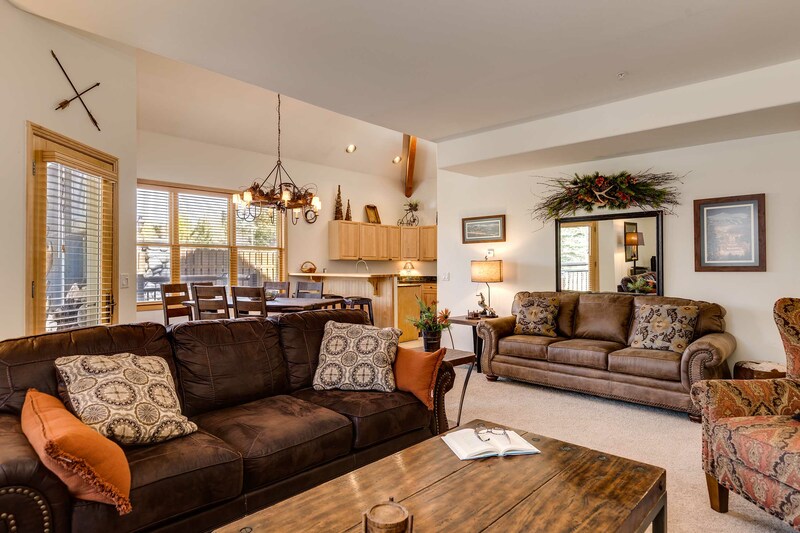 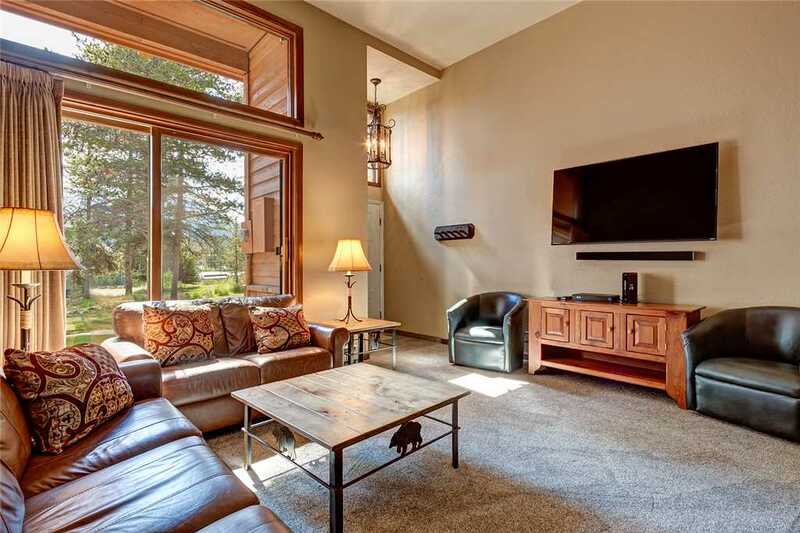 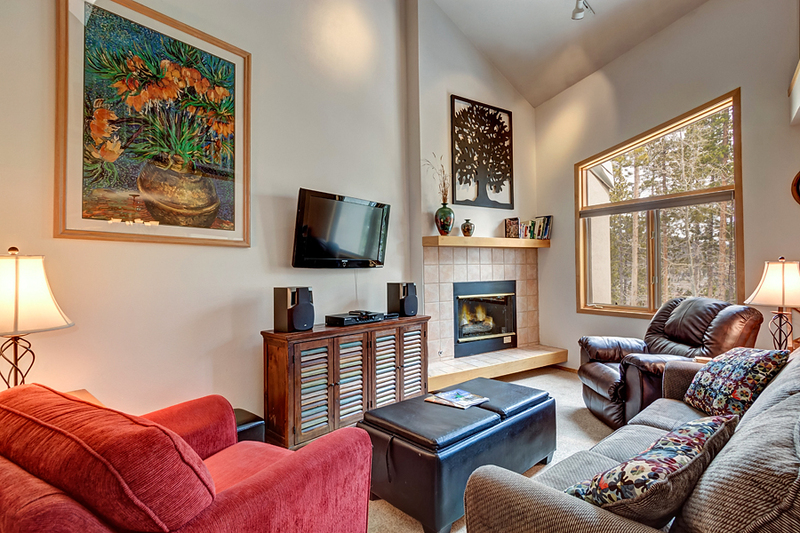 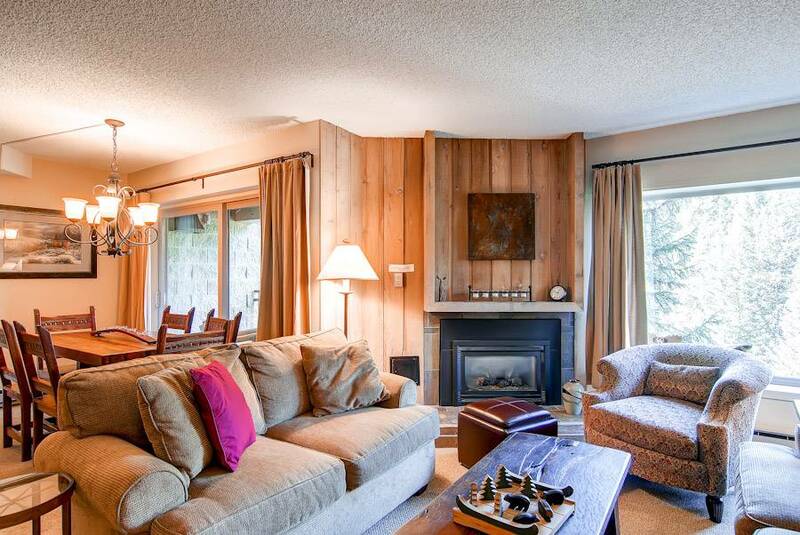 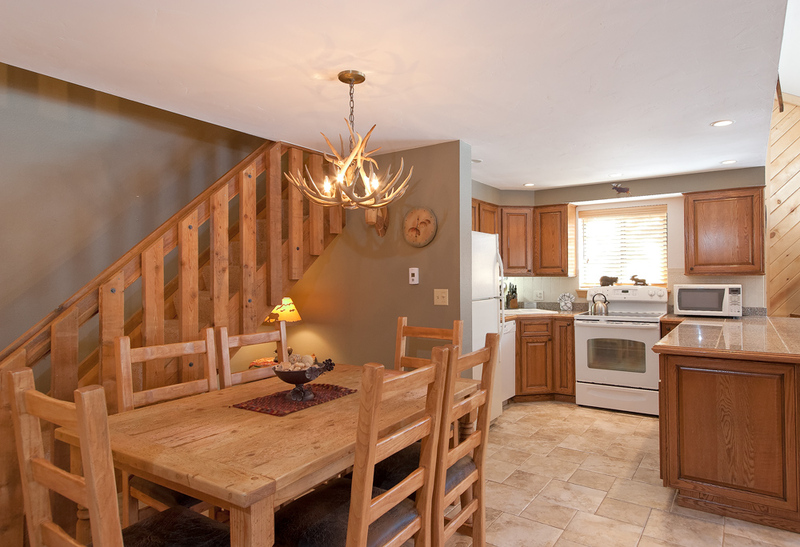 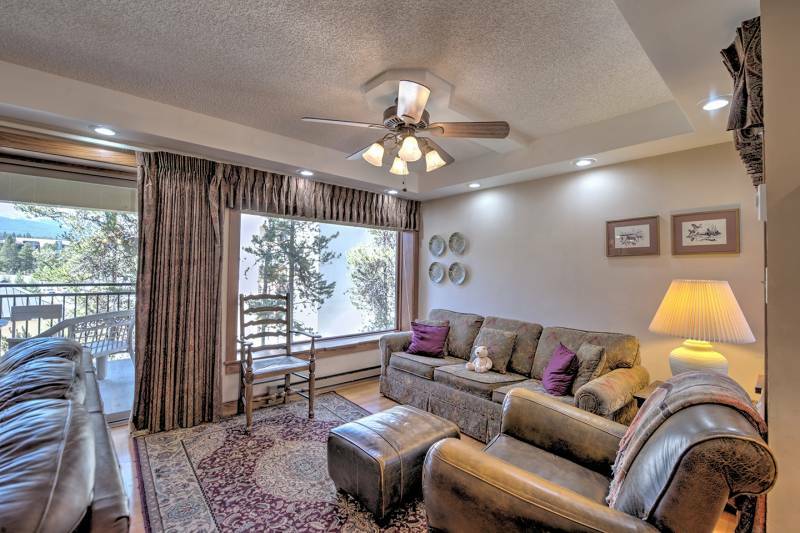 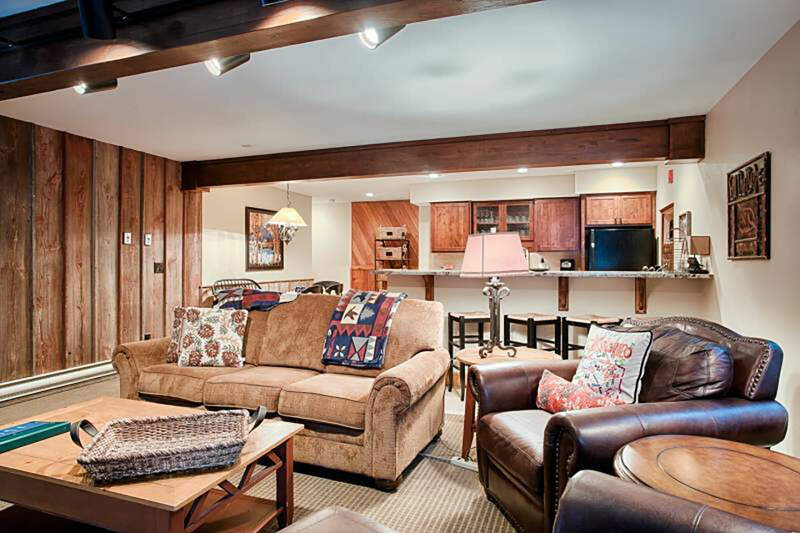 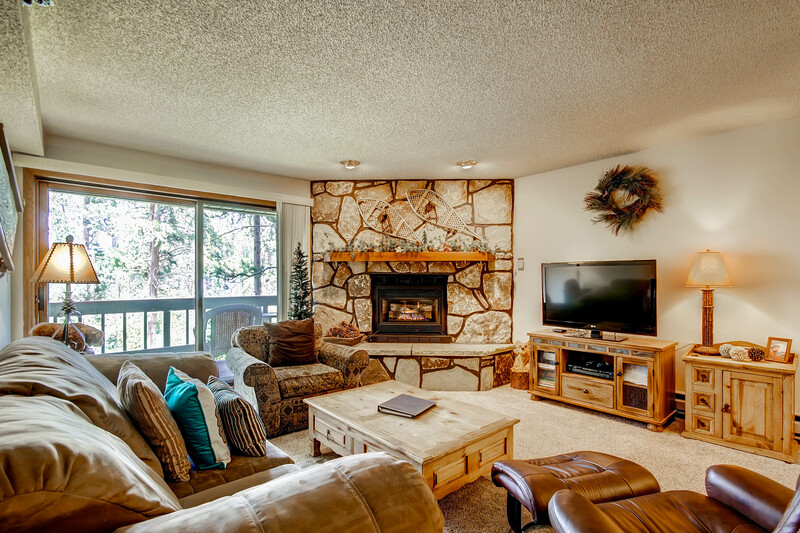 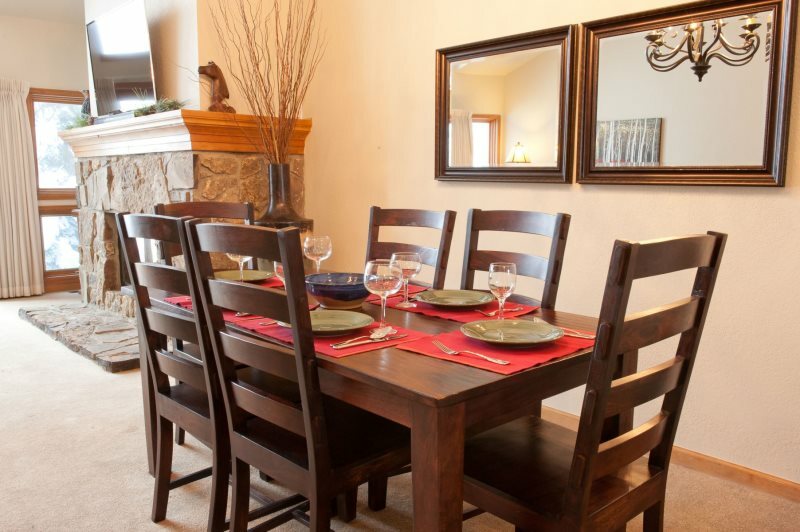 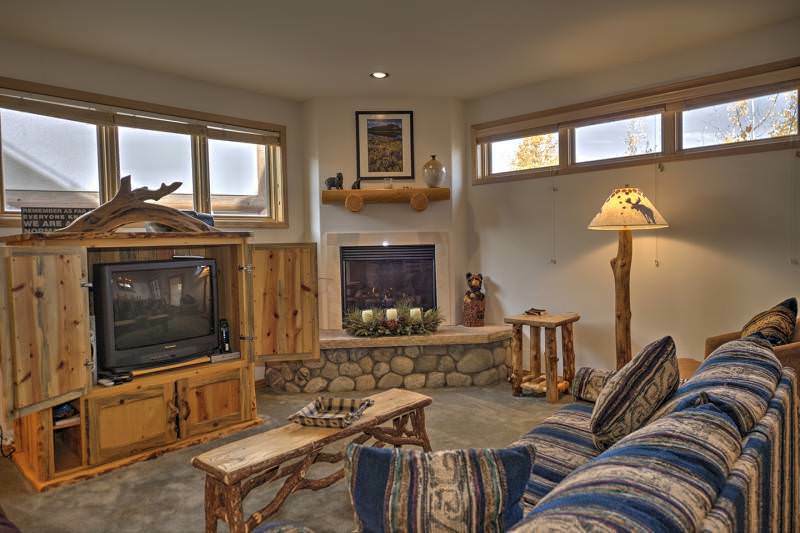 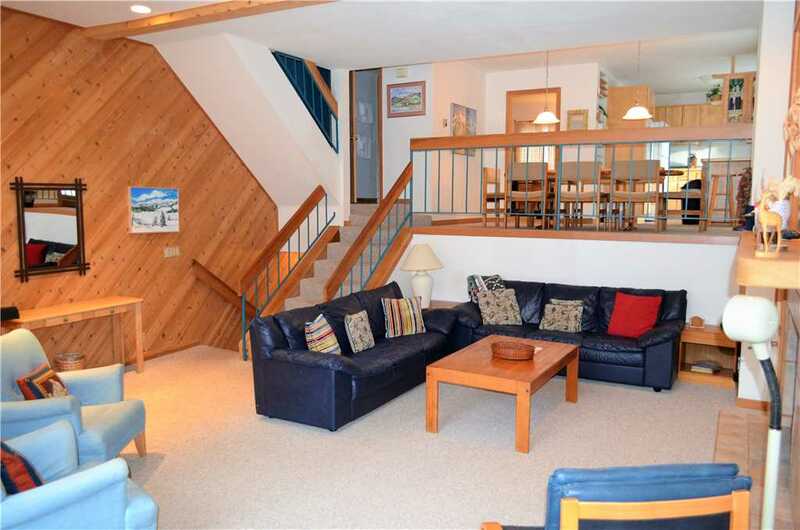 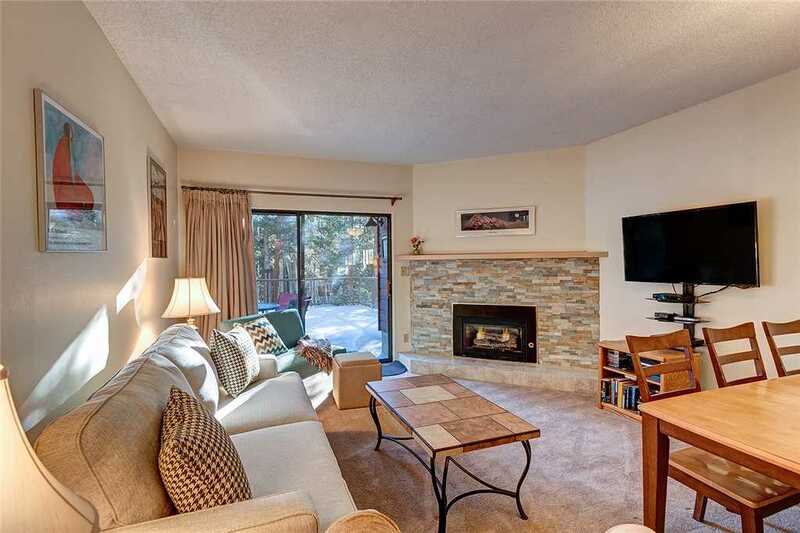 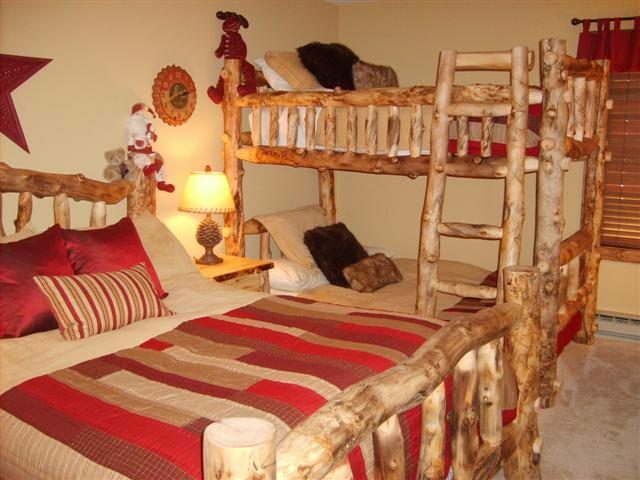 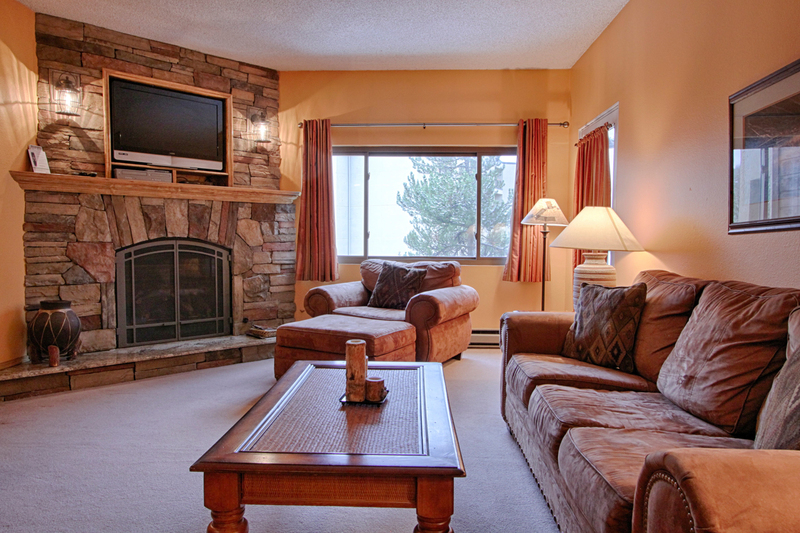 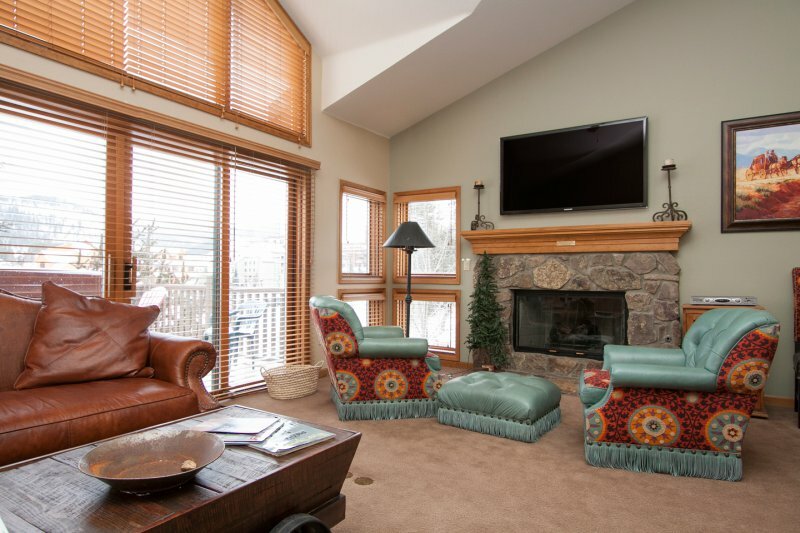 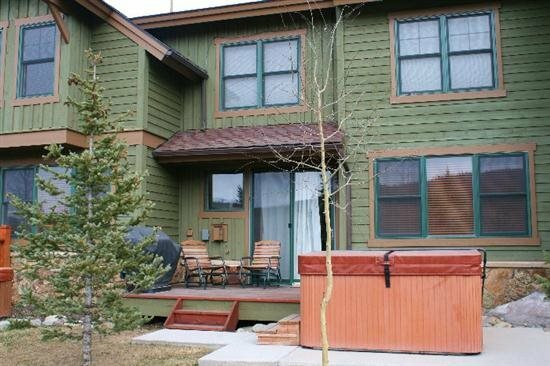 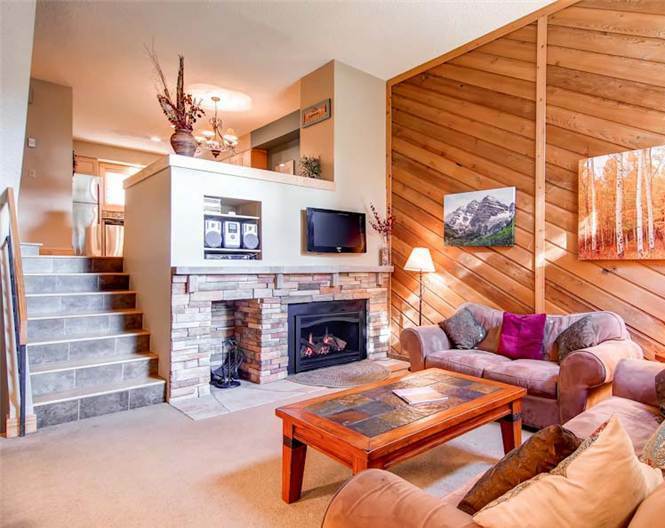 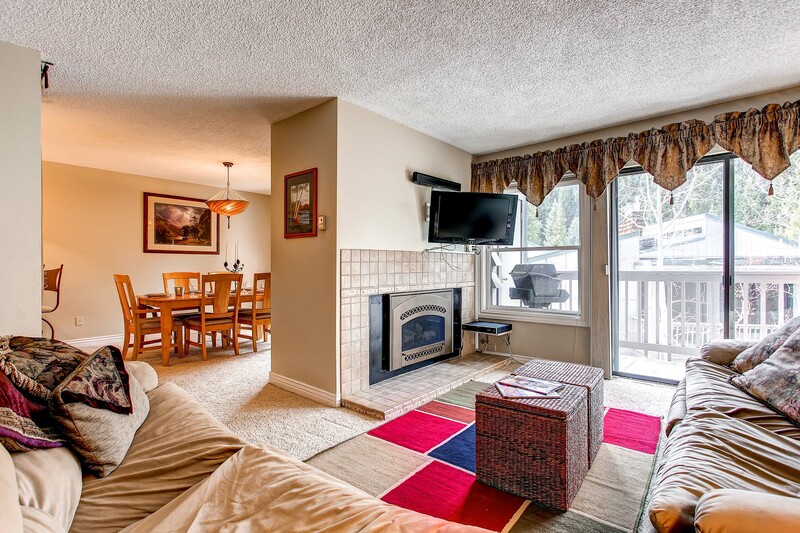 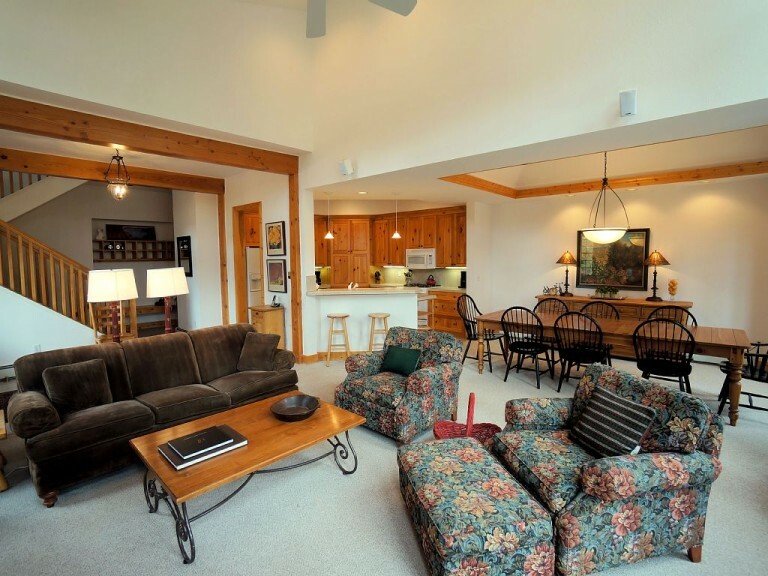 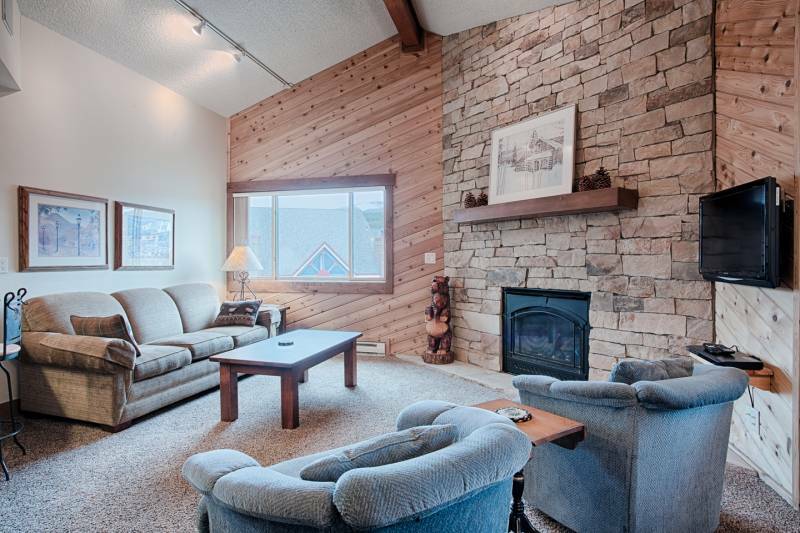 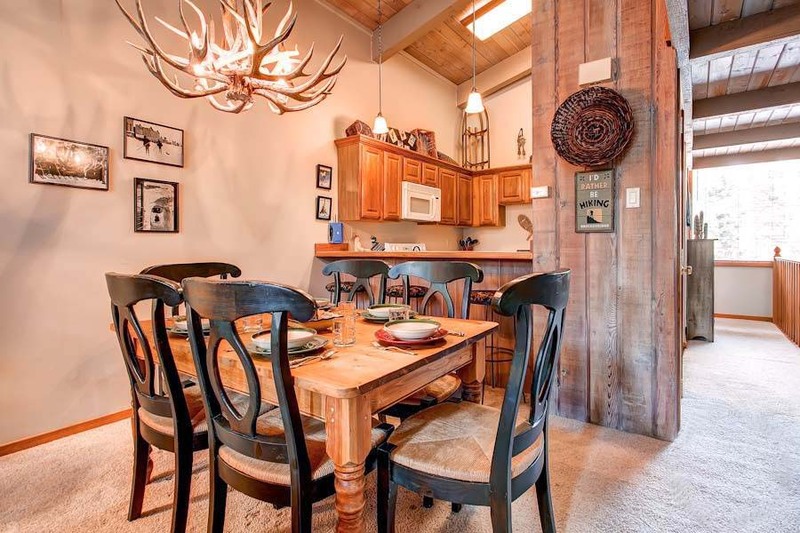 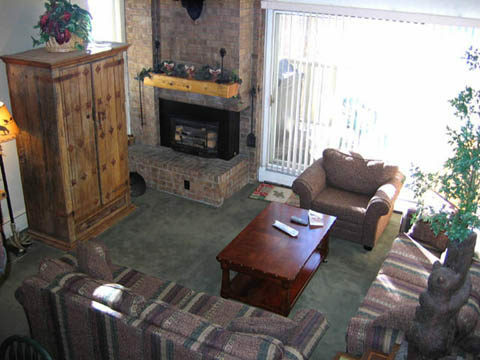 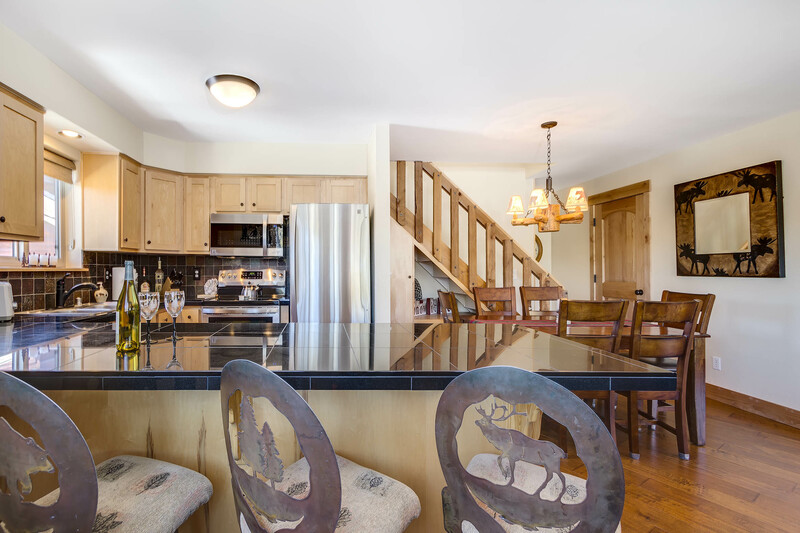 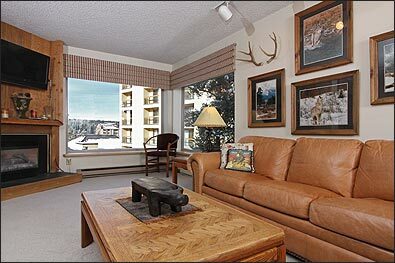 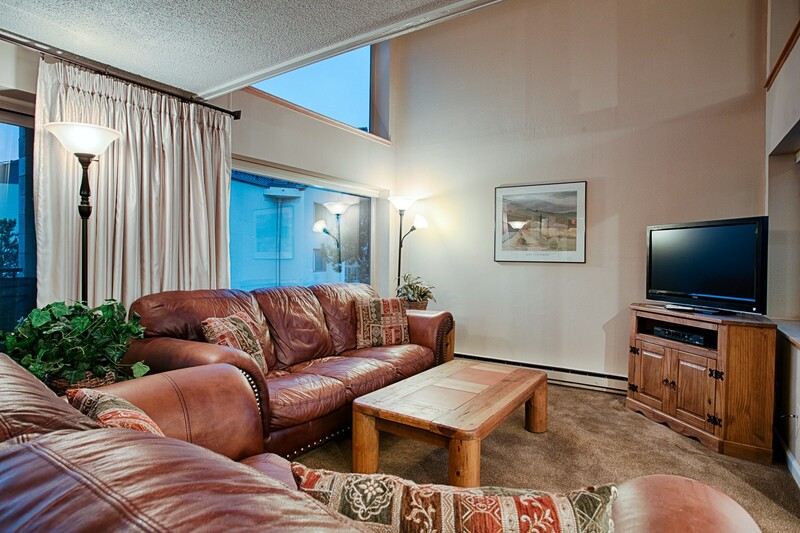 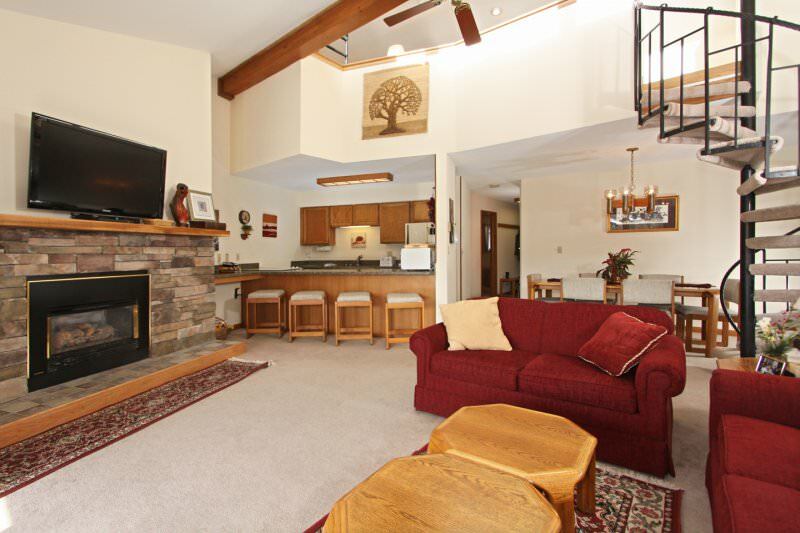 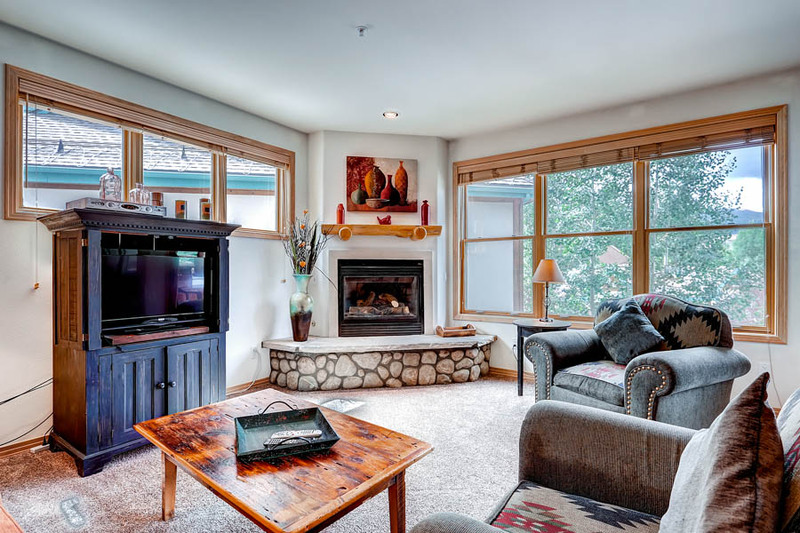 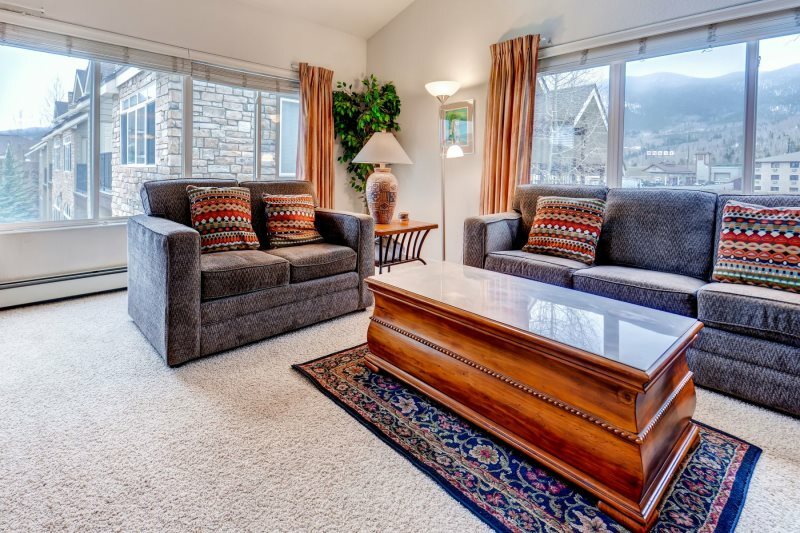 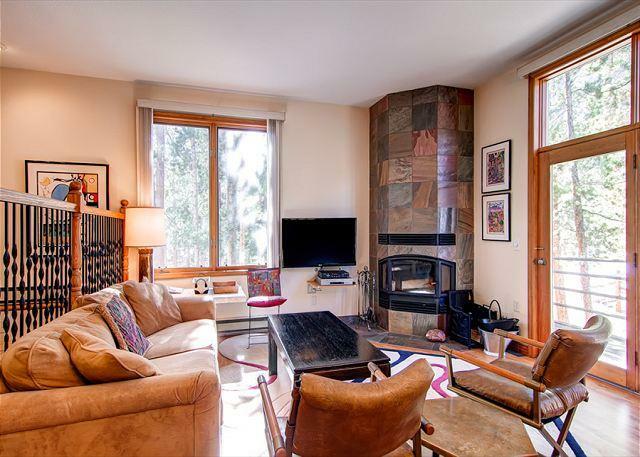 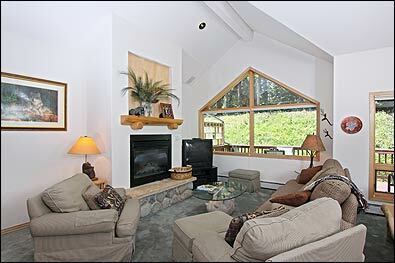 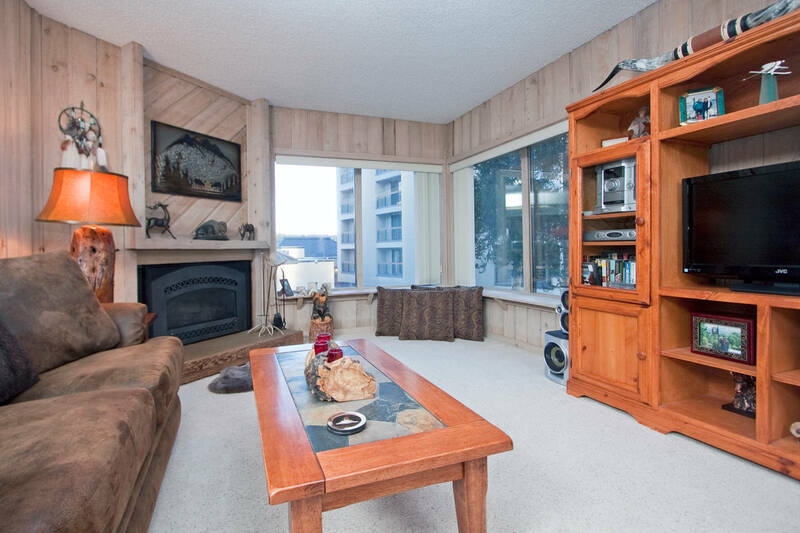 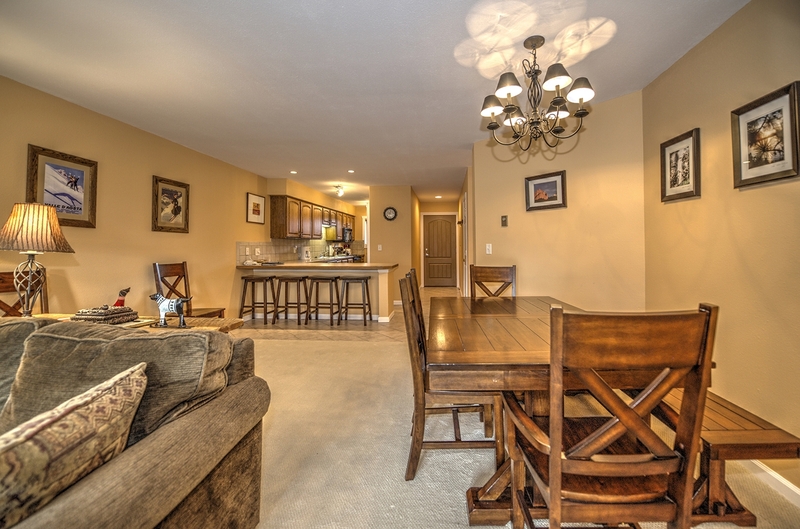 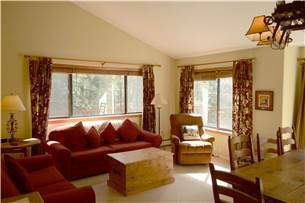 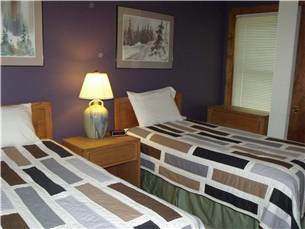 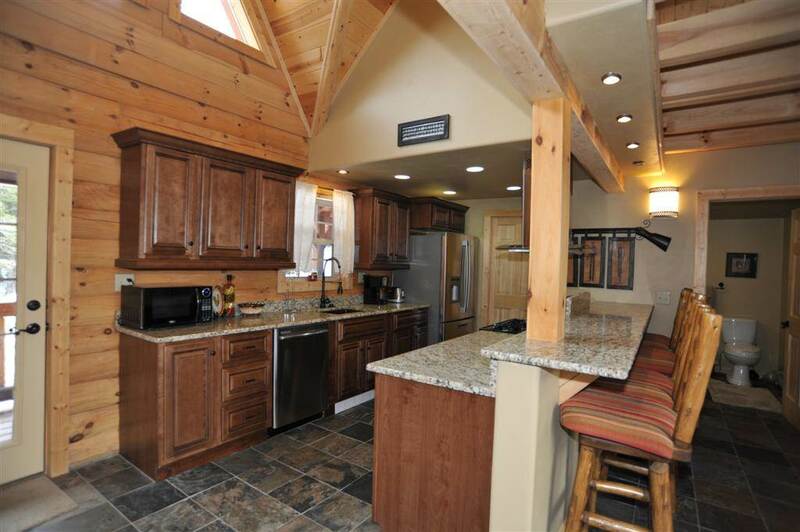 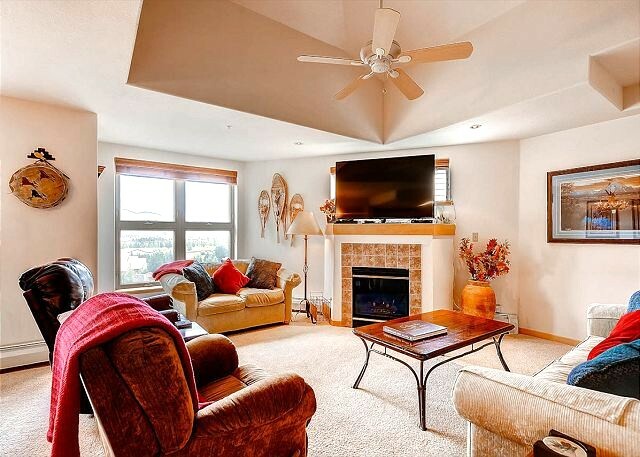 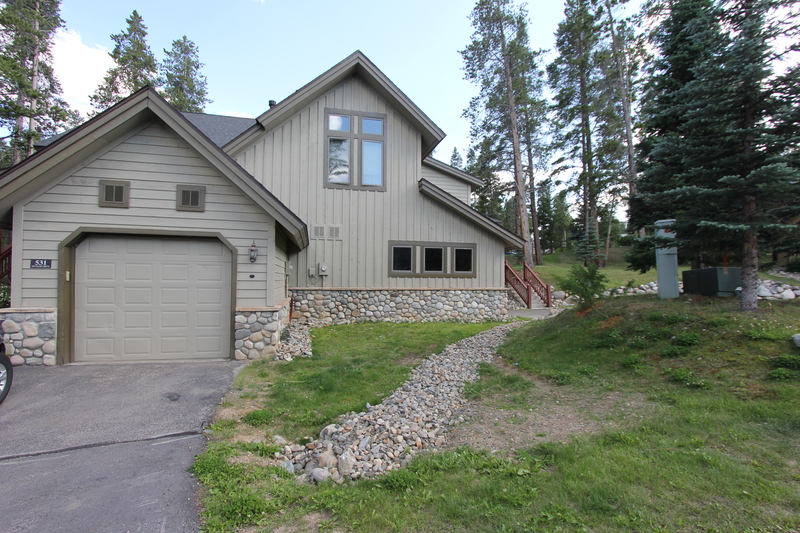 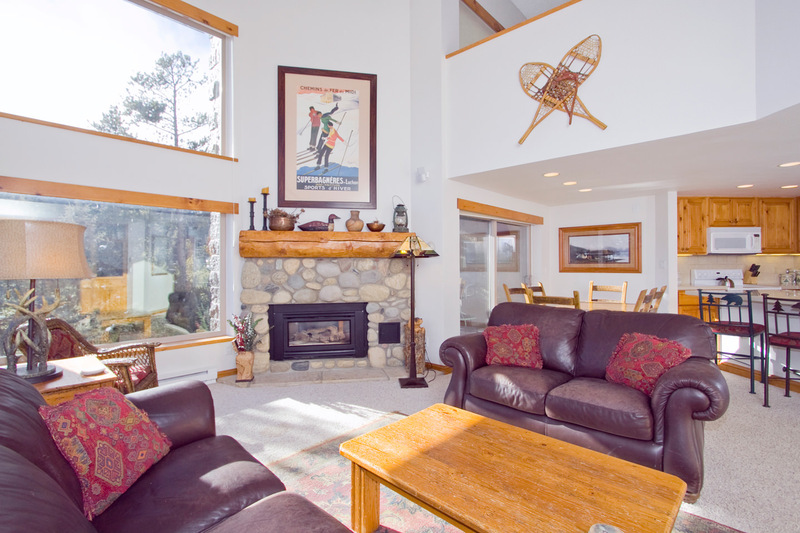 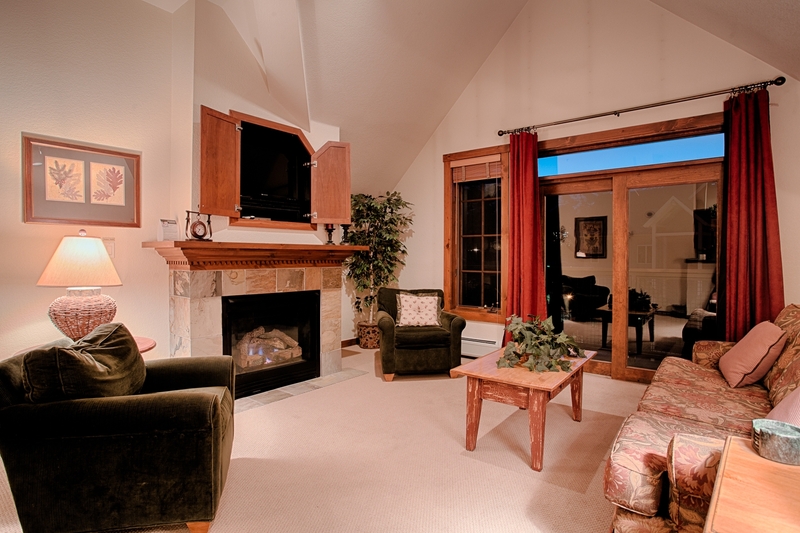 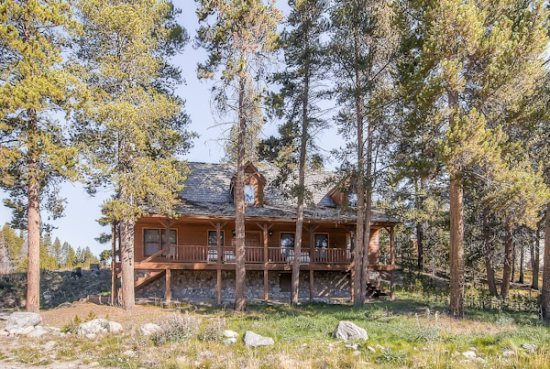 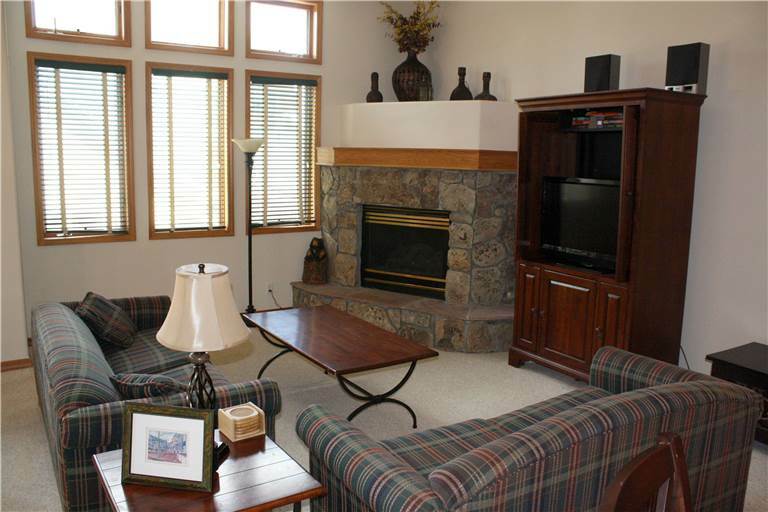 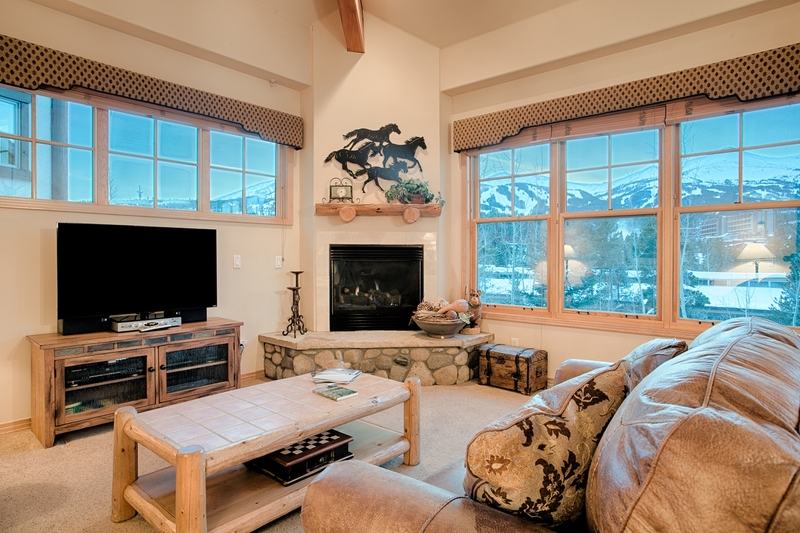 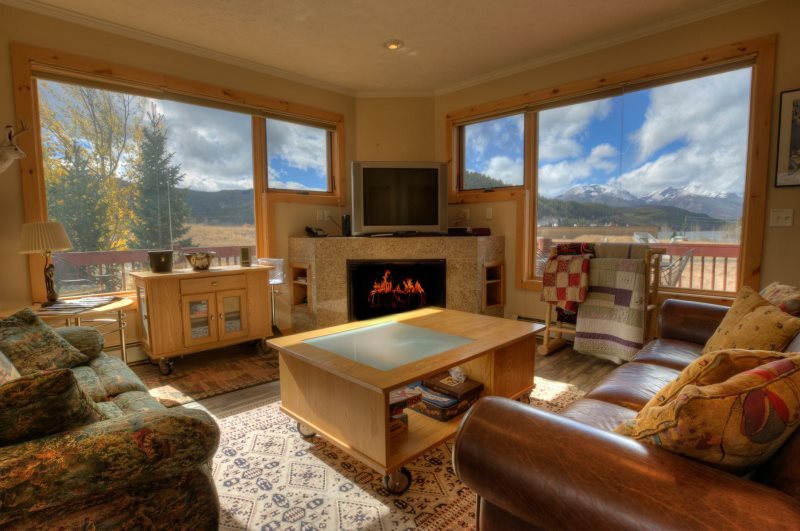 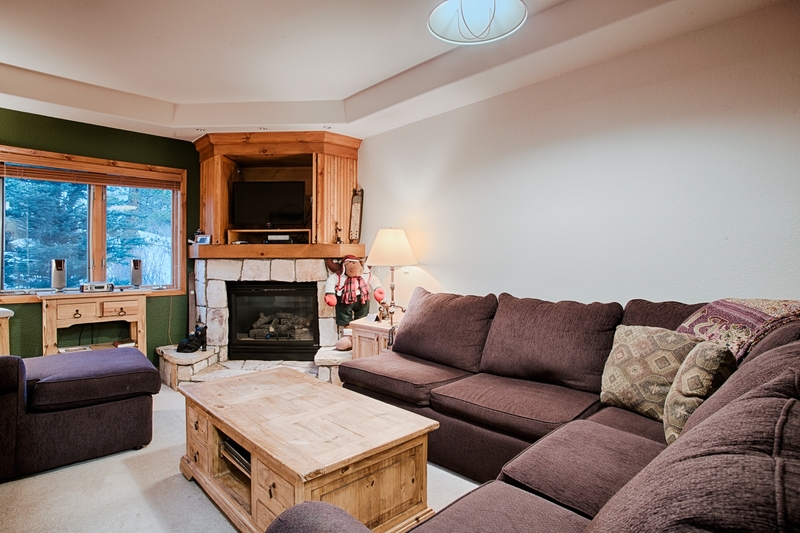 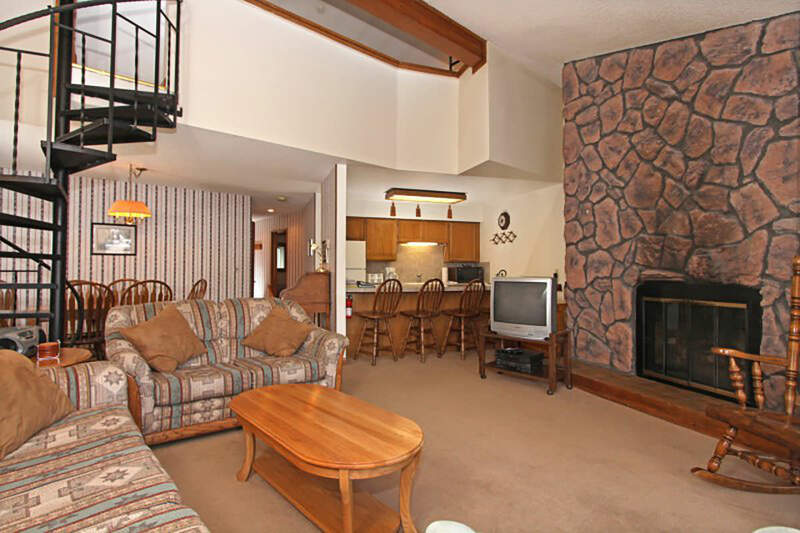 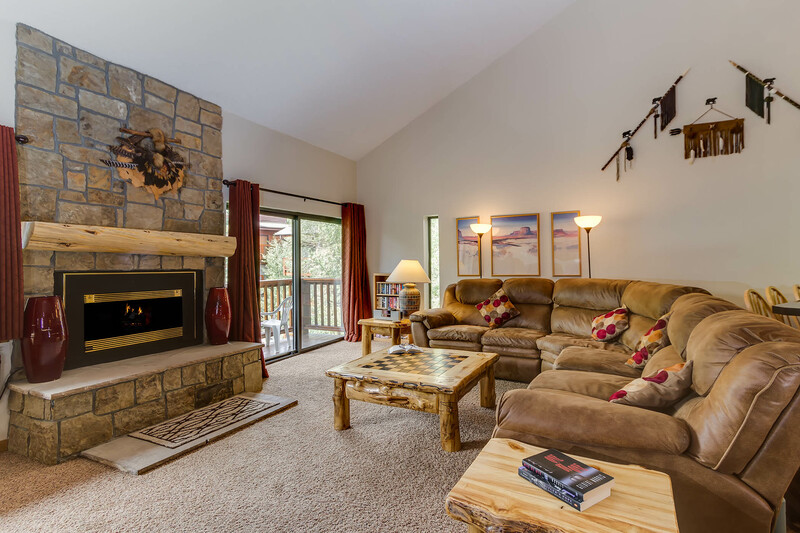 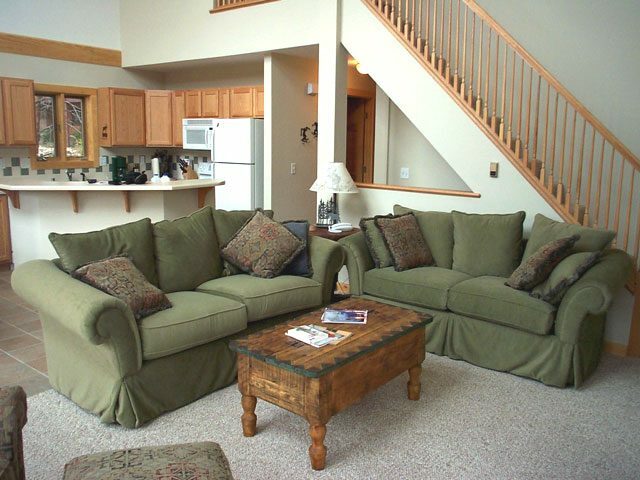 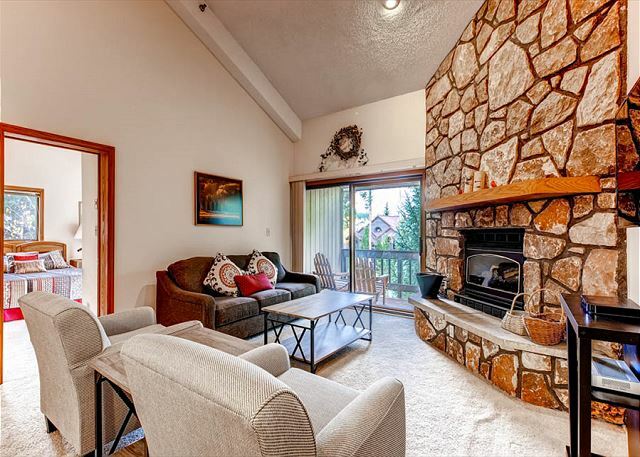 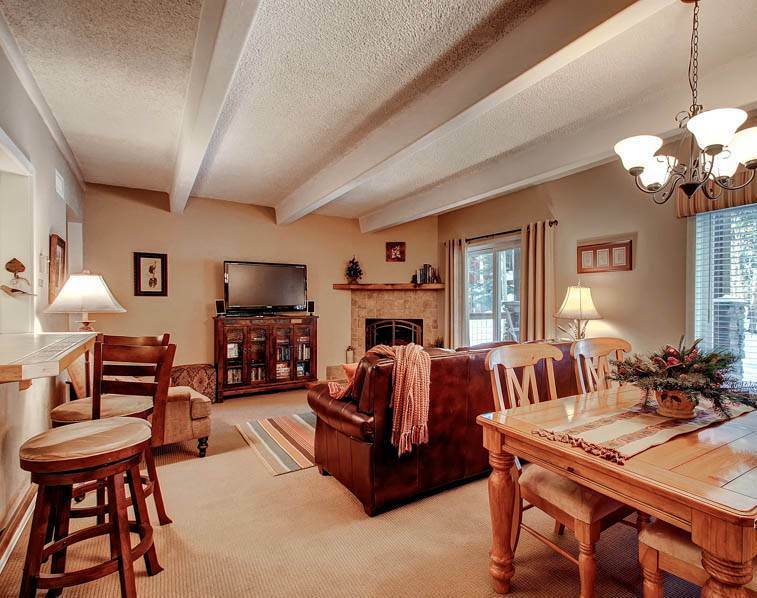 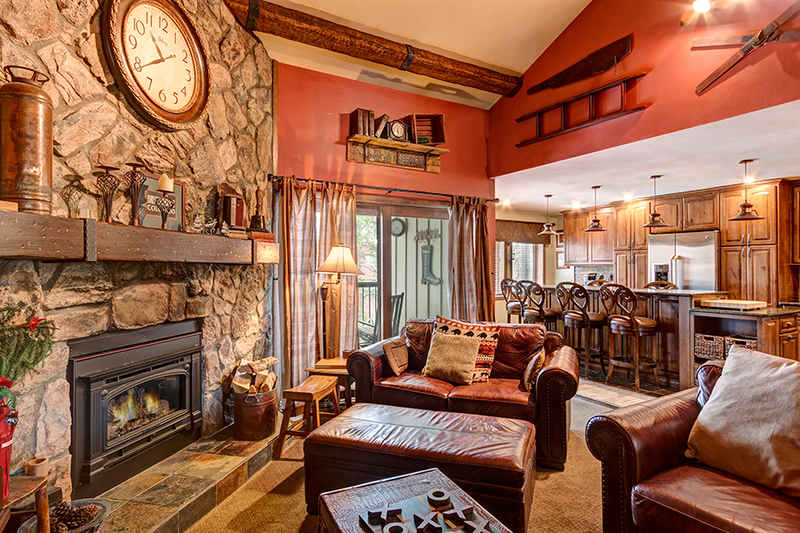 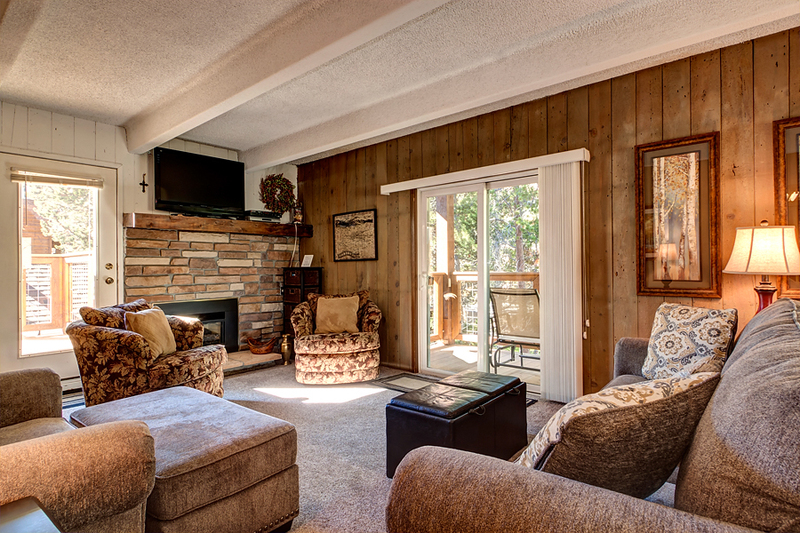 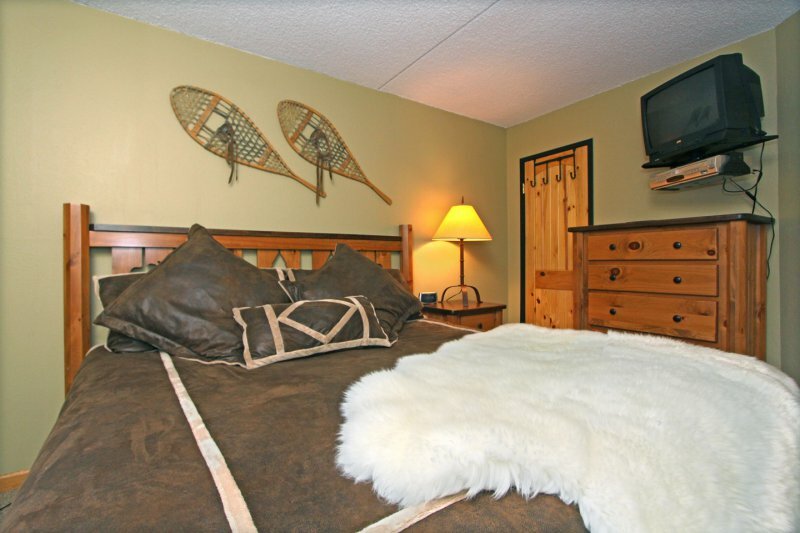 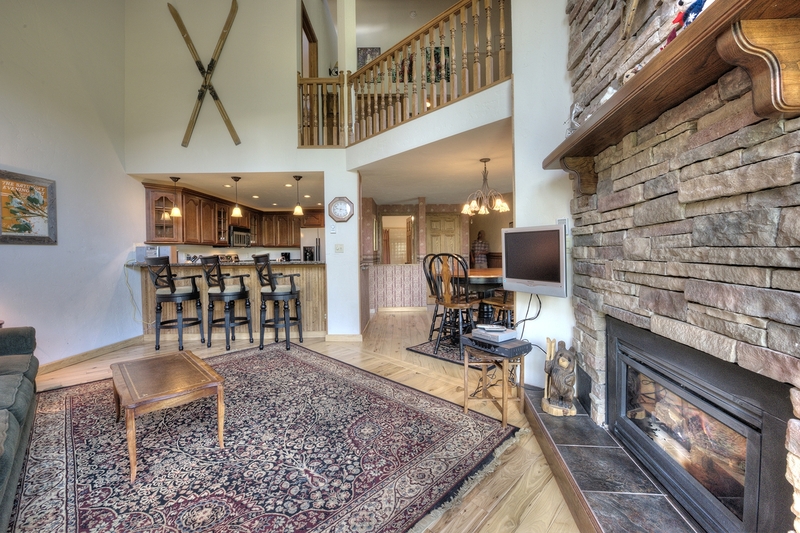 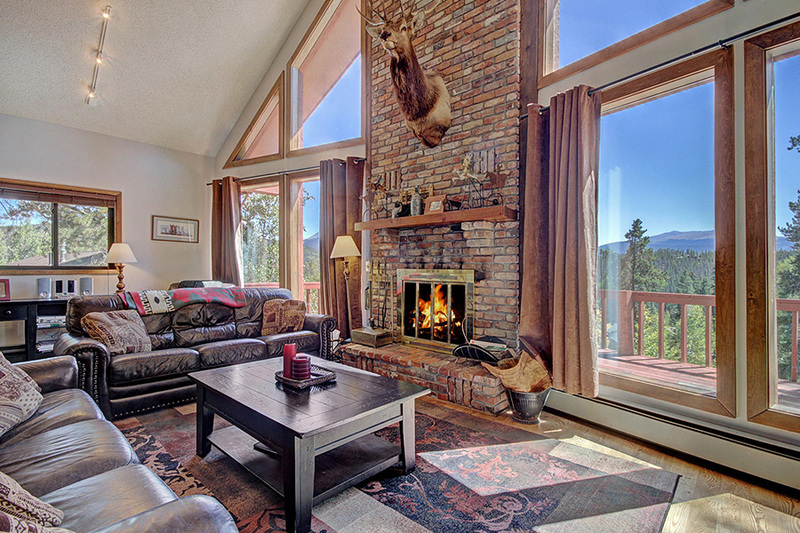 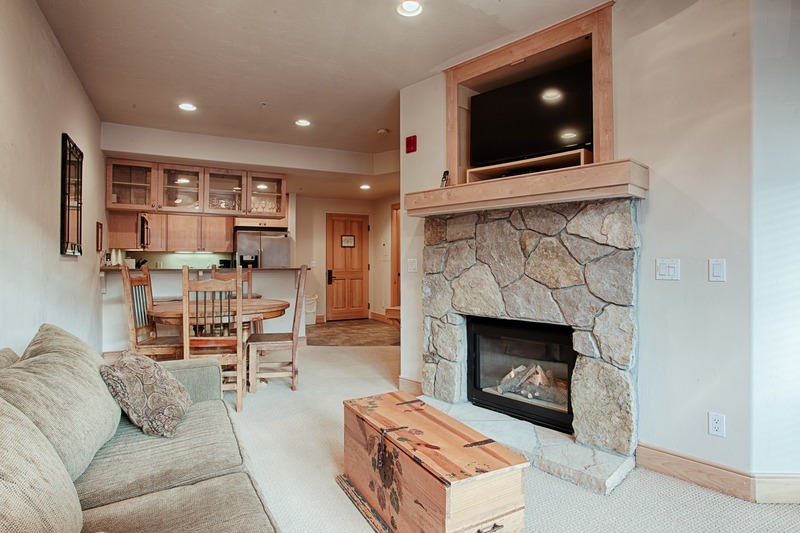 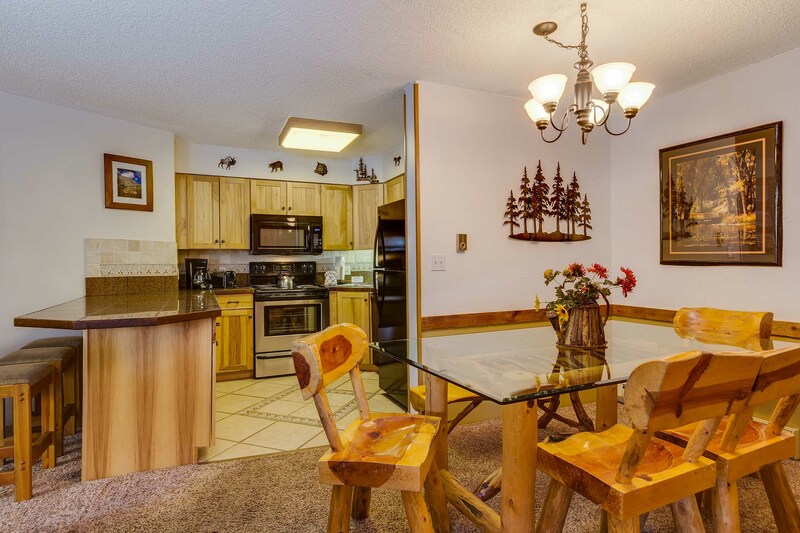 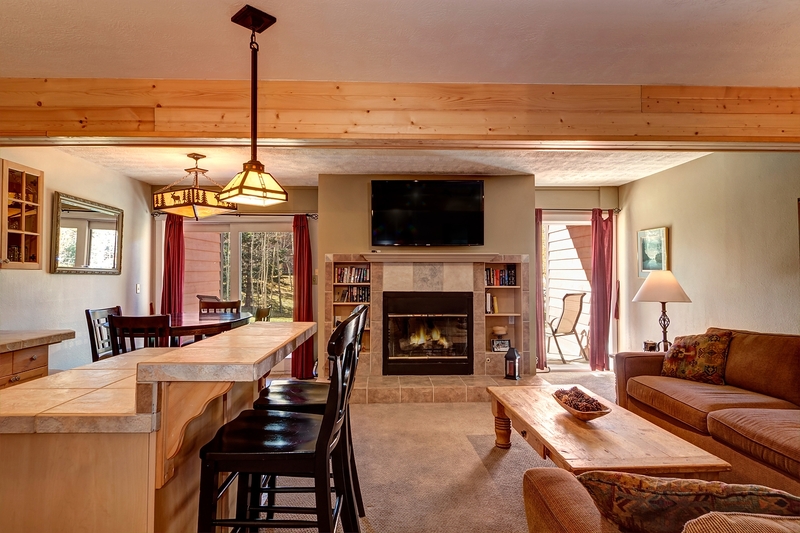 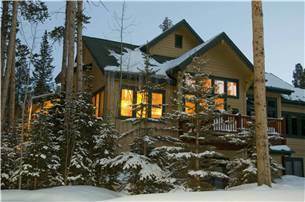 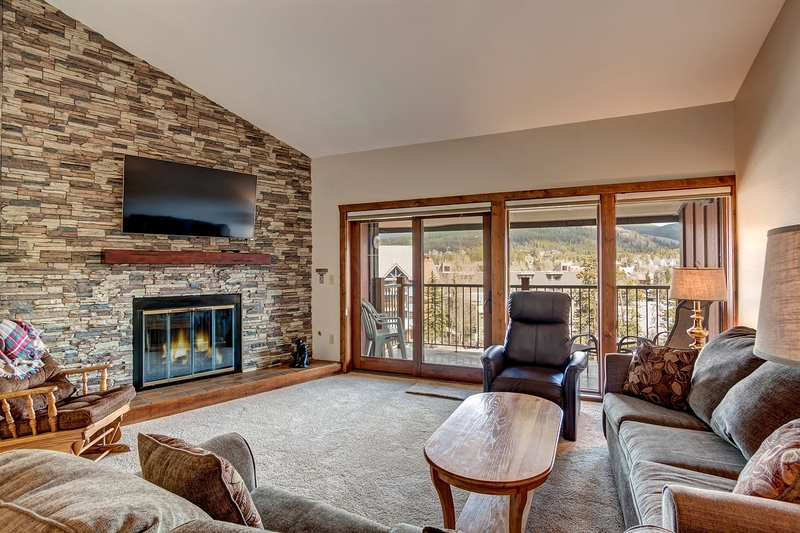 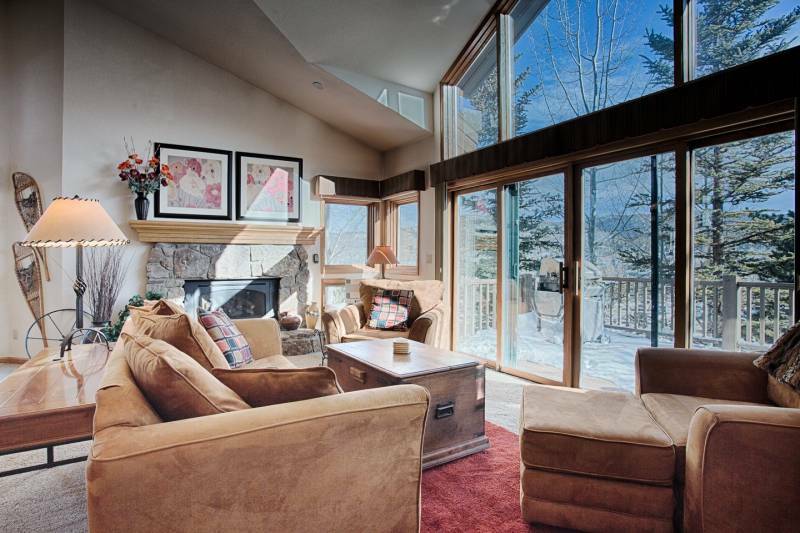 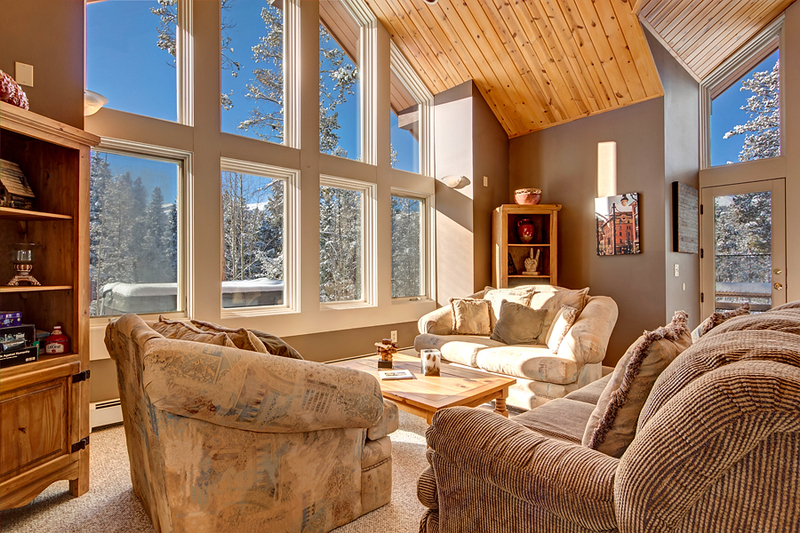 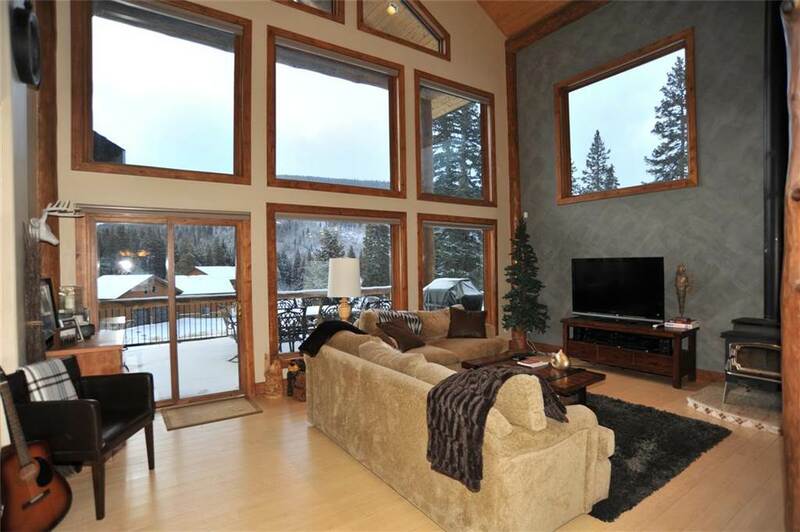 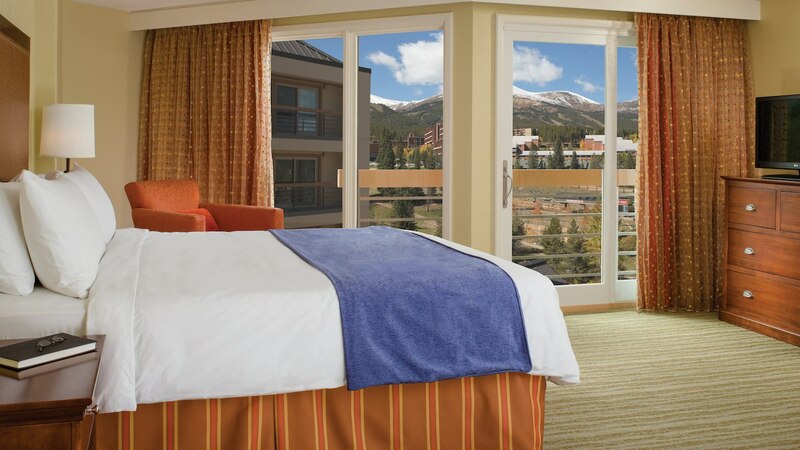 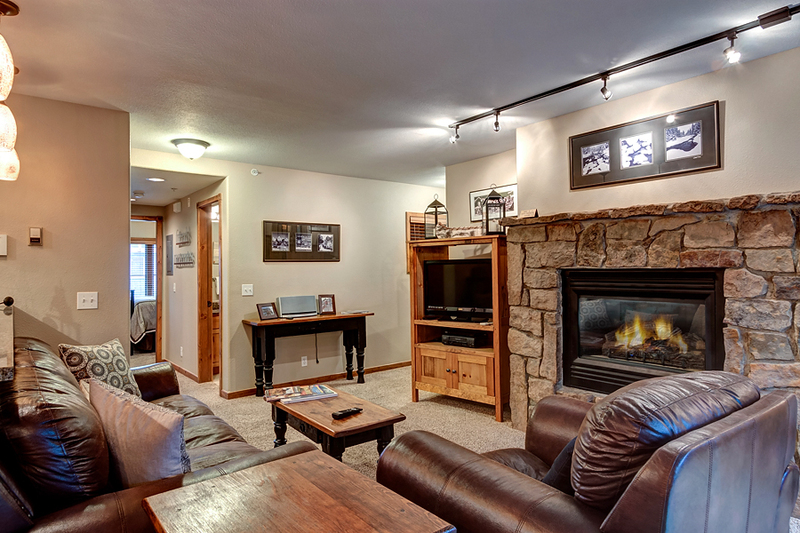 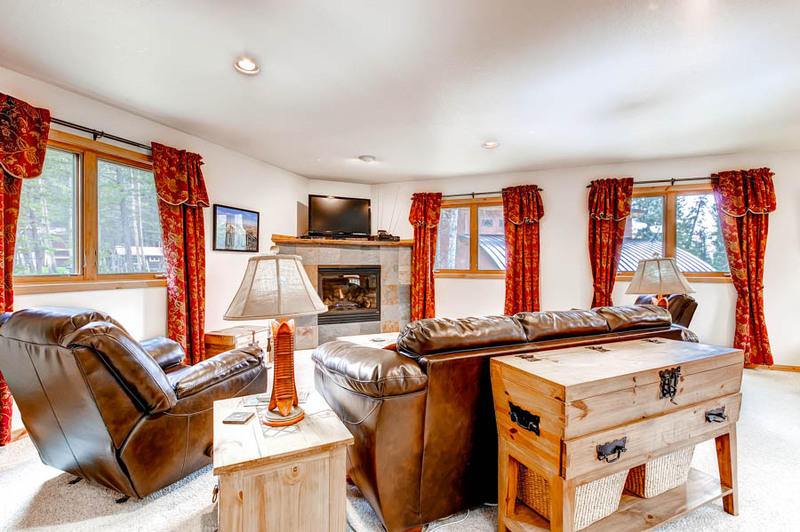 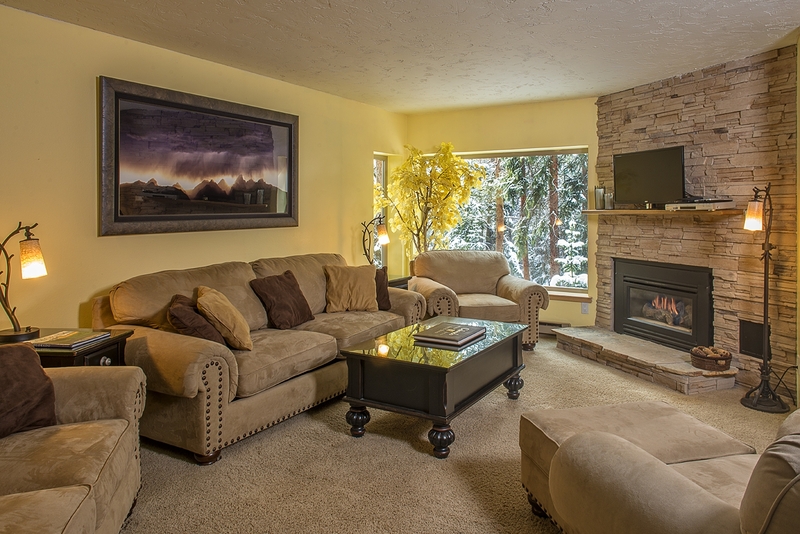 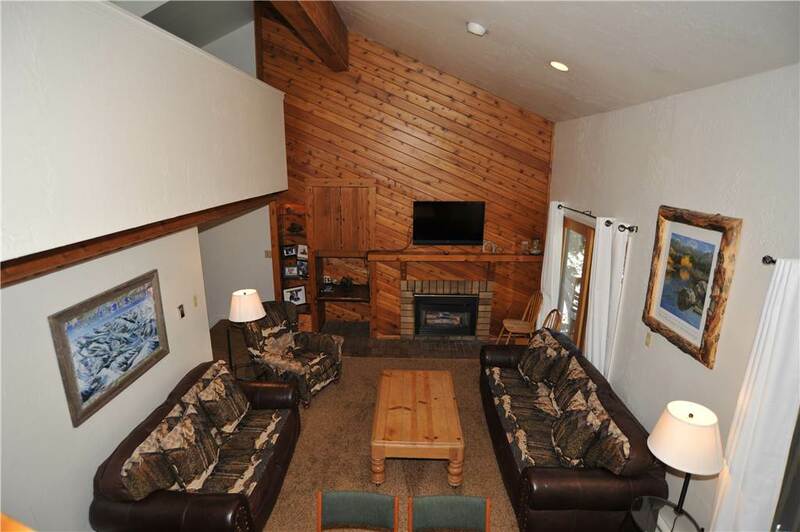 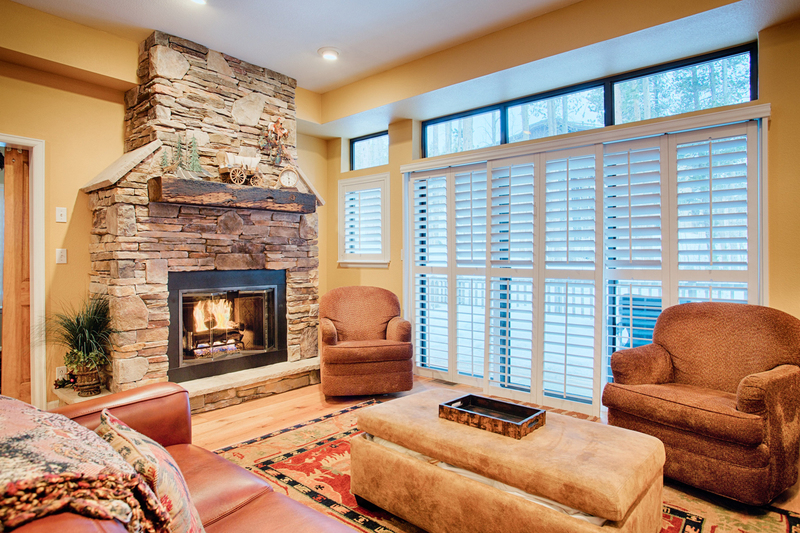 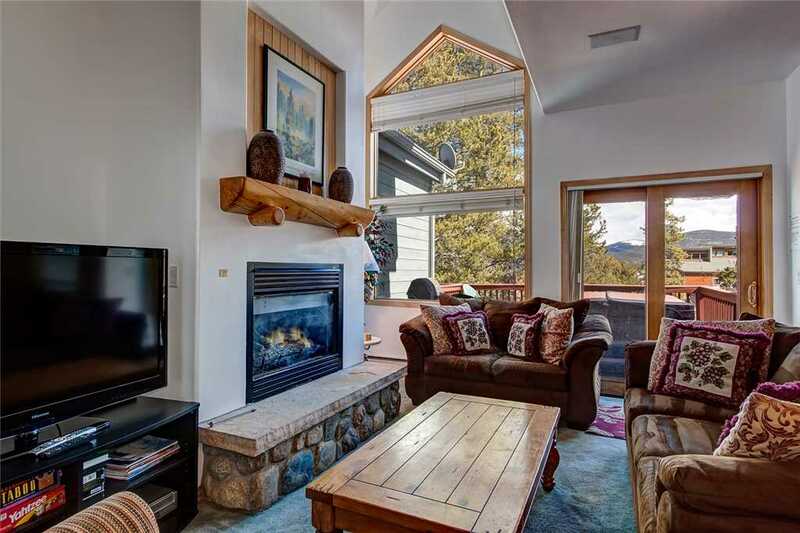 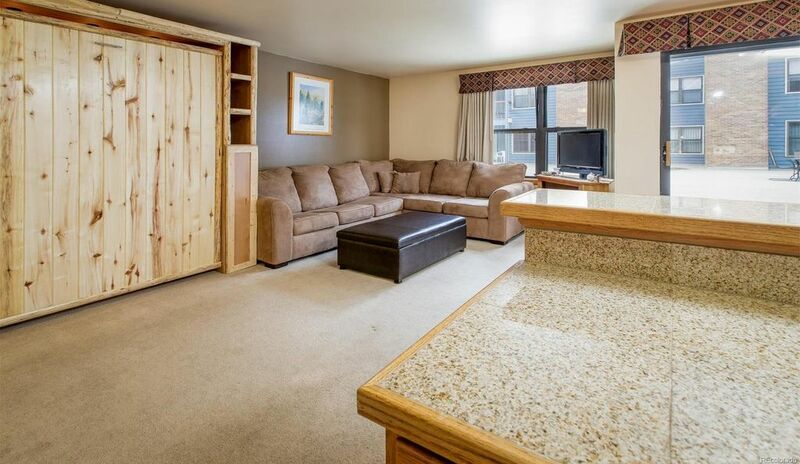 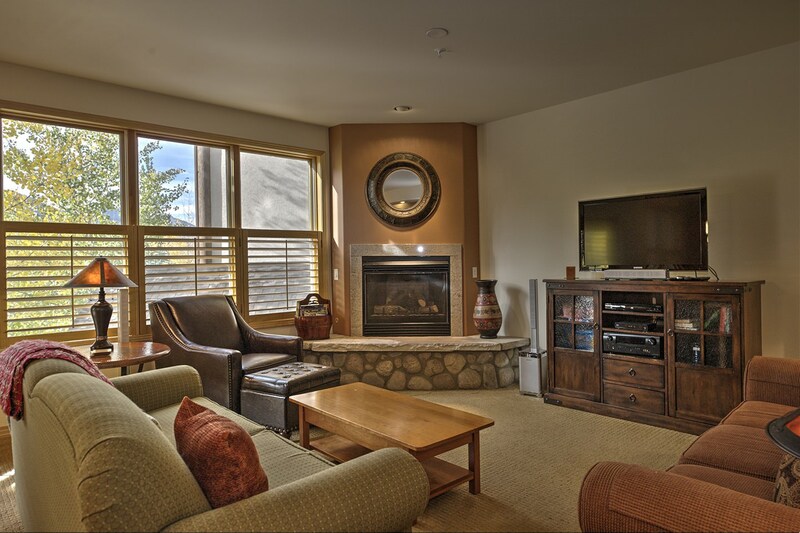 Or have a seat out on the private balcony and breathe in our crisp, clean mountain air. 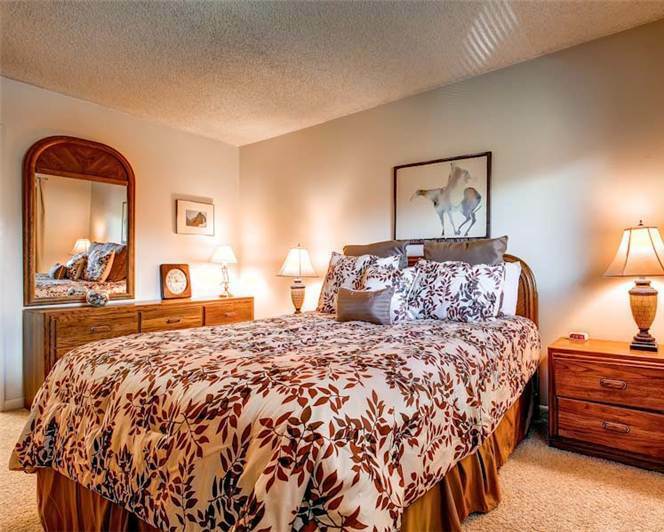 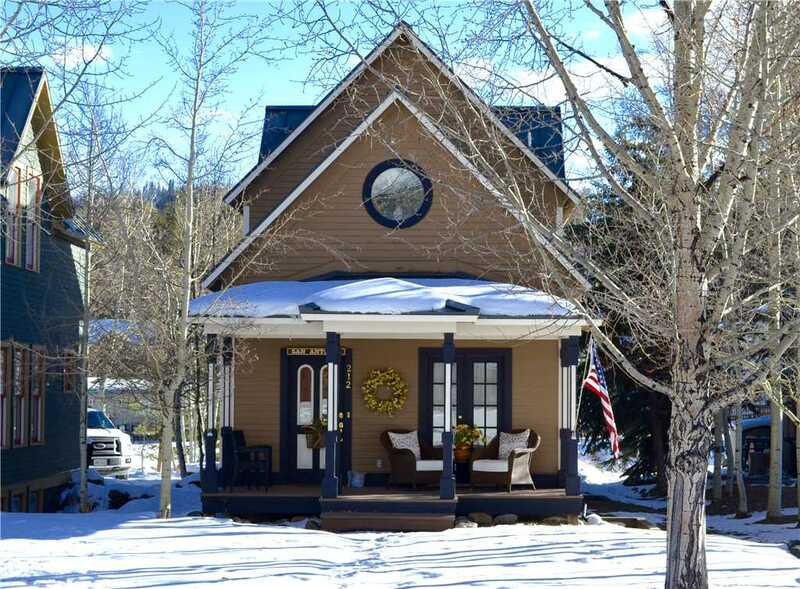 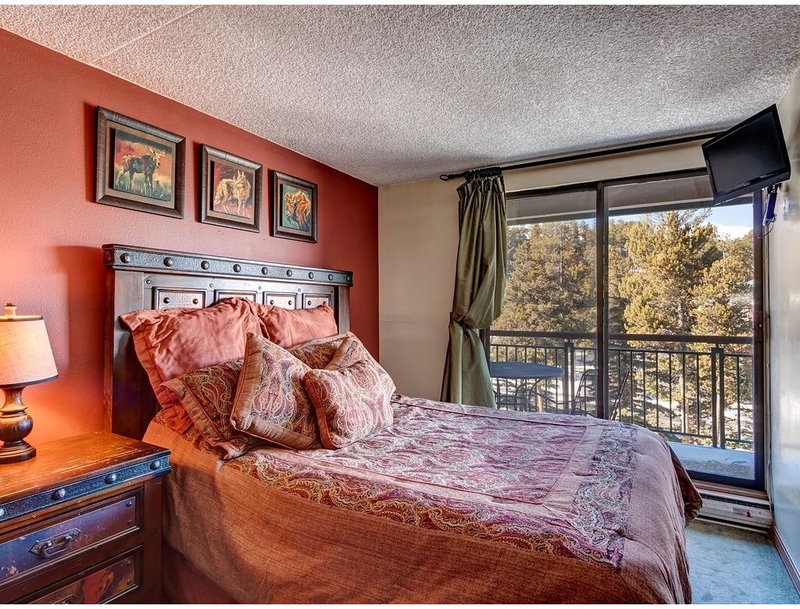 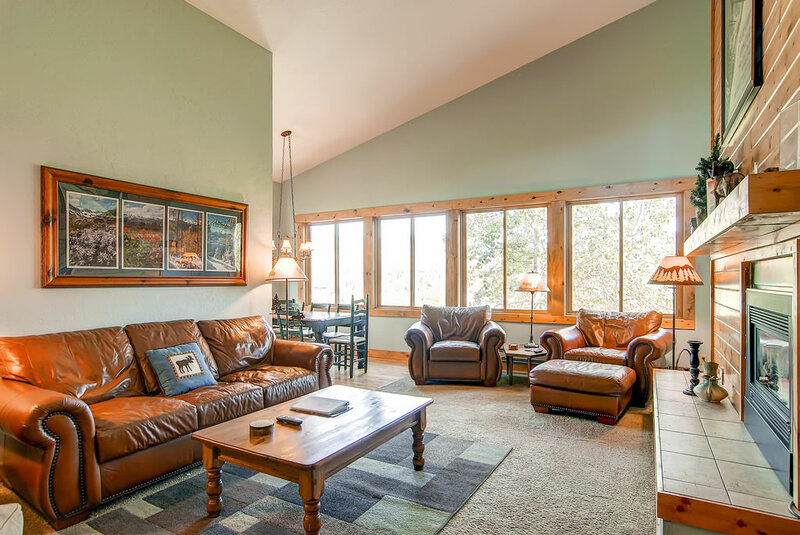 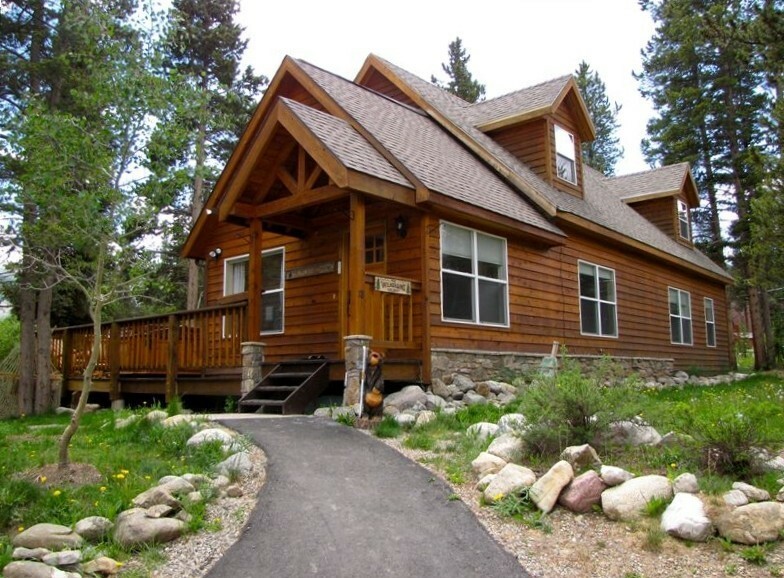 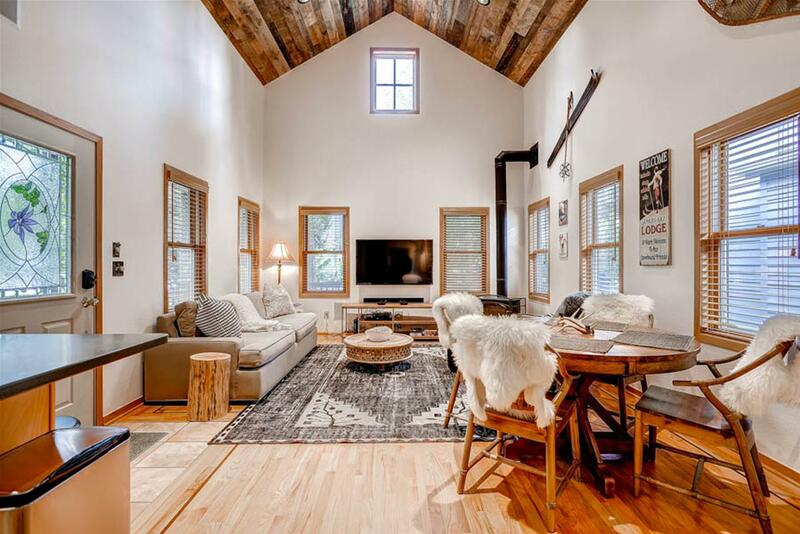 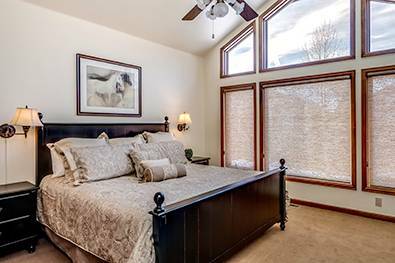 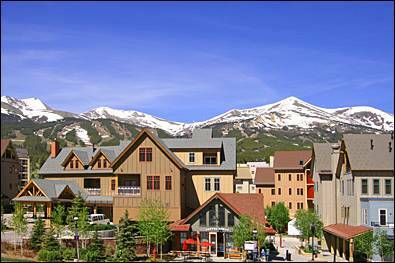 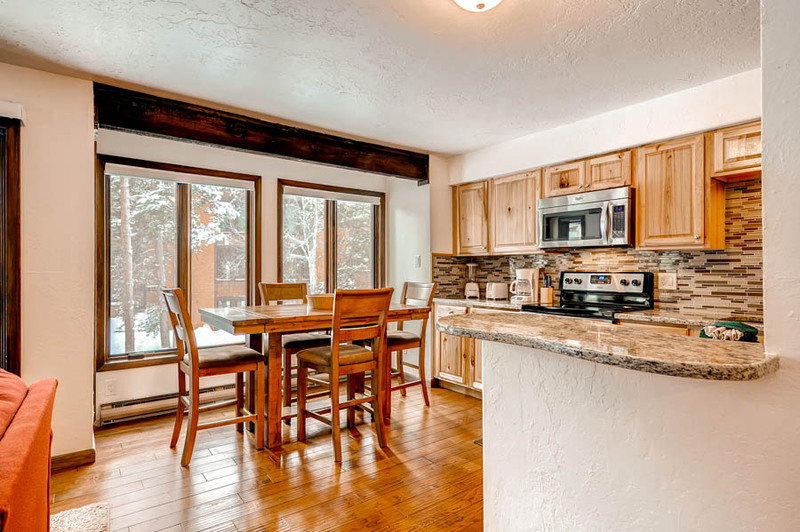 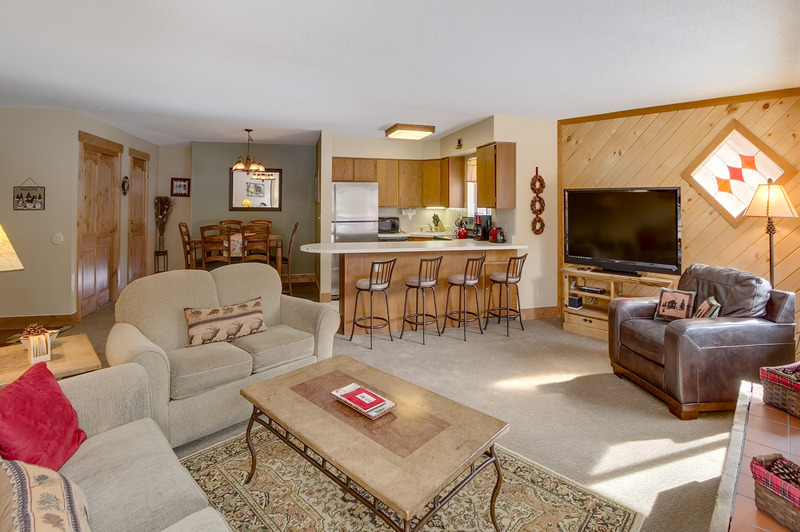 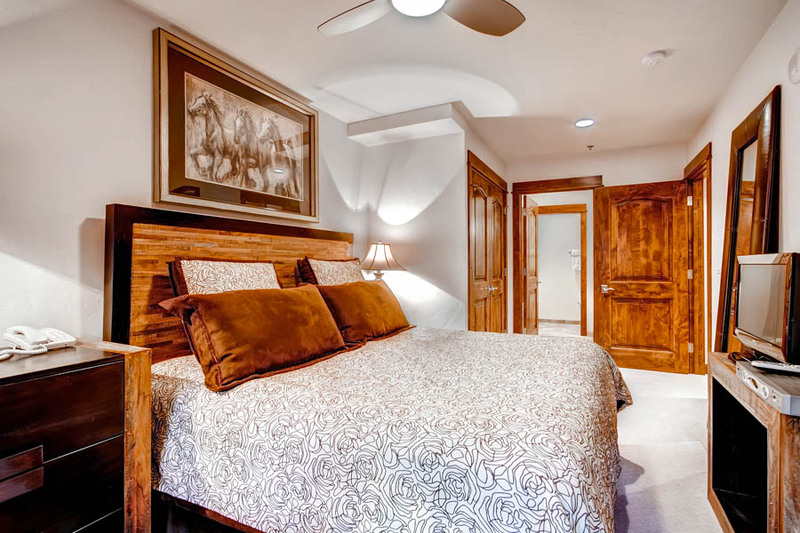 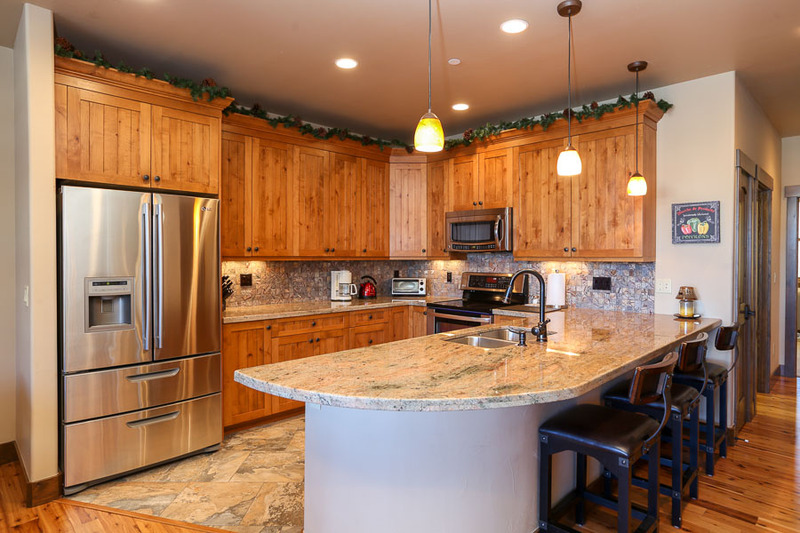 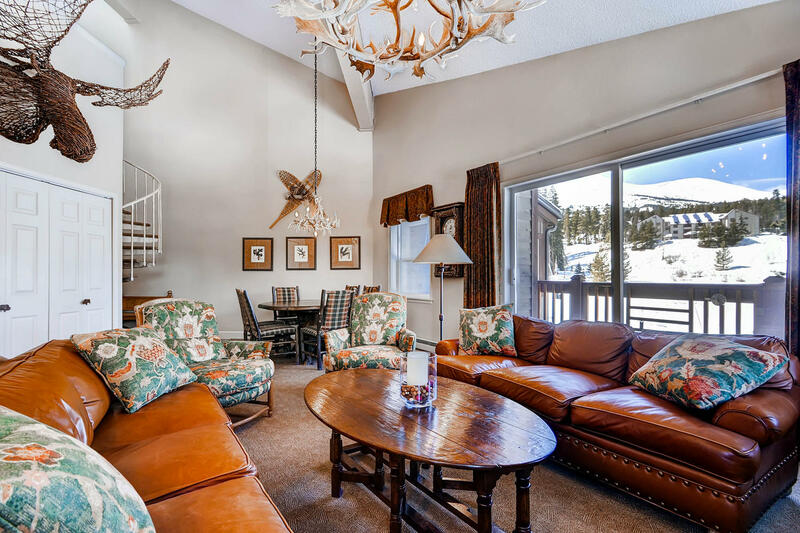 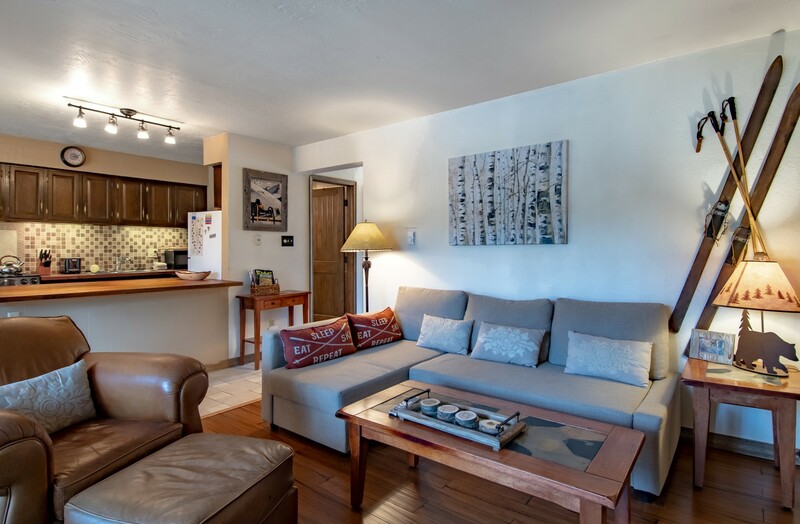 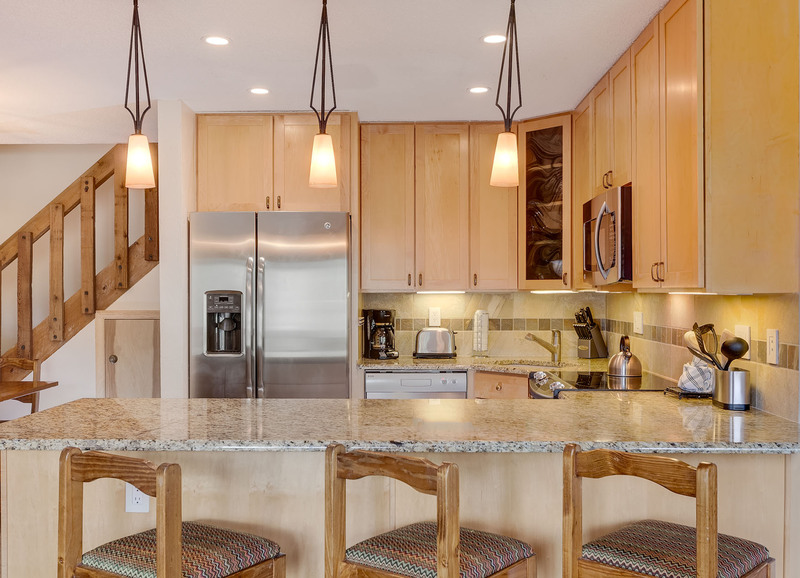 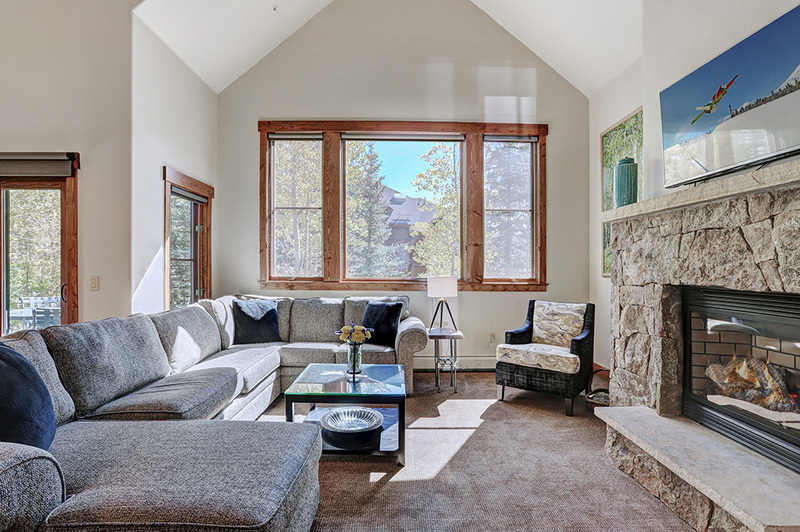 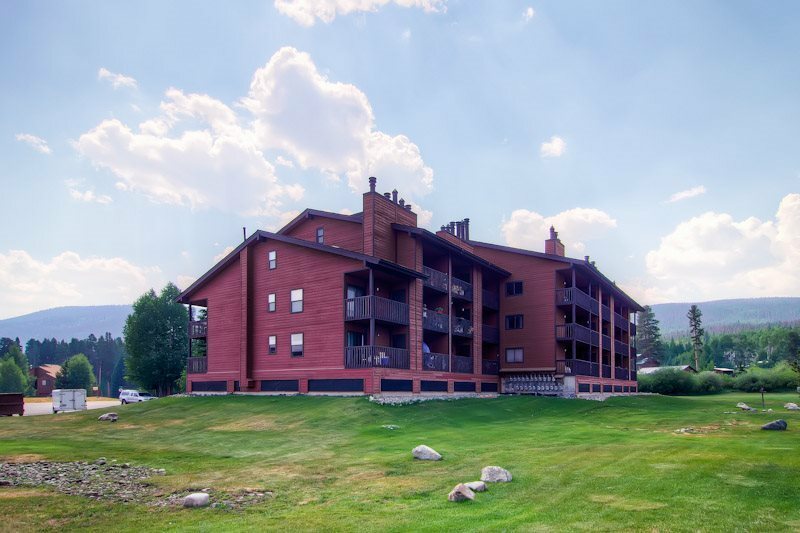 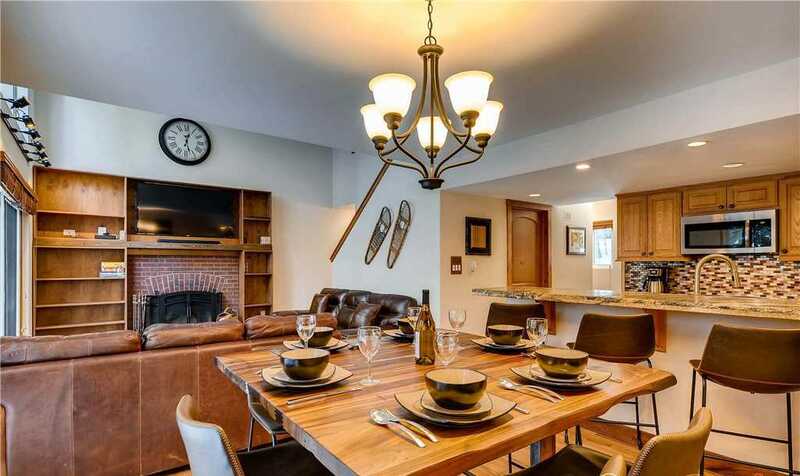 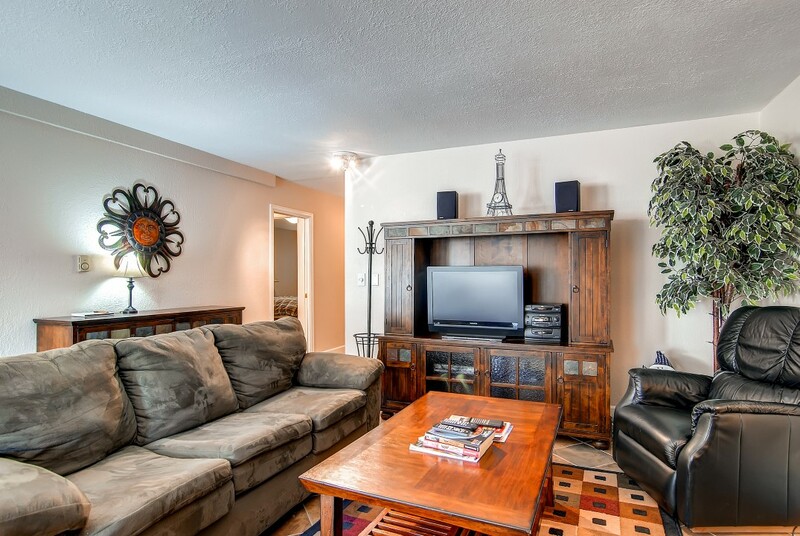 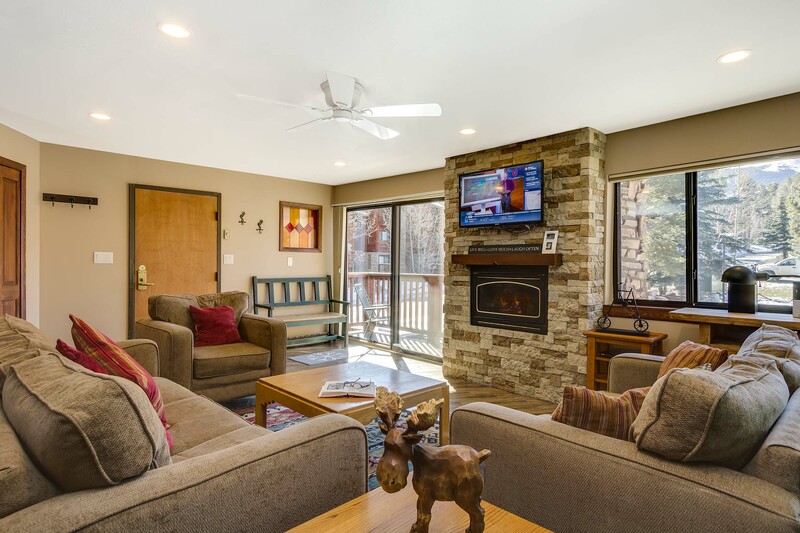 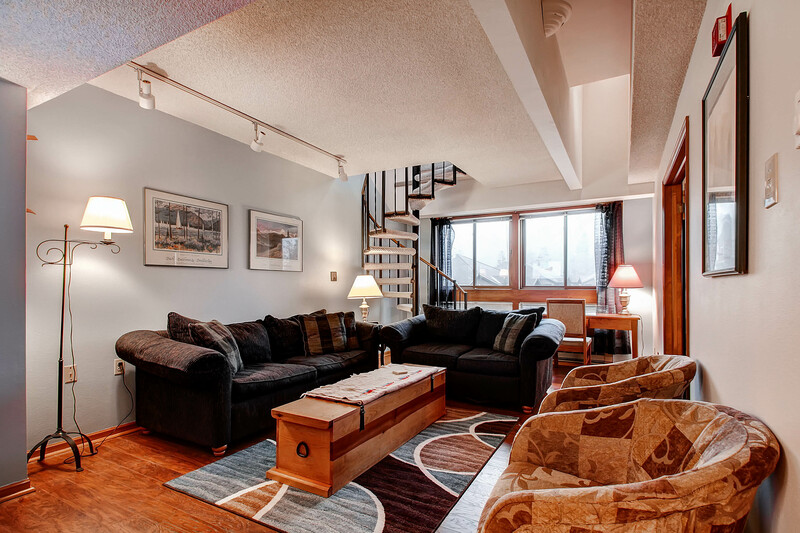 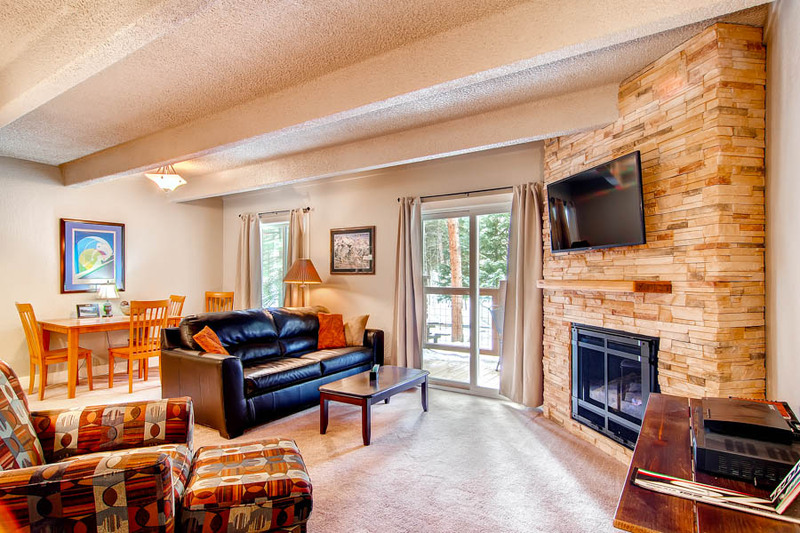 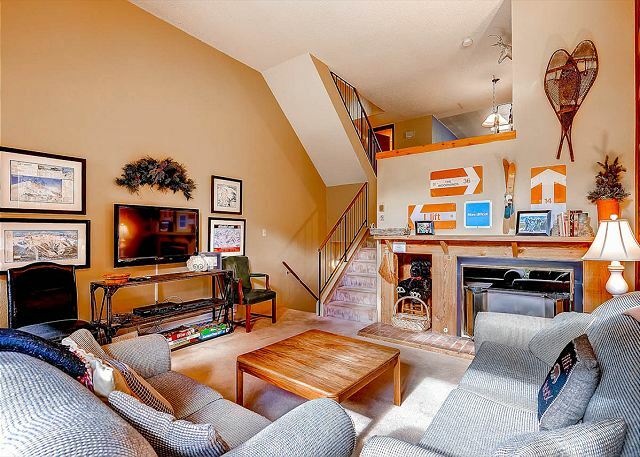 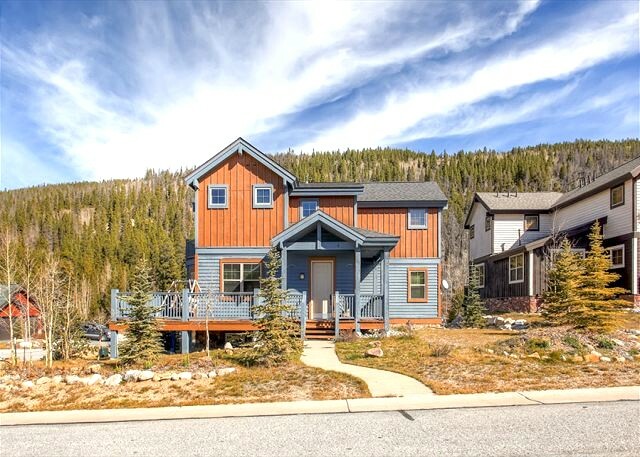 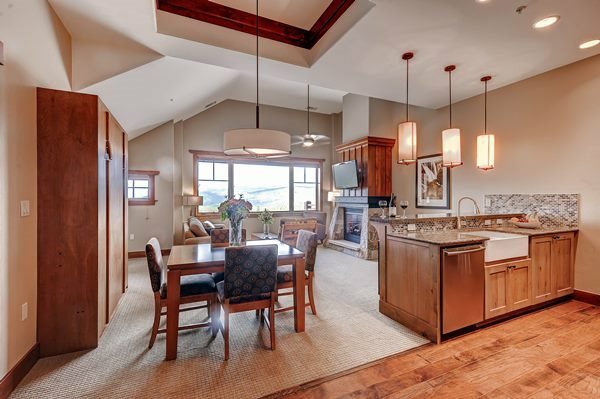 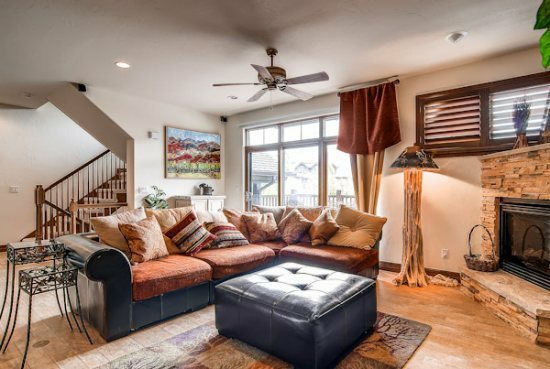 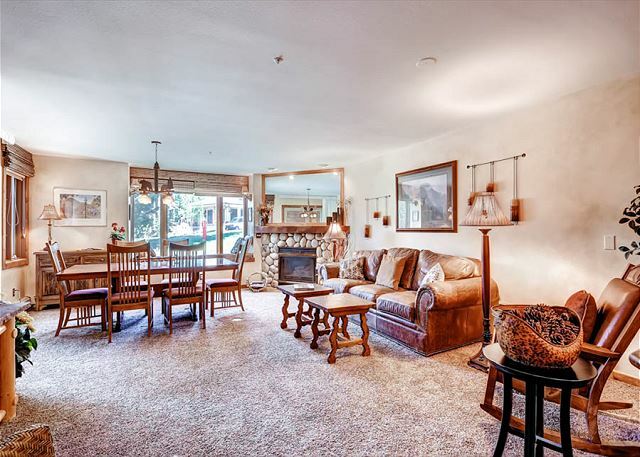 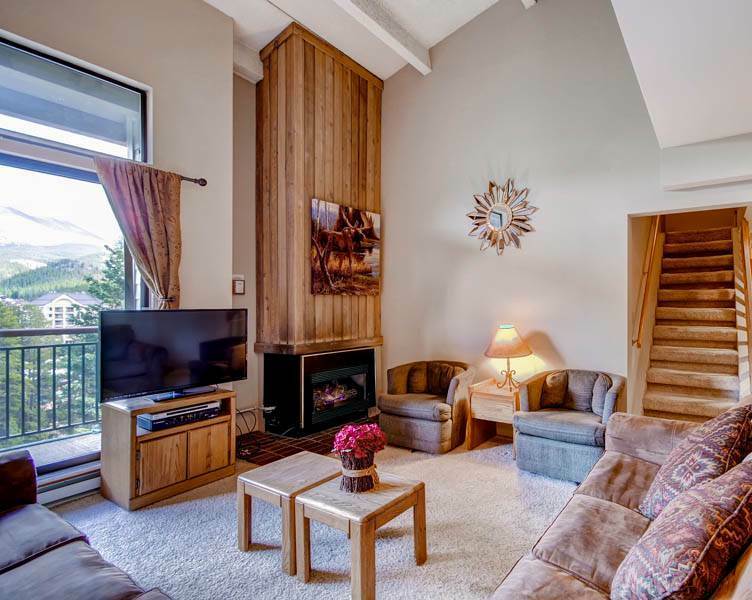 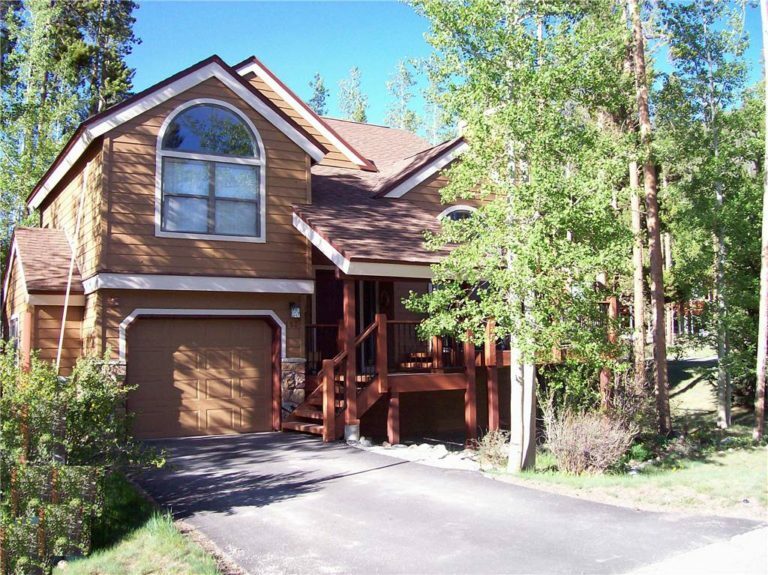 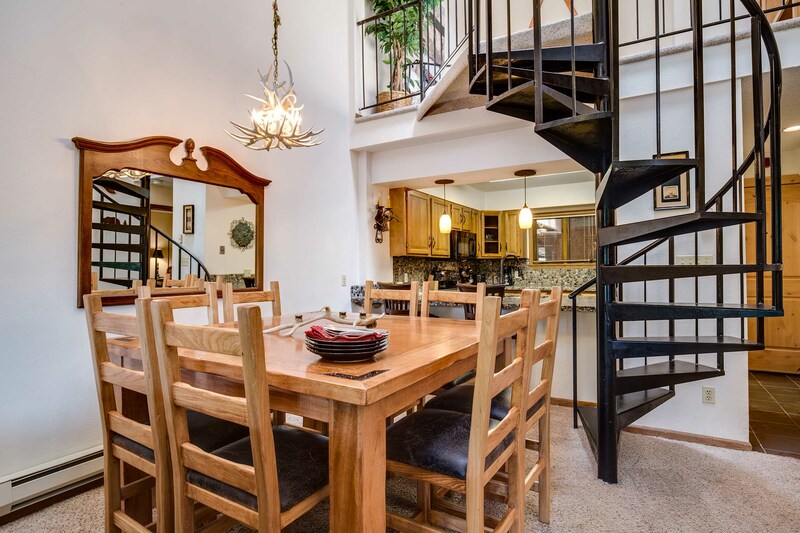 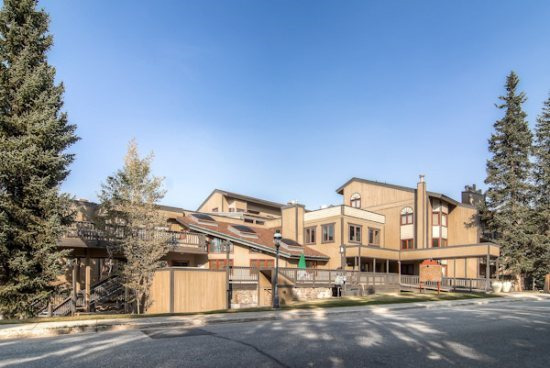 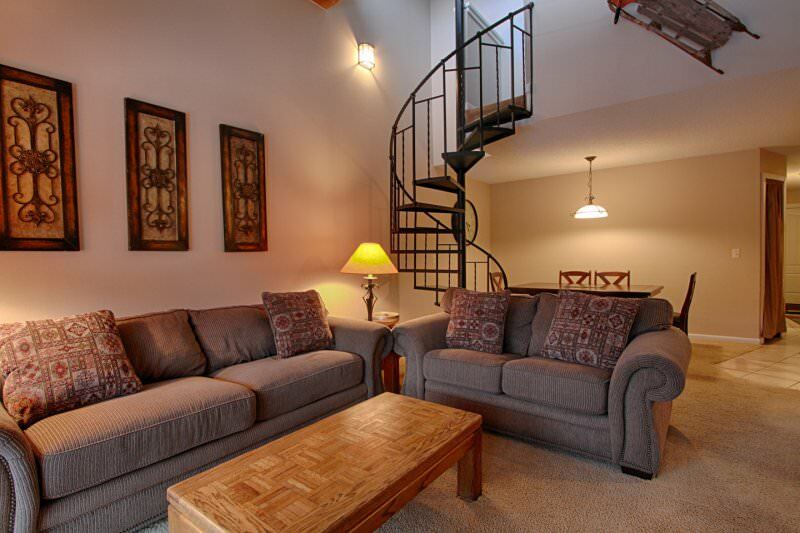 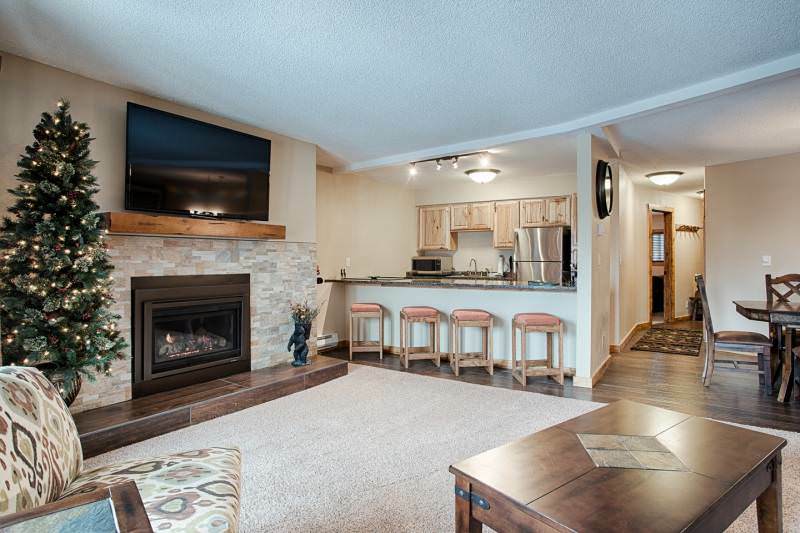 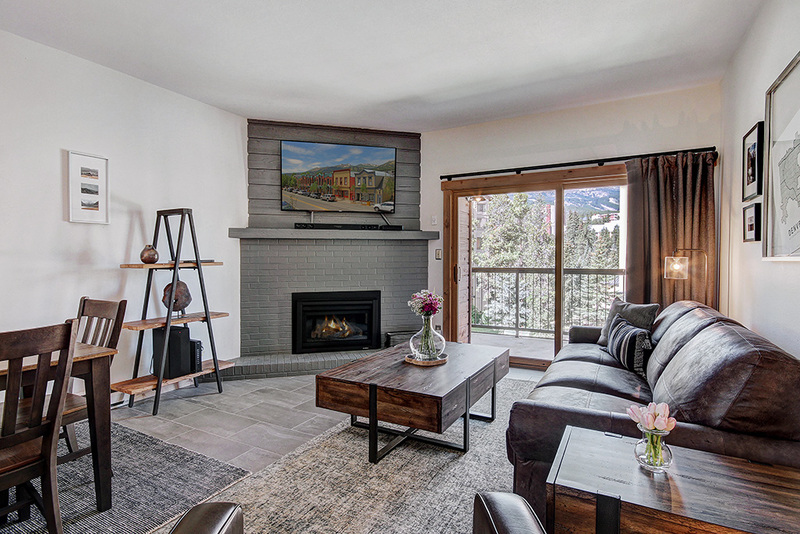 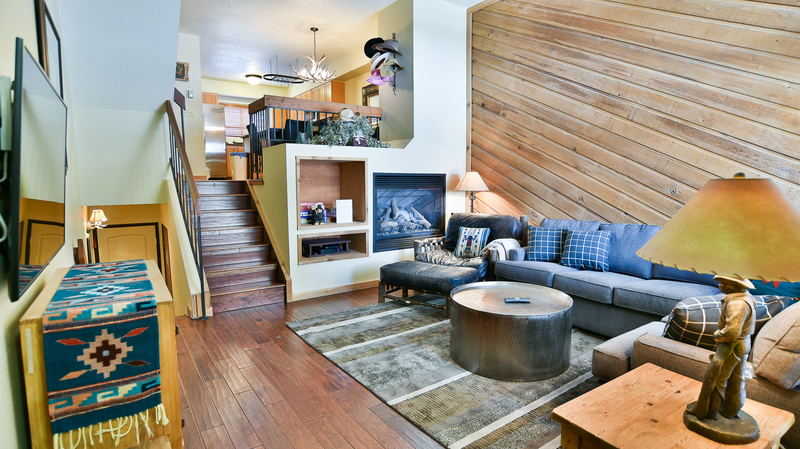 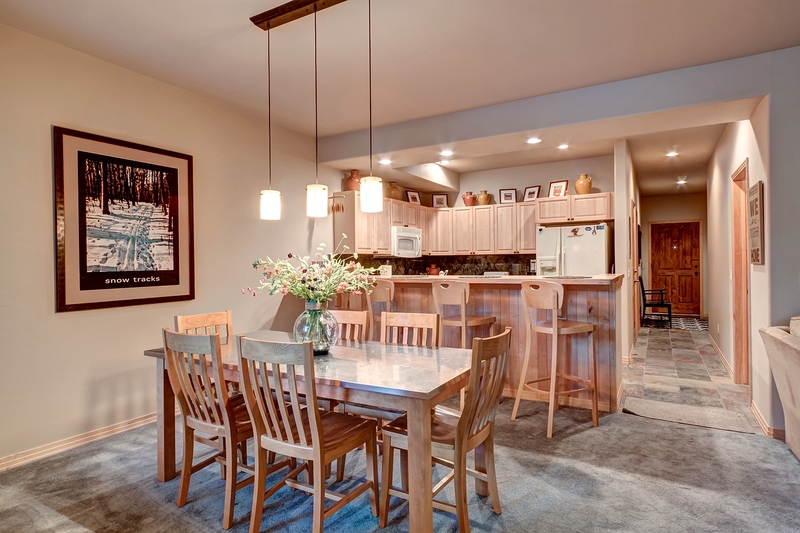 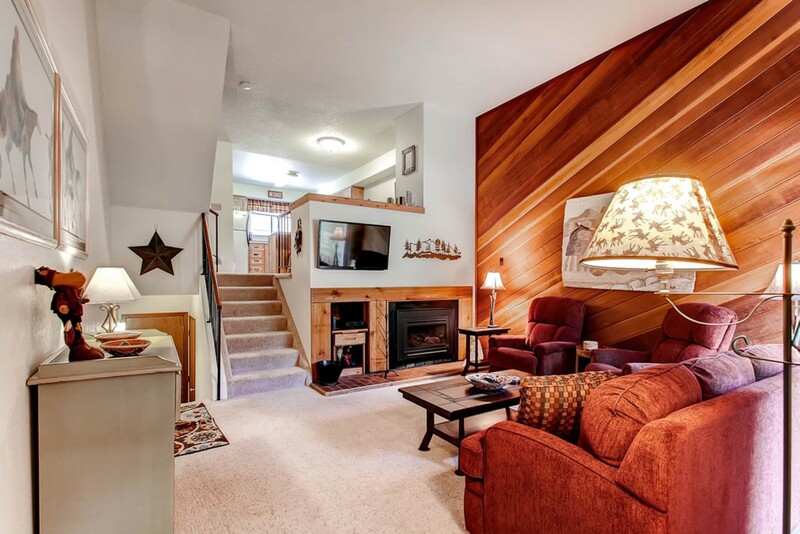 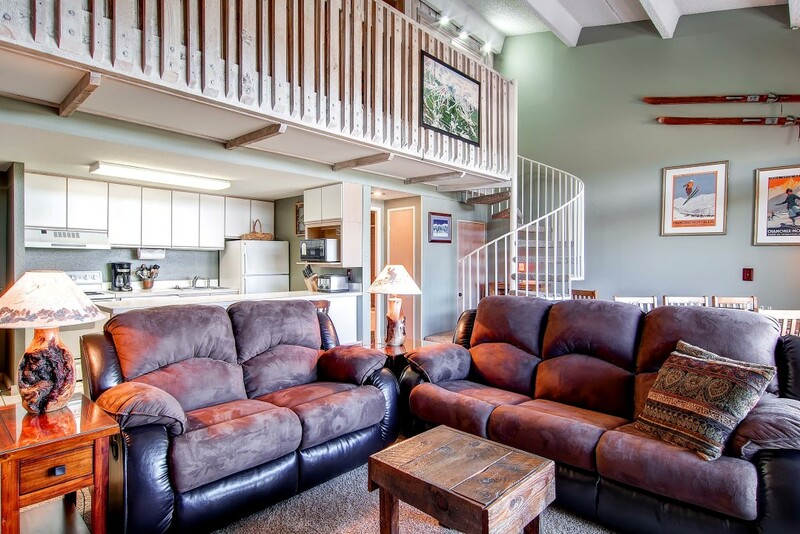 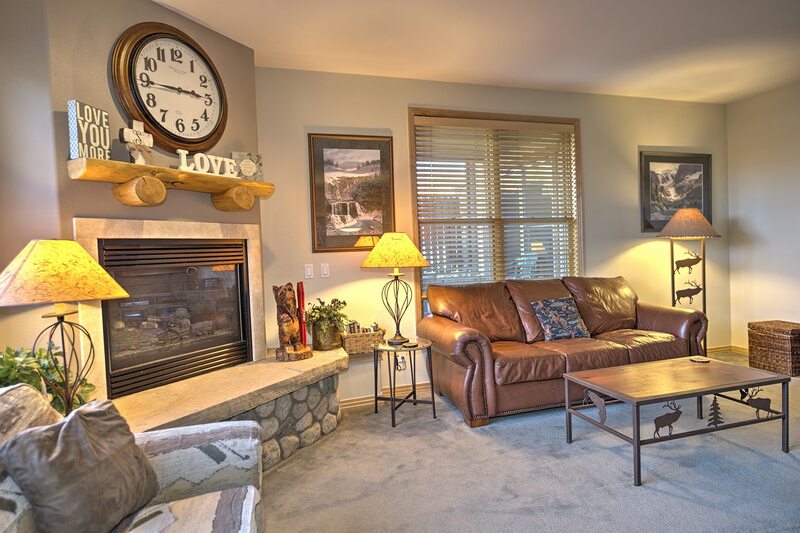 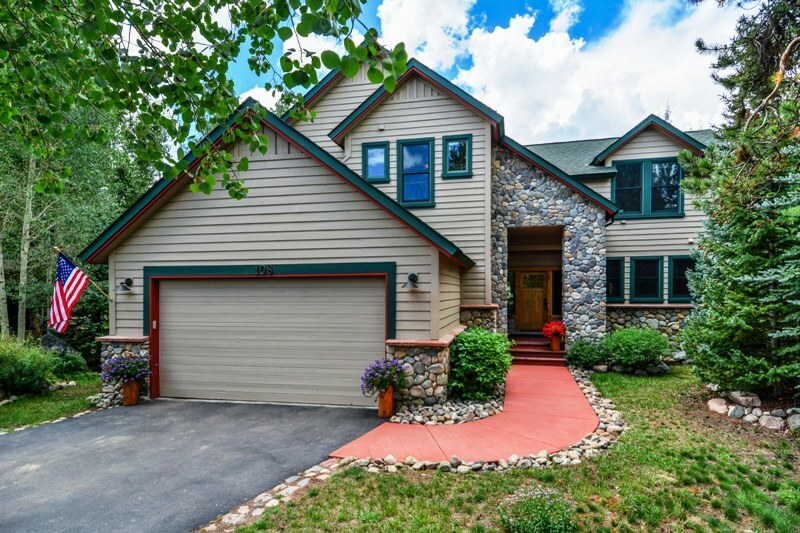 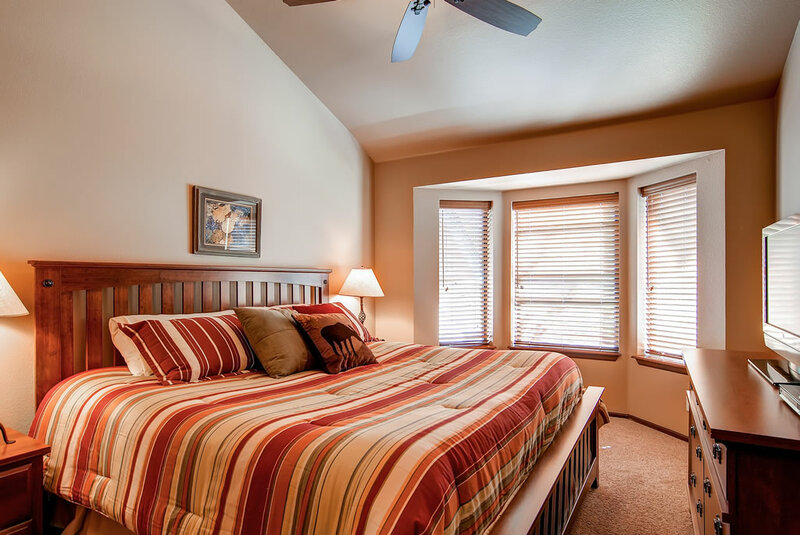 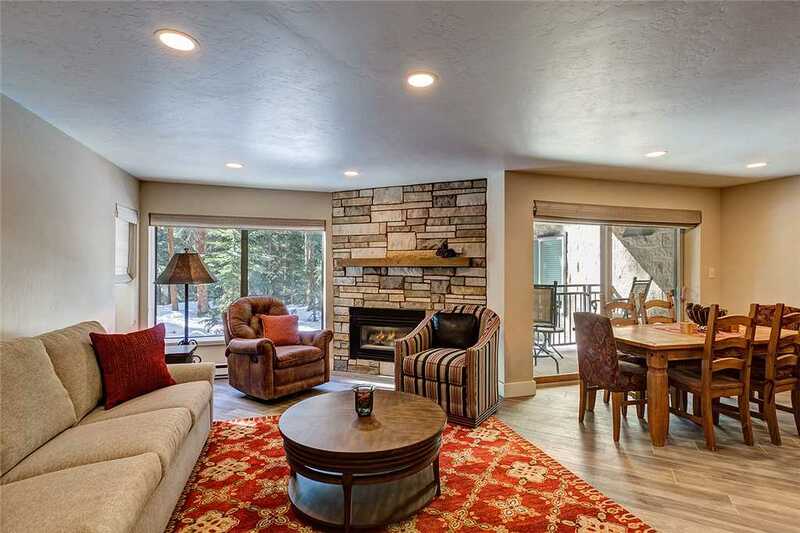 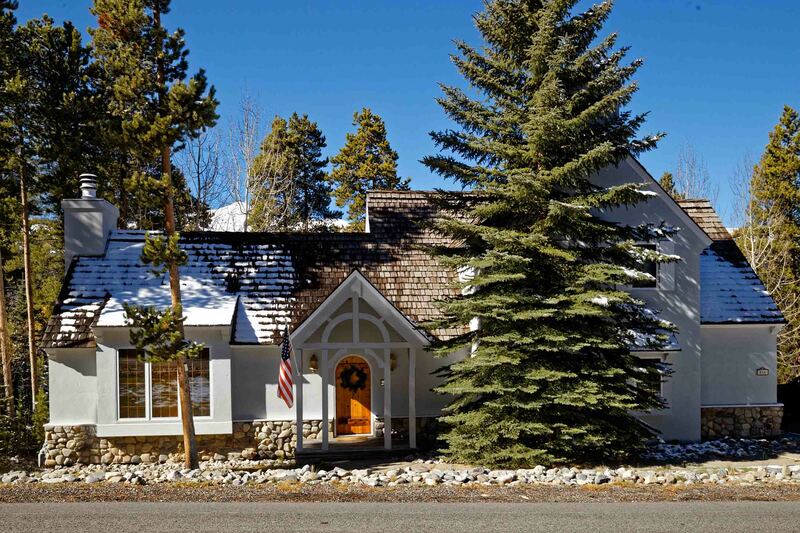 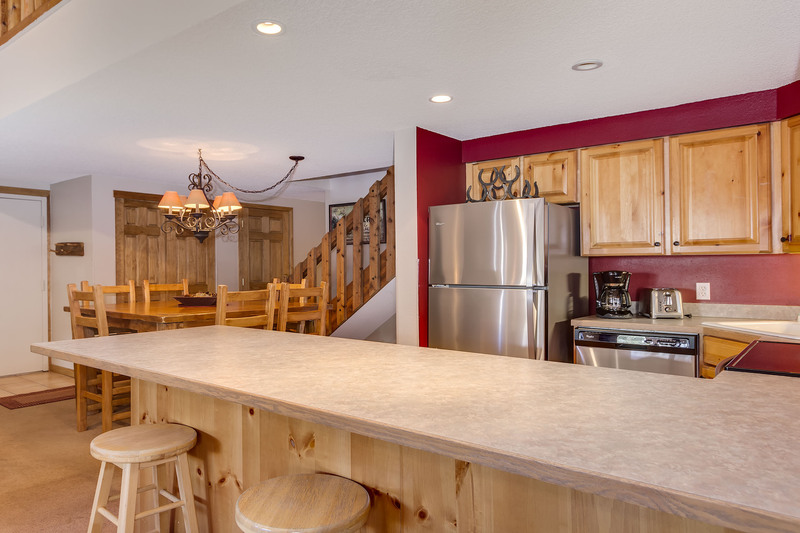 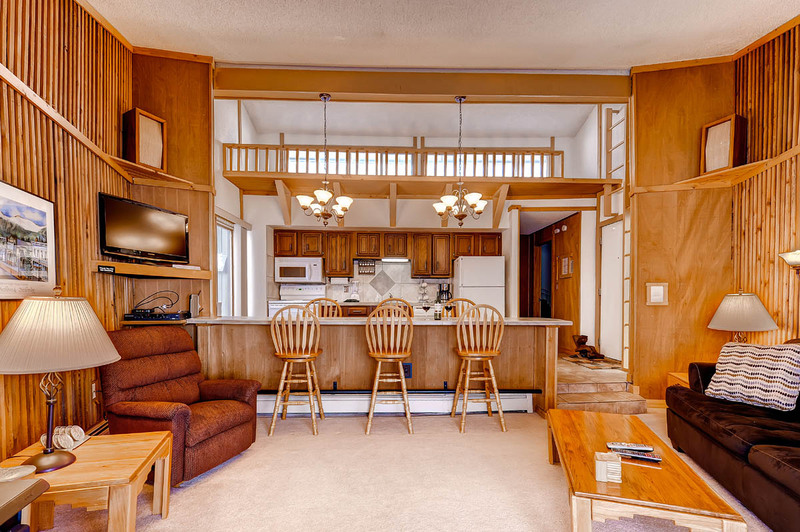 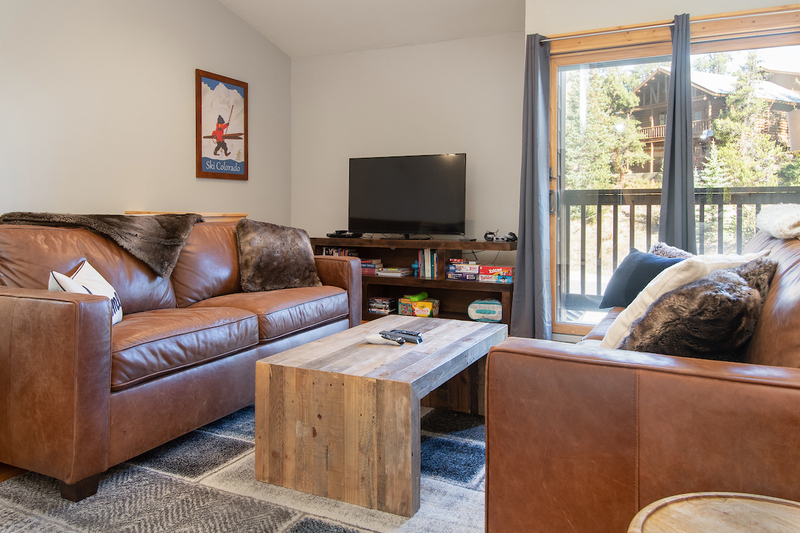 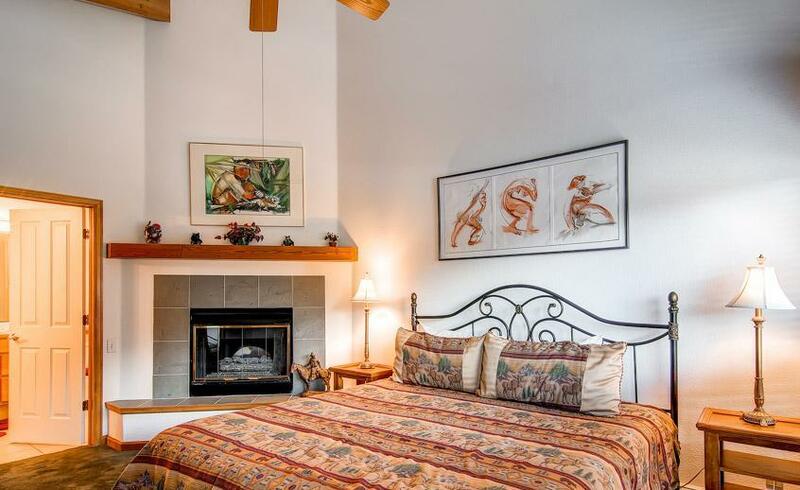 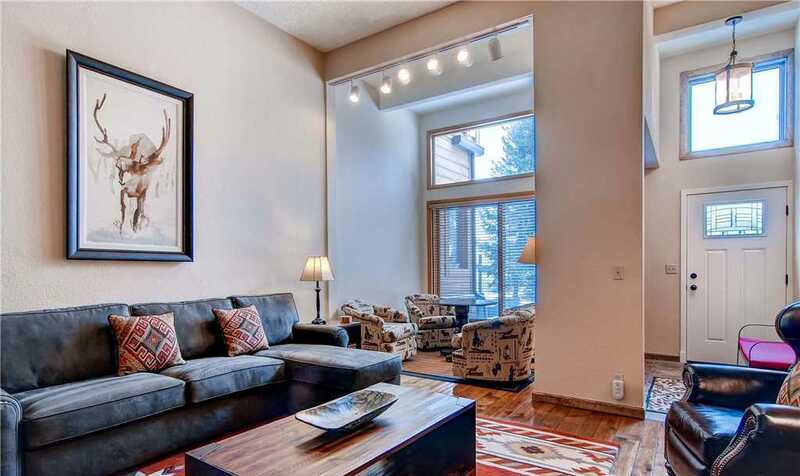 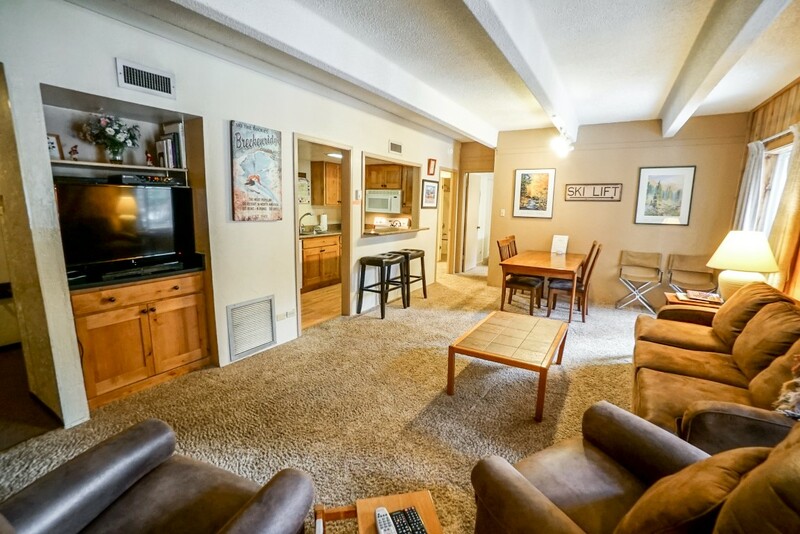 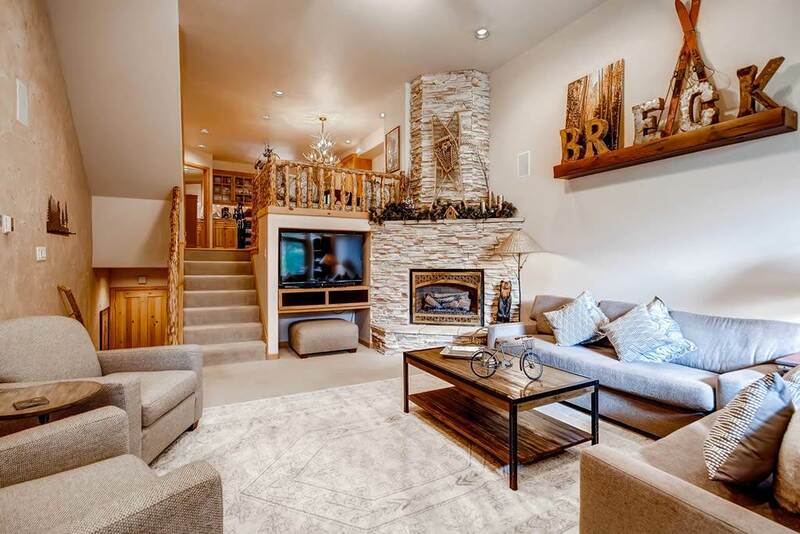 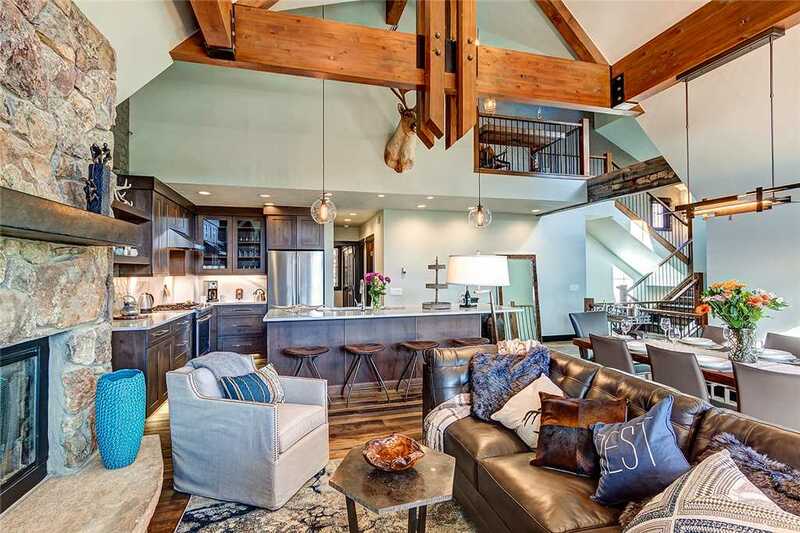 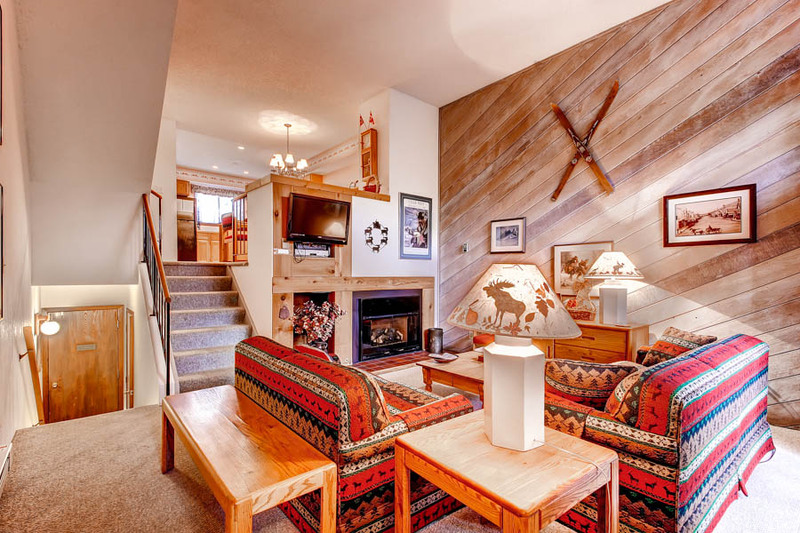 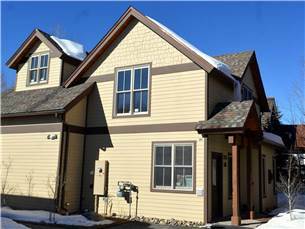 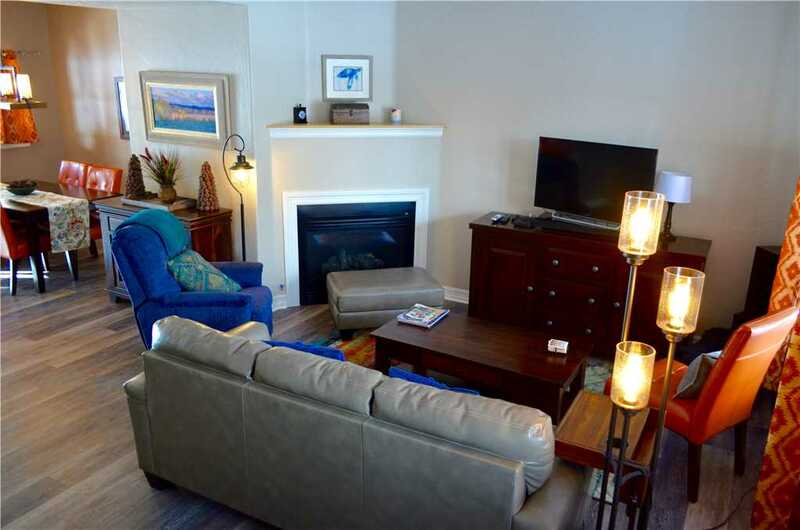 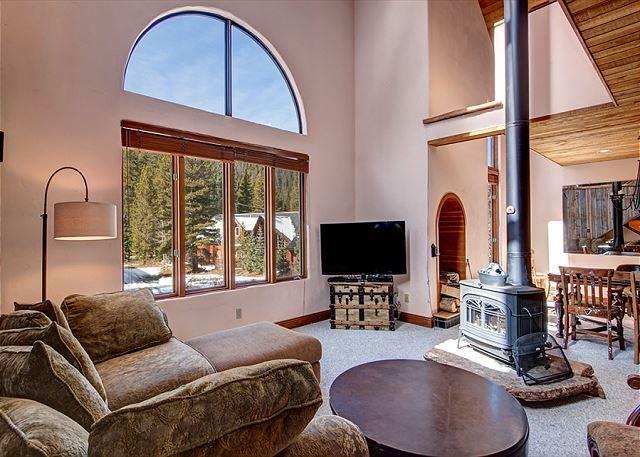 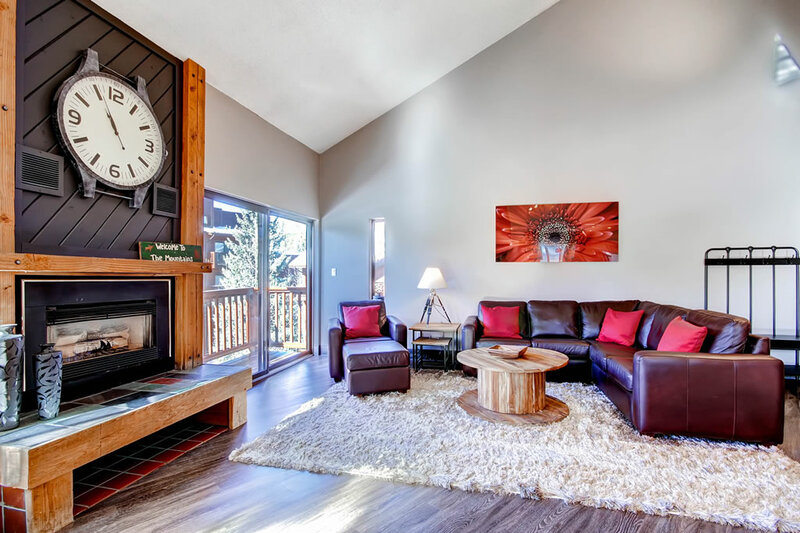 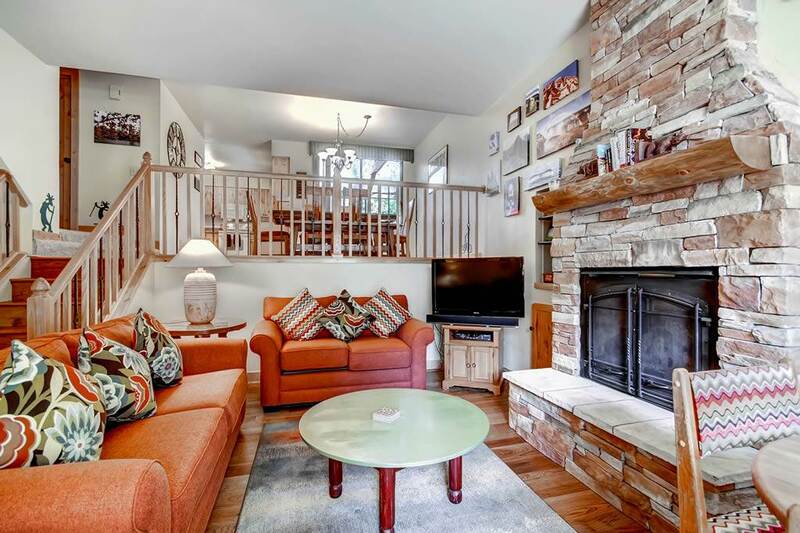 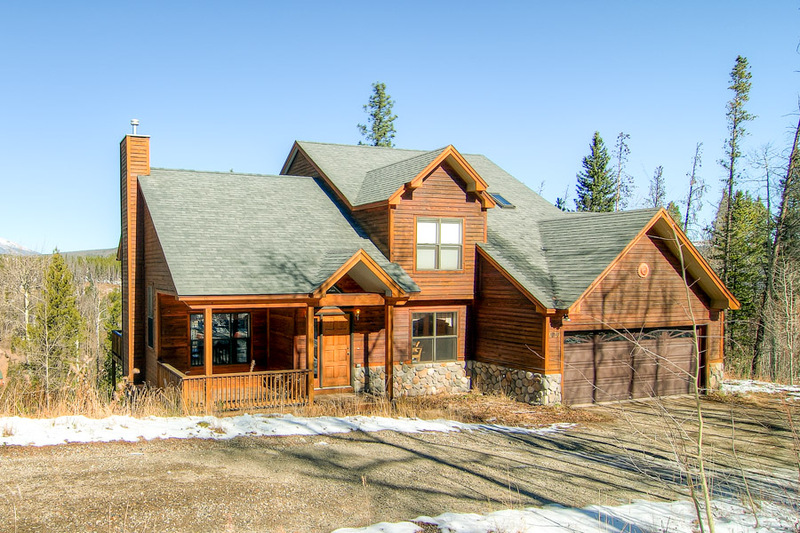 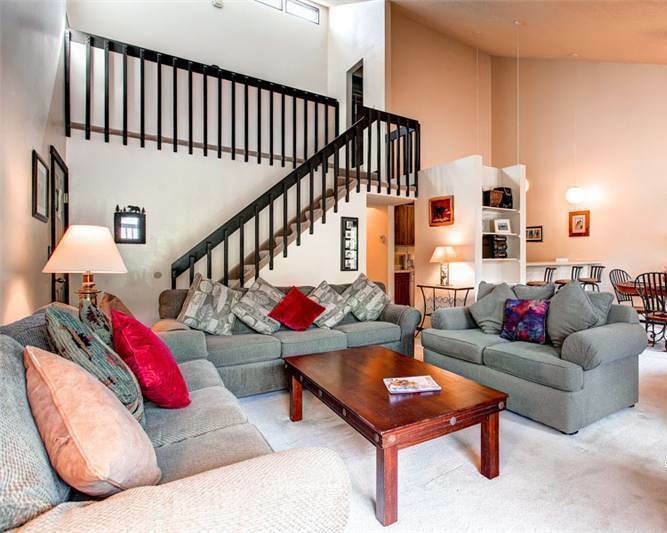 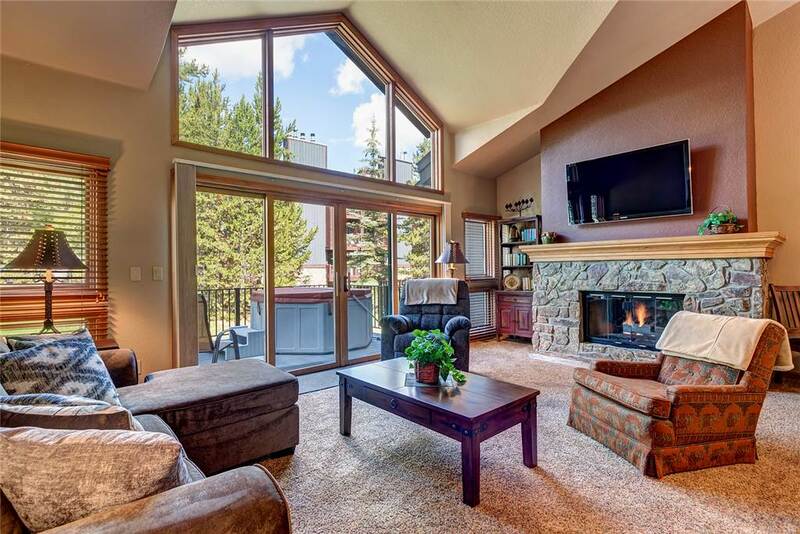 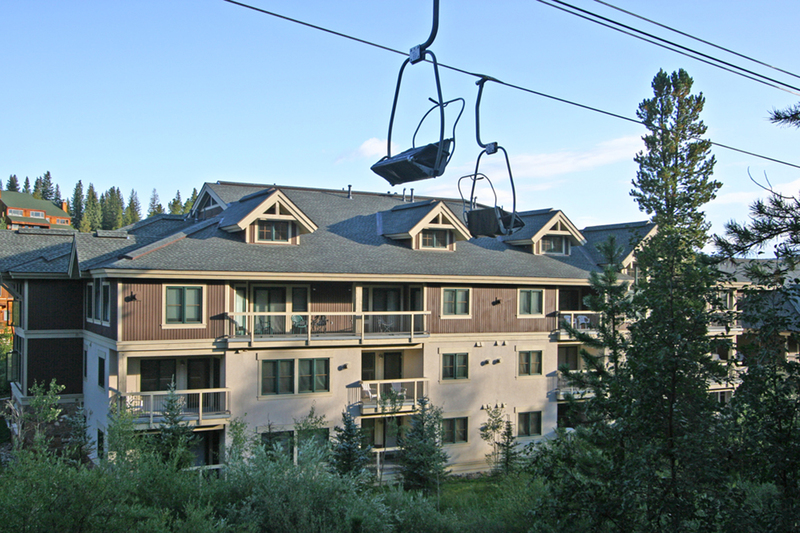 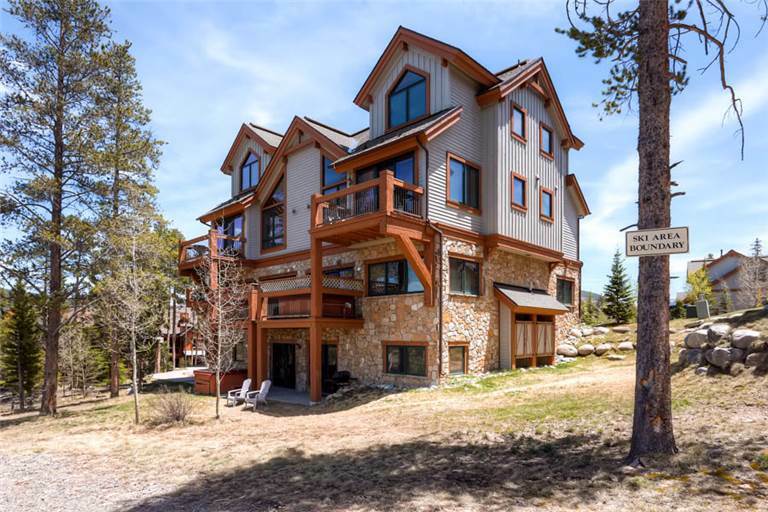 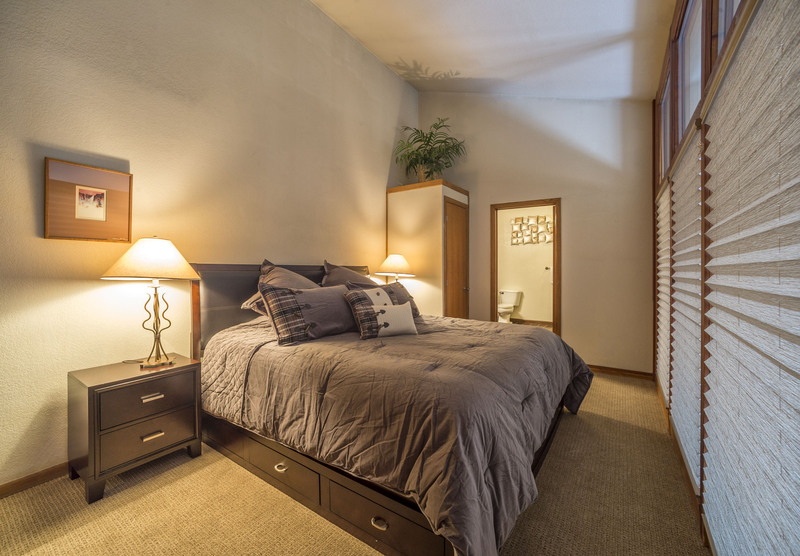 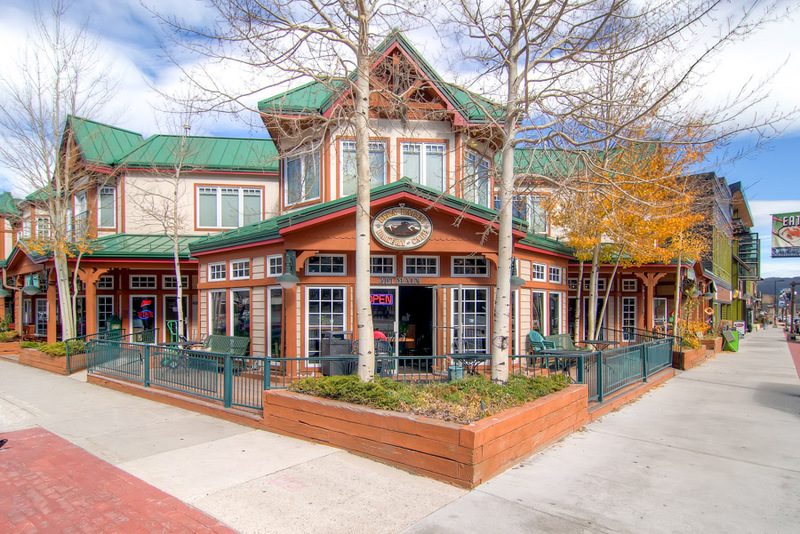 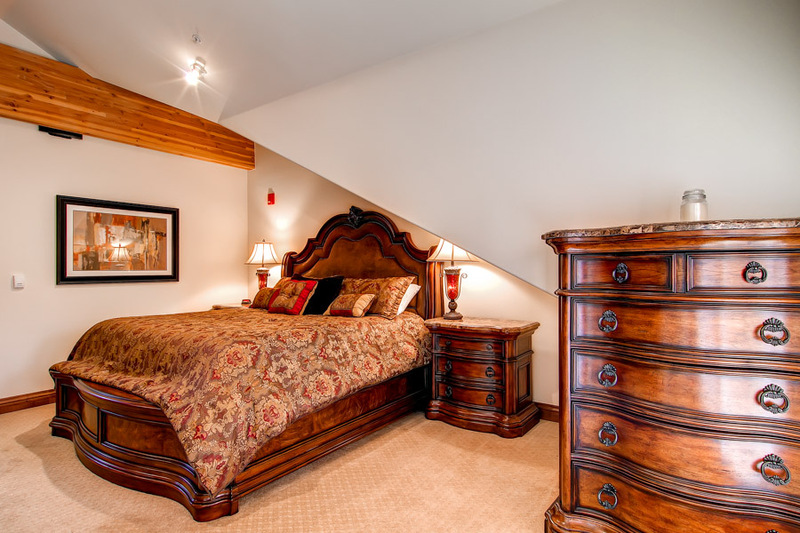 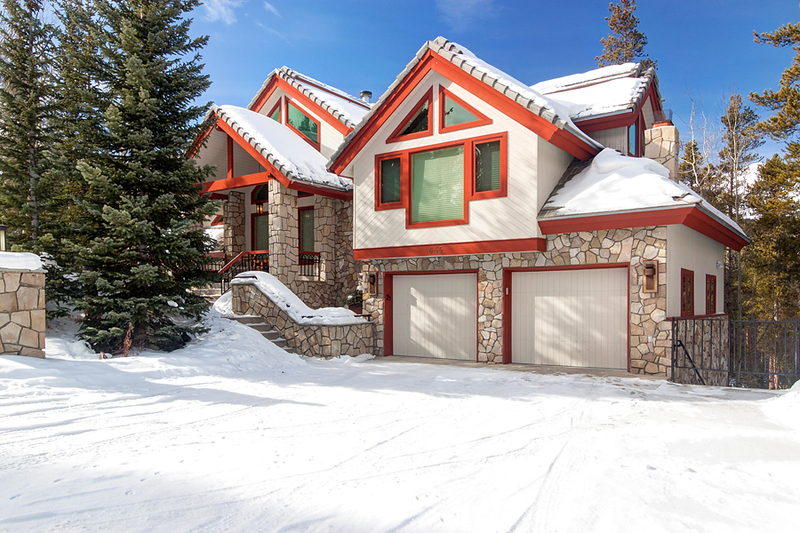 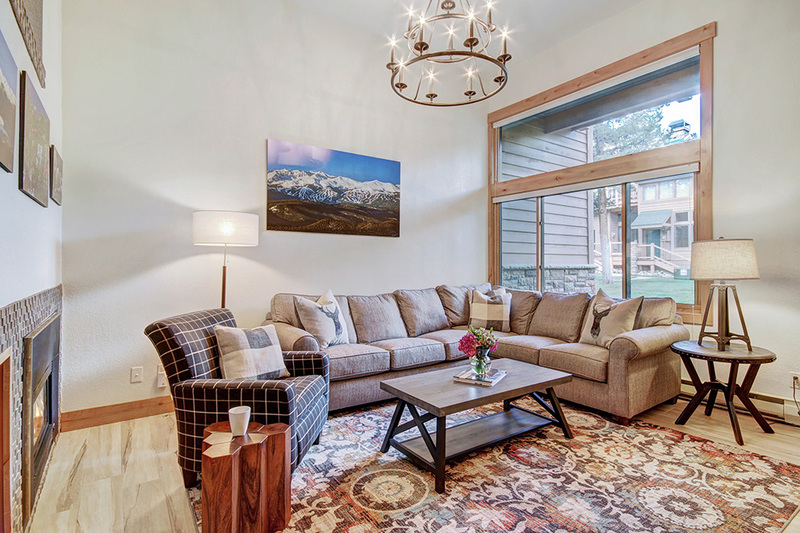 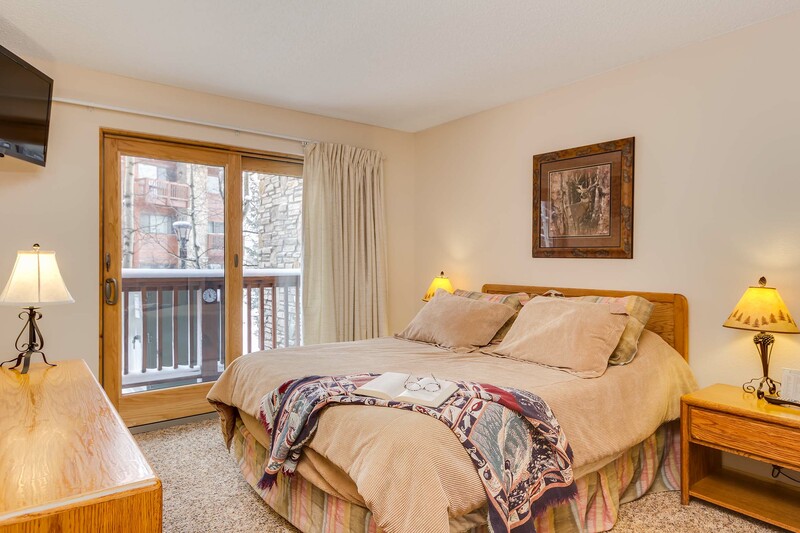 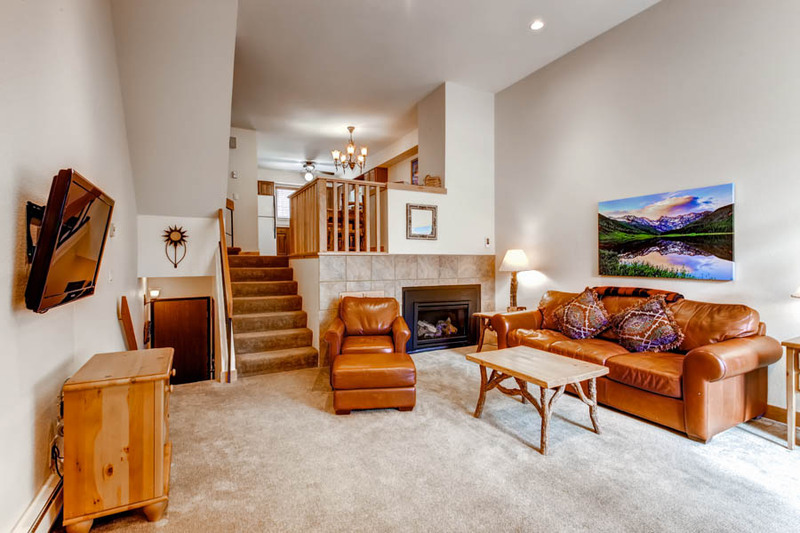 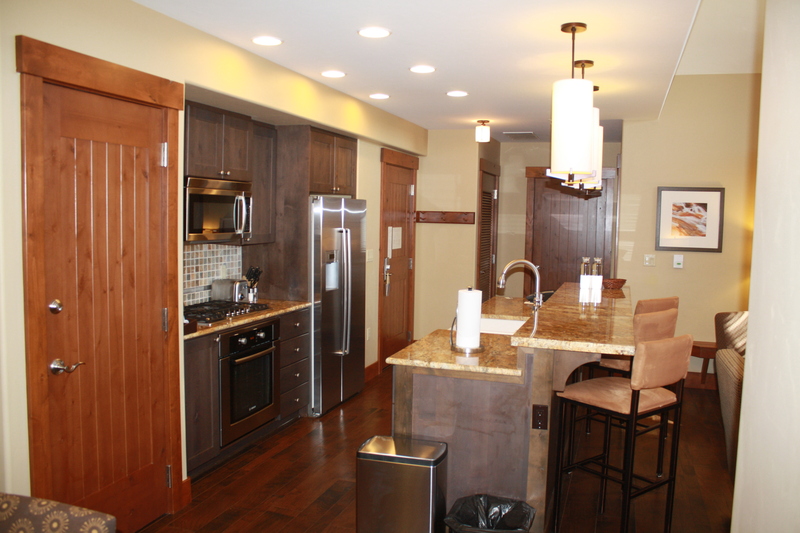 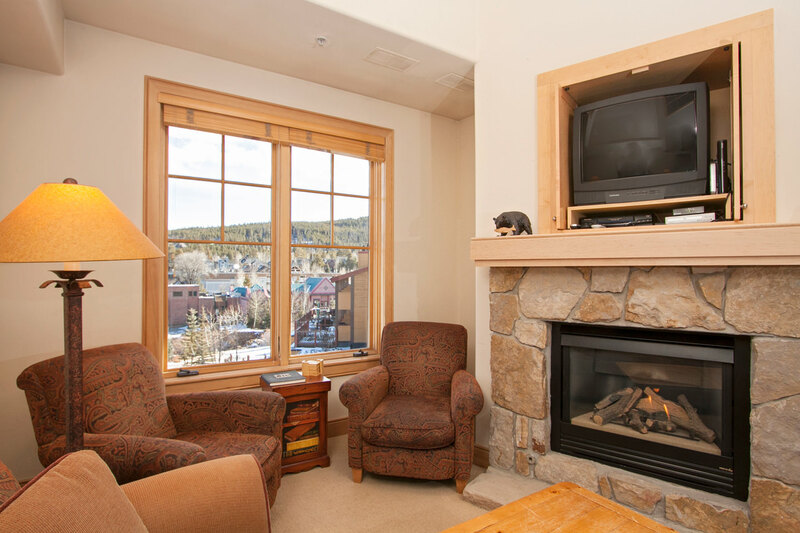 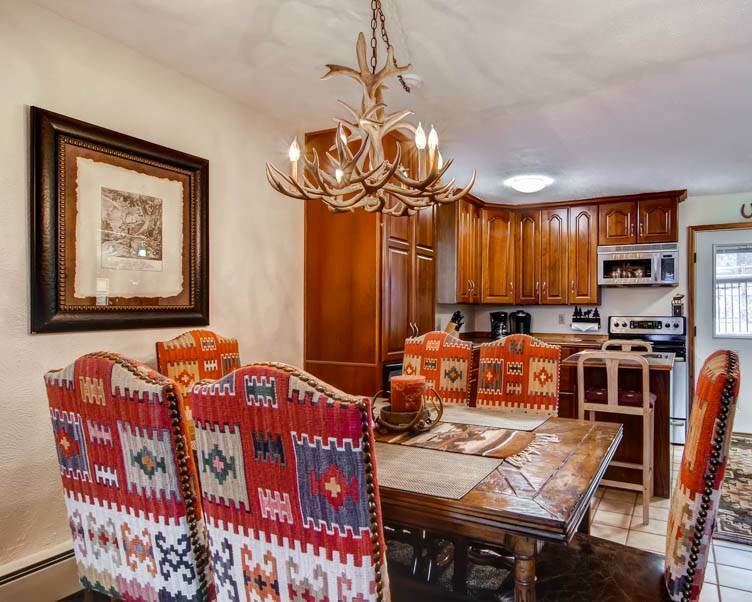 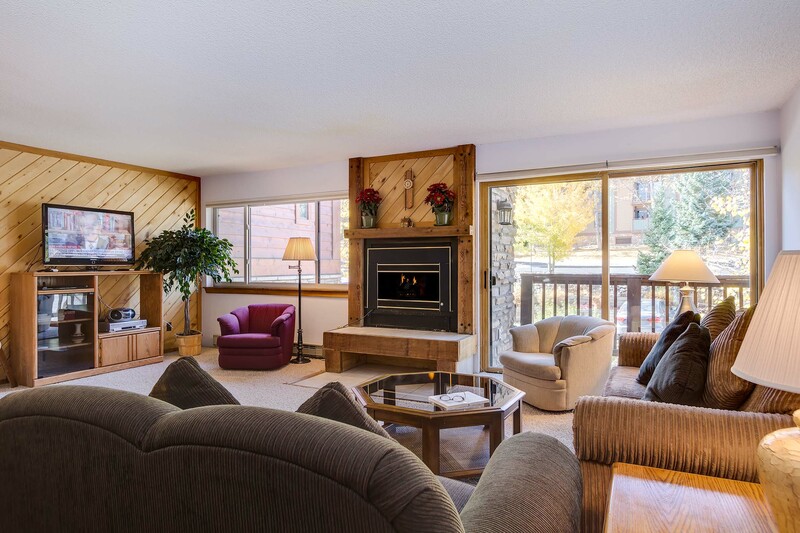 The Atrium Condominiums are located in the Historic District on French Street, only three blocks to Main Street, just a short walk to Downtown and literally steps to the Breckenridge ‘Free Ride’ Shuttle Stop right out front for easy access to town and the slopes. 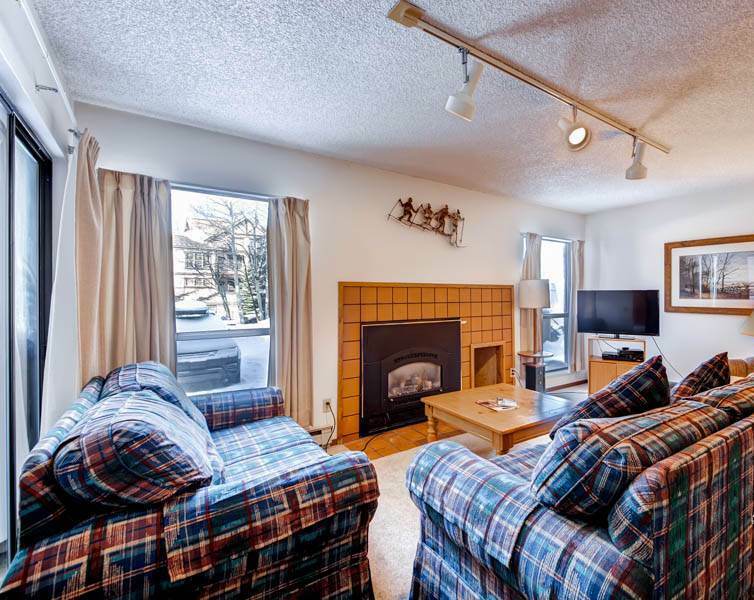 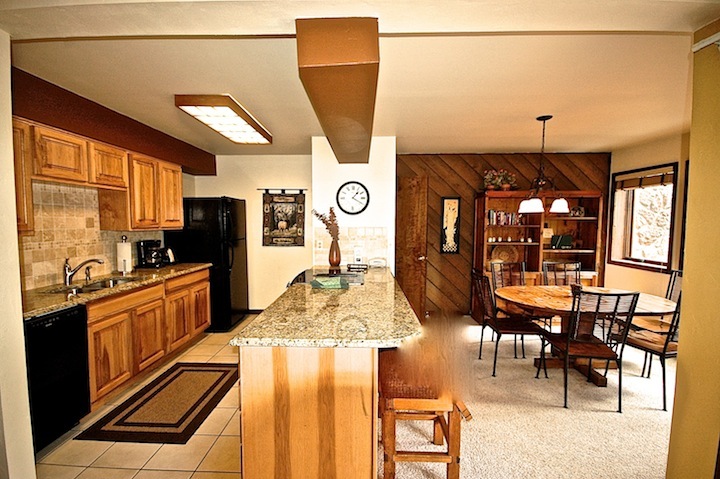 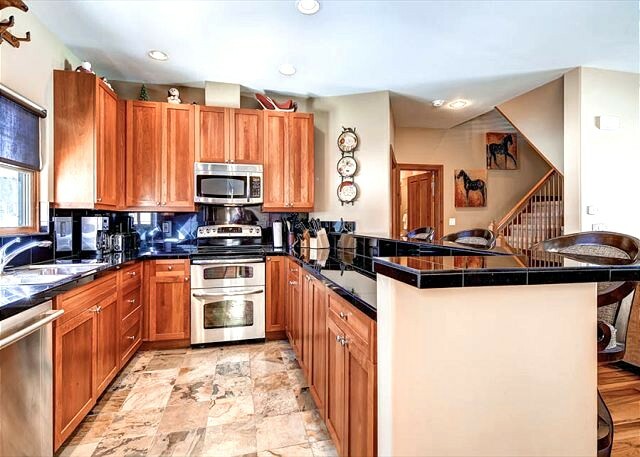 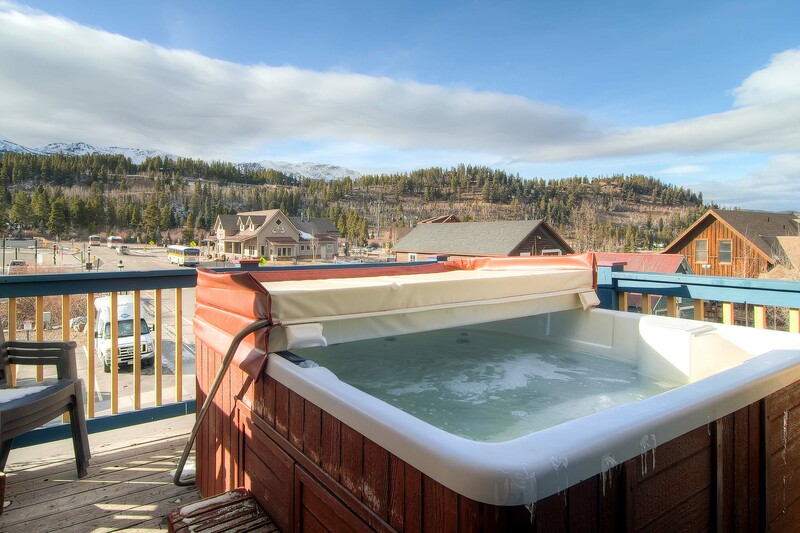 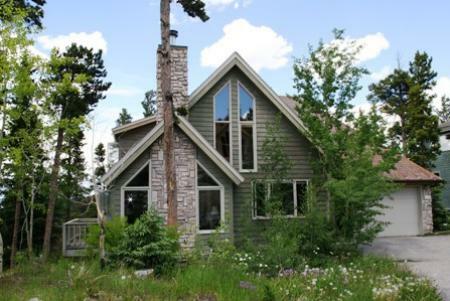 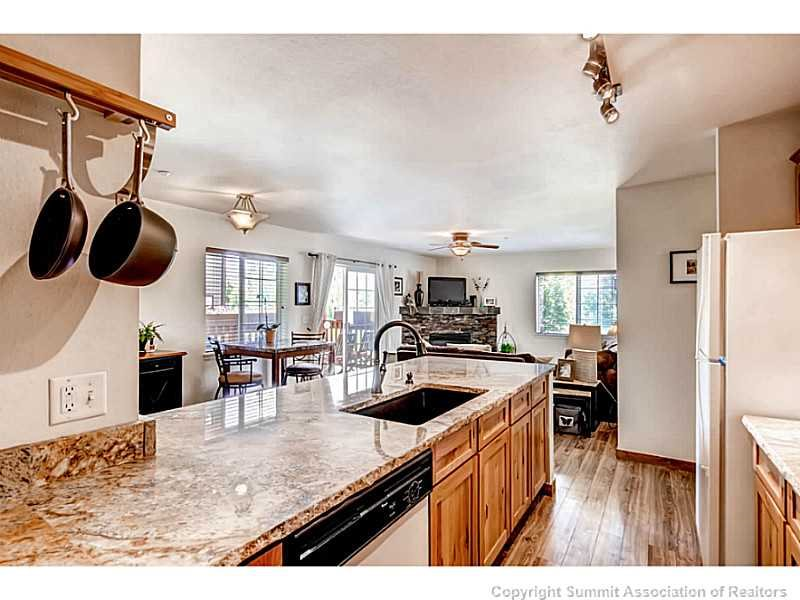 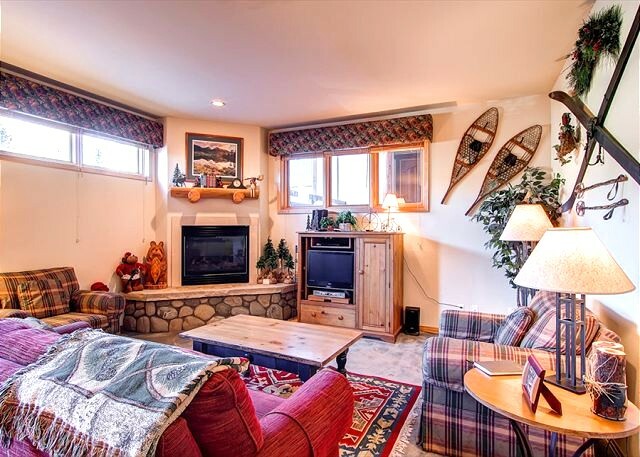 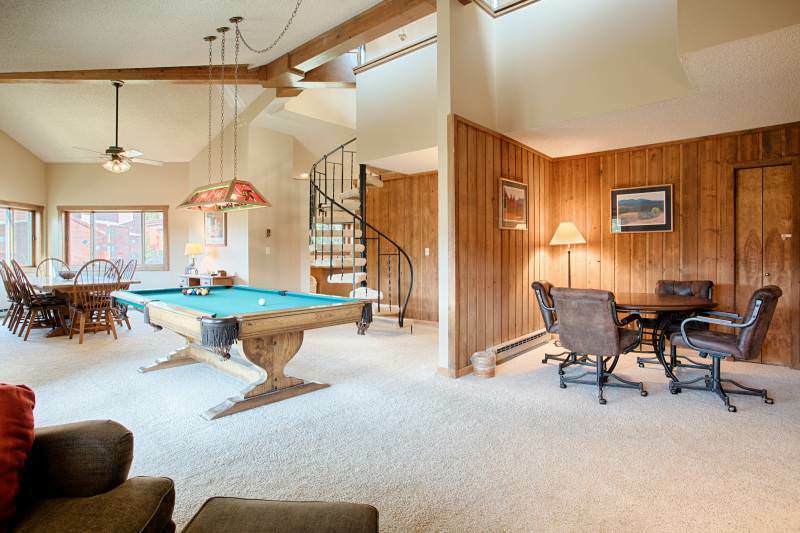 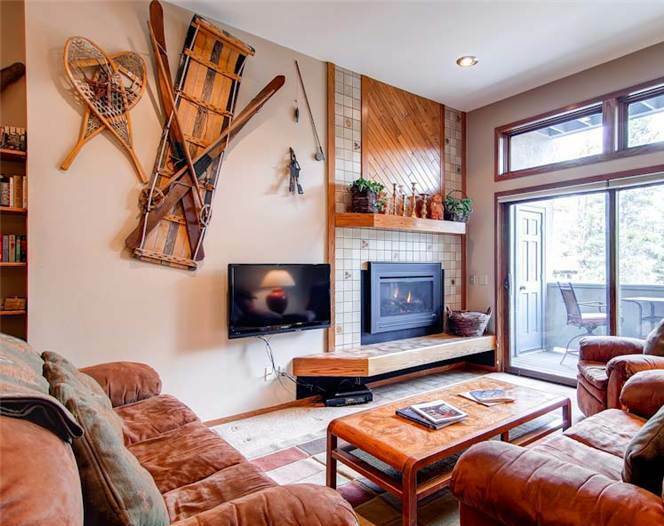 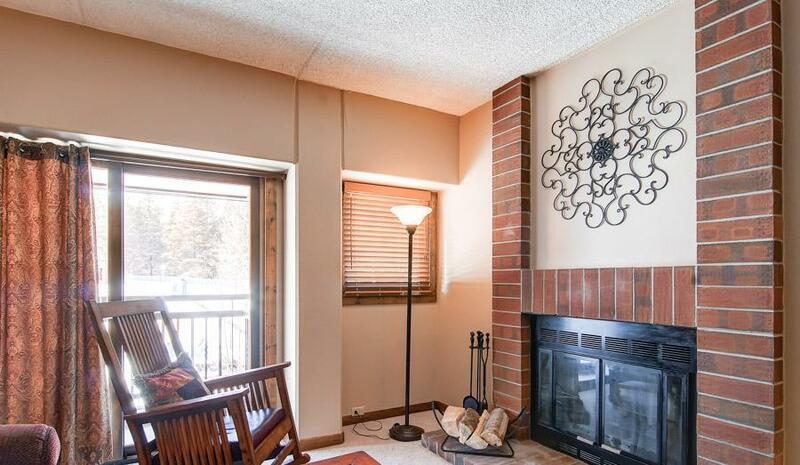 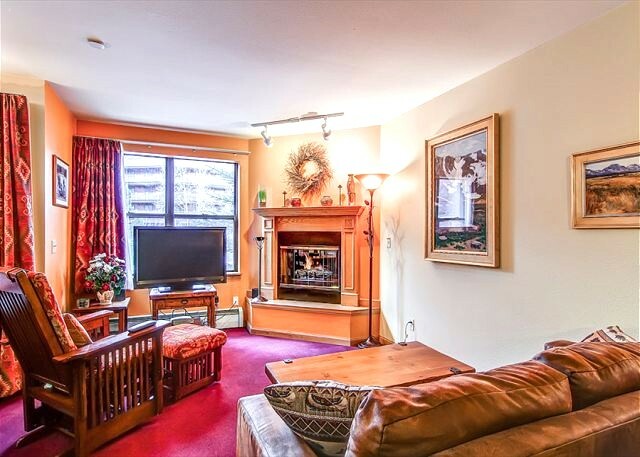 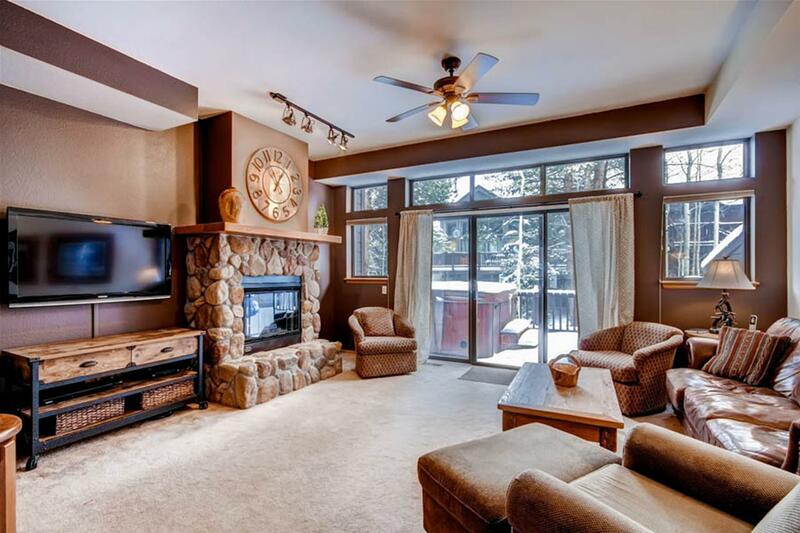 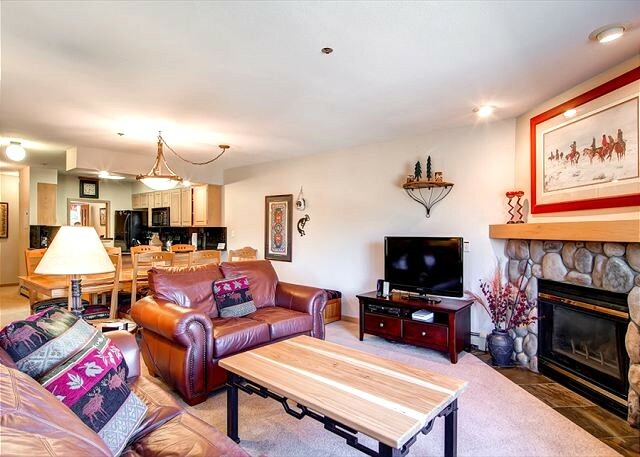 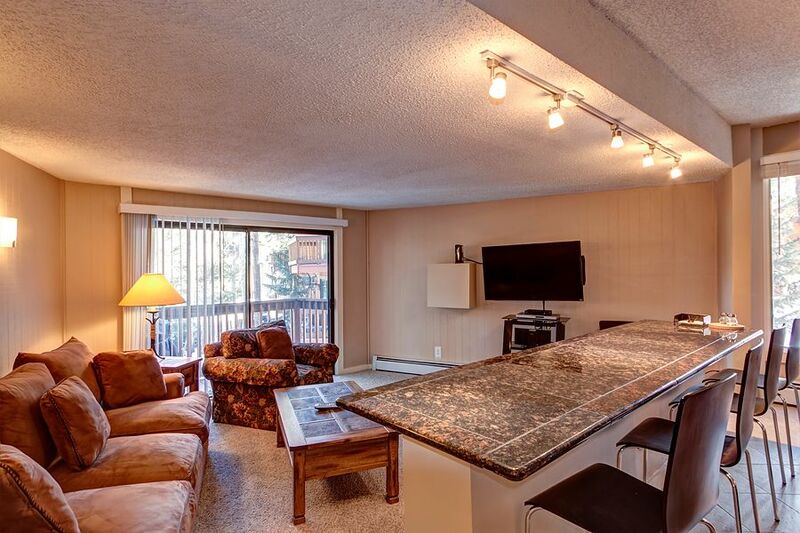 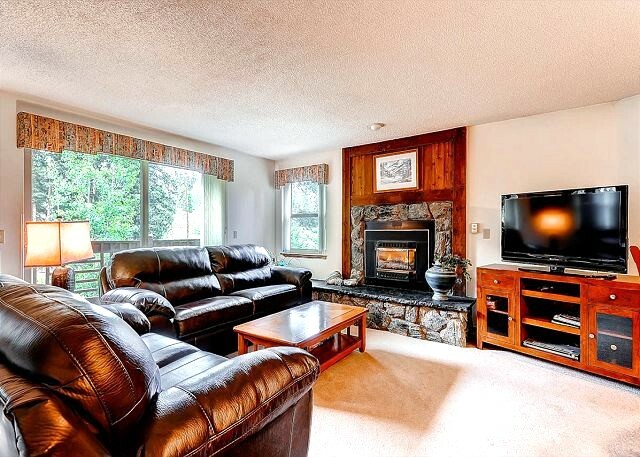 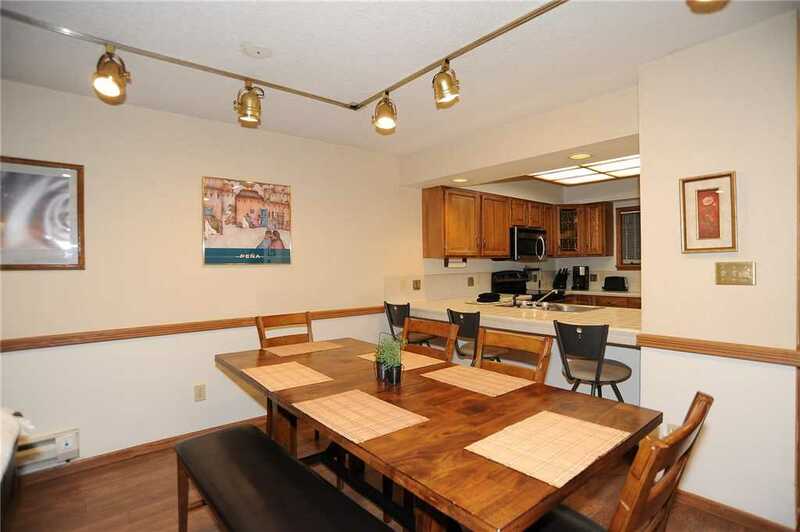 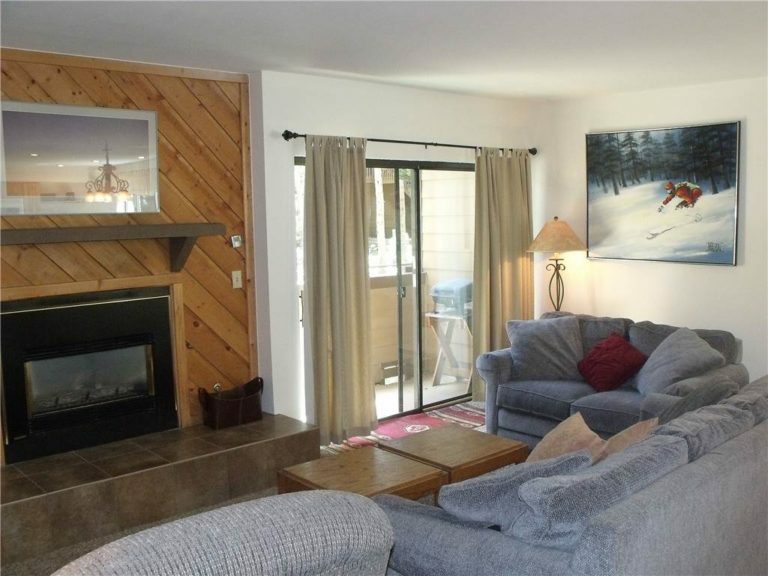 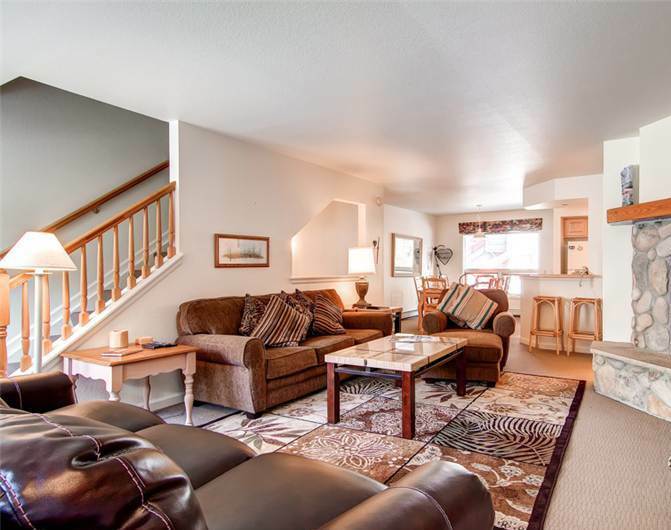 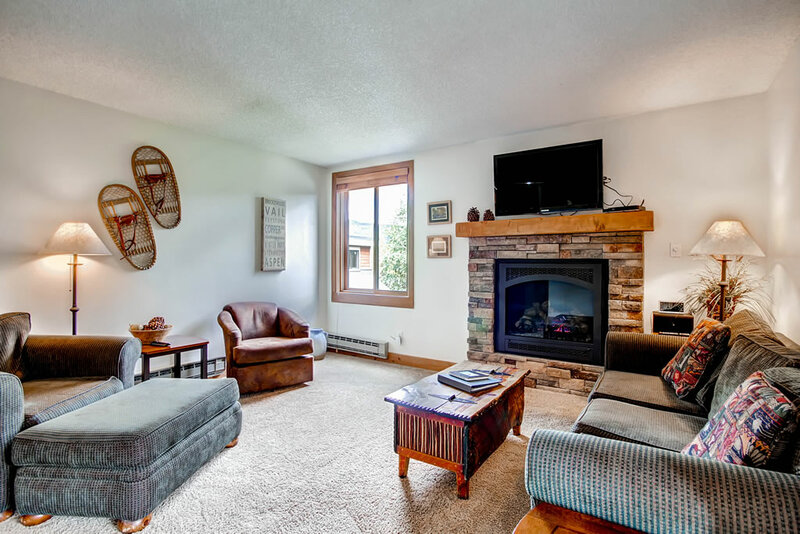 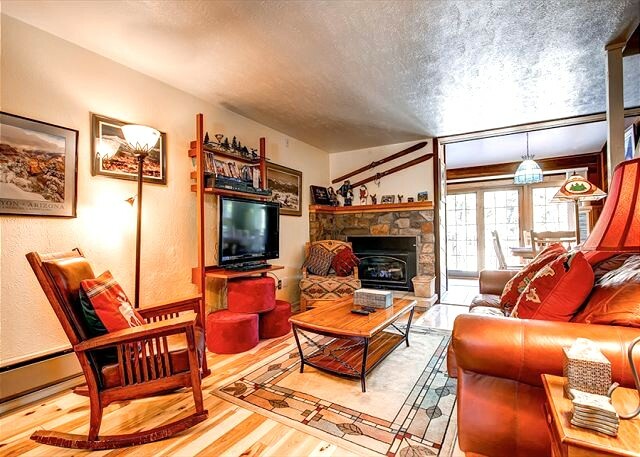 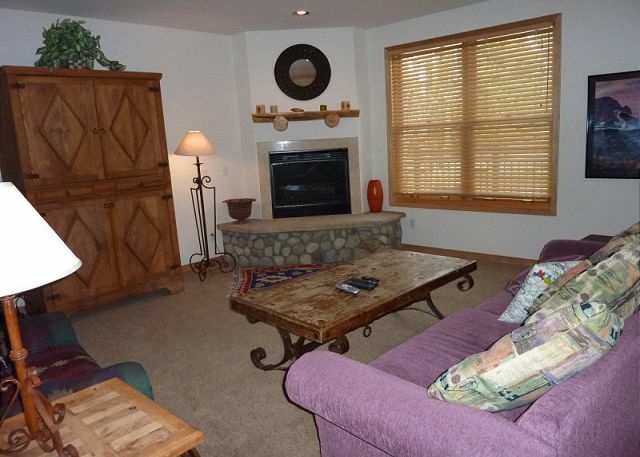 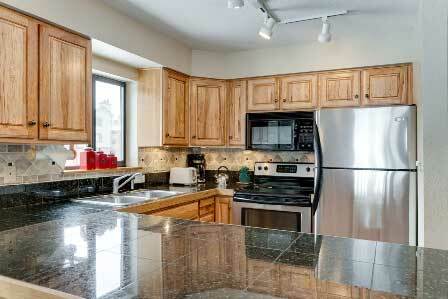 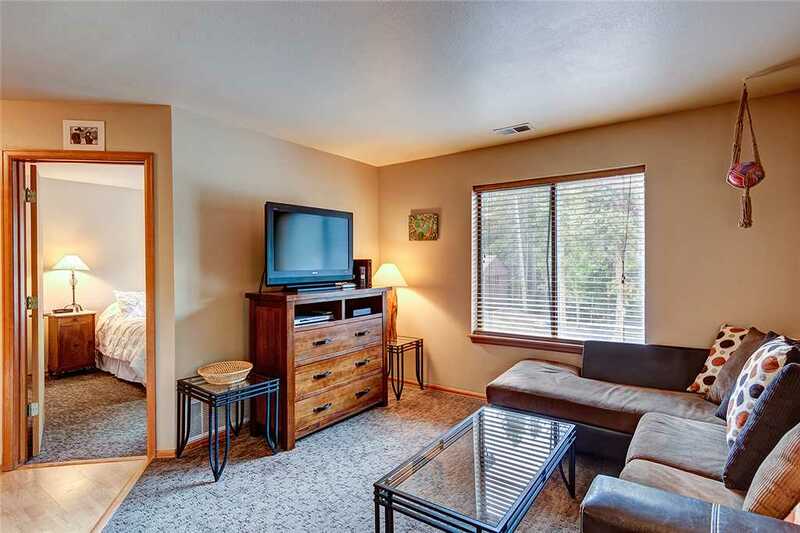 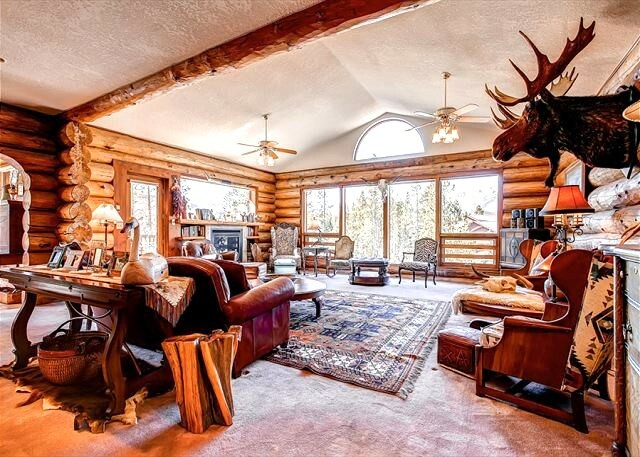 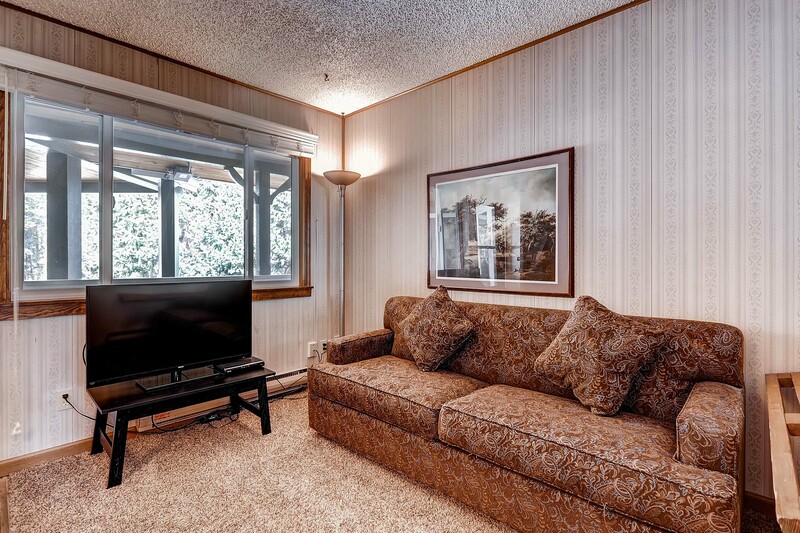 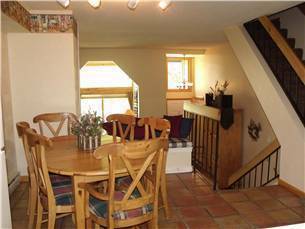 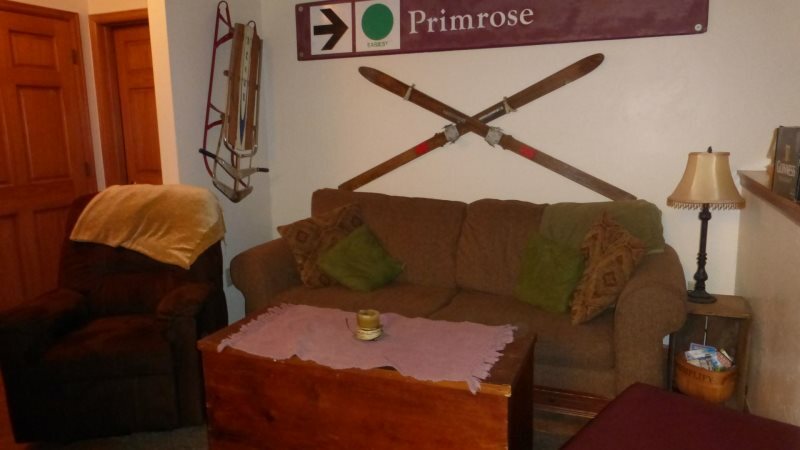 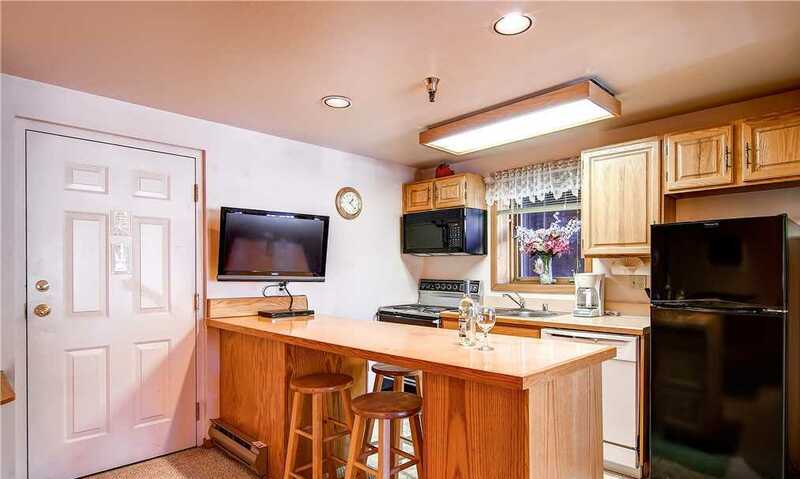 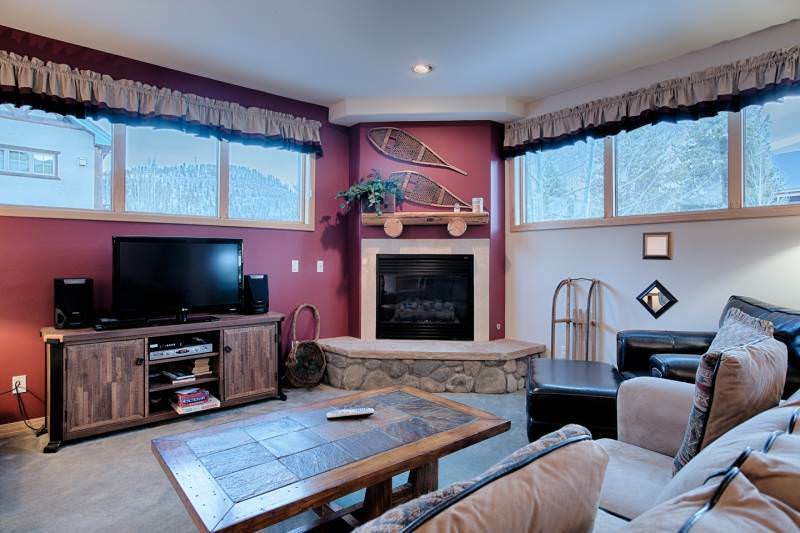 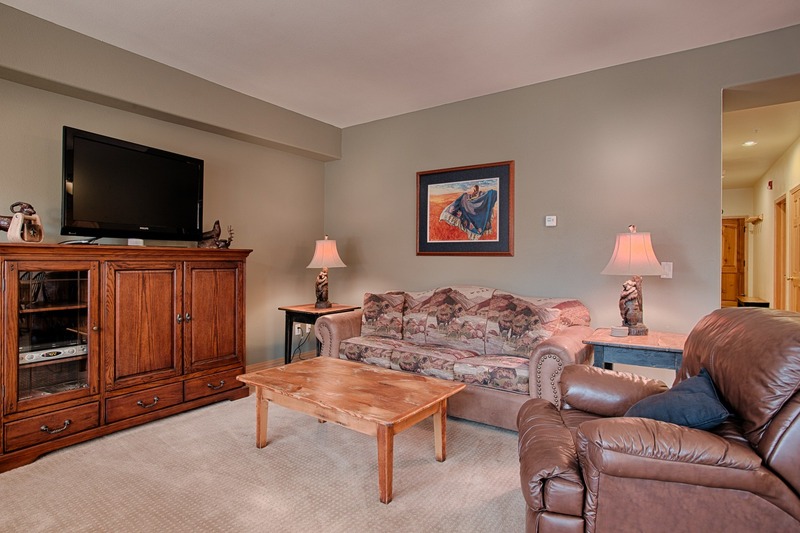 This ground floor property also offers convenient access to the hot tub for relaxing apr?s ski. 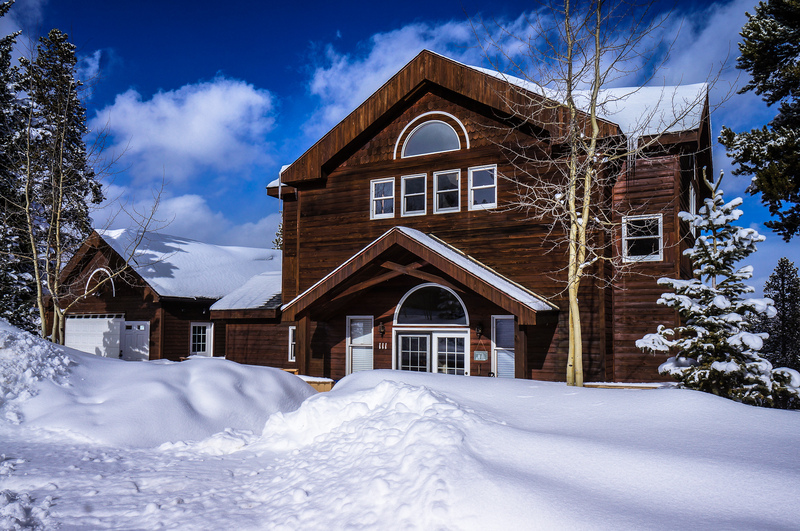 Carter Park is just around the corner and offers a wonderful free sledding hill in the winter and tennis courts and volleyball courts in the summer. 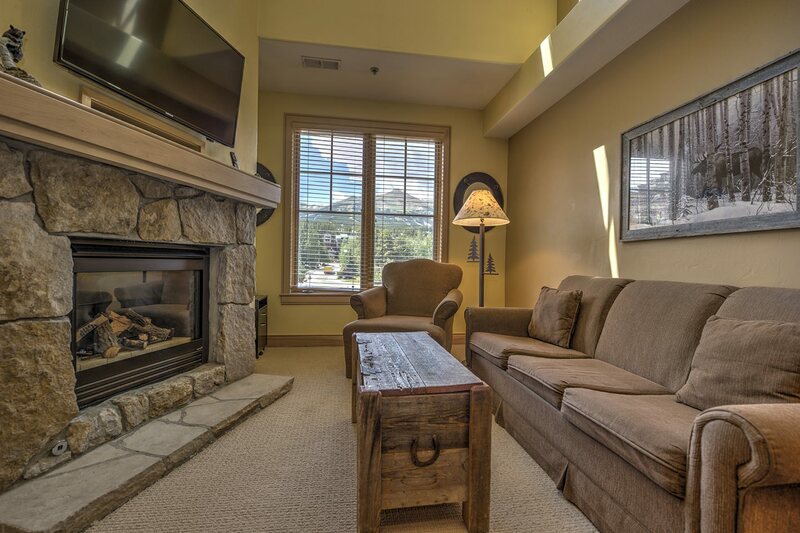 On-site Atrium amenities include an incredibly open and spacious indoor lounge area for reading or playing cards, outdoor hot tub and patio area, community grills, a heated underground parking garage, ski storage and laundry facilities.